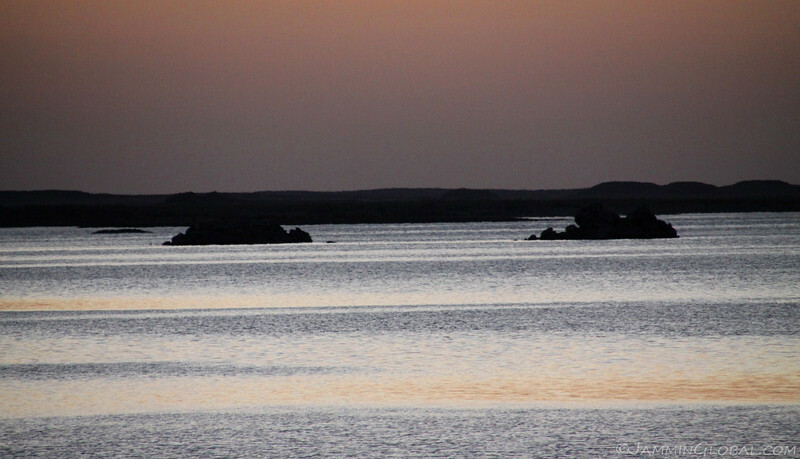 After a solid month in Egypt, my time here was coming to an end as I journeyed the last leg southwards to Aswan. 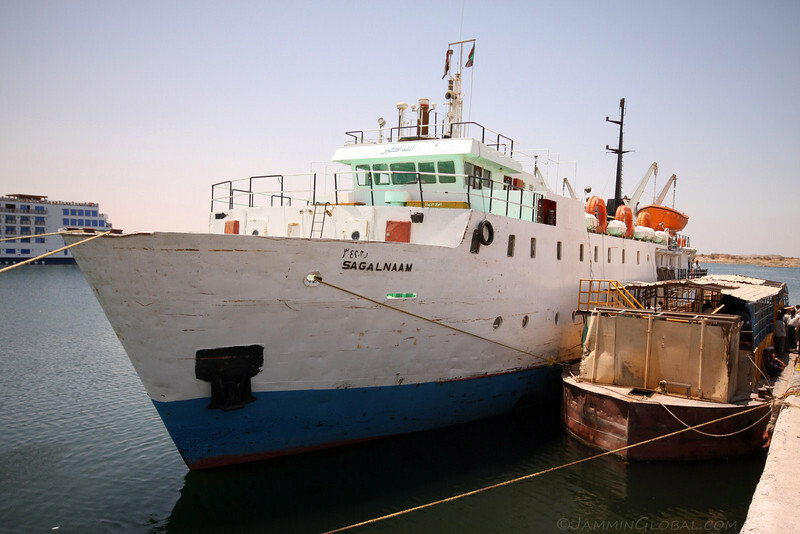 Filled with Egyptian cultural visits, I was now focused on a tricky bit of traveling, namely the ferry ride from Aswan to Wadi Halfa in Sudan. 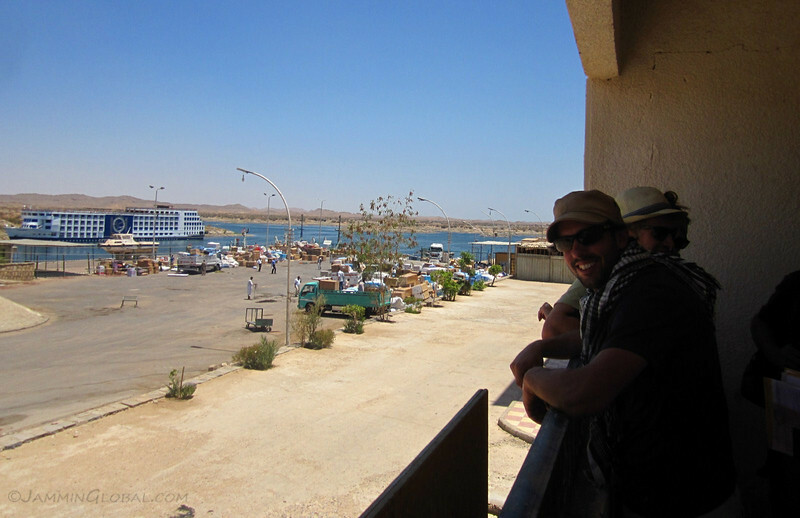 My time in Aswan was spent on keeping in step with the bureaucratic dance that Egypt dictates you have to follow when you leave the country with your vehicle and also, getting things sorted for the boat journey. 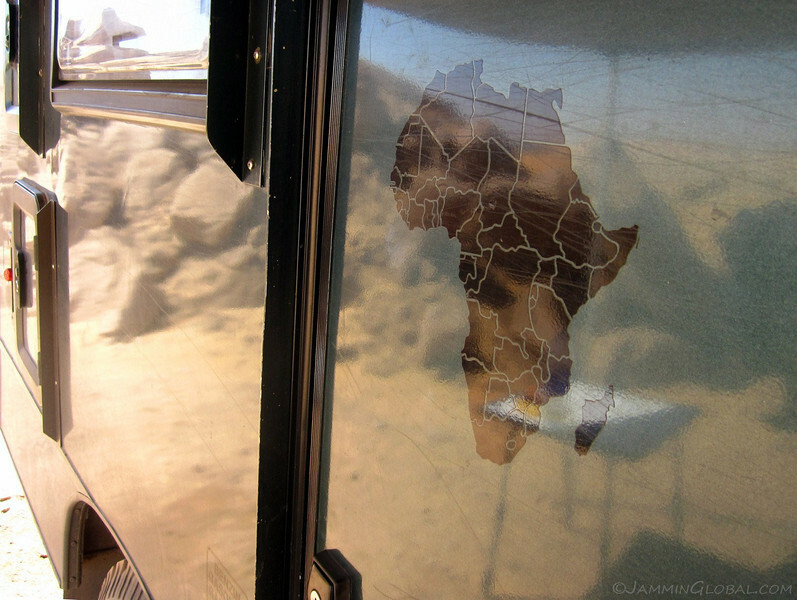 I connected with other overland travelers whom I would be sharing this part of the journey with. 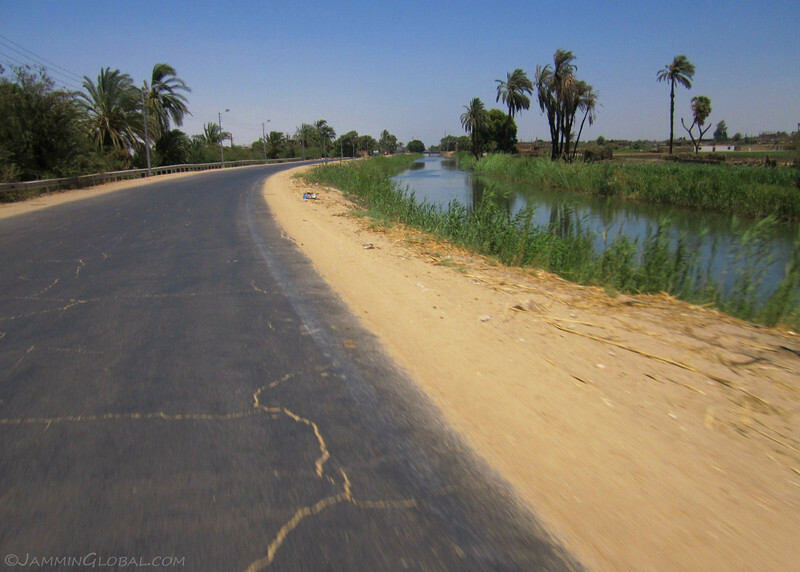 Heading south from Luxor along an irrigation canal. The roads were in good condition, leading to high speed driving by everyone, mini buses to jalops, except of course, the numerous donkey carts. 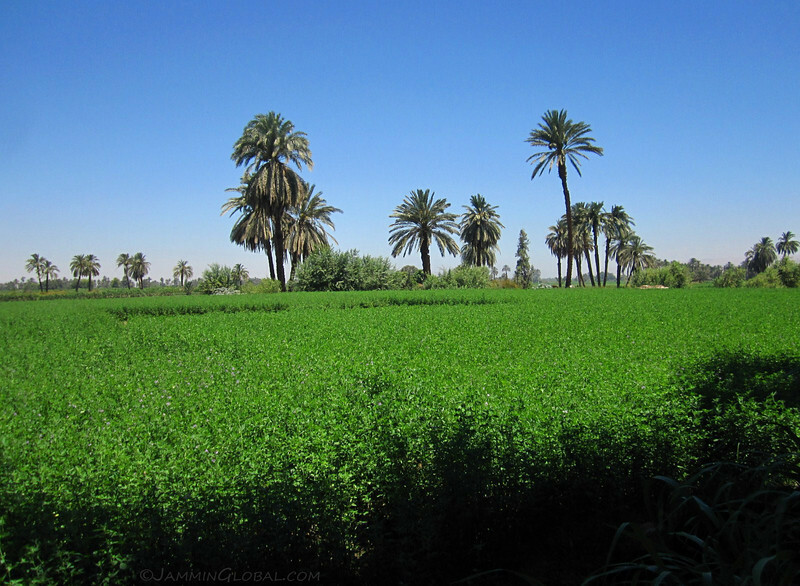 A lush field of alfalfa, the food for donkeys and horses, thriving with the waters from the Nile, under the hot sun of Egypt. 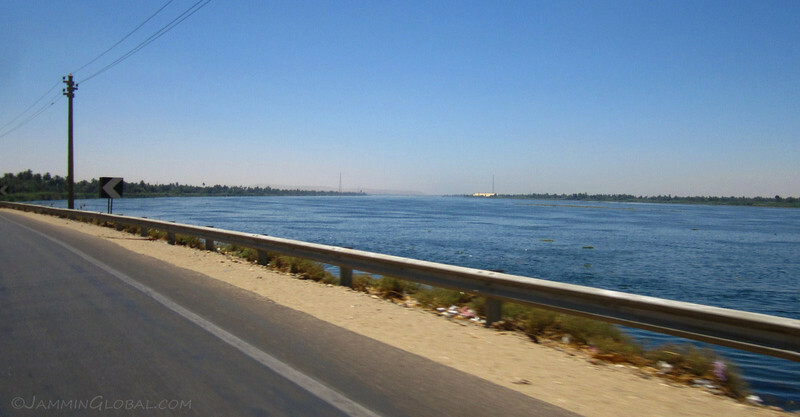 Riding next to the Nile, on the way to Aswan. I enjoyed the blue-ness of the river here, compared to the more polluted sections downstream after people have dumped on their life source. What’s better than a window seat? Hanging on to the back with fresh wind in your face. Taking a break under a small spot of shade. 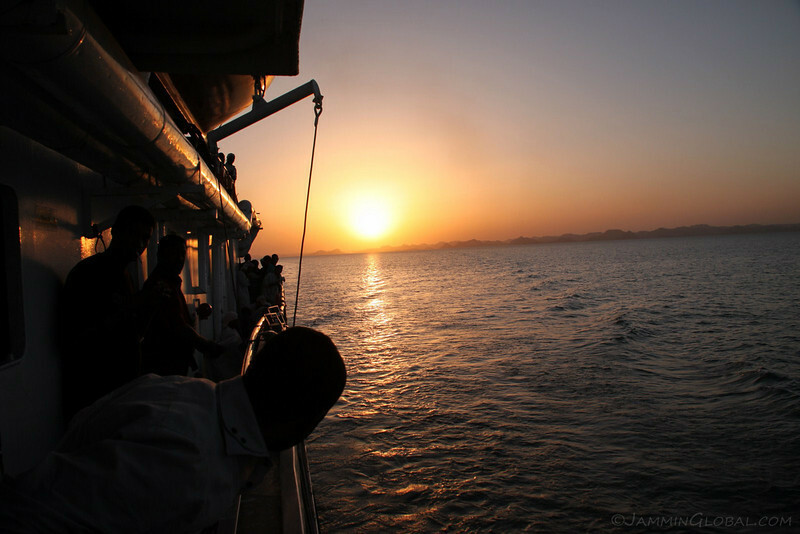 The heat was becoming intense the closer I got to Aswan. 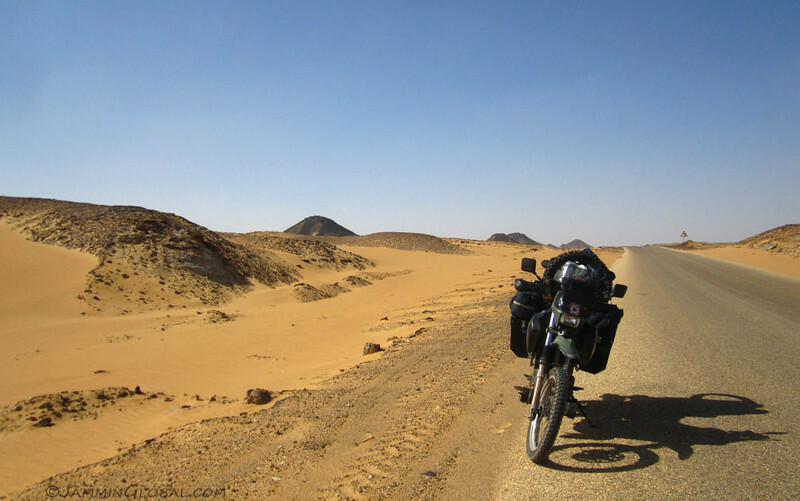 The temps for riding in most of Egypt (bar the desert) are actually quite comfortable, but I was told by travelers I met going north that the real heat starts from Aswan and south into Sudan. 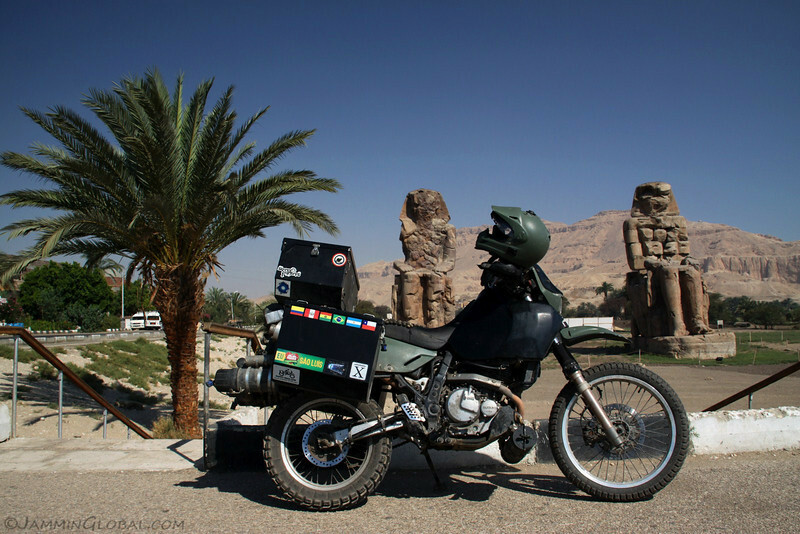 I left Luxor with 14 L (3.7 gal) of water and drank about half that over the 300 kms (186 mi) to Aswan. 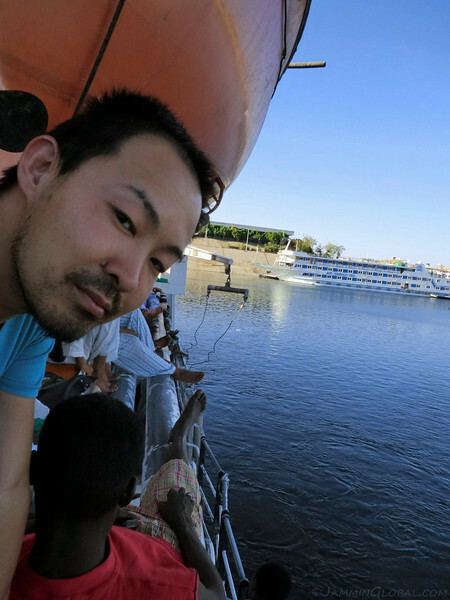 Seeing a felucca on the Nile as I got into Aswan. 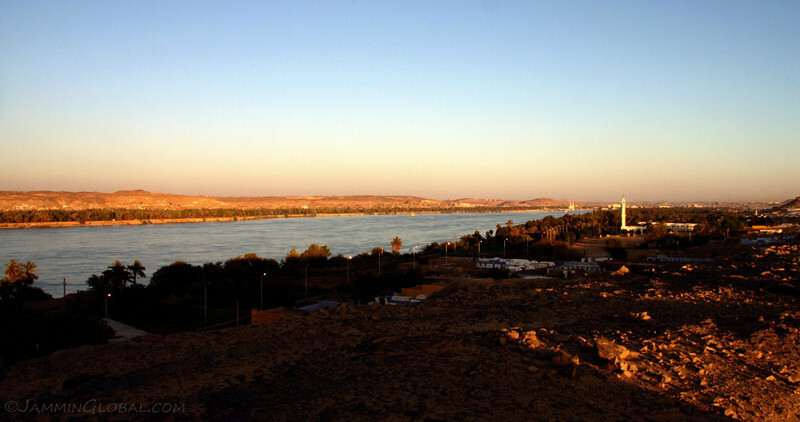 The high-power electricity lines in the background also give away the location, as Aswan is important to Egypt in that the Nile is dammed here and hydroelectricity generated at the Aswan High Dam is highly valuable to the country. 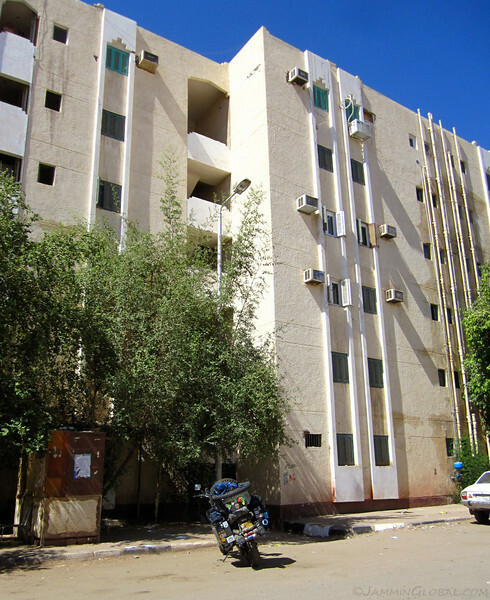 Arriving at a non-descript apartment block that houses the Aswan Traffic Court. To successfully leave Egypt, I have to get a small piece of paper from the traffic court saying that I have no outstanding traffic violations. Then I take this paper to the Traffic Police who give me another piece of paper that I then submit to customs at the port. The traffic court was closing at 2 pm and I arrived at 1:55. A broker (hustler) downstairs said he could help me out if we hurried. We ran up the flight of stairs (in heavy motorcycle gear and boots) with passport, drivers license and photocopies in hand. The official was on his way out, ‘Oh, I’m sorry, you’re too late, come again on Monday.’ But sir, the boat is leaving on Monday. ‘Oh, you’re from India? Amitabh Bachchan is Great! I’ll help you out, one second.’ And then after waiting around for 30 minutes, I got my little piece of paper. No cost for the official, but just LE 15 ($3) for the broker. 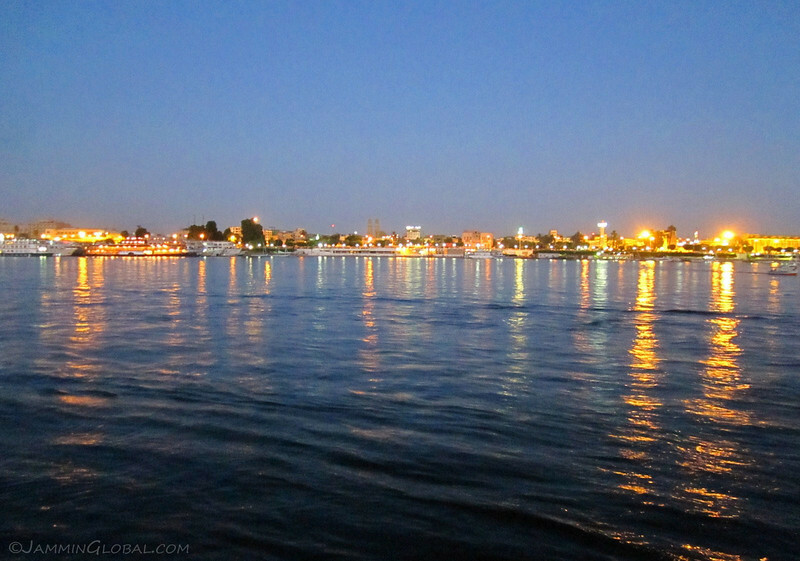 A view from the west bank of the Nile with the city of Aswan further upstream. I was trying to find a place to camp for the night. 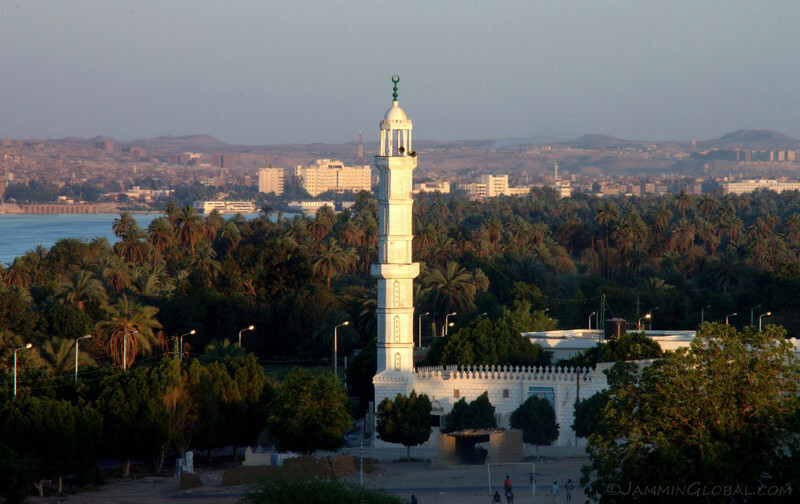 A white mosque surrounded by the greenery of the Nile. 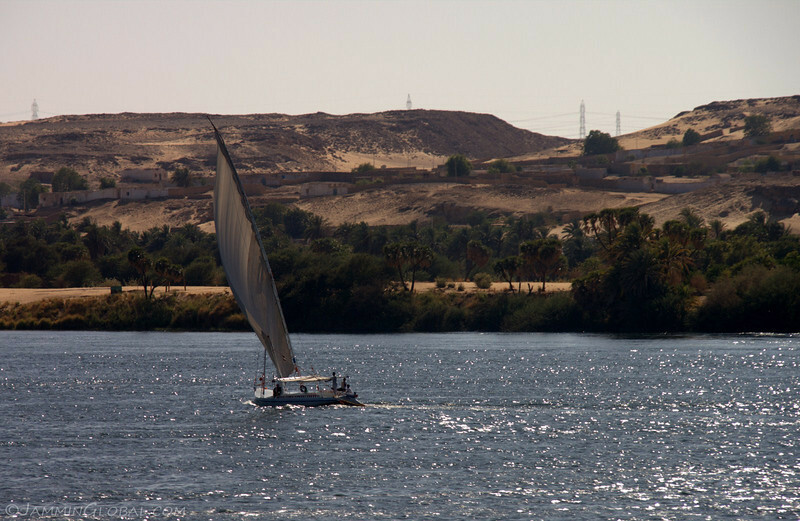 A felucca and a river boat on the Nile. 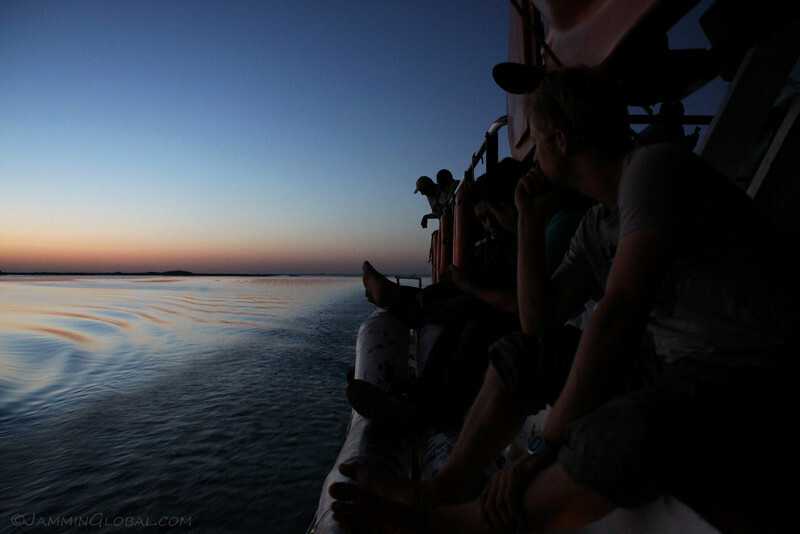 I knew there would be other overland travelers taking the same boat as me, as it only travels once a week and I found them in the afternoon. This is Benjamin, from Switzerland, and he’s traveling with Edward, from The Netherlands, in their green Toyota Hilux camper. 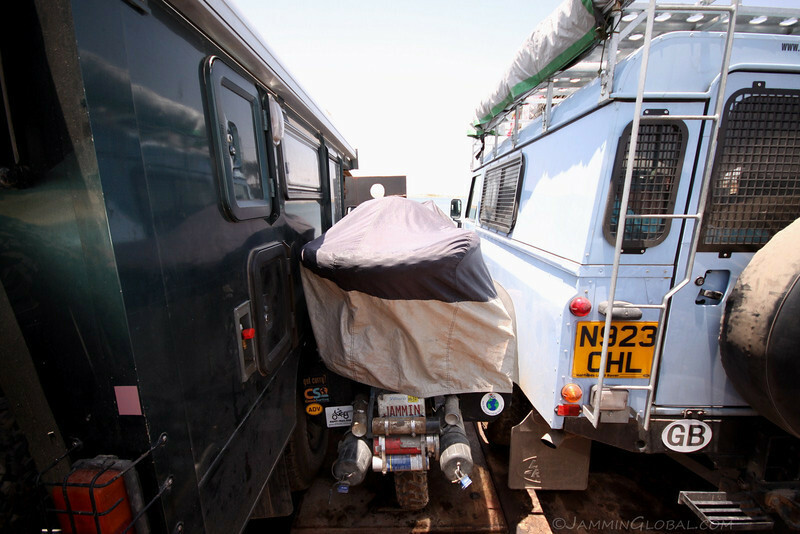 Next to him are Guy and Louise, Brits, traveling down in a Land Rover Defender. Guy saw me riding around town in the afternoon and invited me to join them in their desert camping spot. Ben and Guy are quite the cooks and they were preparing an excellent meal of curry and rice and breaded aubergines (brinjal) and zucchini. Ahh, the luxuries of traveling in an automobile. Getting ready the next morning for the final day in Egypt. 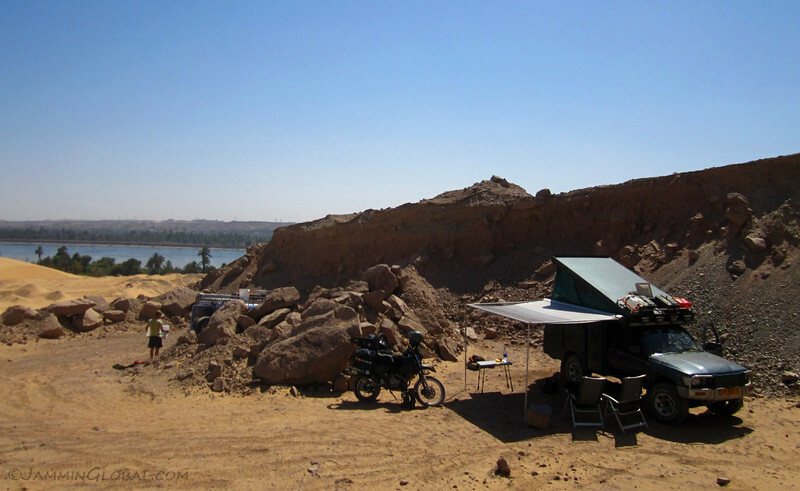 Ed found this secluded camping spot, a dead-end up a sandy track with great views of the Nile and the stars at night. 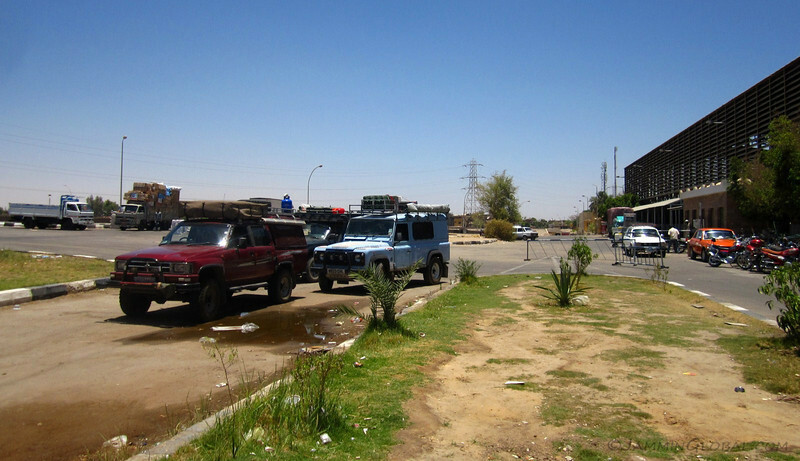 After a hearty breakfast, we set off into town, now as an overland convoy. 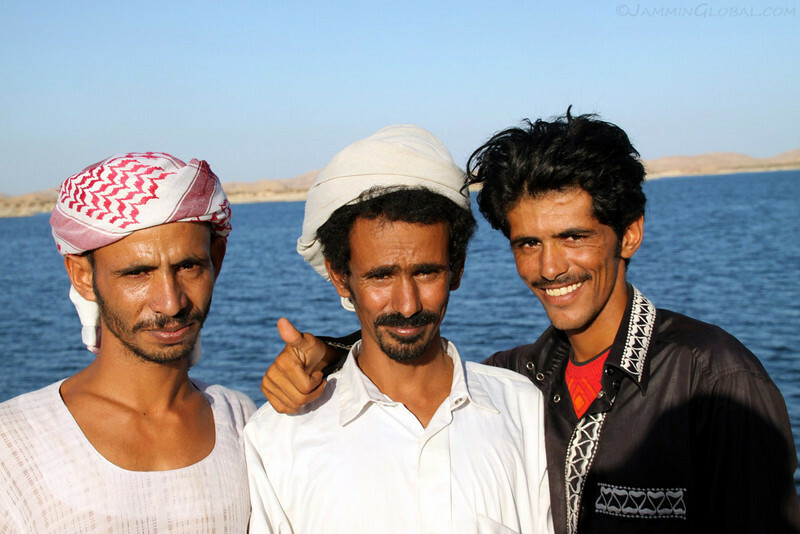 Ed and Ben were on a 3 month sprint from Cairo to Cape Town and were super jealous of my extended timeline. They could only manage a 3 month leave-of-absence from their management consulting jobs. Arriving at the Traffic Police building to hand in our temporary Egyptian number plates, get the second piece of paper and pickup the local official who would take us to the port. The gentleman in the middle had traveled up from his home in South Africa with his wife in their red Toyota Hilux in just 12 weeks. 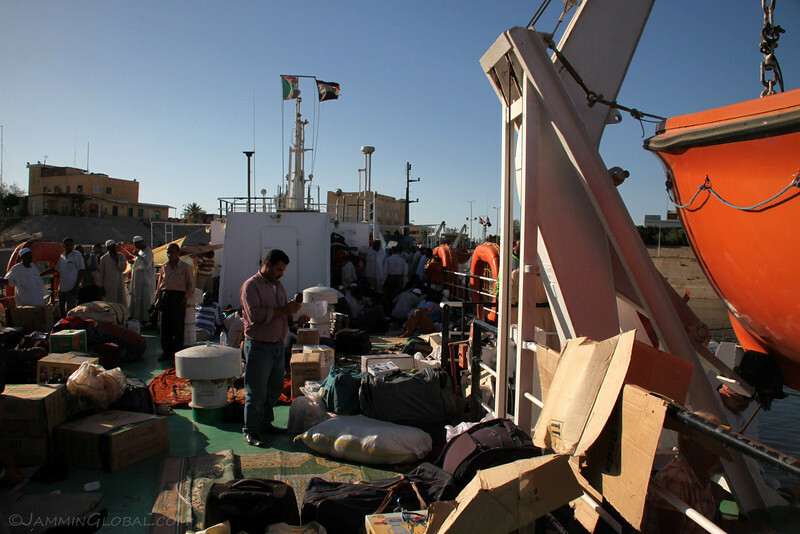 They wanted to visit family in Europe, but alas, the ferry to Venice was no longer operational and there was no other safe overland route to Europe from Egypt (Libya and Syria were no-gos), so they turned around and were going to head back to South Africa and see the things they missed on the way north. 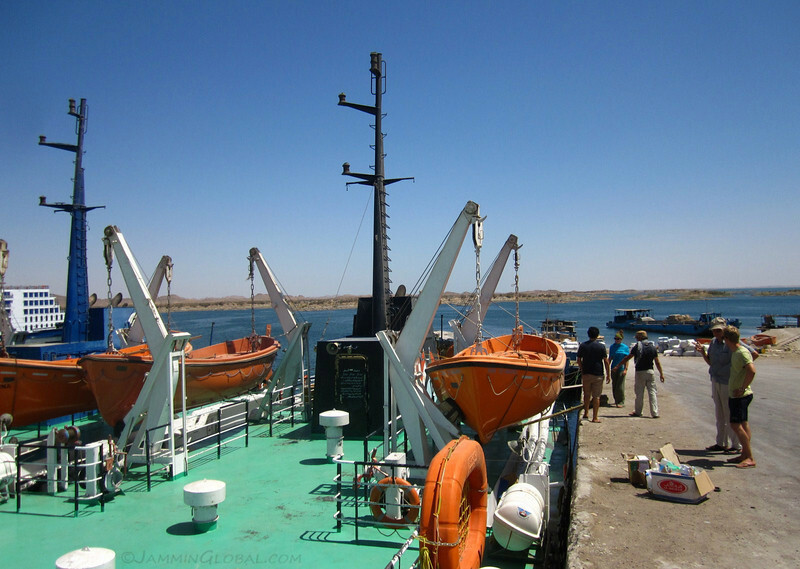 Arriving at the Port of Aswan, 20 kms south of the city. There was lots of standing around in the intense heat and we found respite in the retreating noon shadow at the port entrance. Carnets (customs document) in hand. 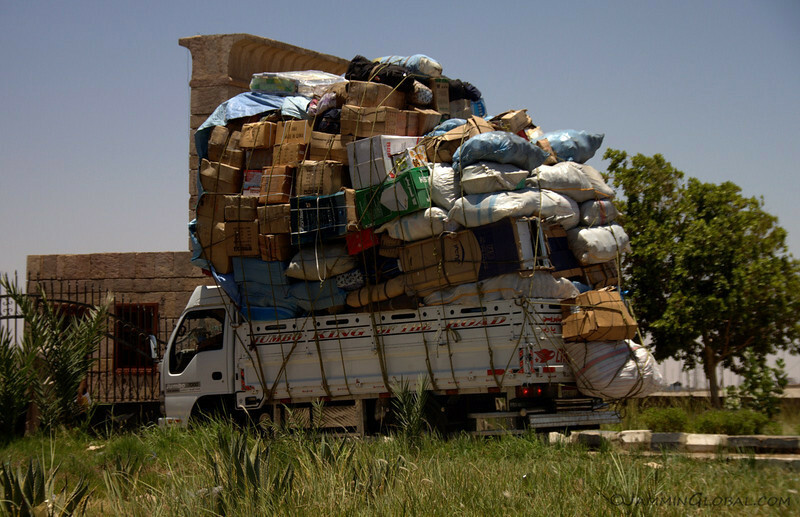 What do you mean I’m overloaded? 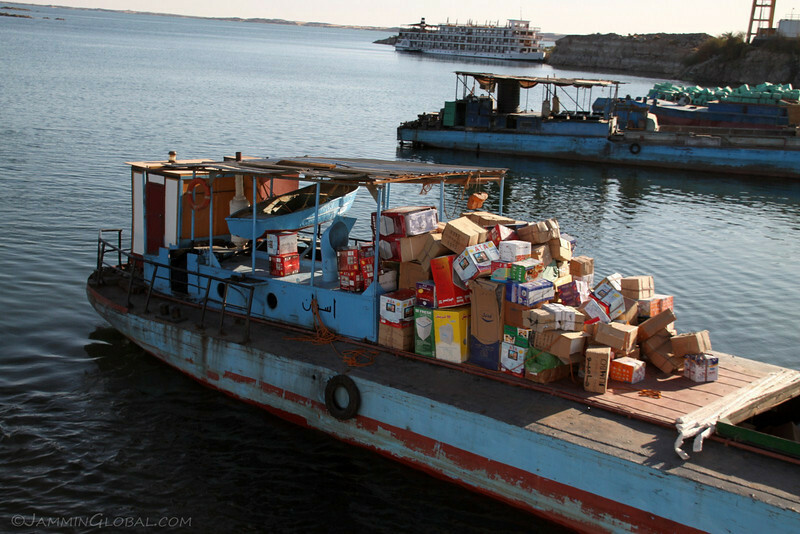 A truck arriving at the Port of Aswan with goods procured in Egypt, where everything is cheaper than Sudan, to be sent on the sole transportation link between these two brothers of the desert. There is a road coming to fruition on the coast, but it’s not open to personal traffic, yet. 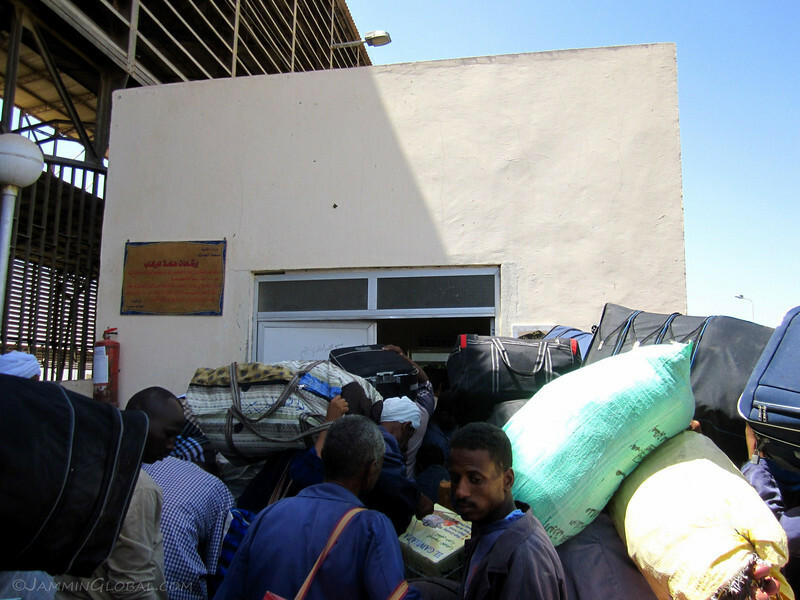 We made it inside the port (LE 10 entrance) and then, more waiting around. 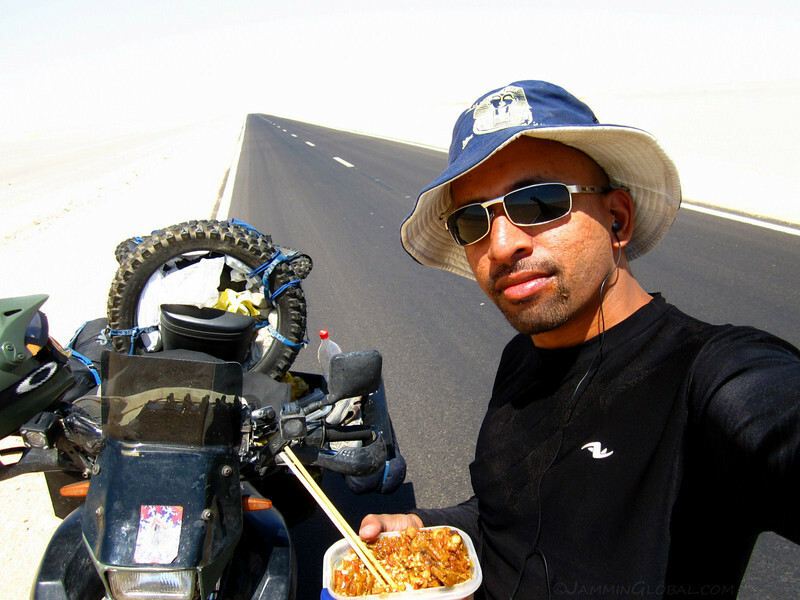 I enjoyed traveling with Ben, because besides diving into deep philosophical discussions, he always had food at hand. He’s cutting up a juicy honeydew melon that was perfect for hydrating in this dry heat. Ed and Ben met while working on a project in South Africa and hatched the plan for their journey there. 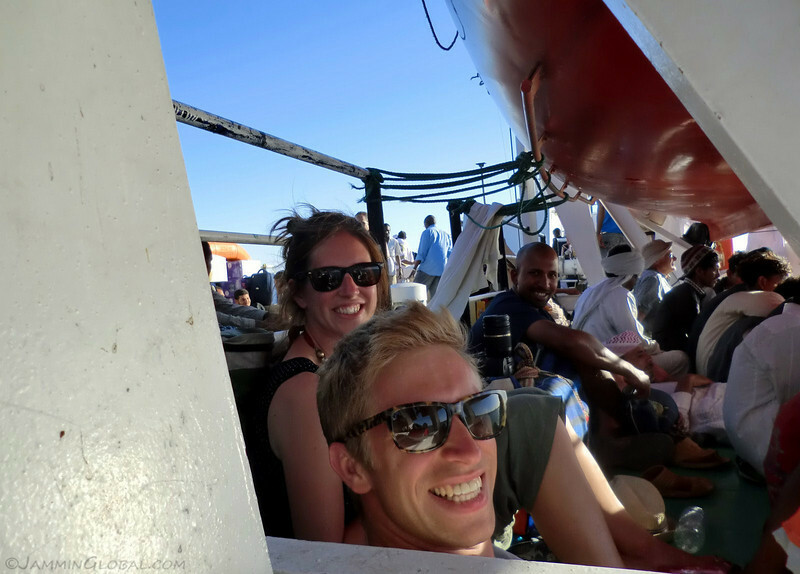 All smiles after having bought the passage for our vehicles with a view of the pier and Lake Nasser that we would be sailing on to Sudan. 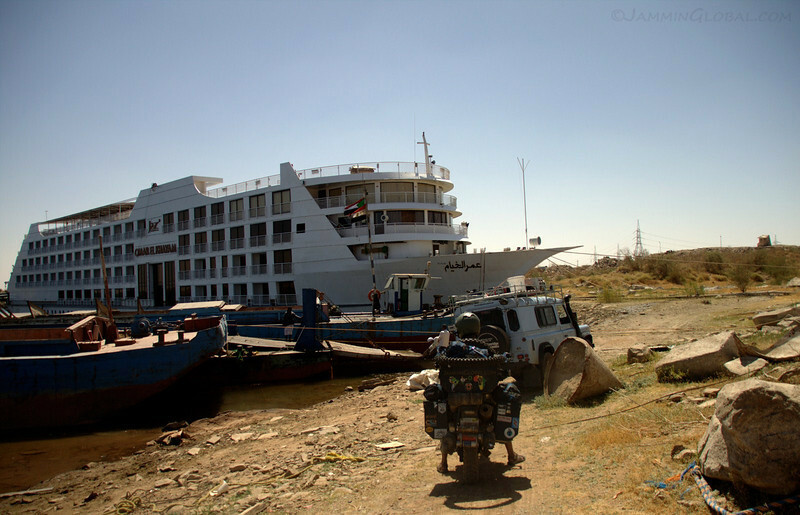 The barge ride for a motorcycle cost LE 250 ($45) and LE 2012 ($366) for automobiles, an advantage of traveling on two wheels. I don’t get to carry a full stove and kitchen, but hey, it’s cheaper. 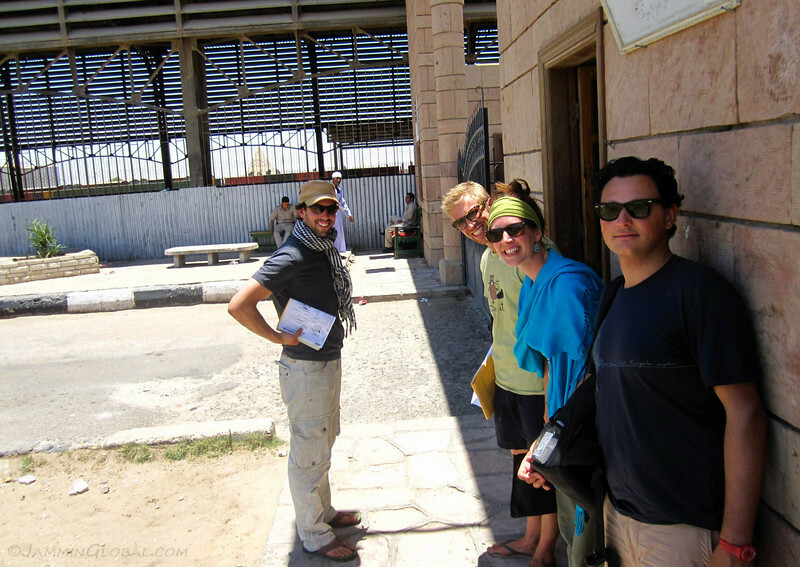 From there, we walked across to the customs building to have our carnets stamped out of Egypt and have a customary tea with the customs official. The carnet de passage is a customs passport for a vehicle that facilitates temporary importation into most every country in the world (except China and a few others). 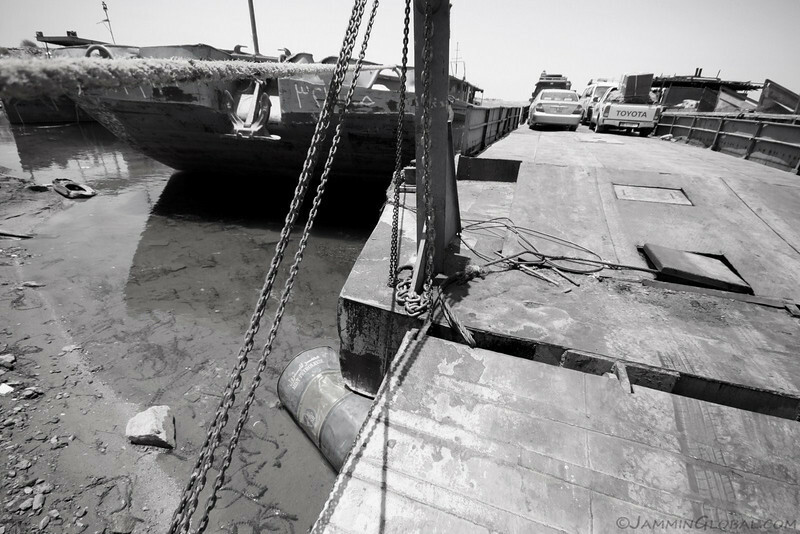 We then finally entered the fenced-off pier and had to wait around for the barge to be positioned properly before vehicles could be driven on board. 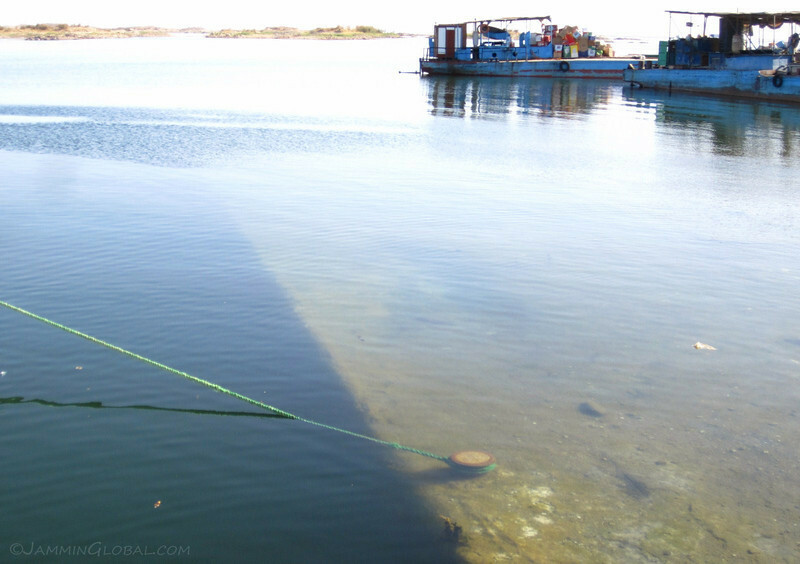 We walked down the huge pier that sloped down to the water level and got our first look at the boat that would take us across Lake Nasser. 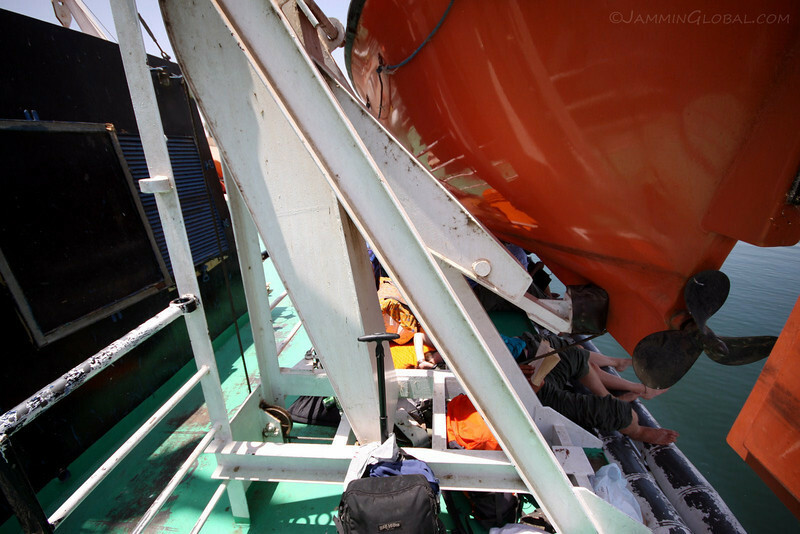 There are 3 modes of travel on this boat. 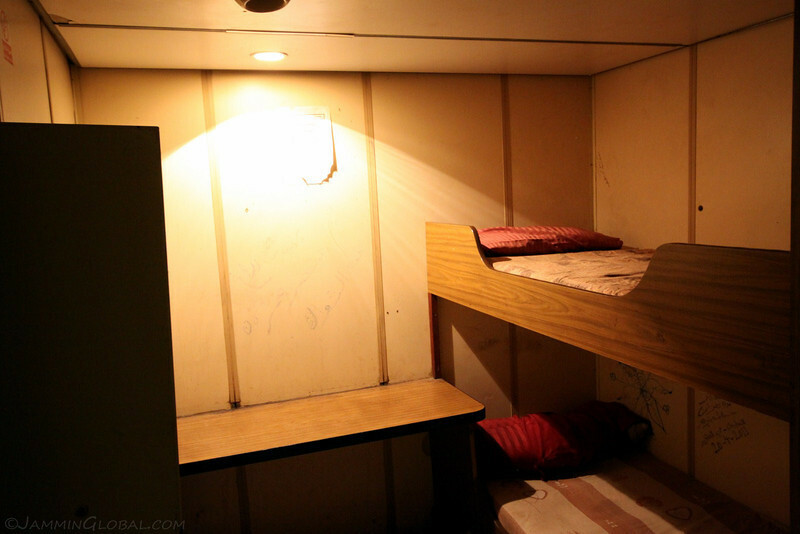 Most expensive was First Class with private cabins and cold A/C, then came Second Class, which was also A/C, but no privacy and best of all was Third Class, sleeping on the deck of the boat. 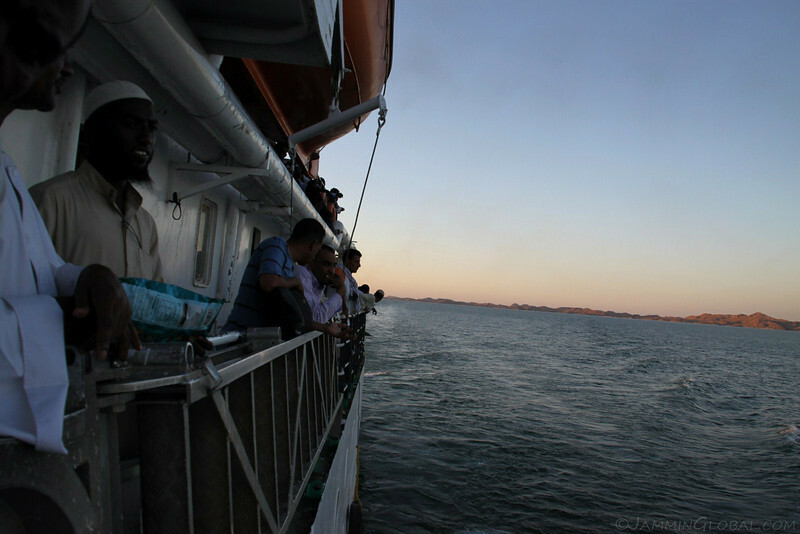 The word has been passed on by past travelers that Third Class is the way to go, but you have to secure a spot under one of the lifeboats to escape the sun. We got moving with our vehicles, getting closer to the barge. 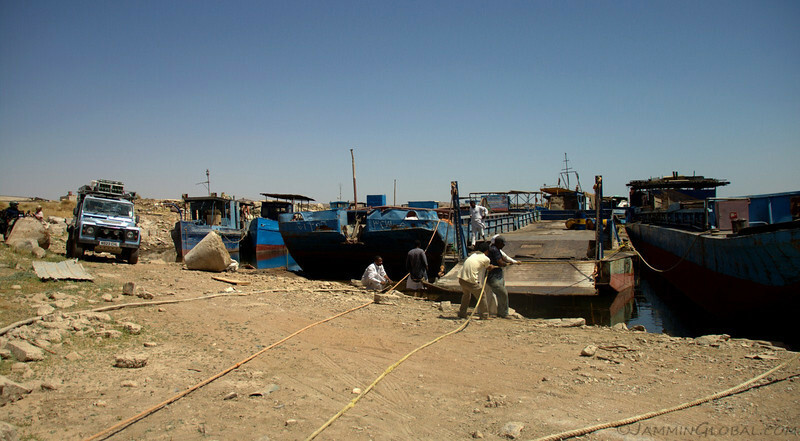 Men pulling the barge so that it’s ramp would reach the shore. 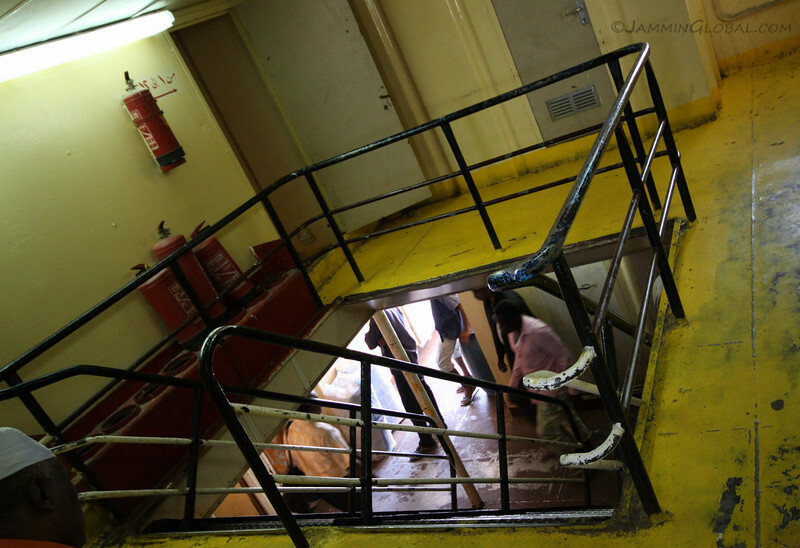 The ferry boat is only for passengers and vehicles travel on a separate barge. 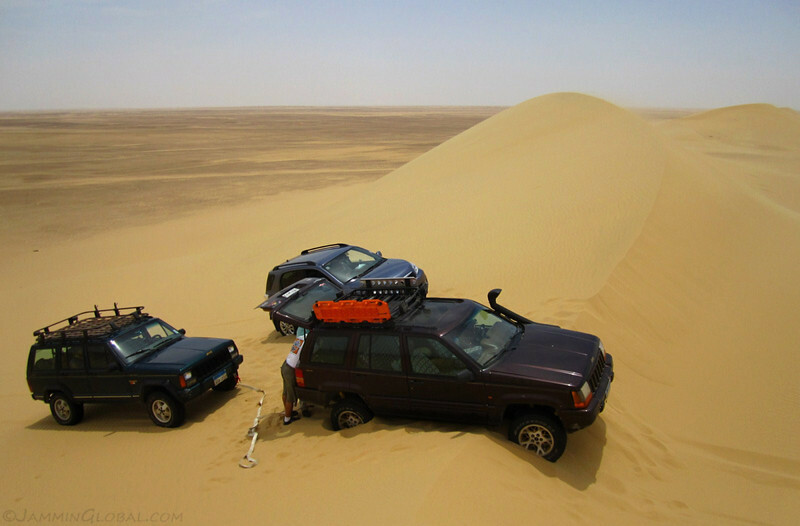 All overland travelers experience a sense of separation at this point, because we’ve bonded with our vehicles by now, getting used to our new mobile homes and now, we have to part with them and hope they will arrive safely at the other end of the long lake in a new country. Guy and Lu’s butch-looking Land Rover. Overland travelers agree that the Defender is the best-looking overlanding vehicle, feeling at home in Africa, but it’s also agreed that they require a lot more maintenance than trusty Toyotas, like the Land Cruiser or Ed and Ben’s Hilux. 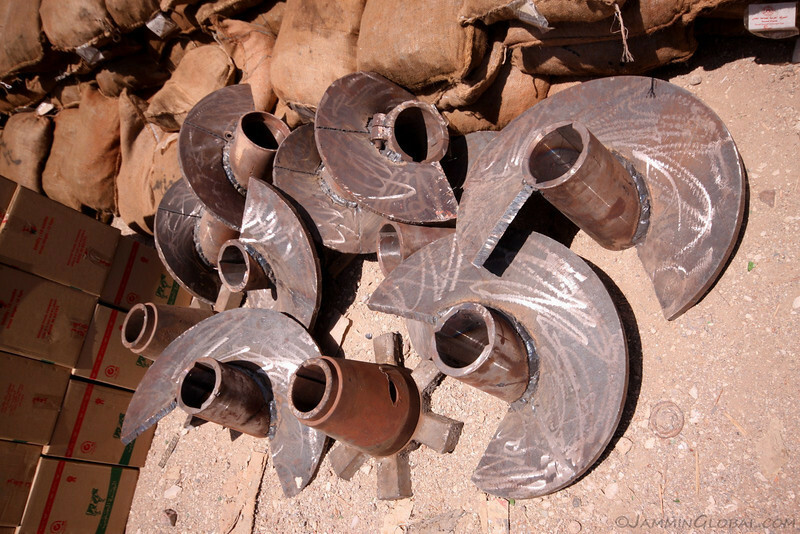 Spares for the Toyotas are available almost everywhere on the planet and most-any mechanic knows how to work on them. 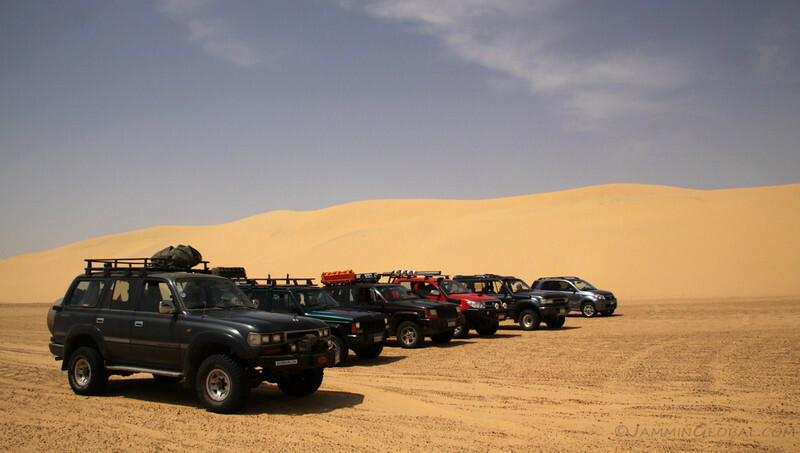 So, in deciding on an overland vehicle, you can be a romantic and choose the Defender or be the pragmatist and choose the Land Cruiser or Hilux. 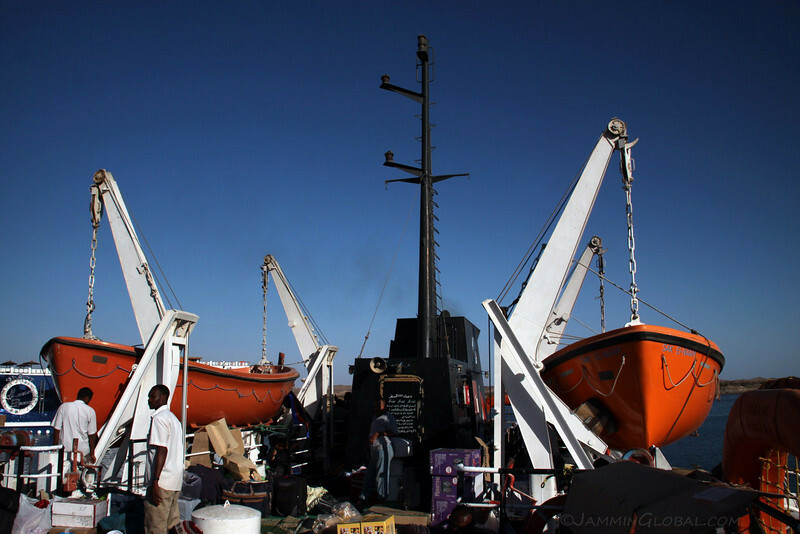 Once the barge was in place, the vehicles were driven on and I squeezed sanDRina between the Hilux and the Defender. 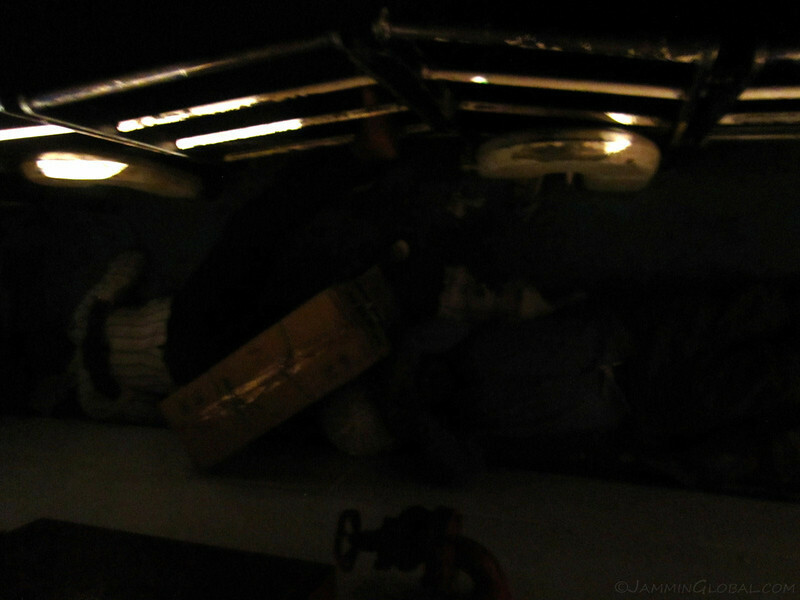 I had my panniers aligned with their tires, so that if the barge rocked, she would be held in place. There were no tie-downs provided or any places to attach them (I carry a set of tie-downs), but with just the kick-stand down and resting between the tires, I figured sanDRina was in a good place. 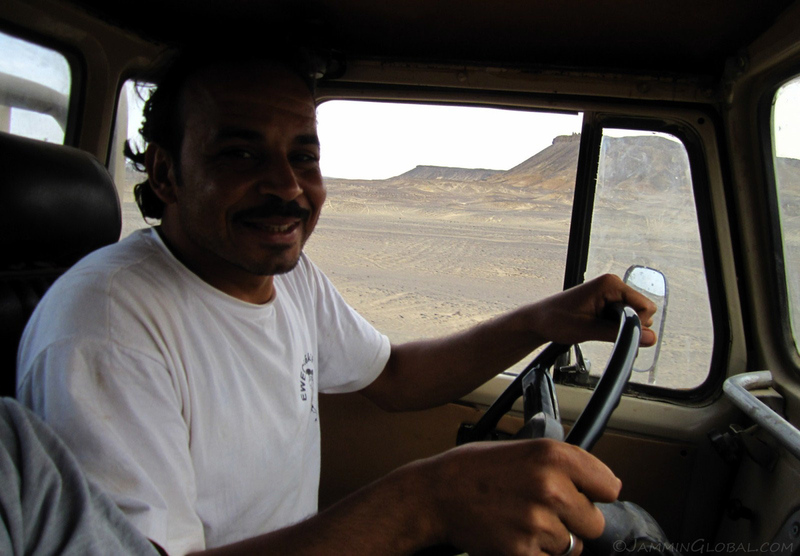 With our personal transportation gone, everyone piled into Kamal’s taxi for the ride back into Aswan. 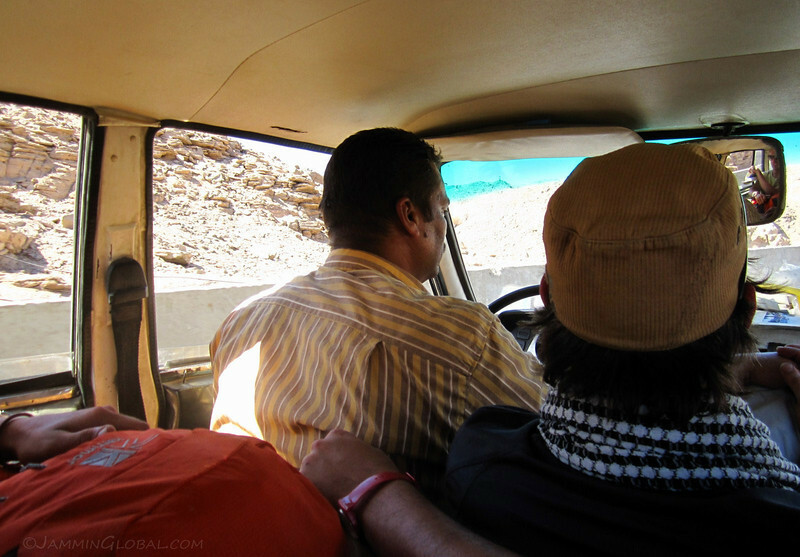 He drove like a typically mad Egyptian and with all of us being drivers/riders, we make the worst back seat drivers. Seat belts? meh. 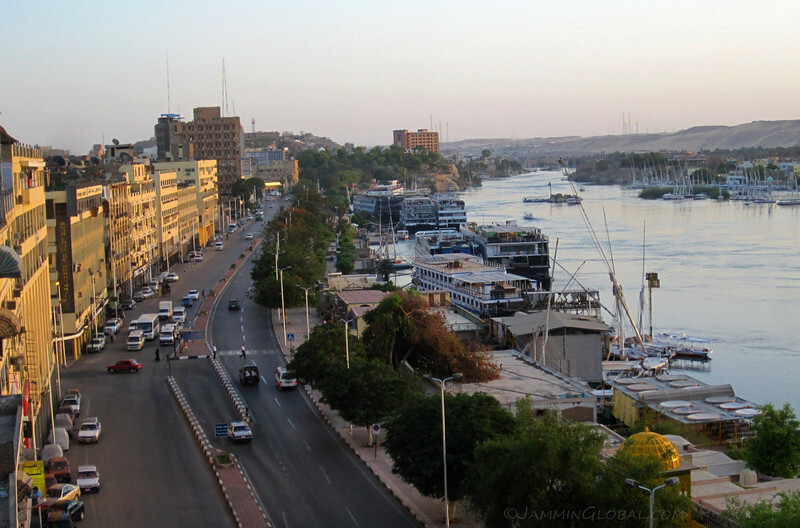 Now, with everything set for the ferry journey tomorrow, we could enjoy the city of Aswan. 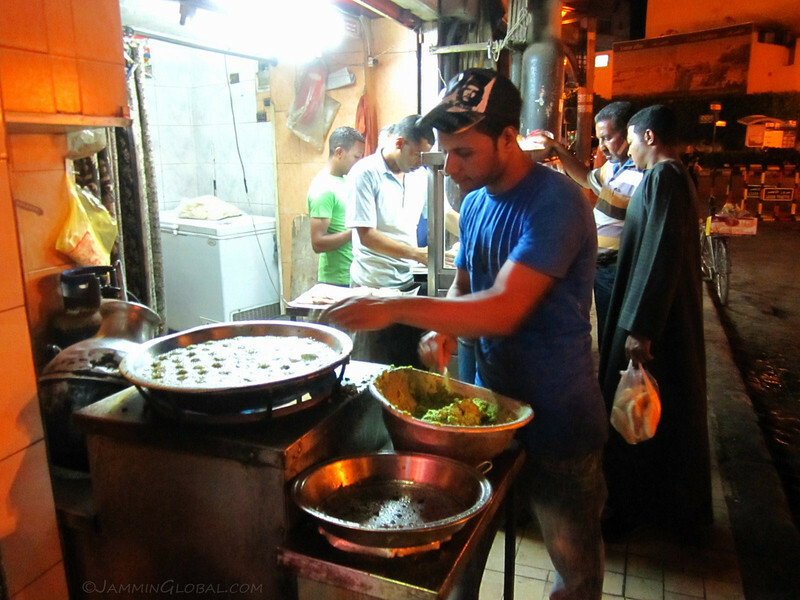 We wandered around its souk (market), looking for a place for lunch. 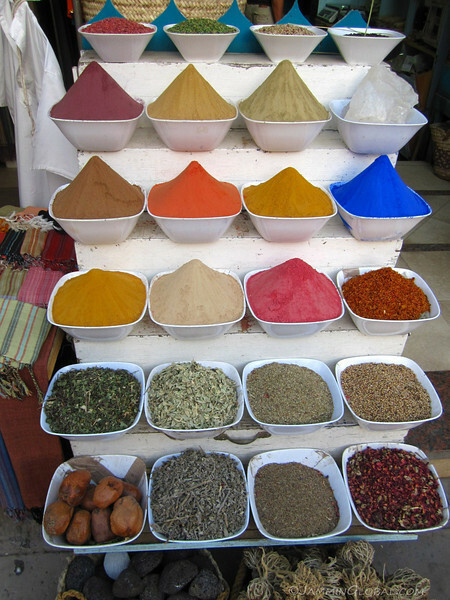 A colorful array of spices and minerals. The cobalt blue powder is used for washing white clothes. 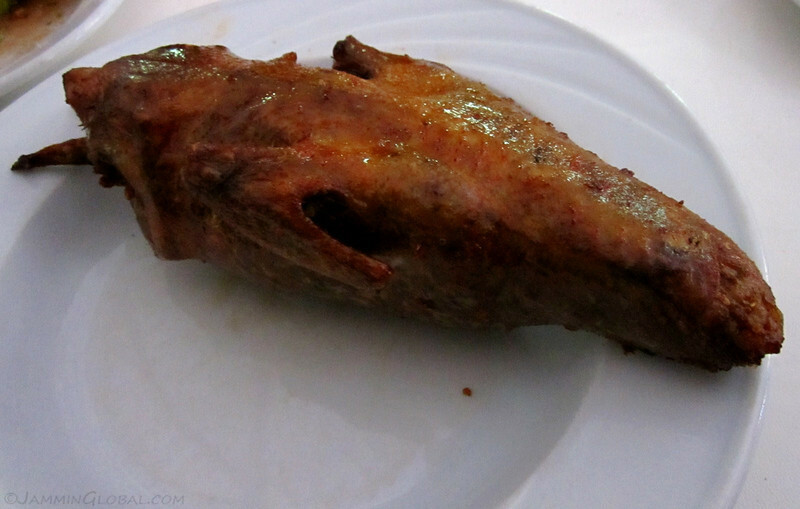 Lunch of a stuffed pigeon. Tasted like chicken and was stuffed with rice and veggies. 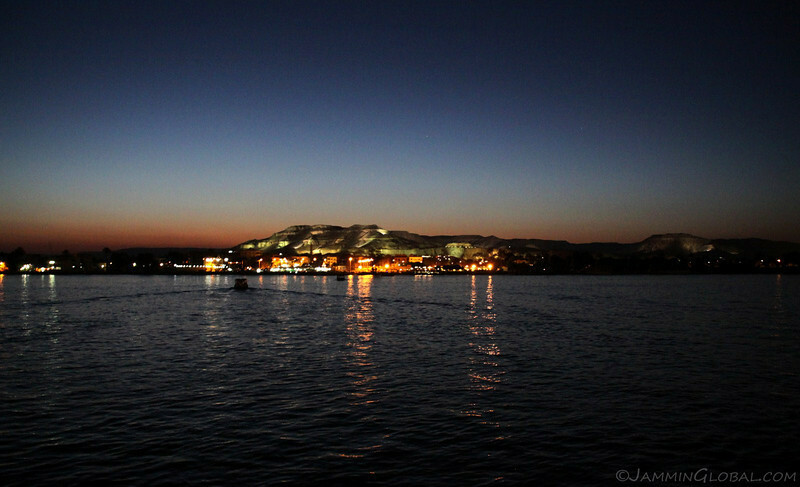 A view of the corniche in Aswan along the River Nile from the rooftop of Hathor Hotel. Not having our mobile homes with us, we had to resort to a hotel. 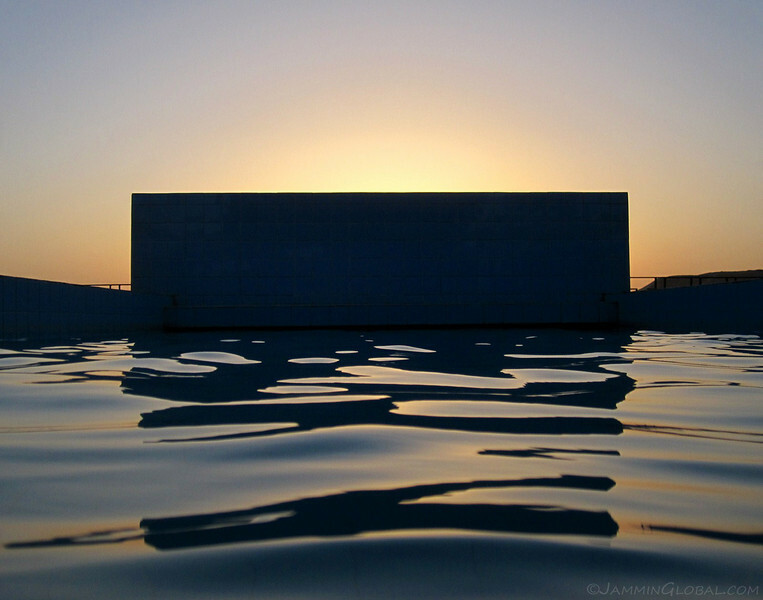 The rooftop pool at Hathor Hotel with a setting sun behind the wall. The hot day spent outside in the sun made us splurge for this last night in Egypt, all of LE 80 ($15). 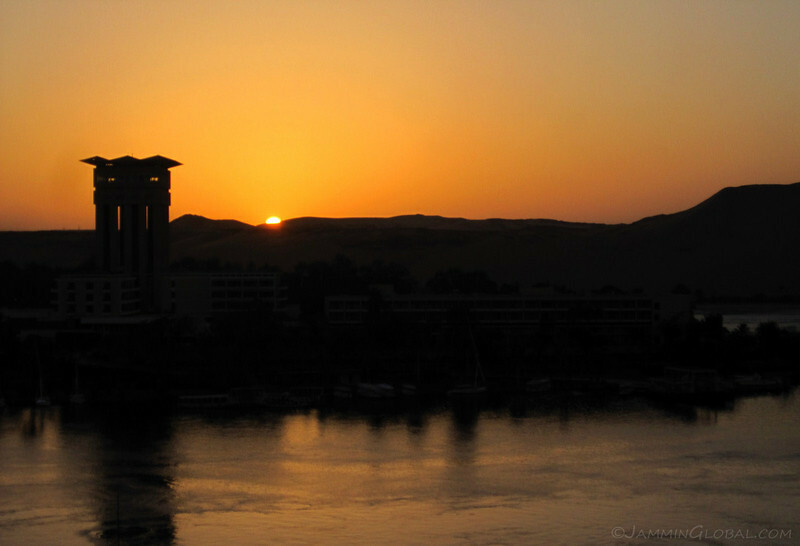 The sun tucking away behind the hills, casting its beautiful glow in the sky and on to the waters of the Nile. 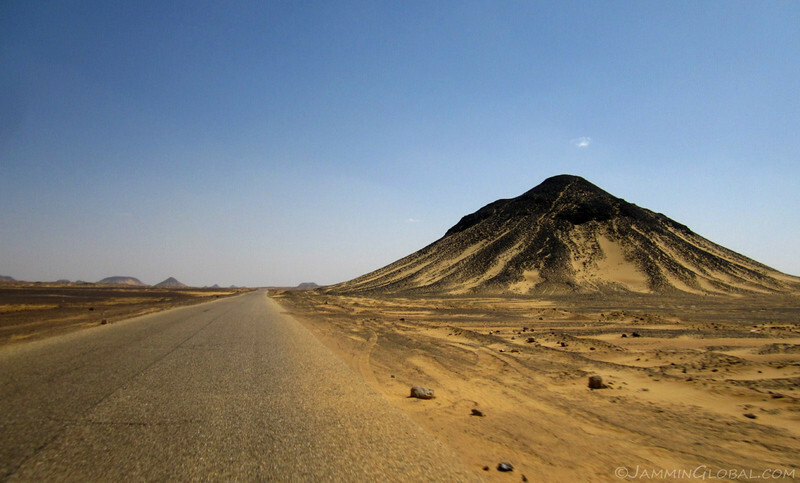 I slept peacefully and thought back to all the wonderful experiences I had had in my journey south from Alexandria, thru Cairo, Bahariya, the White Desert, Kharga, Luxor and finally into Aswan. Egypt has a lot to offer for visitors to see and experience, ranging from ancient monuments to mind-blowing wind sculptures in the desert. I’m also happy I got to make some good connections with Egyptians all over the country, ranging from professionals in the city to Bedouins in the desert. The Pharaohs of Ancient Egypt and the grand civilization that they ruled over are famous throughout the world. 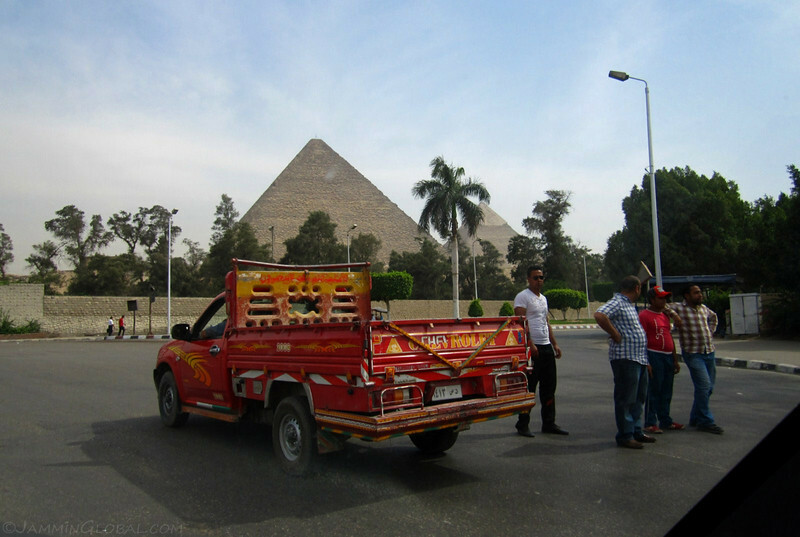 My tour through Egypt let me see the different sides of this modern country. However, its well-preserved ancient past is what adds magnificence to this land. 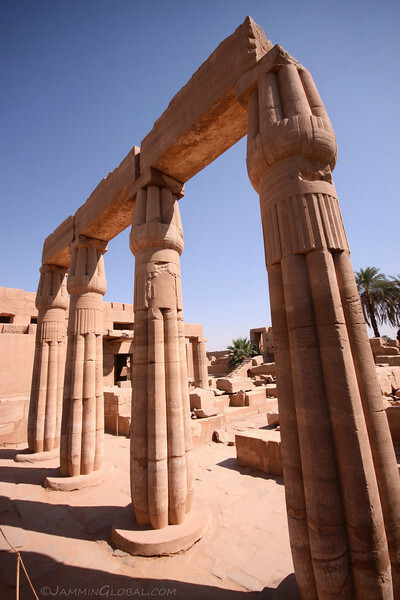 In and around the present-day city of Luxor are the numerous architectural remains of the ancient city of Thebes. 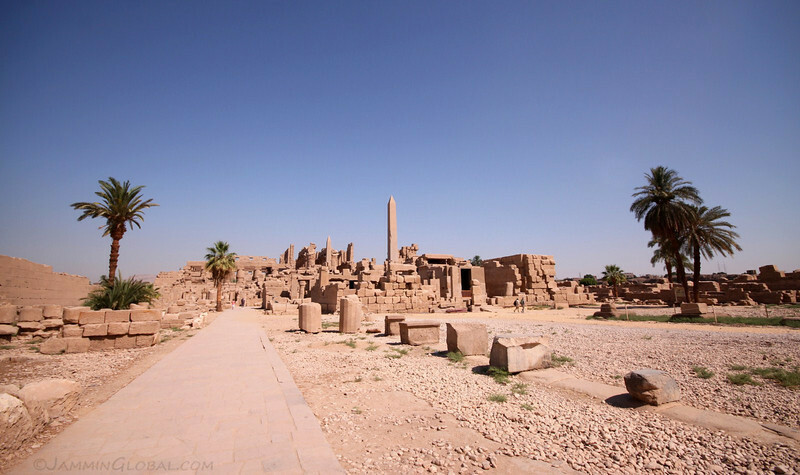 The city gained prominence for its luxurious lifestyle of its rulers and was also the center of Ancient Egyptian politics, culture and religion at various times during its history. 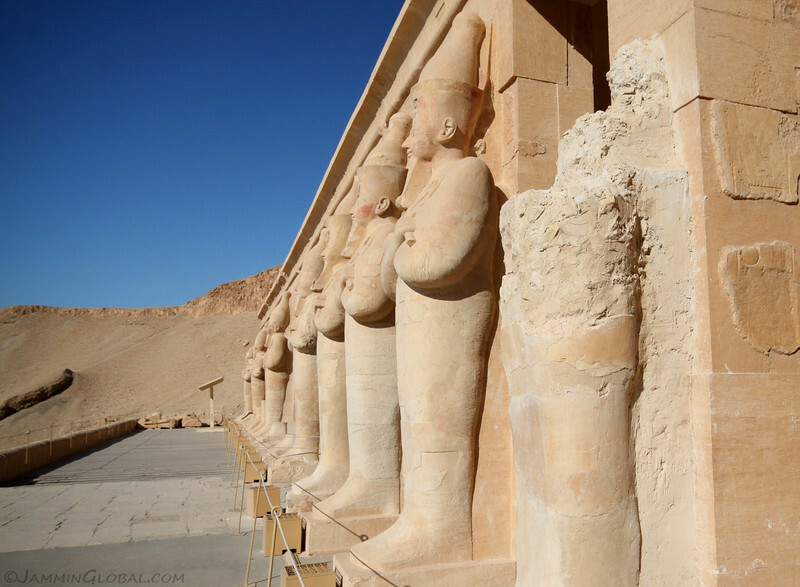 In the following photostory, I cover the Mortuary Temple of Hatshepsut, the Colossi of Memnon, the Valley of the Kings and Karnak Temple. It’s a lot of history and it’s very complex but I try to put things in context. Enjoy. 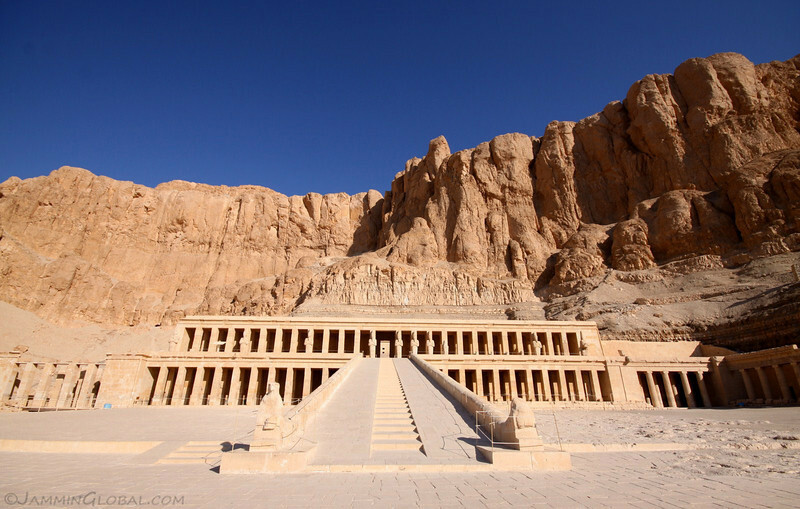 The grand Mortuary Temple of Hatshepsut, located beneath the cliffs of Deir el Bahari on the West Bank of the Nile. Hatshepsut was a rare female pharaoh and considered to be very successful during her reign, 1503 to 1482 BC. 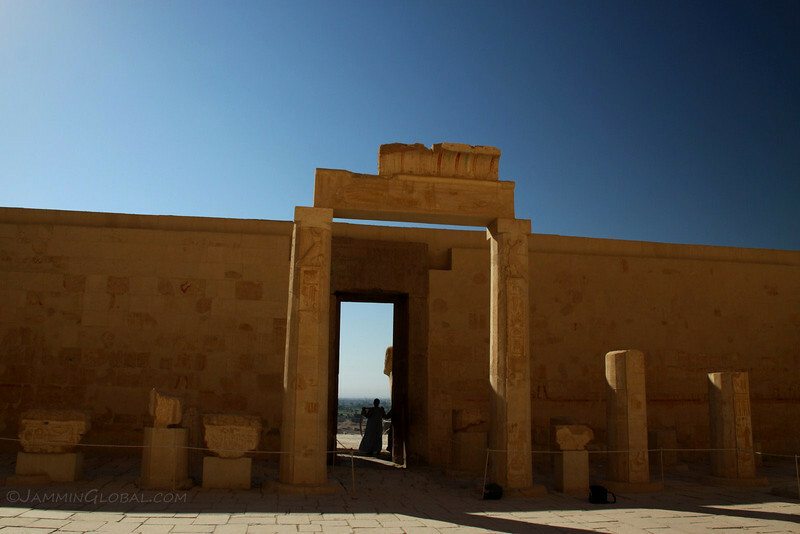 This temple, known as Djeser-Djeseru (Splendor of Splendors) was designed and built by Senemut so that she could be worshiped after her death. The temple is set on a series of terraces and this is at the middle terrace. The guardian of the upper terrace with Deir el Bahari towering in the back. 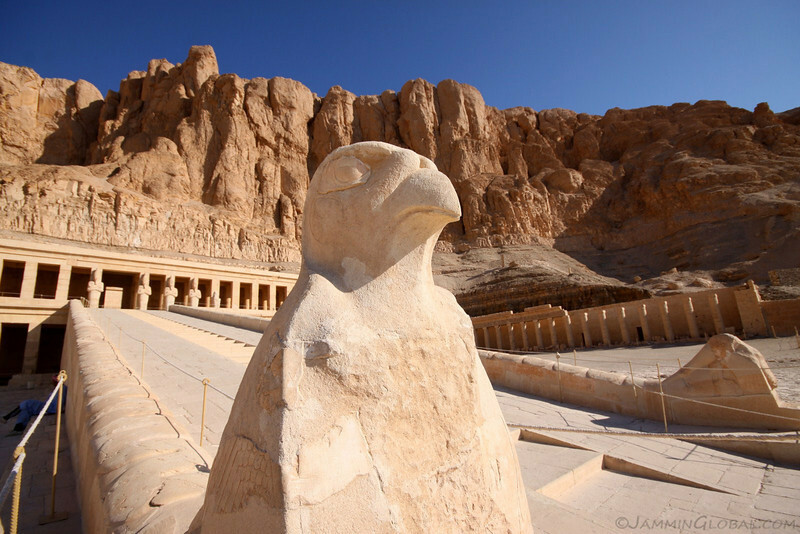 The upper terrace is lined with statues of Hatshepsut in the form of Osiris. From the Upper Court, looking out the gate with the Nile Valley in the distance. Re-constructured pillars in the Upper Court. Many of these ancient monuments were rebuilt by recent historians and some were done with imprecise information, so maybe it didn’t really look like this back then. A cartouche of Thutmose II, Hatshepsut’s husband, on a pillar in the Upper Court. A cartouche is a series of hieroglyphs enclosed by an ellipse, indicating that the contents inside it are a royal name. 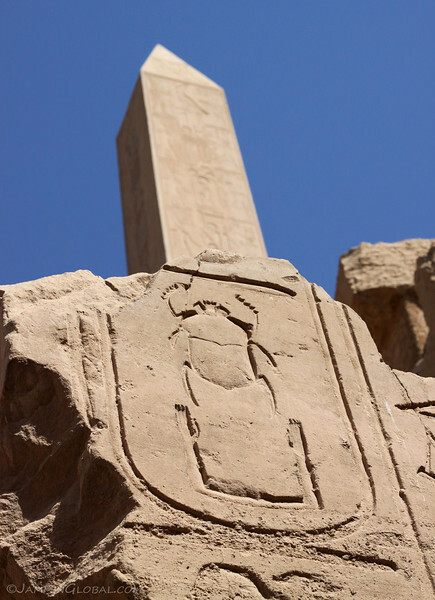 The scarab, or dung beetle, was a prominent symbol in Ancient Egypt. This beetle is known for rolling a ball of dung along the ground as it moves this food source around. Ancient Egyptians associated this with the sun moving across the sky and thus the scarab is associated with sunrise and creation. 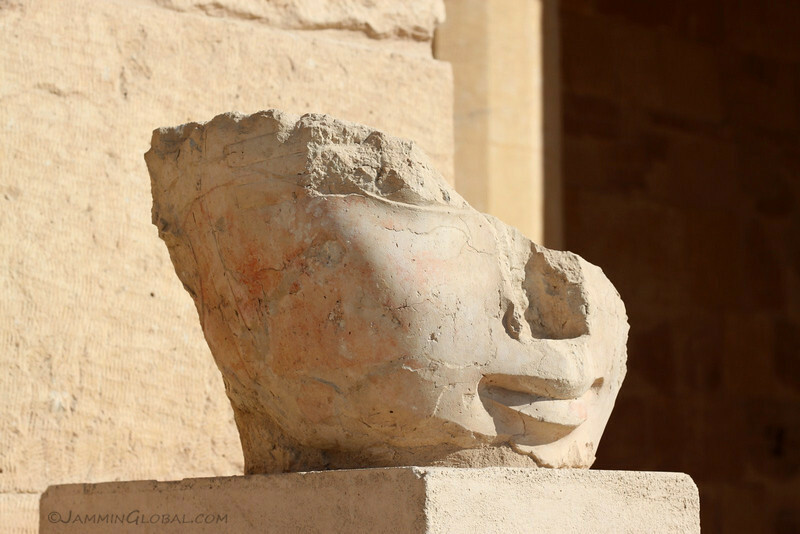 A broken statue of Hatshepsut, missing its body, out on the upper terrace. 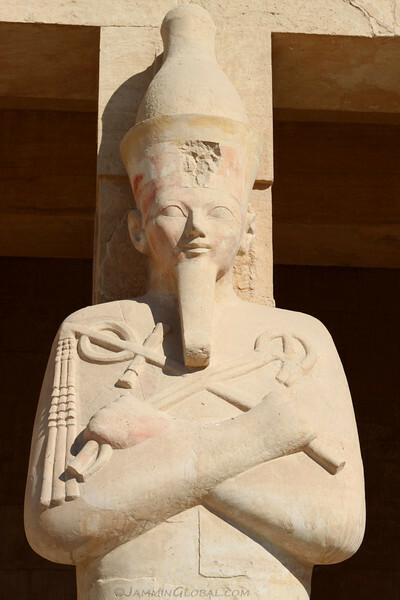 An Osiride statue of Hatshepsut, flanking the entrance to the Upper Court. Even though she was a female, she was depicted with a traditional pharaonic beard to cement her position as ruler. Many pharaohs had statues of themselves in the form of the god, Osiris, because he’s the god of the afterlife. Osiris can be identified as he holds the symbolic crook and flail, with the crook being a symbol of shepherds and the meaning of the flail is not known. 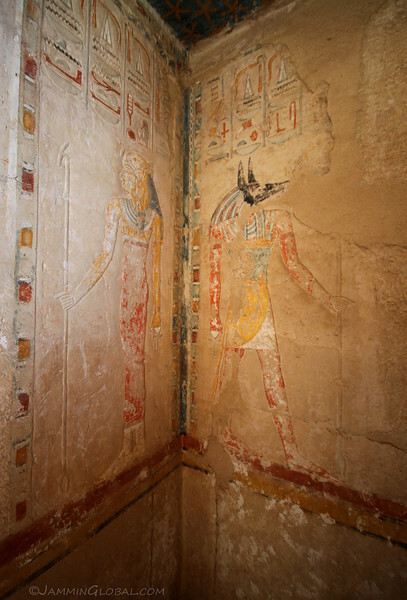 Past the Birth Colonnade is the Chapel of Anubis, decorated with colorful murals that have stood the test of time. 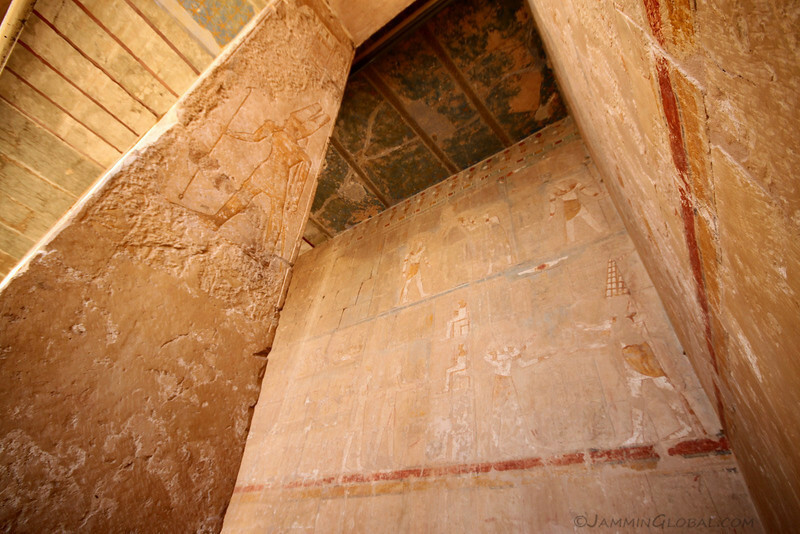 The ceiling was covered in yellow stars, with the walls telling detailed stories of Hatshepsut. 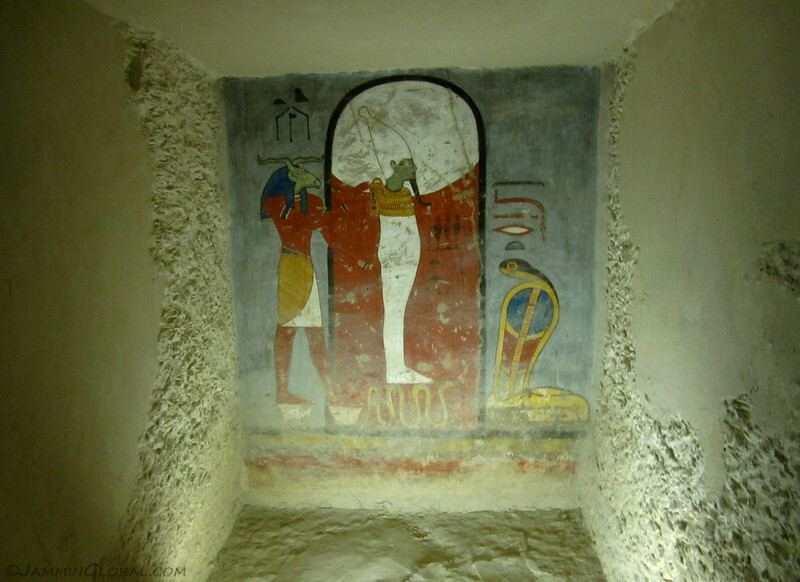 A depiction of Sokaris receiving wine from Thutmose III in the Anubis Chapel. Sokaris is a sun god with a falcon’s head and Thutmose III is the son of Hatshepsut, who succeeded her as pharaoh. However, this son suffered from an inferiority complex of his much-lauded mother and proceeded to chisel her name and image from all monuments in the kingdom. Her story, that of the first female pharaoh, was only recently revealed by archaeologists studying hieroglyphs. 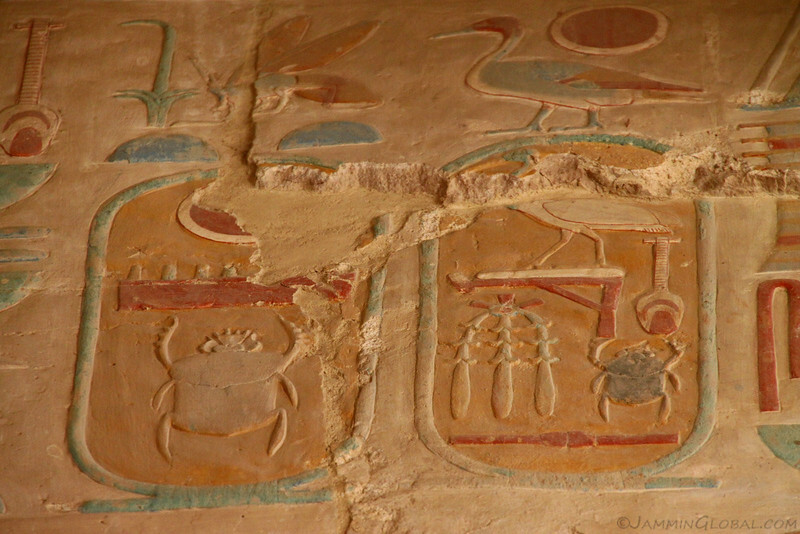 Colorful raised hieroglyphs, well-preserved through time. A depiction of Anubis, the jackal-headed god and I presume his wife, Anput, his female aspect. Anubis is associated with mummification and the afterlife and his head comes from the association of jackals with cemeteries, because they were known to dig up bodies and eat them. 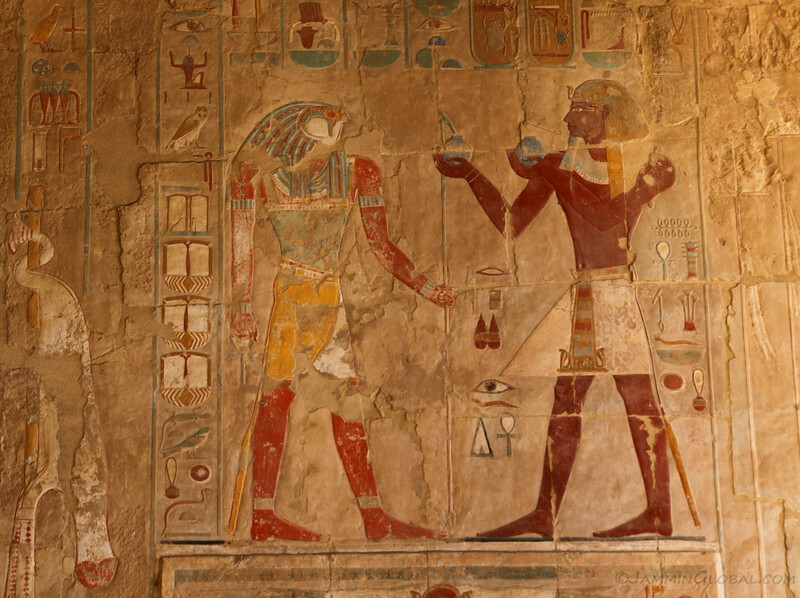 These gods are shown holding the Ankh, a symbol of eternal life and the Was scepter, a symbol of power of dominion, carried by lesser gods in mortuary scenes such as this. 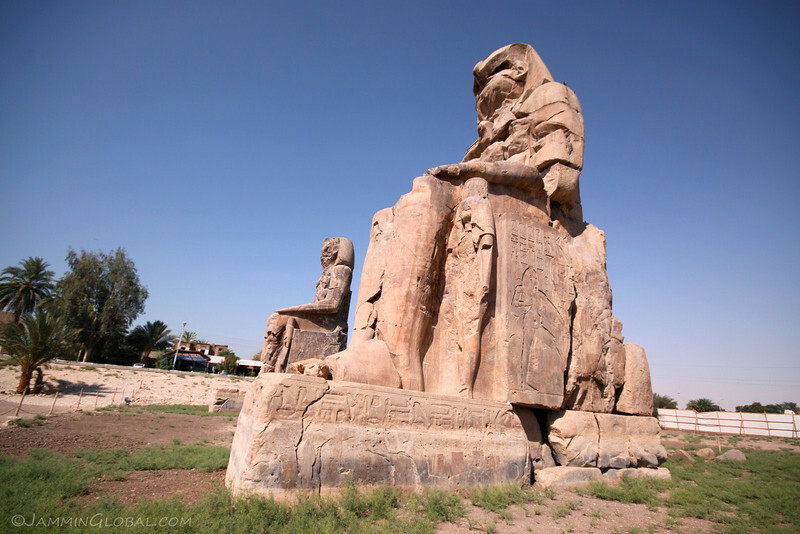 sanDRina and the Colossi of Memnon: two giant statues, right by the road and free to visit. 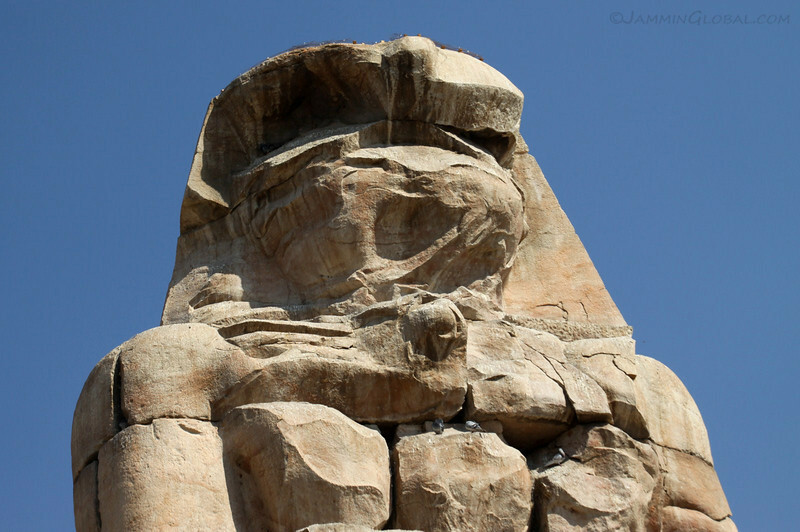 Both the statues depict Pharaoh Amenhotep III and have been here for the past 3,400 years. It’s hard to assess scale but they’re both 18 m (60 ft) tall. A close-up of the right colossi with pigeons nesting in his chest. 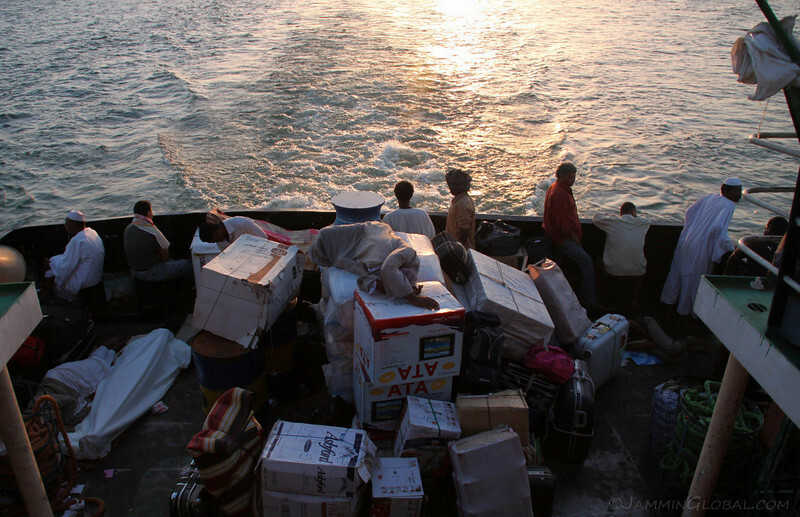 They’ve been battered by earthquakes and floods from the Nile, but still going strong. 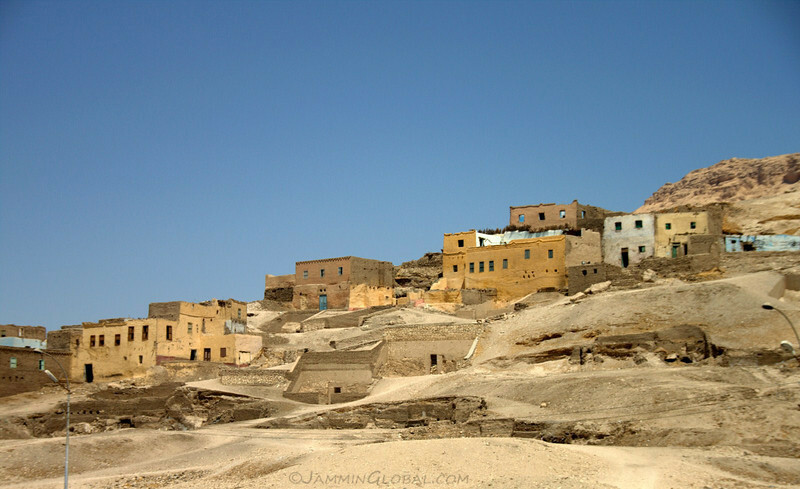 The abandoned village of Qurna, that was built by settlers in the late 19th century near and on top of the tombs at the Valley of the Kings. The Valley of the Kings on the West Bank of the Nile in Luxor. 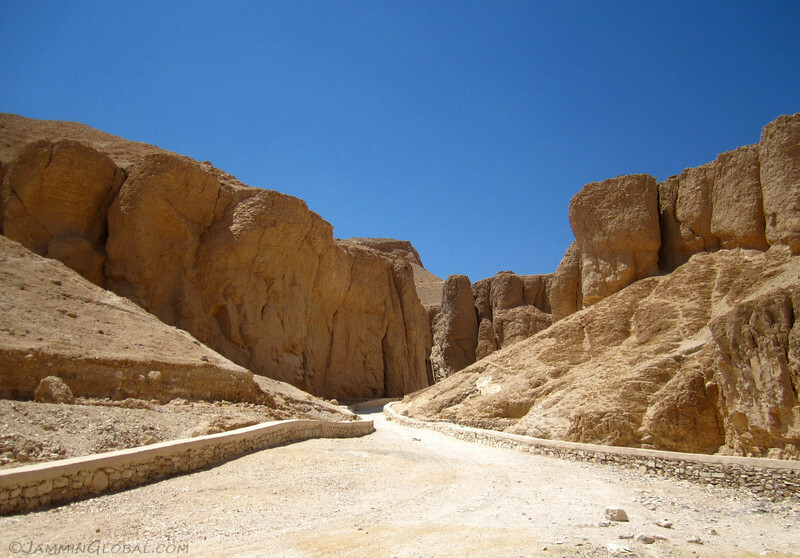 After the grand pyramid-building of the Old Kingdom of Egypt (2686 BC – 2181 BC), the New Kingdom (1600 BC – 1100 BC) decided to move their tombs underground and this valley, across from the ancient city of Thebes, housed most of its royalty in the afterlife. Tombs were discovered and pillaged throughout history with archaeologists conducting systematic excavations since the late 18th century onwards. 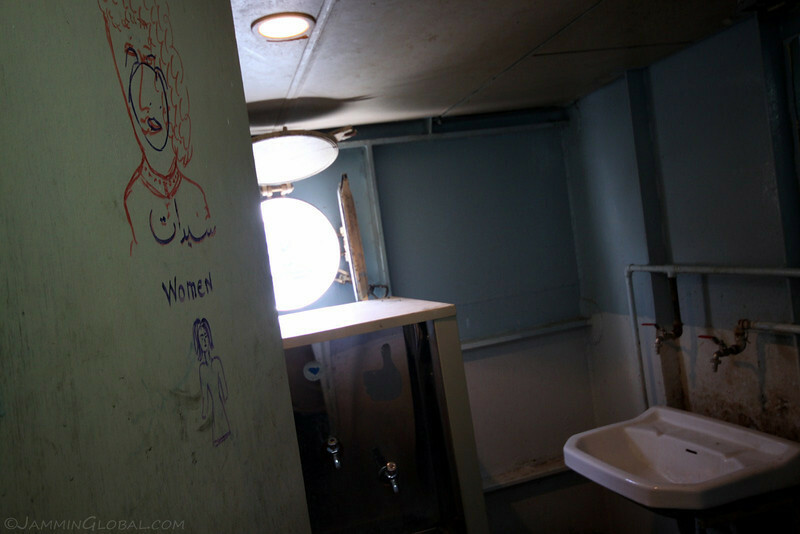 A total of 63 tombs have been revealed with many more yet to be discovered. Due to on-going archaeological work, only a few tombs are open for public visitation. A standard entry ticket allowed me to visit 3 tombs of my choice with an additional fee for special tombs, such as that of Tutankhamun. 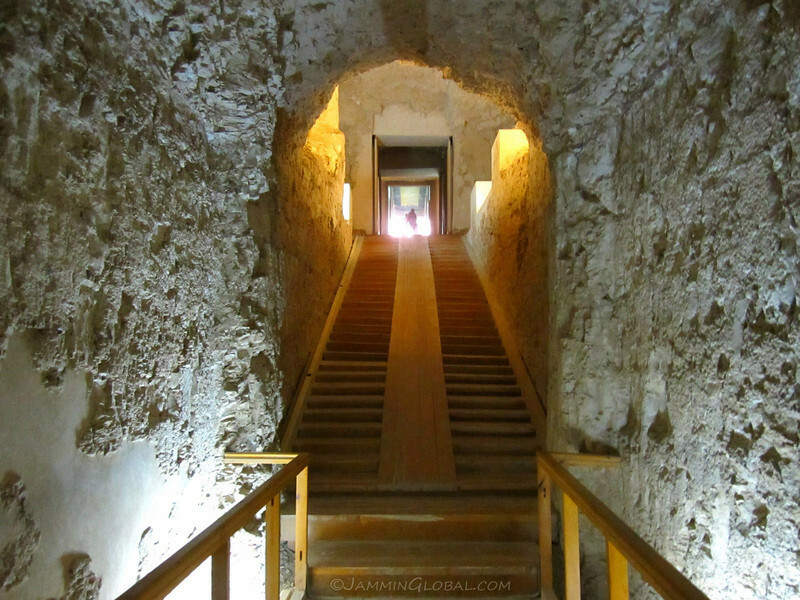 The tombs are cut down into the limestone cliffs, descending through a series of steps to the burial chamber. 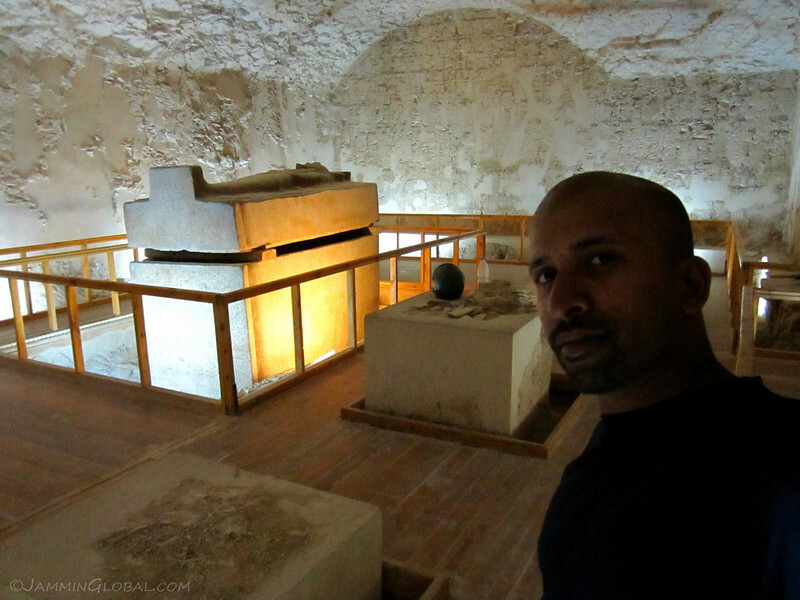 This is the tomb of Pharaoh Siptah (KV47) and it was much cooler here than the baking heat outside. The grand sarcophagus of Pharaoh Merenptah (KV8), who ruled from 1213 BC to 1203 BC. He was one of thirteen sons of Ramesses II. His burial chamber was the largest of the three that I visited and I wondered how long it took to carve these chambers. 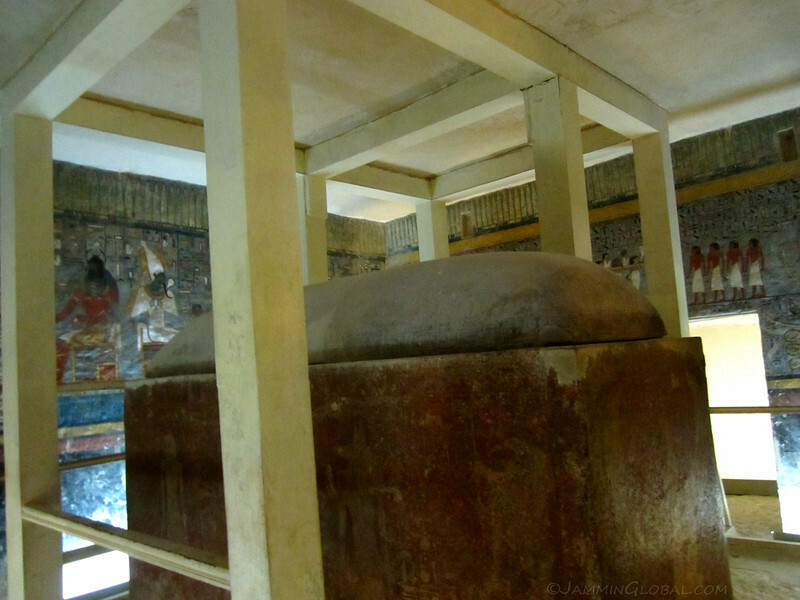 The red granite sarcophagus of Ramesses I. His burial chamber has suffered from water damage and these pillars have been added to bolster the chamber. At the foot of the sarcophagus is the depiction of Osiris (in white) and Khepris, who has a black scarab for a head, representing rebirth. The tomb of Ramesses I decorated with colorful murals with stories from the Book of Gates, a funerary text that narrates the journey of a newly deceased soul into the afterlife. 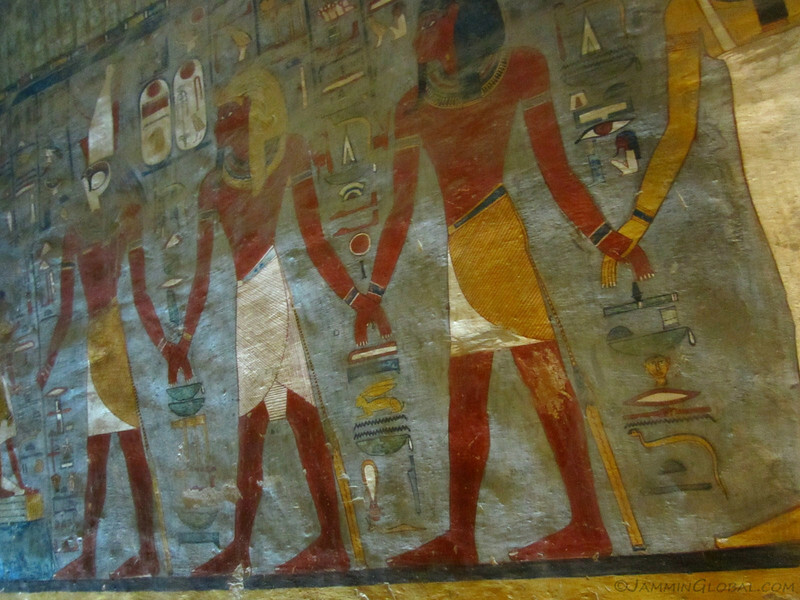 Here, the dead king is lead by Horus, Atum and Neith to Osiris. A niche in the burial chamber depicting Ramesses I in his Osiris form with a ram-headed version of Anubis supporting him as he stands on a wavy snake, confronting another snake, Meseret. 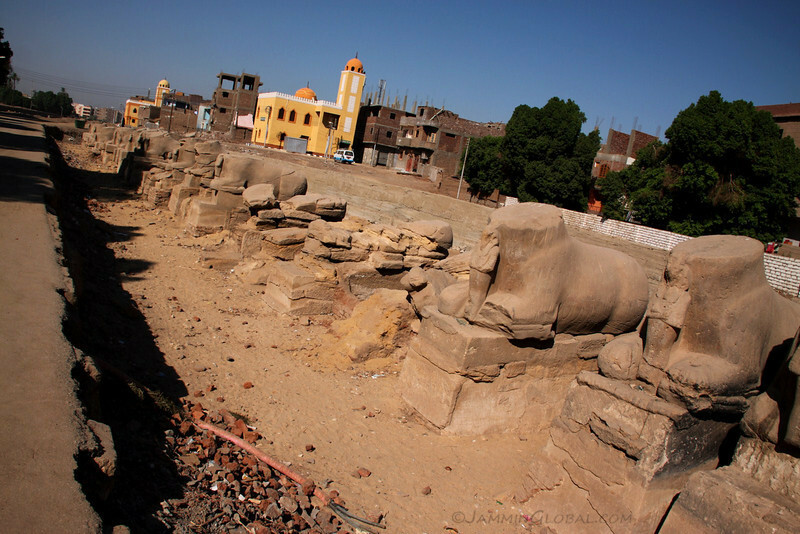 On the East Bank of the Nile in Luxor, I followed the line of uncovered sphinxes that starts at Luxor Temple and leads to Karnak Temple. 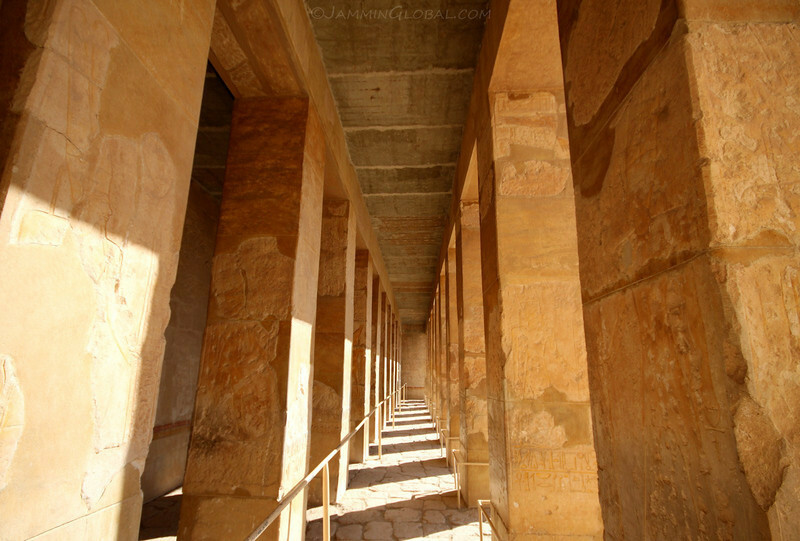 This Sphinx Alley connects the two grand temples and was used by the ancients for a yearly procession depicting the marriage of their prominent gods, Amun and Mut. Egyptologists guess that there were around 1,350 sphinxes lining this road, which is slowly being uncovered, but urban sprawl is in the way. 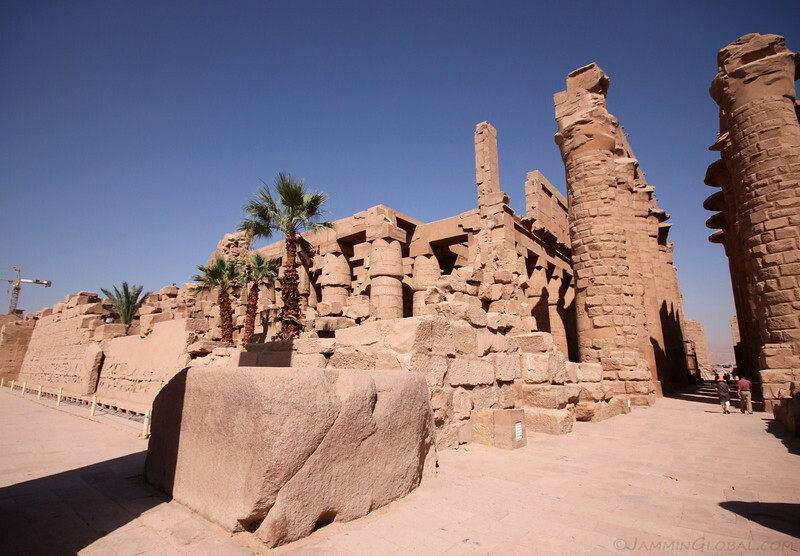 The Temple of Karnak, the holiest of religious places for Ancient Egypt. Construction began in the Middle Kingdom (2000 BC) and continued till the Ptolemaic period (300 BC). 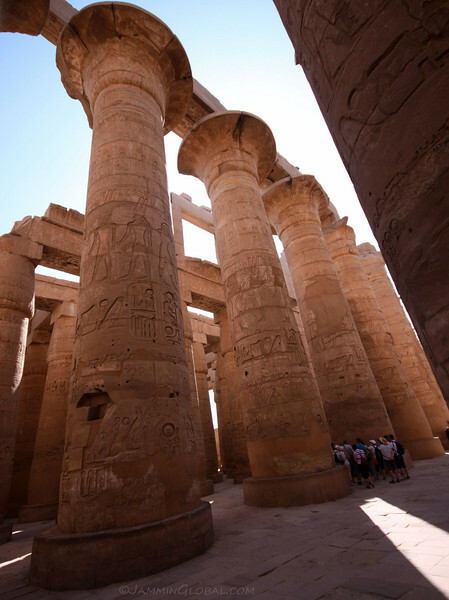 A processional way is lined by sphinxes that lead to the first pylon, resembling the design of Luxor Temple. Again, it looks like an obelisk is missing. 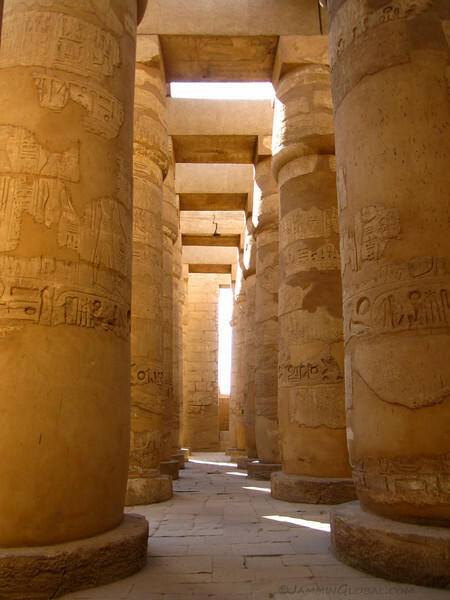 The grandest feature at the Karnak Temple Complex is the Great Hypostyle Hall. It’s a 5,000 sq-m (50,000 sq-ft) hall with 134 giant pillars, resembling a papyrus marsh. 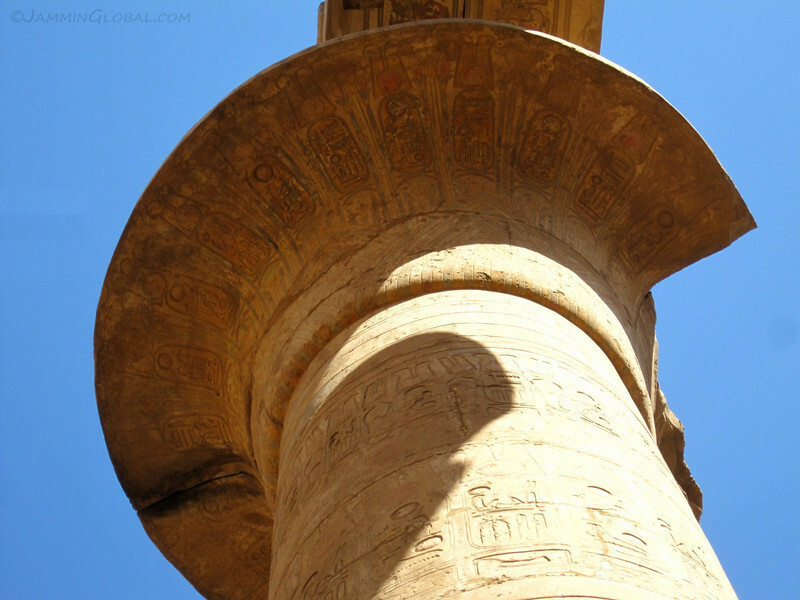 A close-up of one of the taller central pillars, resembling an open papyrus flower. The central 12 columns are higher than the rest at 21 m (69 ft) and have a girth of 10 m (33 ft). Flanking the 12 giant columns are the remaining 122 columns that feature a closed bud of a papyrus flower at their top. 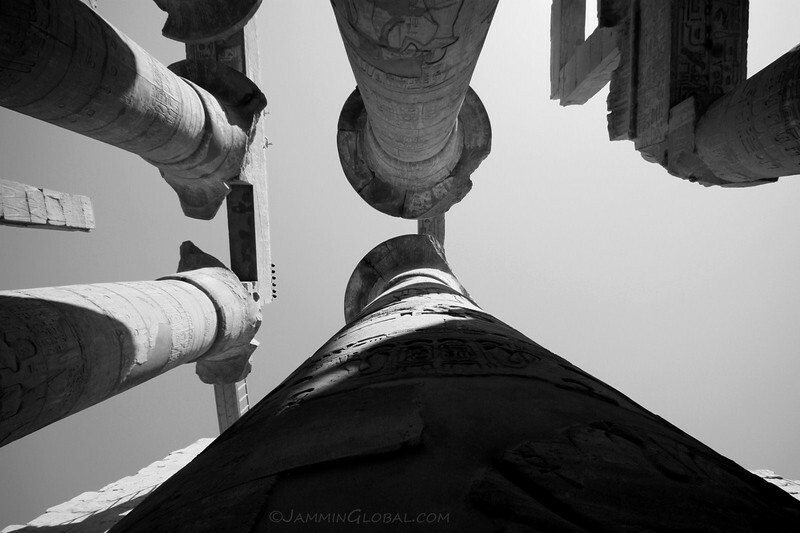 These 122 columns are 13 m (43 ft) high and 8.4 m (27.5 ft) around. 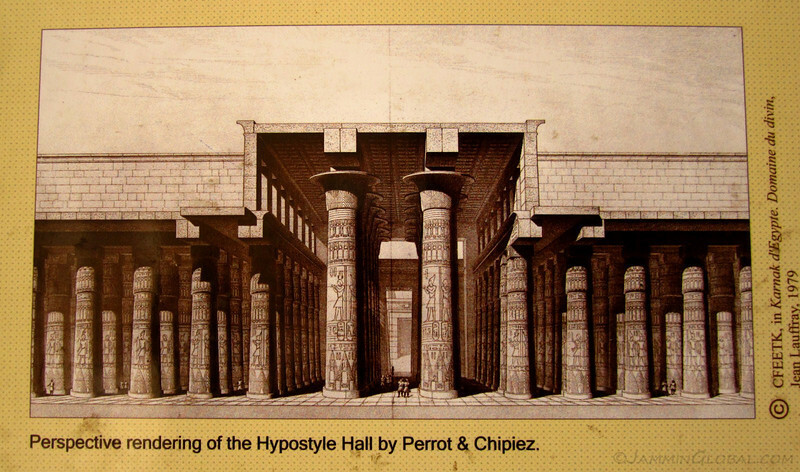 This is an artist’s rendition of what the Great Hypostyle Hall looked like in its hey-days. 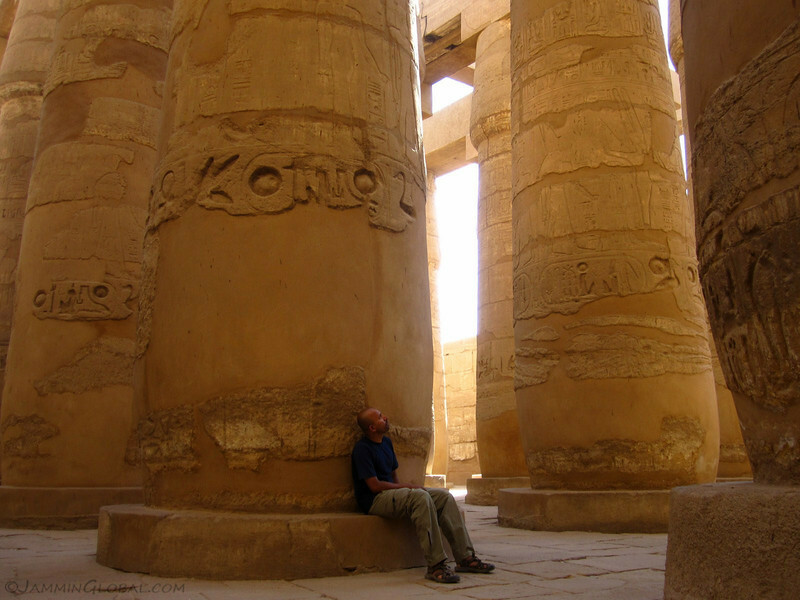 It was so peaceful to be among these giant columns, soaking in the grandeur of Ancient Egypt. 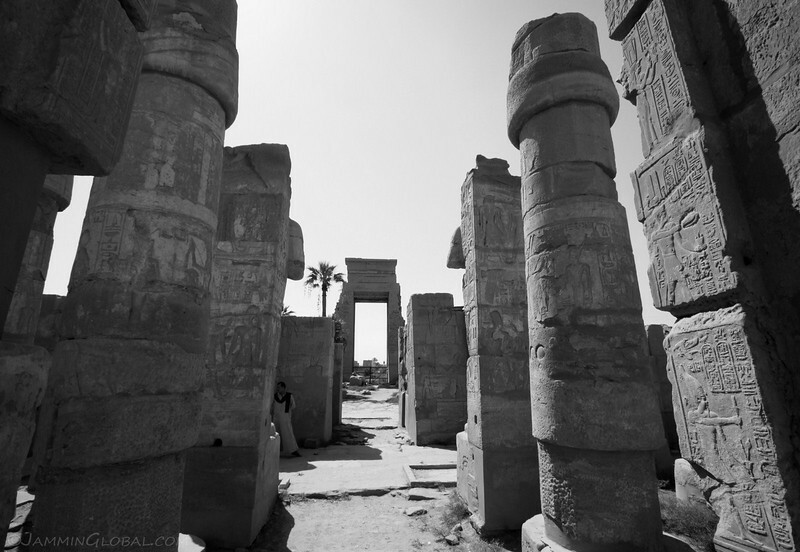 Walking deeper into Karnak Temple and appreciating the scale of things. From the Central Court looking out to the main temple complex with the prominent Obelisk of Thutmose I. 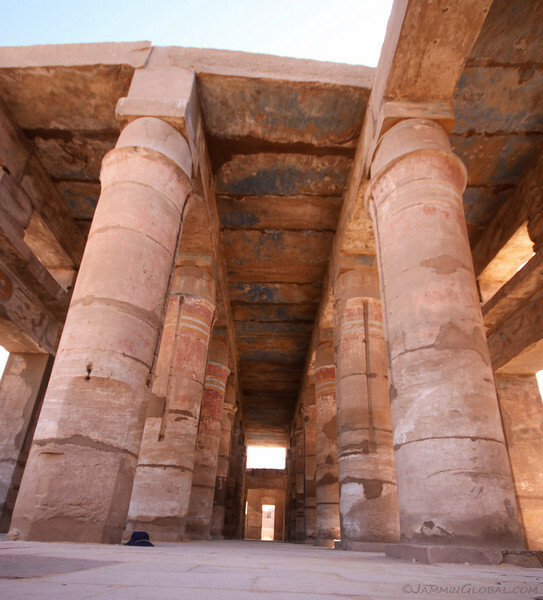 More giant pillars in the back, making up the Festival Hall of Thutmose III with colored decorations on the roof. Columns in the shape of bundled papyrus. A local guide, among the ruins of Karnak Temple. 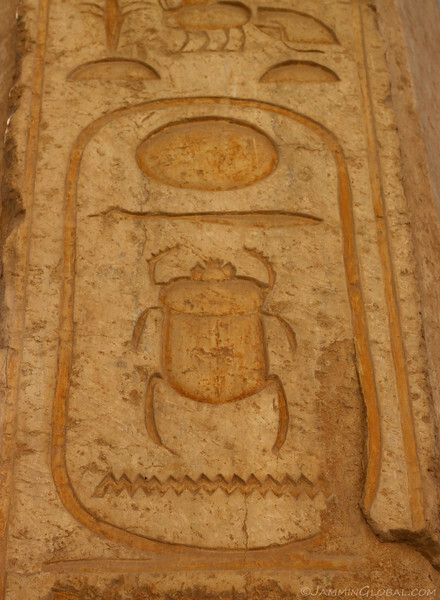 A cartouche with a scarab and the Obelisk of Thutmose I in the background, carved from a single shaft of red granite from Aswan. 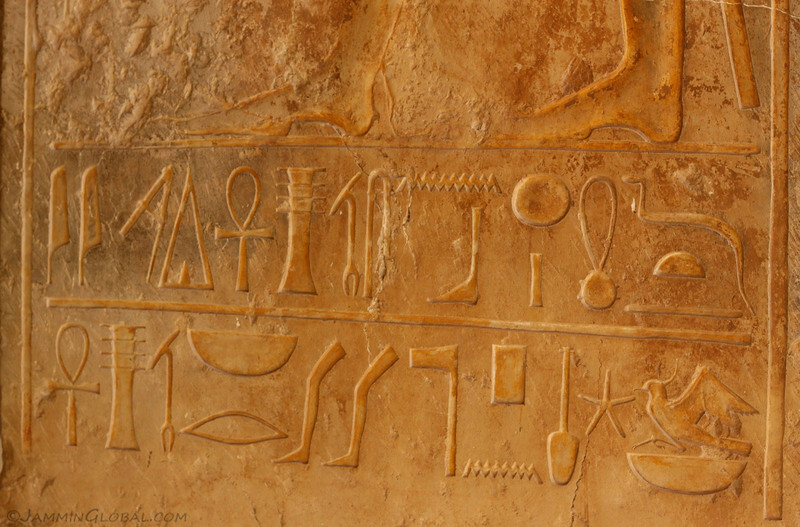 Hieroglyphs on the walls around Karnak Temple, telling stories of conquest and other tall tales that have survived through time. 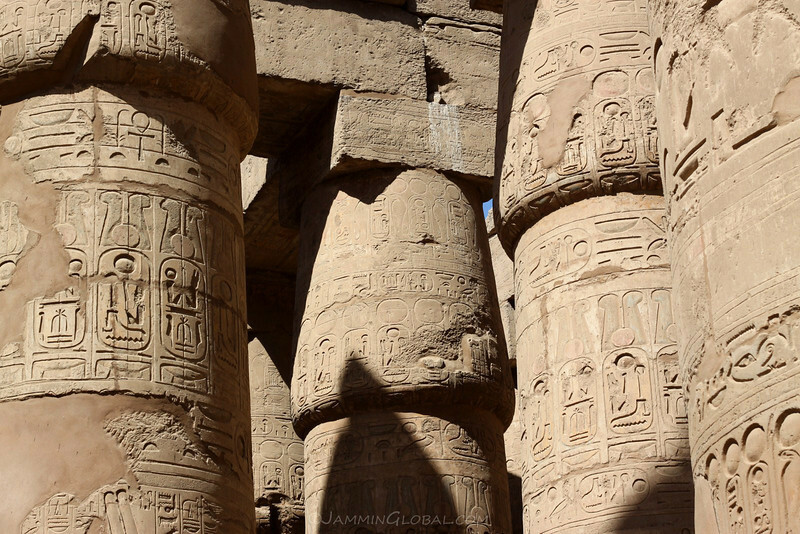 Cartouches and hieroglyphs decorating the closed-bud papyrus pillars of the Great Hypostyle Hall. 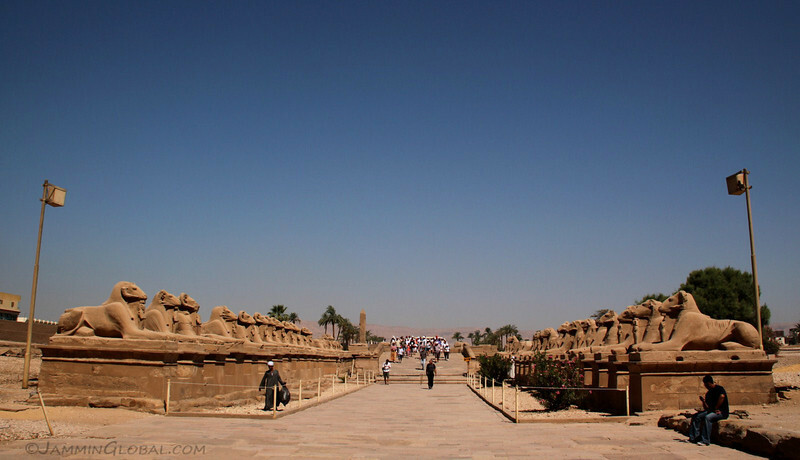 A parting shot of Karnak and Luxor: the processional way, lined with sphinxes. I was grateful for the chance to see these grand monuments from our past that have survived these thousands of years. It astonishes me how grand the ideas and buildings were that were conjured up by ancient rulers, that too, most of the time for their own vanity or religious purposes. After my visit in Kharga, I had one last section of the Oasis Route through the desert to cover before coming back to the Nile in Luxor. 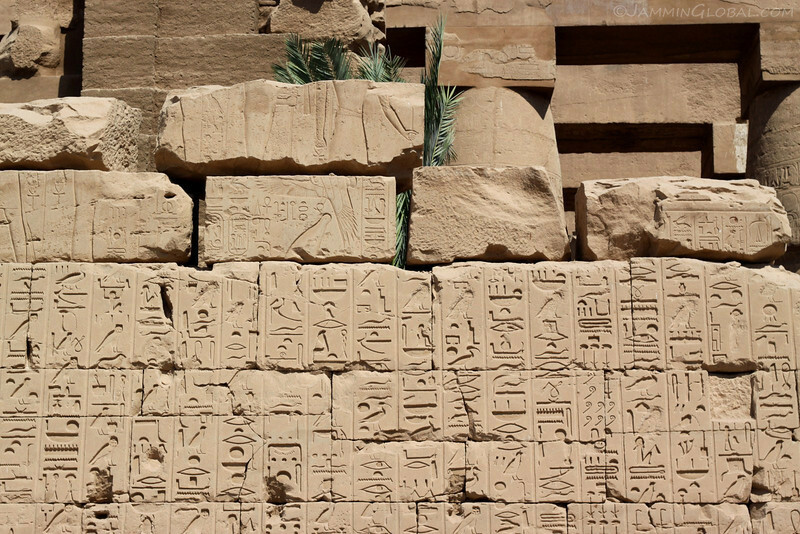 The city is famous for its Ancient Egyptian wonders on display, but that’s for the next segment. 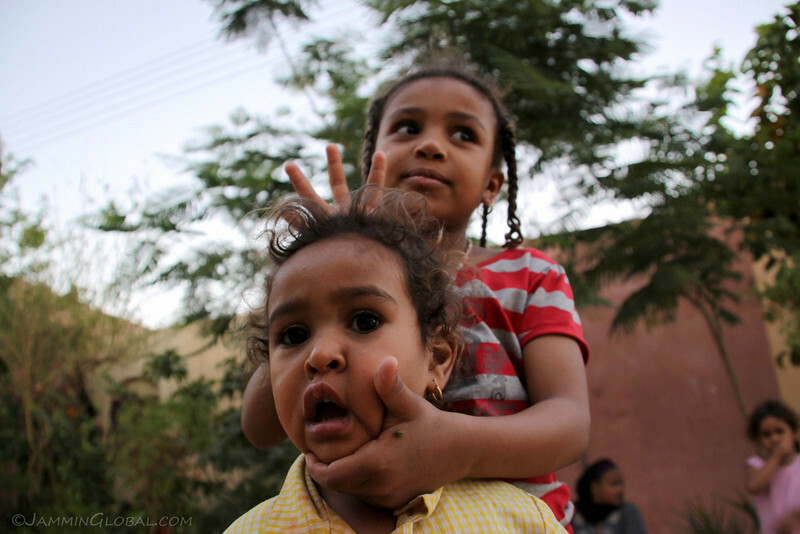 This photostory documents my time spent with Ernesto, my CouchSurfing host in Luxor, who has a colorful look and life. 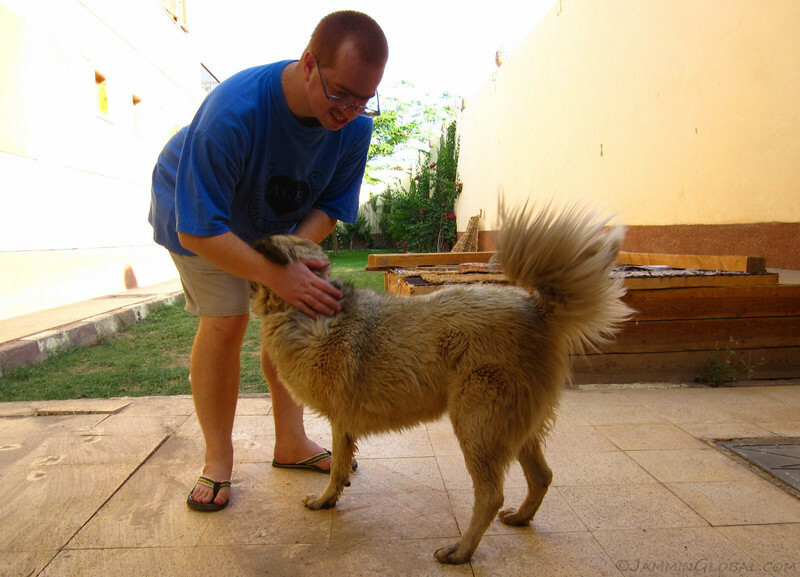 He’s got orange hair, is from Uruguay, lives with a local Egyptian family in New Qurna and volunteers at an animal shelter. 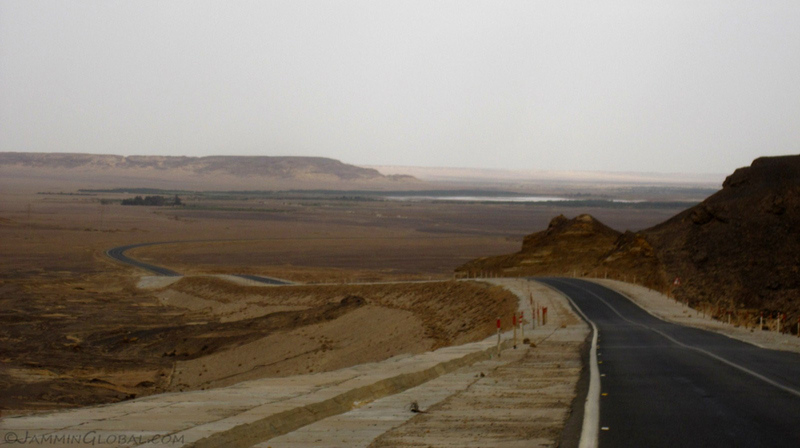 Riding the last section of the Oasis Route across the desert and into Luxor. By 9 am, the heat was kicking in. A signpost in the desert. 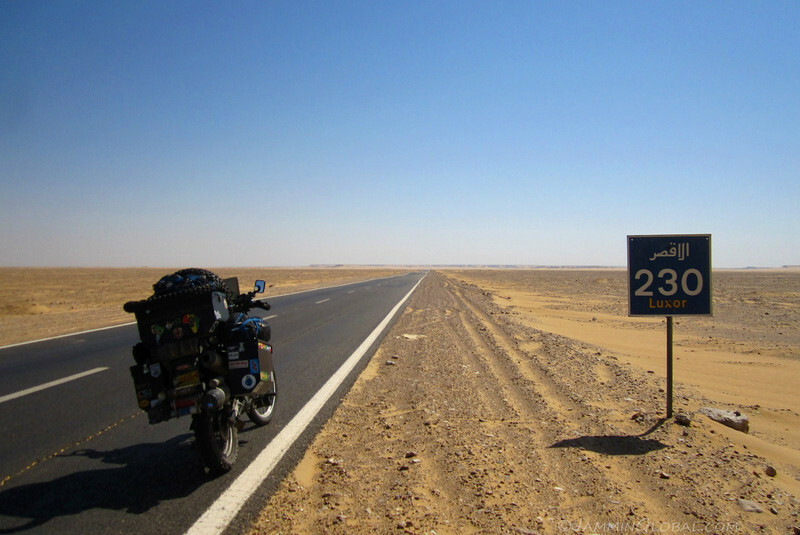 230 kms (143 mi) to Luxor. Oops, wrong direction. 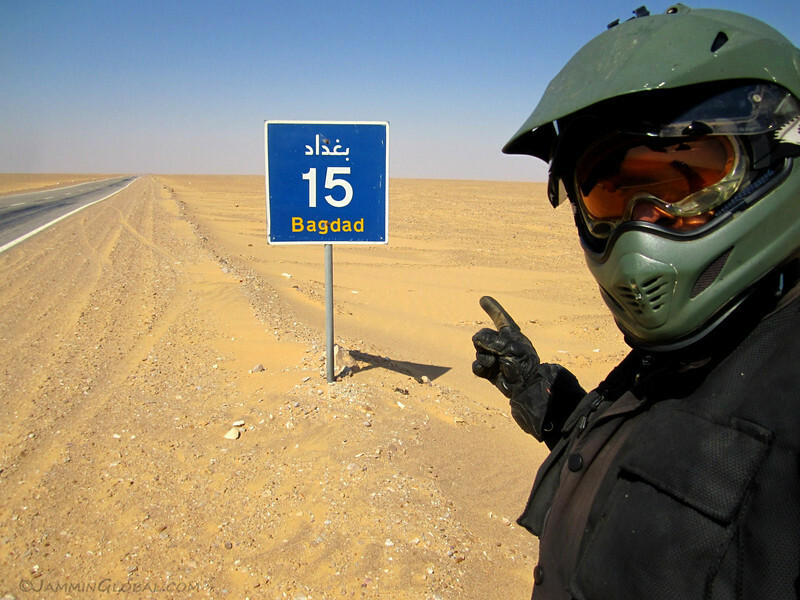 Just like there’s a town in Texas called Paris, there’s a town called Bagdad in Egypt. I also saw a sign for Paris a few miles back. 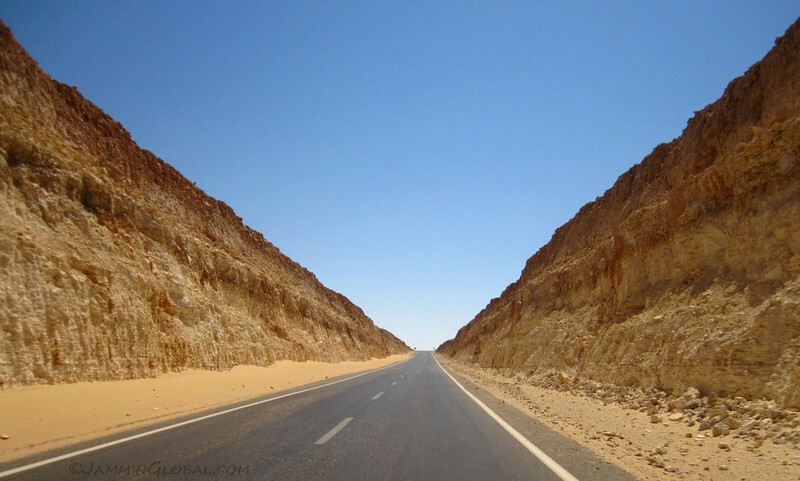 The road being cut into the top of this ridge in the desert. Elevation peaked at 530 m (1,740 ft). It wasn’t any cooler up here, but I knew I would be gratified the further south I went, as the cool highlands of Ethiopia beckoned. The desert, slowly reclaiming its land. When the humans aren’t looking, the sand grains drift across and only when it becomes impassable does the sand get pushed back. sanDRina enjoying the desert cruise. 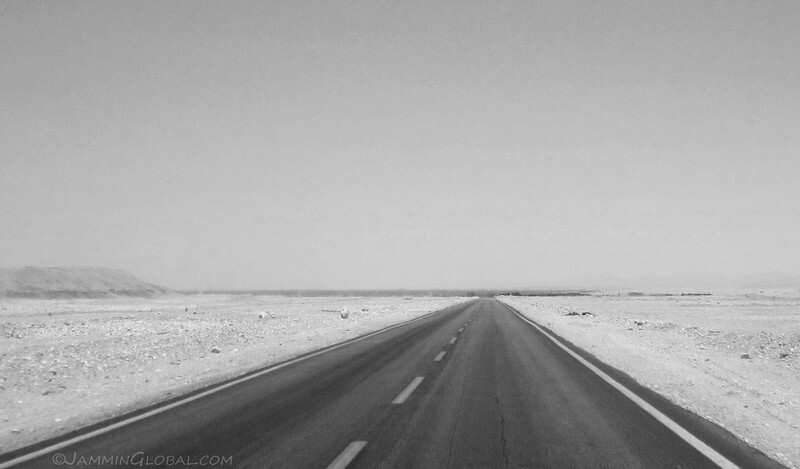 The smooth, flat roads gave for a high fuel efficiency. I was getting around 25 km/L (59 mpg). I took some leftover curry that I made from the night before and was taking a few bites at every break. I lost my nice military surplus cloth hat in Cairo and had to replace it with a tourist sun hat. Battling the sun is serious business here and I was drinking a liter of water an hour. There was a lot of flat, straight riding, but some sweet curves around hills. 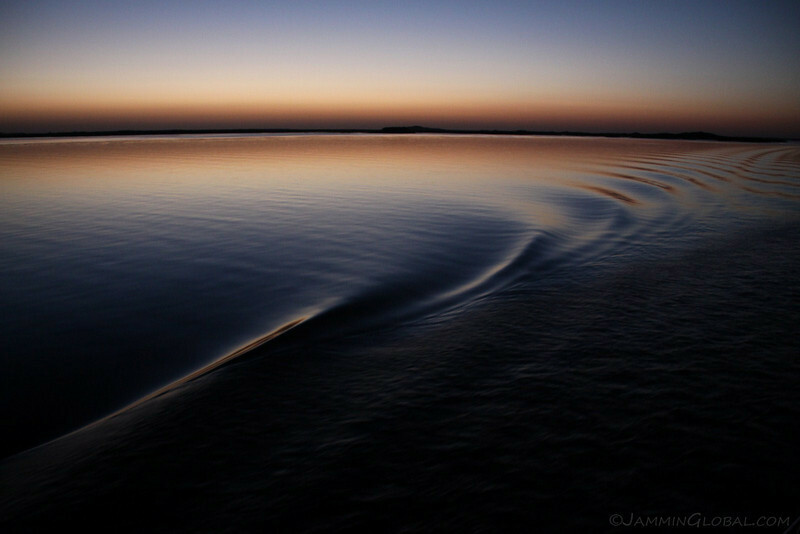 That S-shape to a curve allows for that most sought-after feeling to be felt, namely, g-forces. I lean left, hanging a bit off the seat into the corner as the front tire countersteers by pointing away from the corner. Then, I shift my body weight to the other side, leaning right and the front tire does its dance of countersteer by pointing the other way. My DR doesn’t produce as much g-forces as I’d like with 33 hp, but g-forces they are. 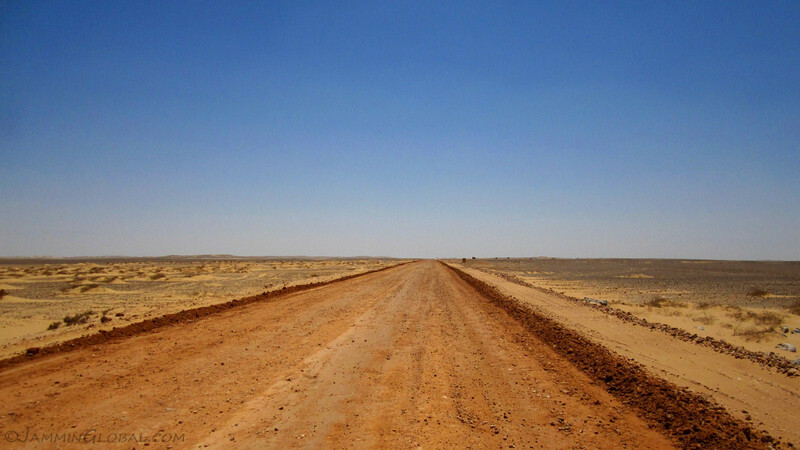 The road was under construction in places, looking like how it looked only a few years back along its whole length. A tarmac road makes for a relatively easy journey and there’s something to be enjoyed about being smooth through the corners. On the other hand, an unpaved road requires finesse over a loose surface; dancing with the tires. 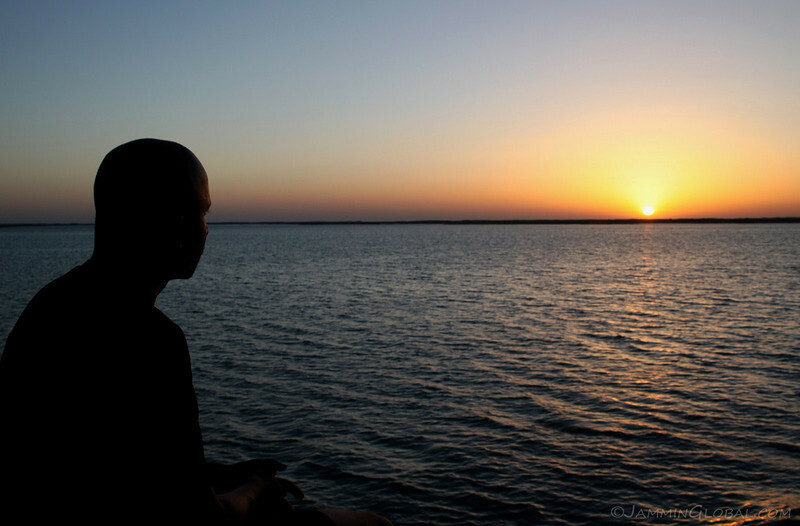 Just past noon, I could start making out a dark smudge on the horizon, growing into a sliver, until at last I could see the trees and greenery fed by the Nile River. 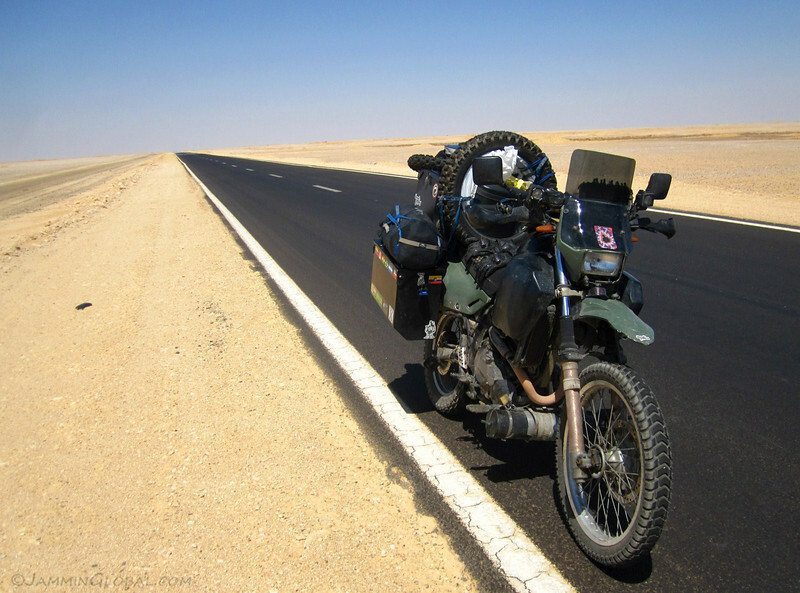 That brought an end to desert riding, for now. Riding a canal on the west side of the Nile, heading into Luxor. 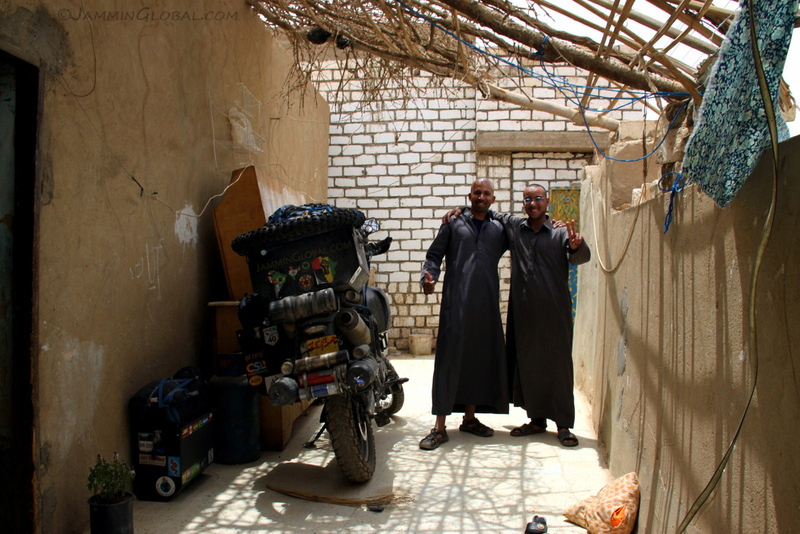 I stayed with Ernesto through CouchSurfing for a few days near Luxor. He’s a wonderful character. Firstly, his orange hair stands out. Then his story is really interesting: he’s from Uruguay, now living behind the Egyptian family that’s taken him in. 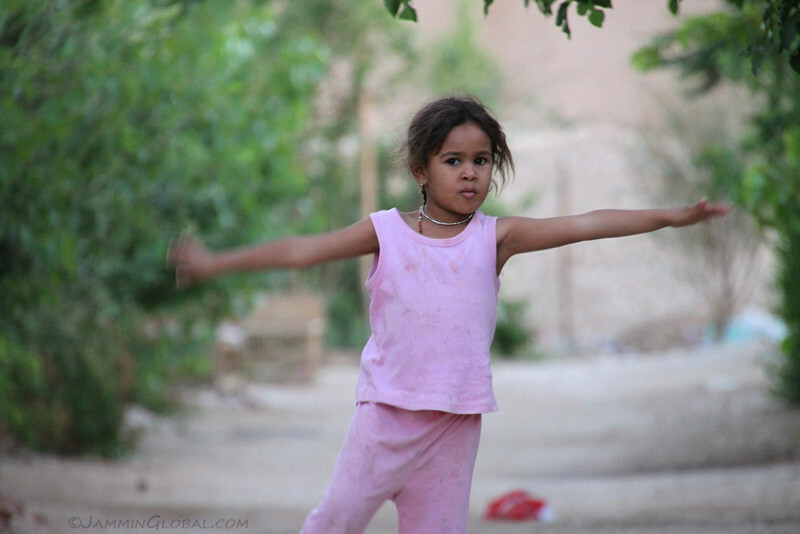 They are people of Qurna, who lived on top of the tombs of the Valley of the Kings until the government moved them to a new housing project, New Qurna. 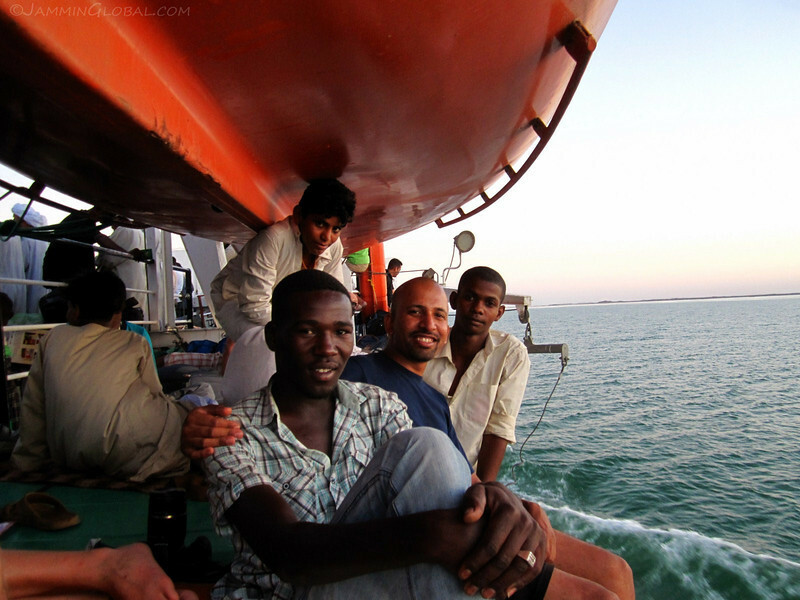 Ernesto had a contact with them and came back to stay and work. He’s a website designer with clients mainly in Spain. 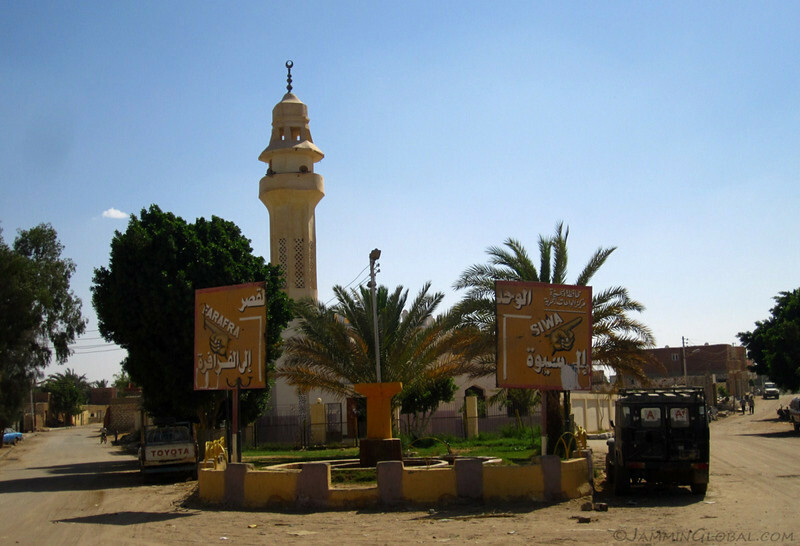 New Qurna, on the northern edge of Luxor. 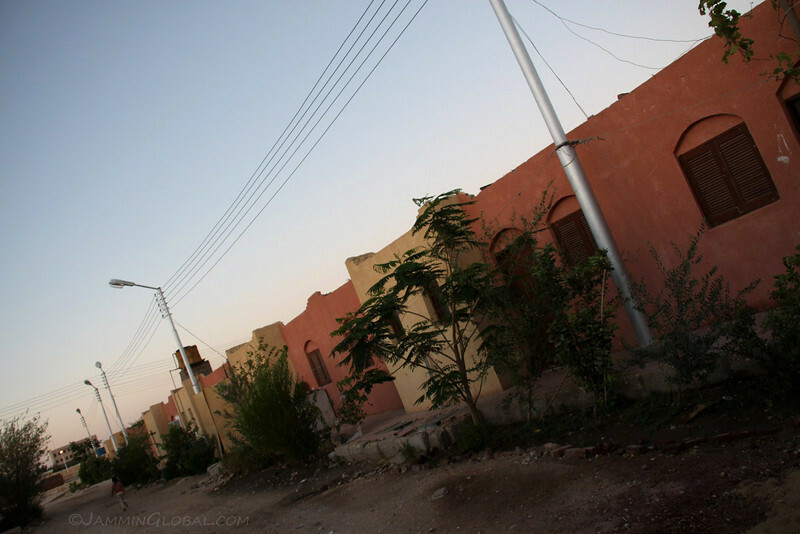 This village was built in the 1950s by renowned Egyptian architect, Hassan Fathy to house the people who were living in the old village of Qurna that was situated on top of tombs from antiquity. 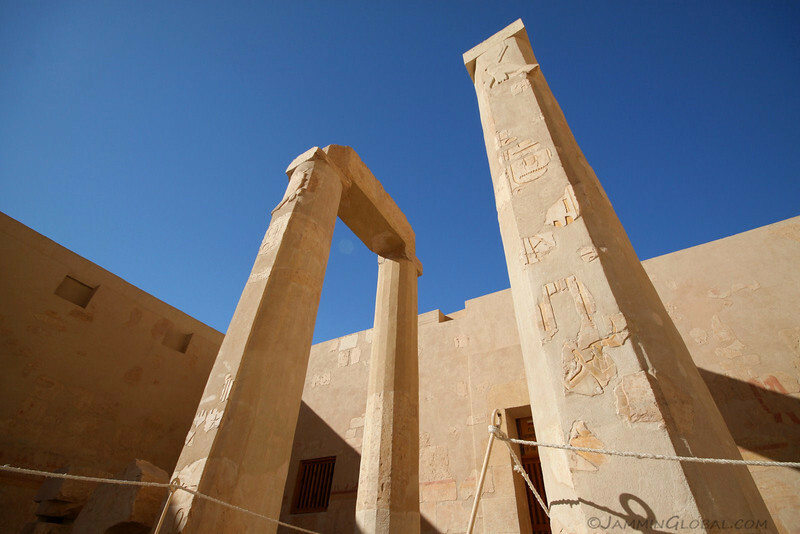 The government, namely the Antiquities department, forcibly moved the people from Qurna in the name of protecting Ancient Egyptian artifacts, such as the tombs that were yet to be excavated and the treasures within them. The people of Qurna settled on the tombs in the late 19th century and slowly began to pilfer them and sell antiquities to foreigners in Cairo to make a living. It was a sensitive issue to move them but the claim of protecting cultural heritage seems valid. Their new living area was designed with local and modern features, such as natural cooling with domed ceilings and street lights. Staying here for three days, I heard many stories from Ernesto’s local family and friends. 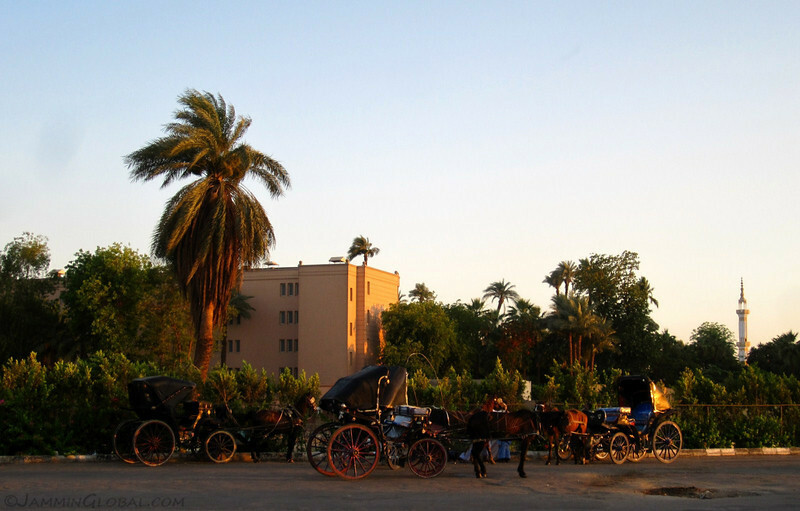 I had come to Luxor to soak in the concentration of Ancient Egypt’s wonders. The wonderful thing about CouchSurfing is that Ernesto is an Egyptology student and had tones of information on what to see and what was worth seeing. 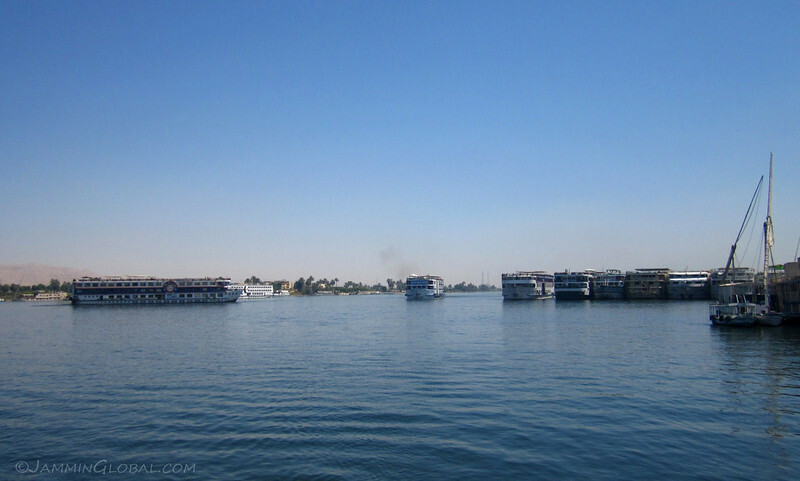 We crossed over to the east side of the Nile, where the town proper of Luxor is. Looking back west at the Valley of the Kings just after sunset. In those valleys, now lit up, lie the tombs of many Pharaohs. 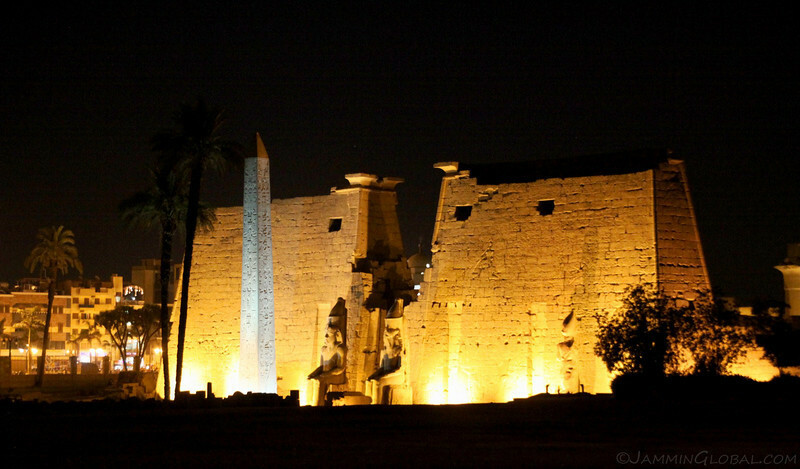 The entrance to Luxor Temple, right in the heart of the modern town. 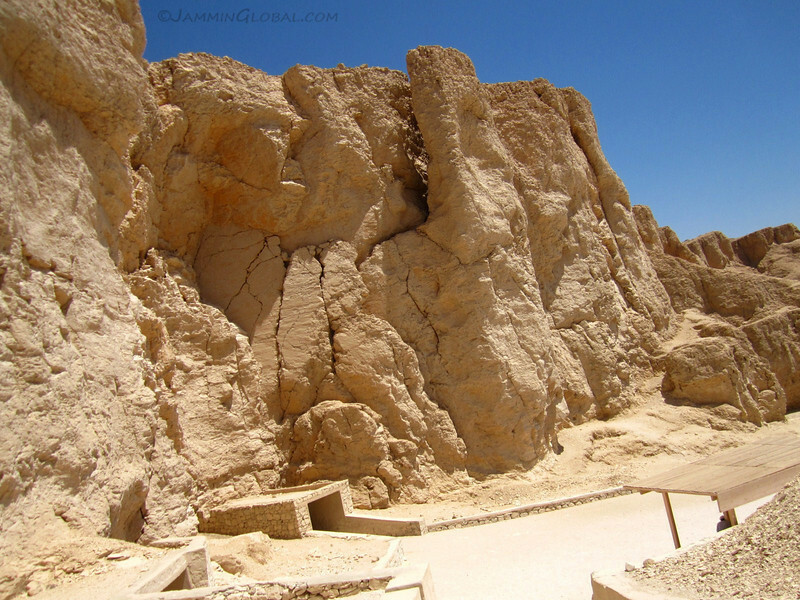 It was built around 1,400 BC and various Pharaohs added to the complex. 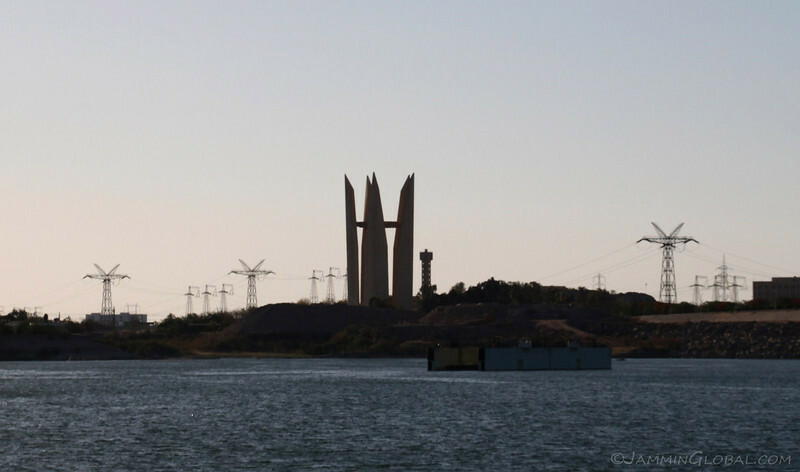 This grand pylon was built by Rameses II and there are supposed to be two, giant, red granite obelisks at the front. The other obelisk happens to be in Paris, at the center of the Place de la Concorde. It was given to France in 1829 by the rulers of Egypt at the time, the Ottomans. These short-term rulers of this long-lasting civilization felt they had the right to disperse its treasures for their favor. Just behind the grand temple was a busy street with this guy frying up some fresh falafel. Since I would be visiting quite a few tourist sites in the next few days, I went and got an ISIC card (International Student Card) that gave me 50% off from the entrance fees. The LE 105 ($19) price for the card paid for itself before I left Luxor and I knew I would use it again further south. 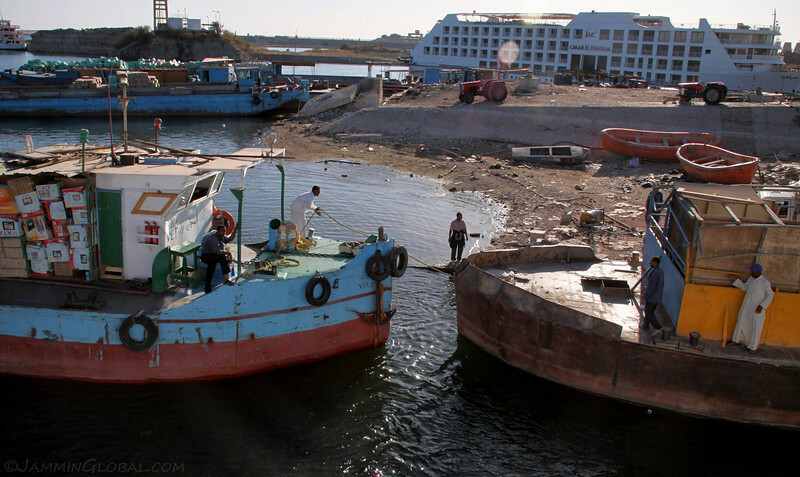 River boats parked up in Luxor, instead of cruising the Nile to Aswan. 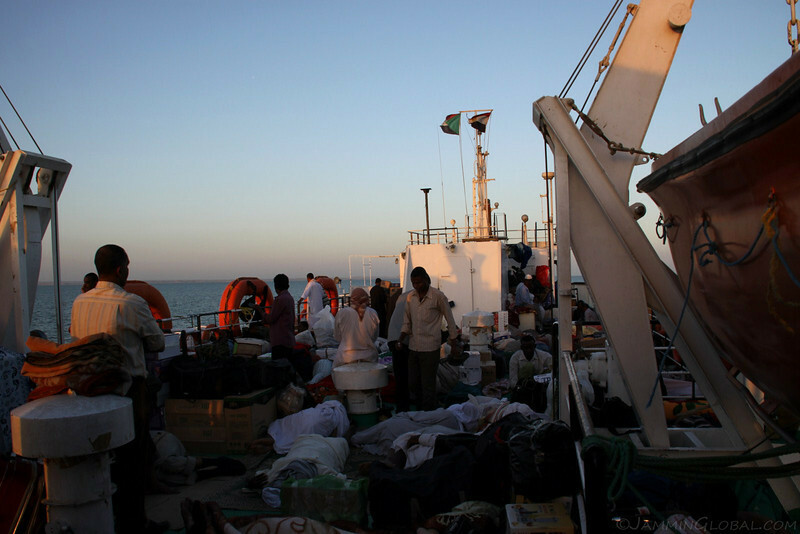 The reduction in tourist numbers after the revolution had badly affected many businesses that rely solely on foreigners to sustain their livelihoods. Ernesto invited me to come along and see this animal shelter that he volunteers at. 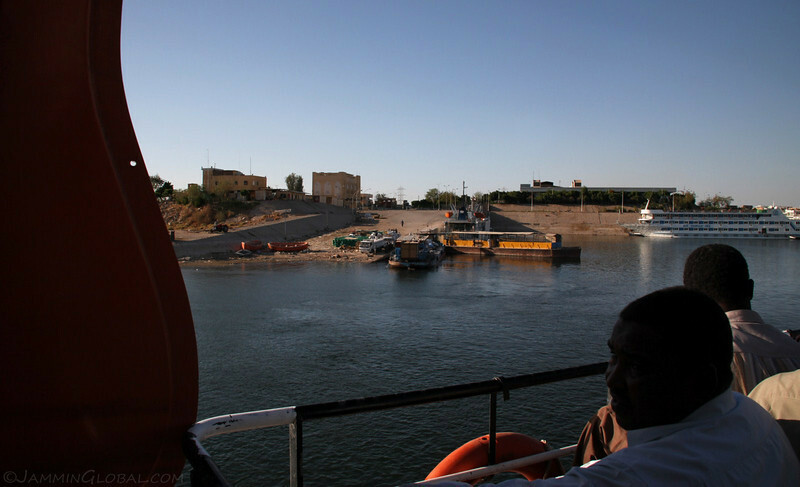 We crossed the Nile using the local ferry, which costs LE 0.25 (5¢) for locals and the usual separate pricing for foreigners of LE 1 (18¢). The monetary difference is not an issue, but the government notice at the ticket office that foreigners pay four times the cost bothers me. But this happens everywhere. In India, I remember seeing a temple entrance notice that locals pay 10 Rupees (20¢), while foreigners pay $10, which is 50 times the difference! 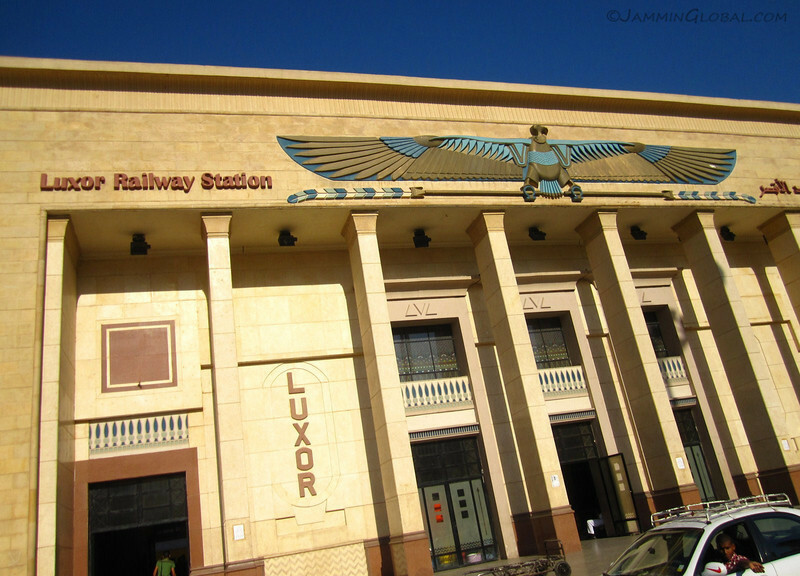 We walked through town and then through the Luxor Railway Station to cross the railroad tracks to get to the other side. 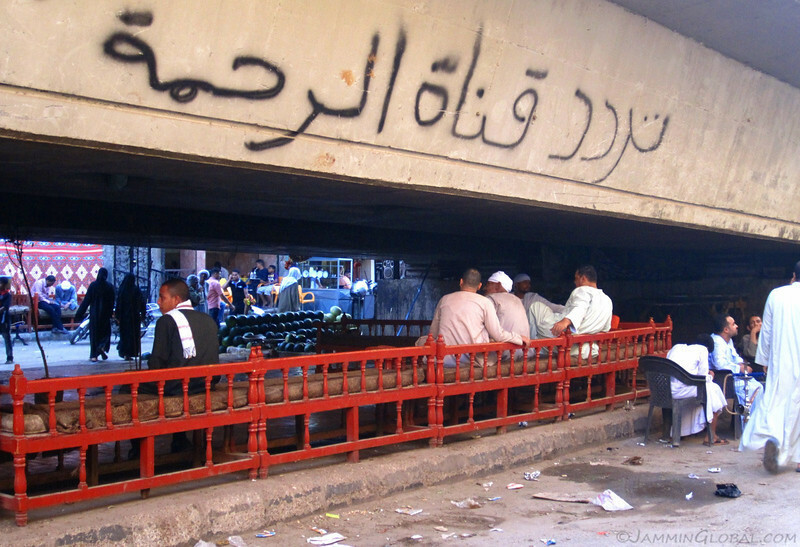 Behind the railway station was a part of the city that’s not on the tourist trail of Luxor. A cozy, outdoor cafe under a highway flyover, featuring low ceilings, dim lighting and an excellent vantage point for people-watching. 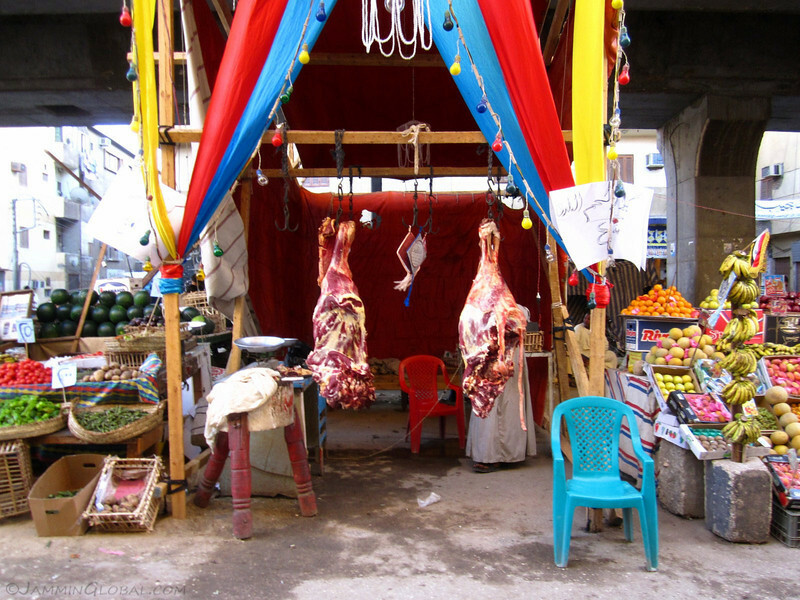 Open-air butchery, sandwiched by fruit and vegetable stands. 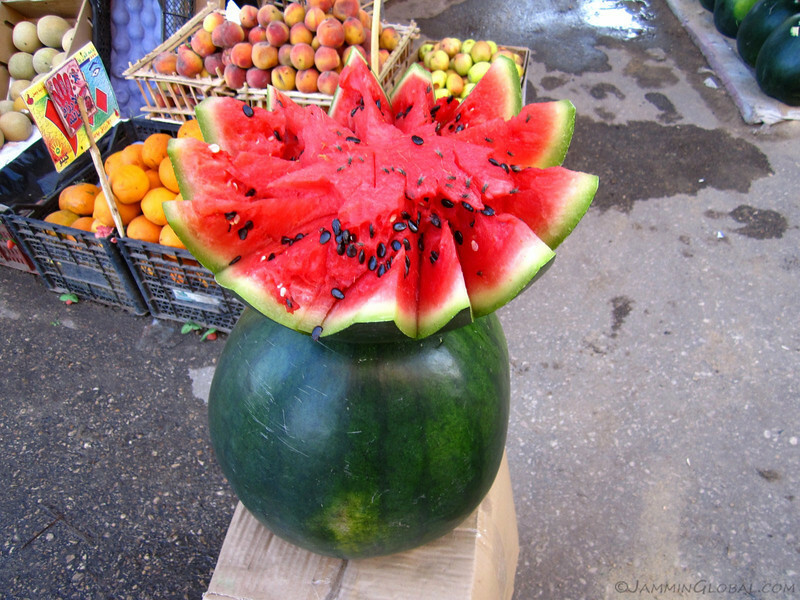 Delicious-looking watermelon, grown on the fertile banks of the Nile. 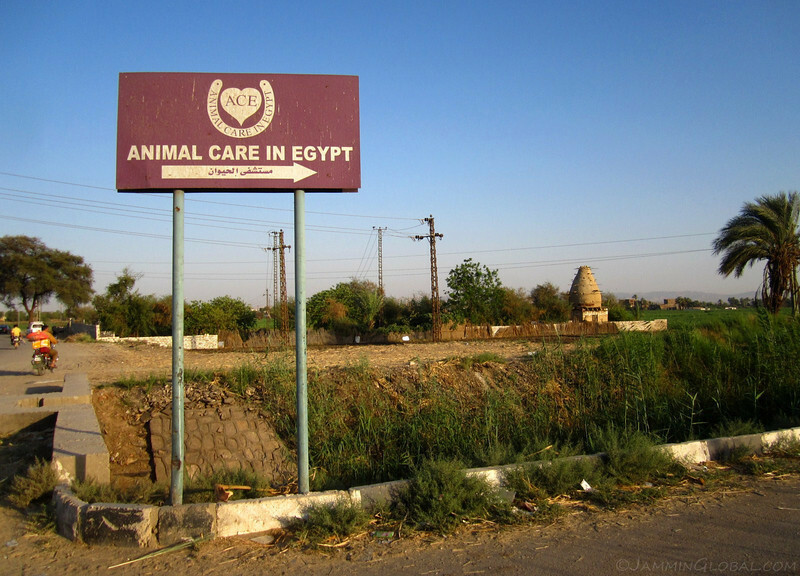 On the eastern edge of Luxor lies the Animal Care in Egypt center. A baby, black panther and a domestic house cat at the animal shelter. 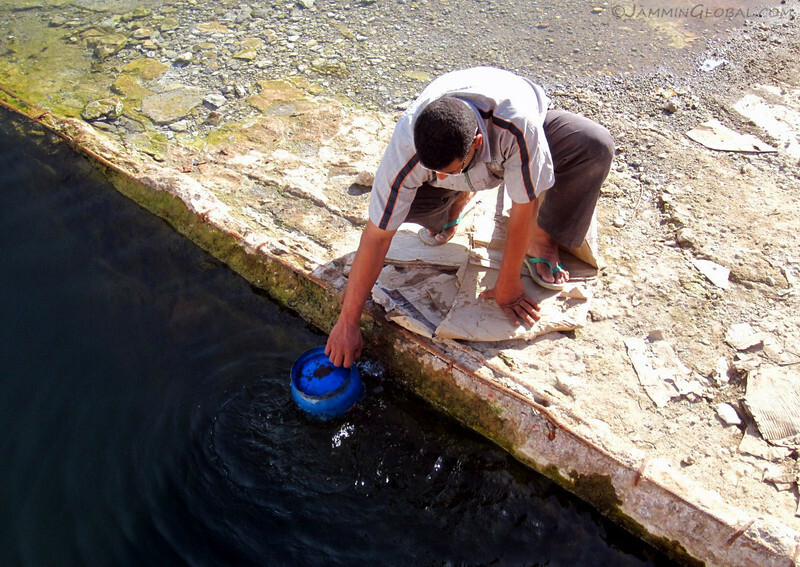 Ernesto said an expat Brit, living in Luxor, recently died and left a hefty sum for the shelter, which was doing its part in taking in sick and abandoned animals. 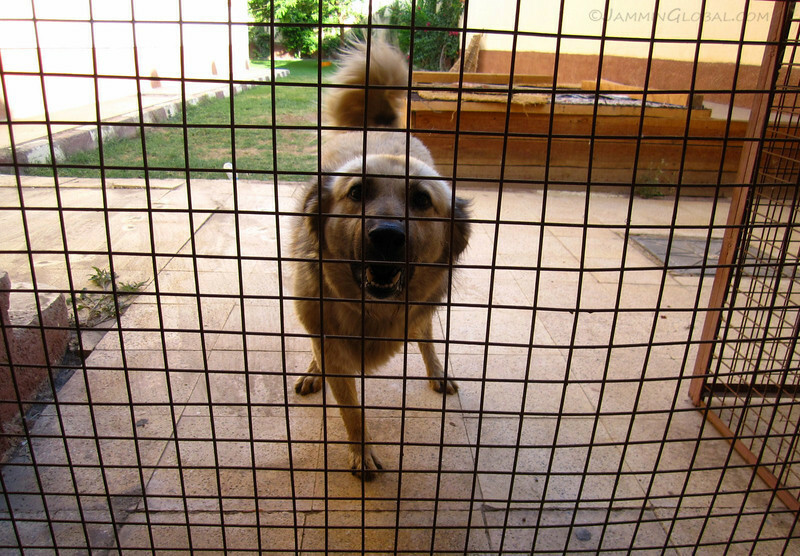 A fierce, three-legged dog at the shelter. But he was putty in Ernesto’s hands. 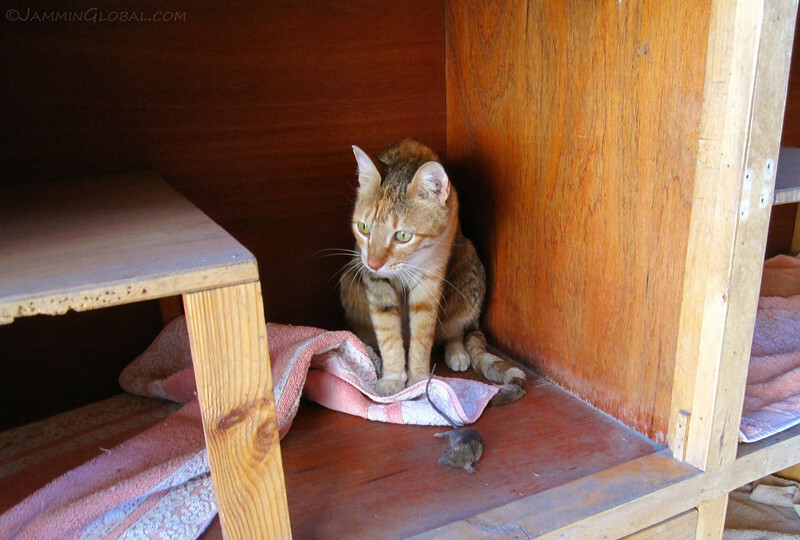 A shelter cat showing off its catch. Its lion cousins would be proud. 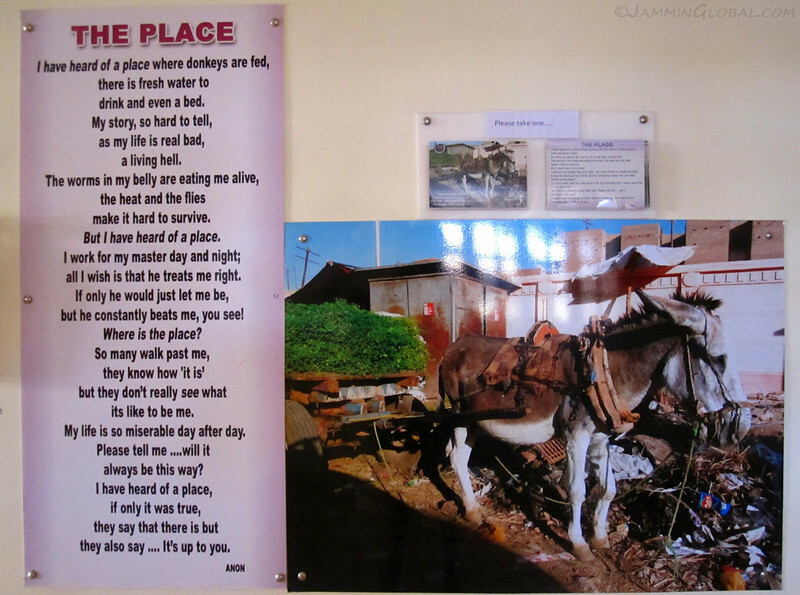 Besides unwanted cats and dogs, the shelter was primarily focused on taking in sick and abused donkeys and horses. 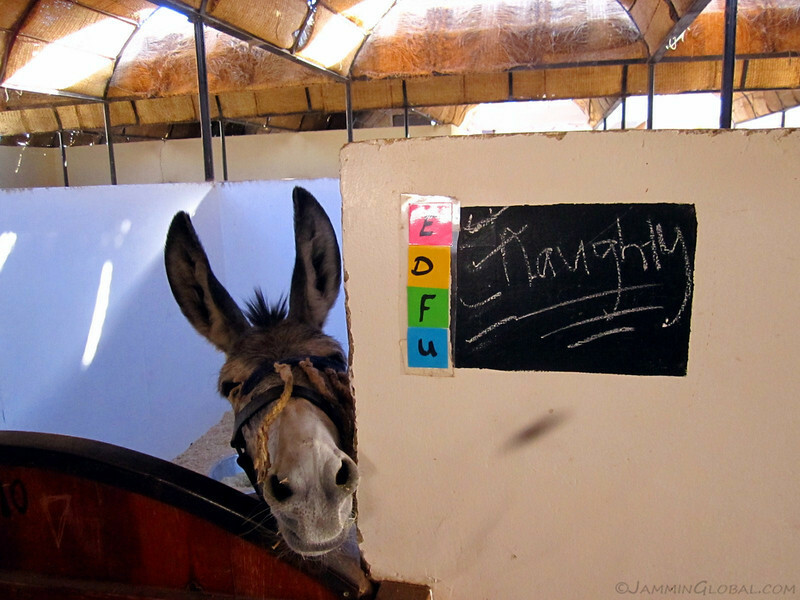 Donkeys are used extensively in Egypt and other countries in the region for hauling heavy goods. 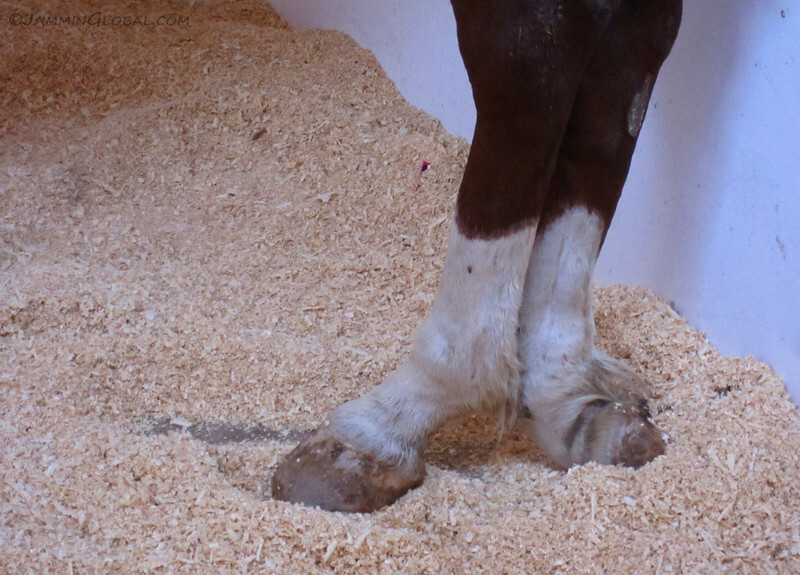 Horses are used for drawing carriages and sadly, their owners don’t pay enough attention to the health of their animals and usually over-work them in an abusive manner. 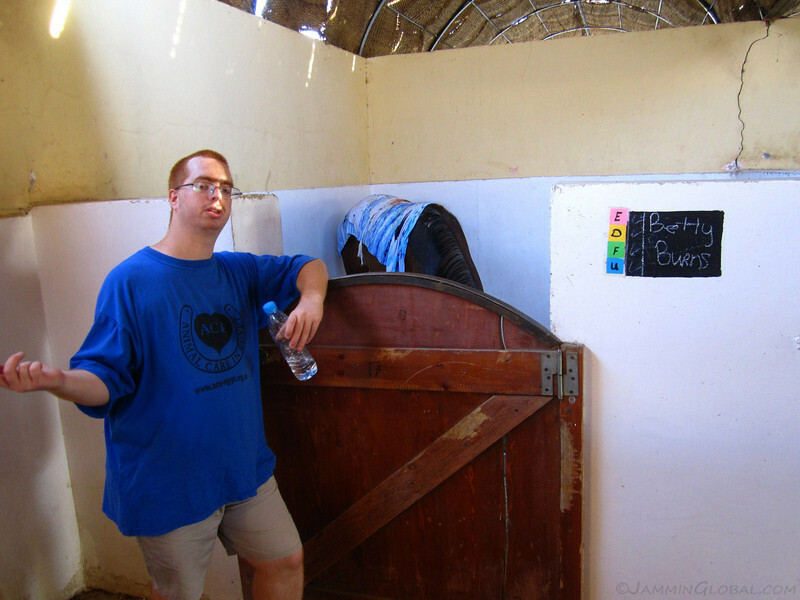 Ernesto’s been volunteering at the center since he’s been in Egypt and he puts in a few hours every few days. 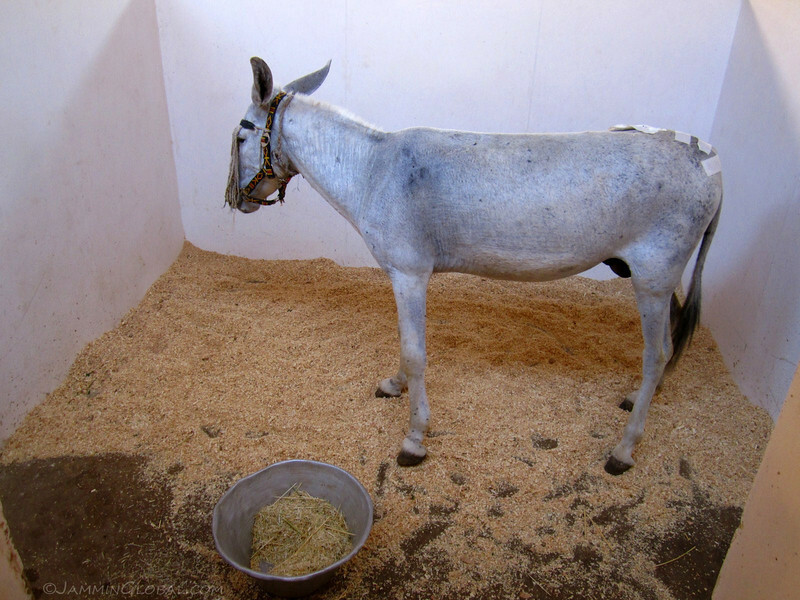 He explained that the center offers free medical care for local donkeys and horses, yet their owners only bring them in when their animal’s maladies are quite extreme, leading to longer recovery periods. 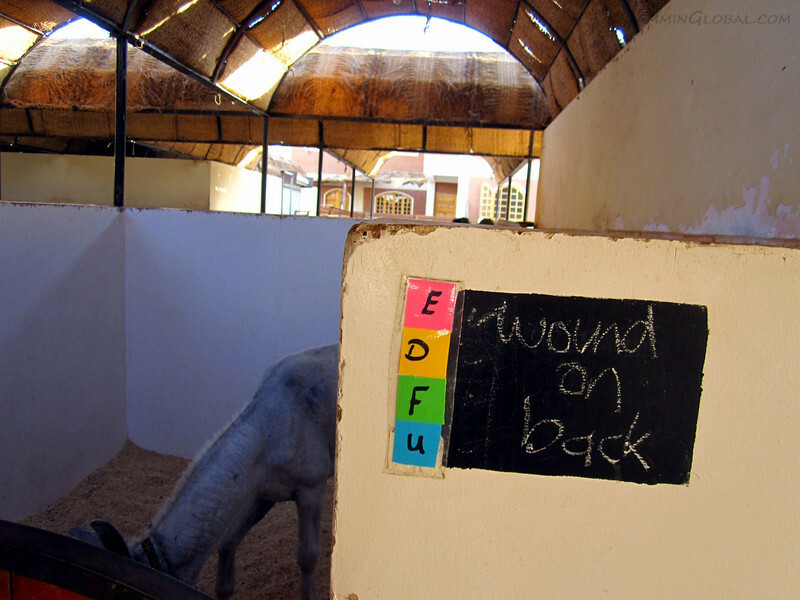 A sign outside each stable described the injury or reason for admittance. This donkey had a wound on its back, probably from repetitive beatings from its master’s whip. 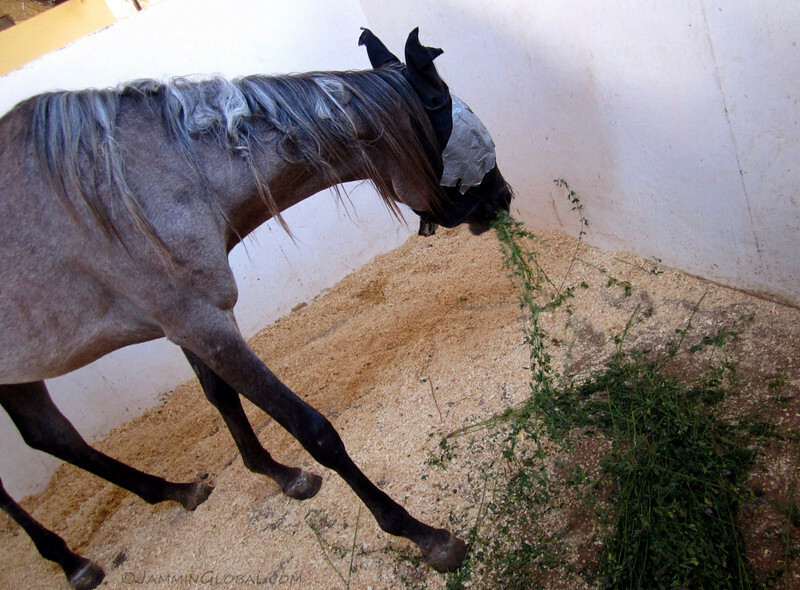 A beautiful horse eating some fresh alfalfa. Their eyes are covered to reduce their stress to these surroundings and strangers. Ouch, a twisted foot. That’s probably the end of its working days. A baby colt sharing the stable of its mother, suffering from a tumor. 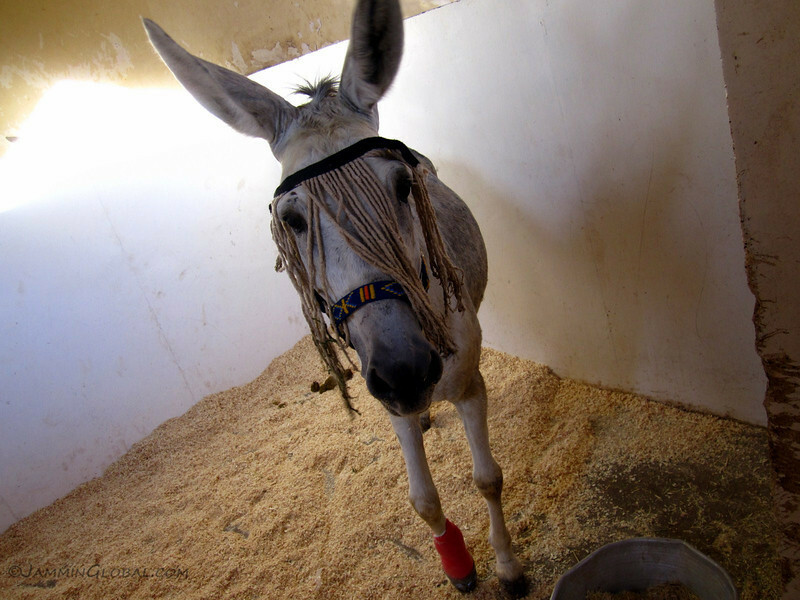 A donkey with dreads recovering from a broken foot. He’s sporting some style there. 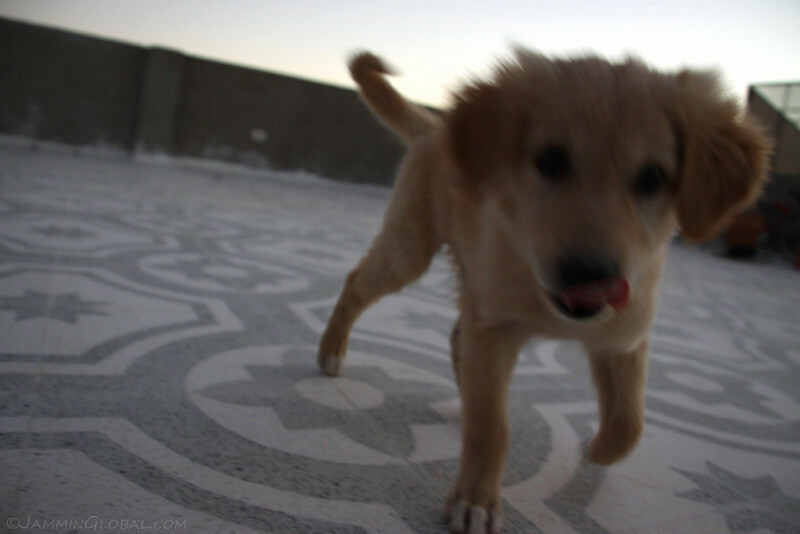 Before leaving the shelter, Ernesto played with the dogs some more. He was short one leg but not short in his doggy-ness. Calèches, horse-drawn carriages, waiting for the elusive tourists to spend money on them and their poorly-treated horses. 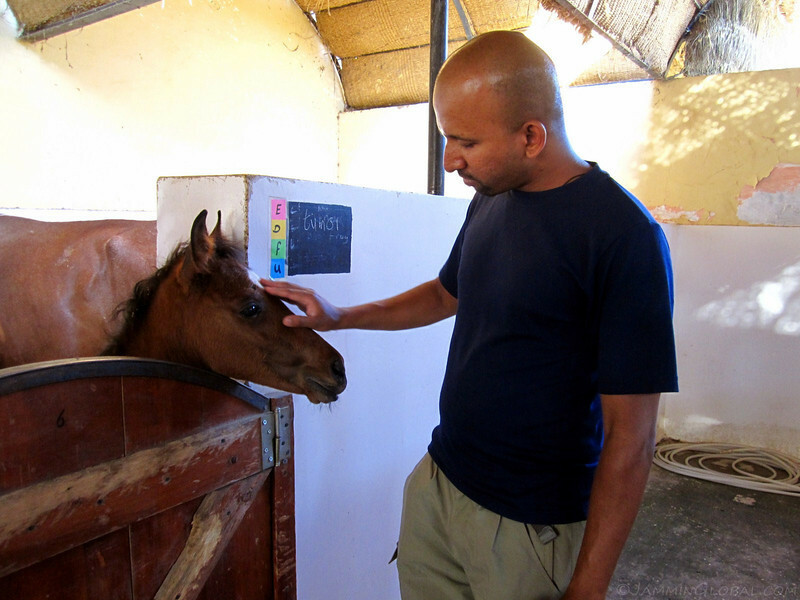 Ernesto explained that after a campaign by local animal rights groups that raised awareness of animal abuses by calèche drivers, their use by tourists dropped. 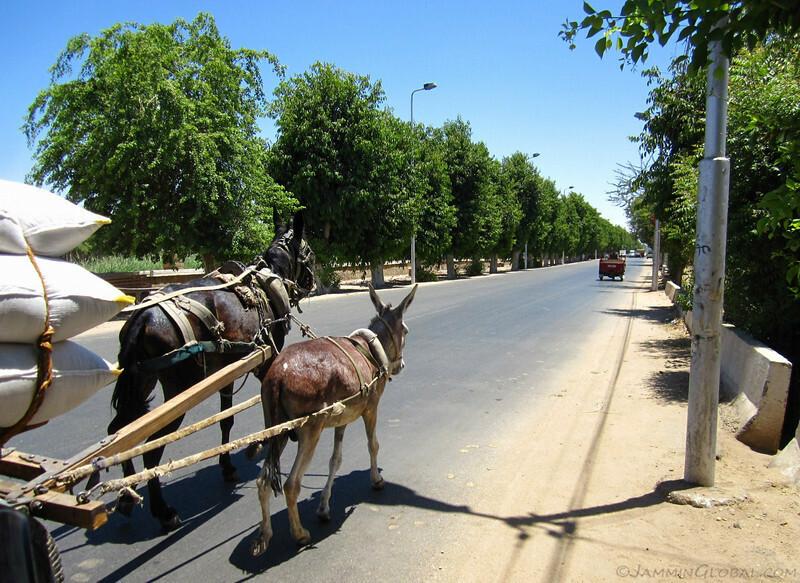 Only a few calèche drivers have drawn the connection between a well-treated horse and increased income. 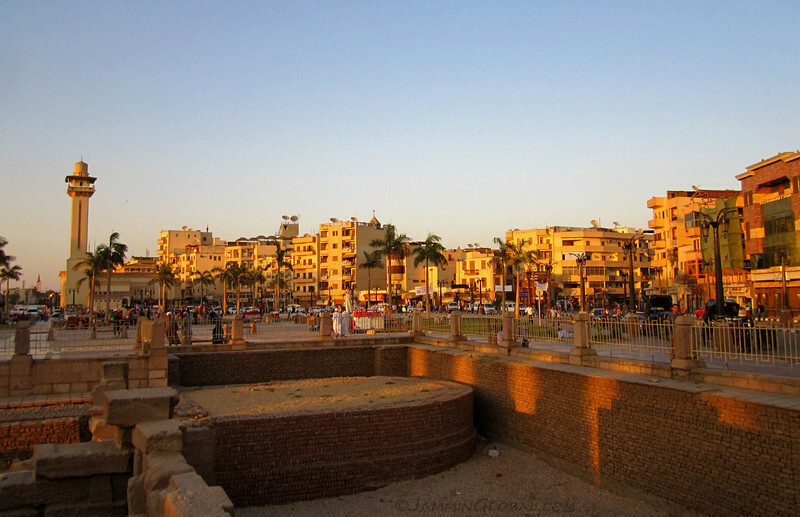 Waiting for the ferry to cross back to the west bank during that magic hour of sunlight, just before sunset, that painted Luxor Temple and its modern town in shades of gold. 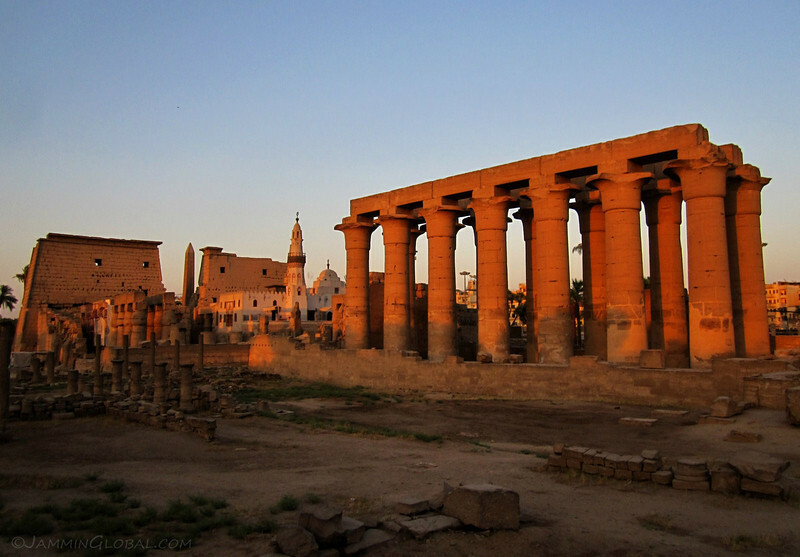 Amenhotep III’s colonnade of Luxor Temple, glowing in the fading light. Between the entrance pylon and the colonnade lies the Abu Haggag Mosque that was built on top of the ruins in the 11th century AD. 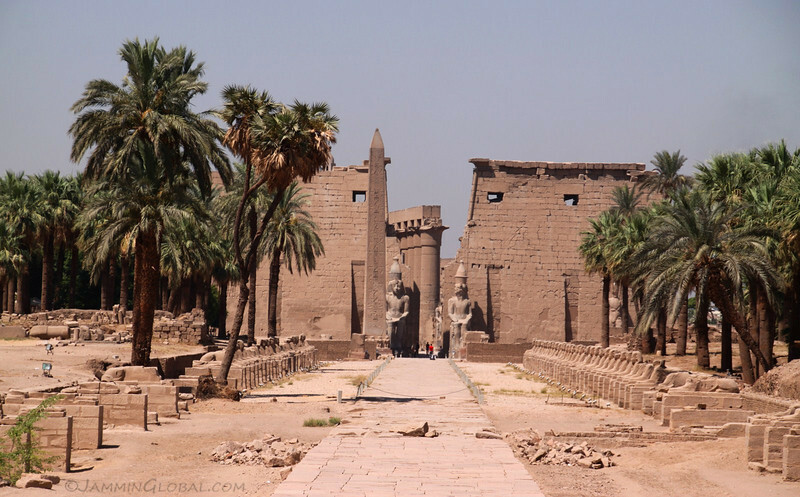 Luxor was ruled by a Coptic Christian Princess at the time and she was tricked by Sheikh Abu Haggag, who came from Bagdad, to hand over the land of Luxor Temple to him. And upon his death, a mosque was built there in his name. The Muslim residents of Luxor have refused to have it removed, even though it’s clearly intruding on this much older heritage site. 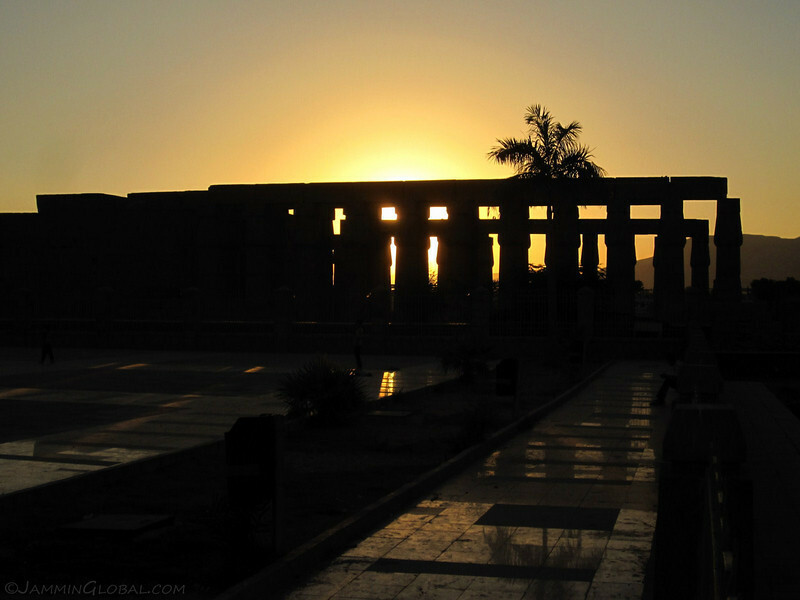 The peristyle court of Amenhotep III with the setting Sun being blocked by the pillars of the central corridor of Luxor Temple. This easy access to the wonderful monuments of Ancient Egypt have earned Luxor the title of the World’s Greatest Open Air Museum. 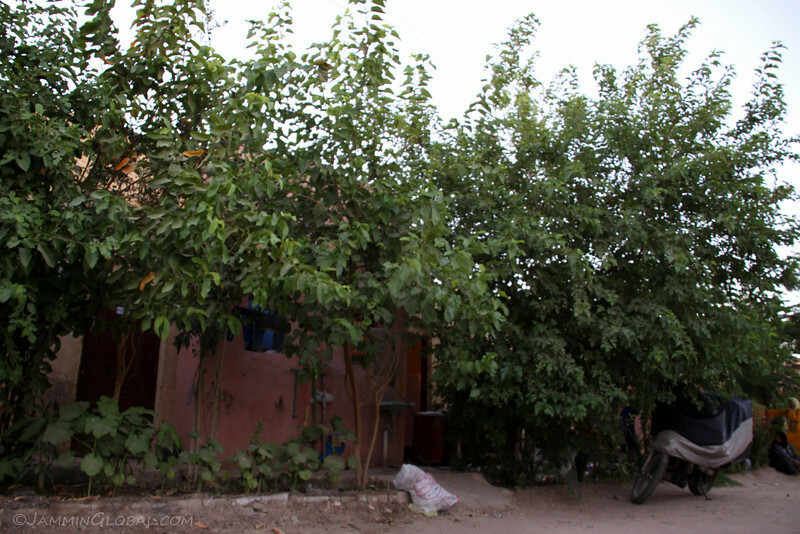 sanDRina parked under the trees in front of the house of Ernesto’s family in New Qurna. 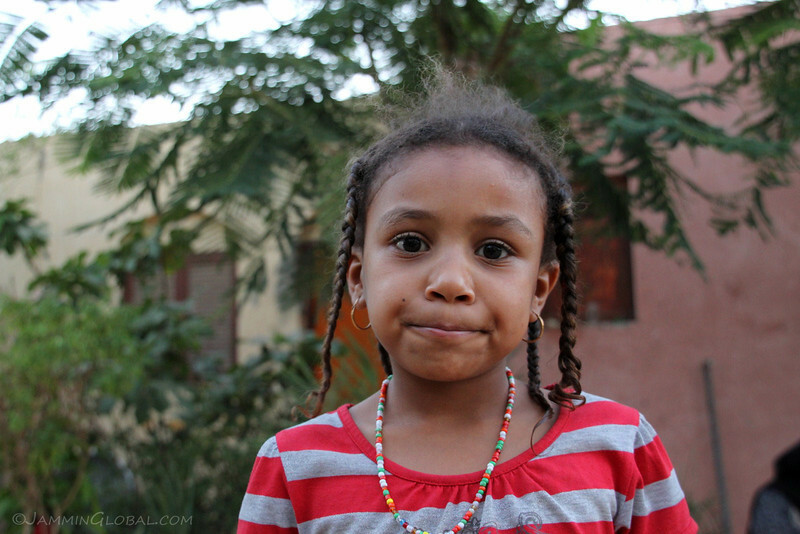 I got to know Mohammed and Fatima over the few days I spent there and when I asked them if I could take some photos, they said it was no problem to photograph the children, but please, no photos of the women, in accordance to their Muslim traditions. …now, that’s more like it. A natural smile. …but also a protective older sister. Perhaps that’s a universal trait of older siblings: they’ll fight you at home but protect you from outside forces. 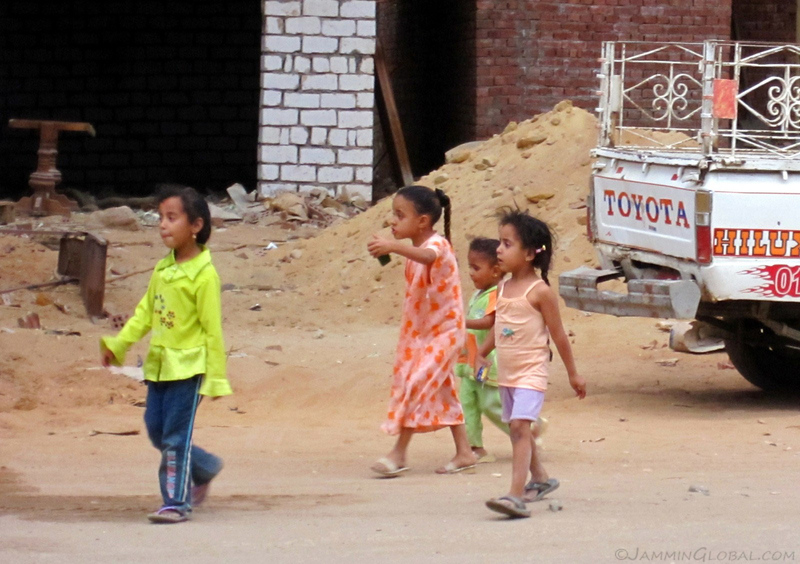 The aged, thirteen year-old sanDRina contrasted with the exuberance of Egyptian youth. Ernesto had access to the terrace from his portion at the back of Mohammed and Fatima’s house and we spent the evenings up here as it was very cool and windy after the Sun went down. …because most of the time, it was like this. 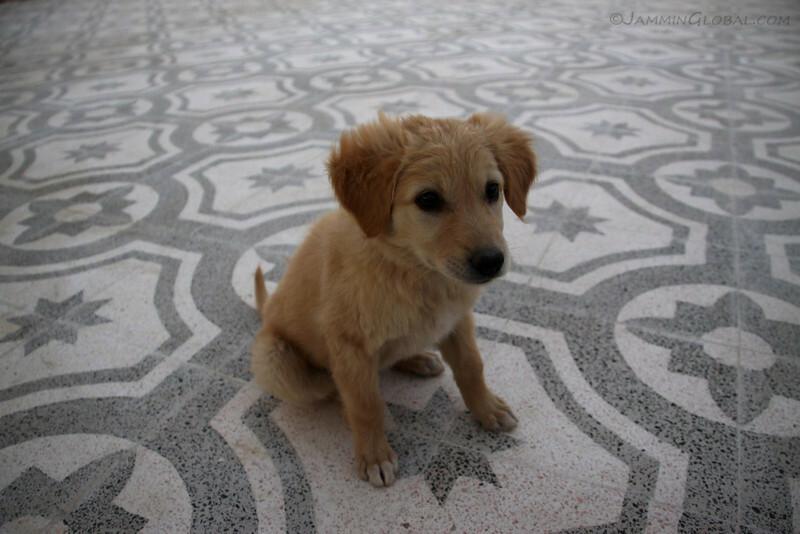 I spent a night sleeping on the terrace and after playing with the puppy and exhausting its energy, it laid down next to me for the night. 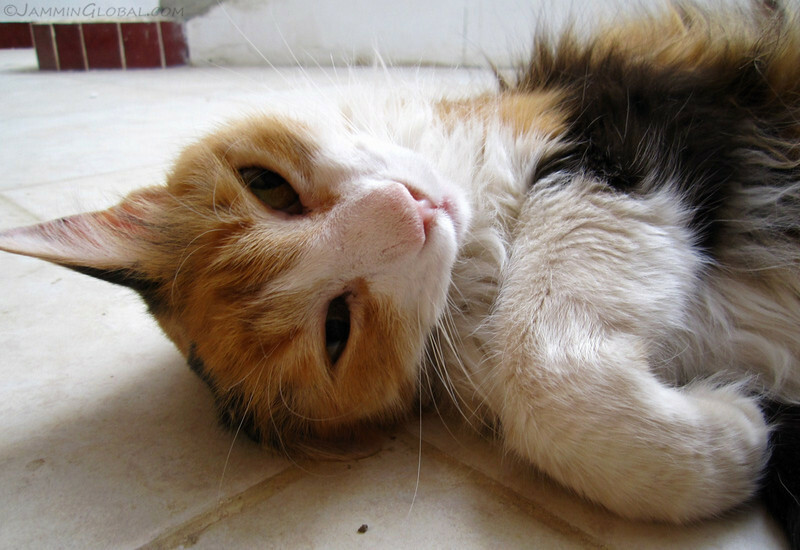 Ernesto’s crazy thirteen year-old cat, Mimosa, that liked to sleep with its body contorted around the bathroom door. Mohammed inviting us for lunch one day in his house designed by Hassan Fathy in the 1950s in the village of New Qurna. 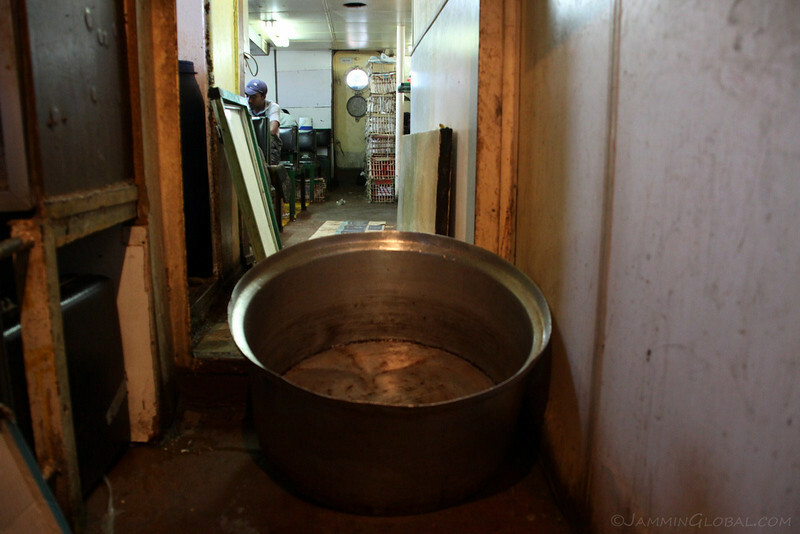 Ernesto taught Fatima how to bake pizza, an essential food for Argentines and Uruguayans. This here was an onion pizza. This stay with my CouchSurfing host, Ernesto in Luxor, showed me facets of the city that I wouldn’t have seen had I just stayed in a hotel. 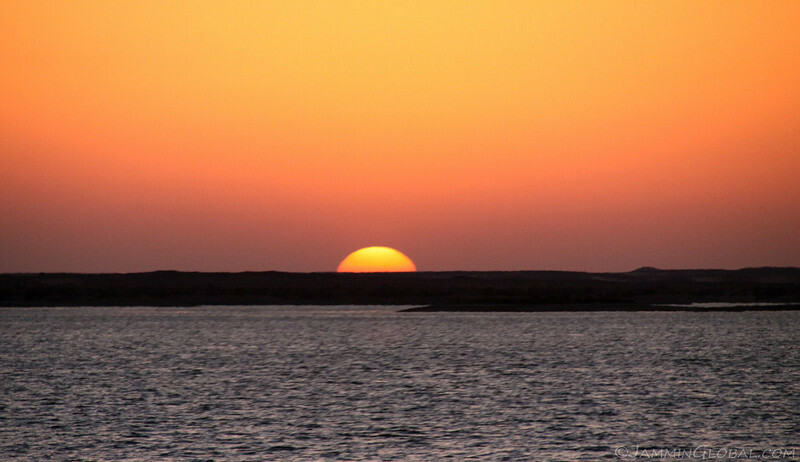 An interesting story of the past was possible through his adopted Egyptian family in New Qurna. 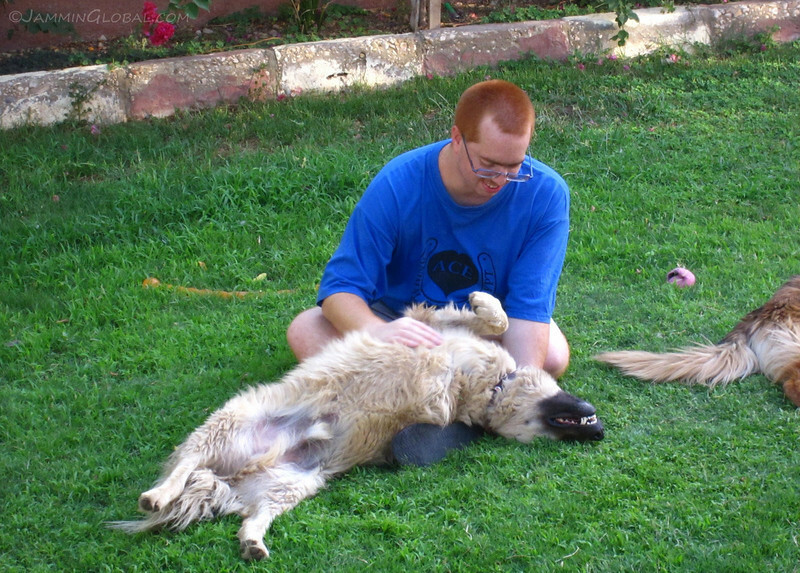 And a current story of animal abuse and care was possible through his volunteering at Animal Care in Egypt. I’m grateful for these experiences that come with just going with the flow. 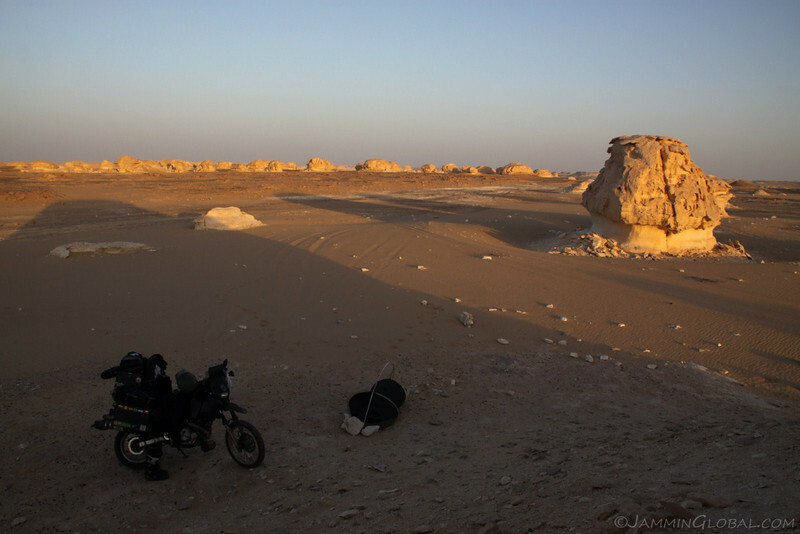 After a wonderful night of camping in the White Desert, I traversed a big chunk of the Oasis Route going through the oases of Farafra, Dakhla and into Kharga, the biggest oasis in Egypt. Kharga and the others oases have been focal points for caravan routes since time immemorial and along the way, the Romans set up shop here and left behind a trail of forts and temples. I connected with Mario and Christina, Italian expats working on a development project there, and we spent a day in the desert exploring the Roman ruins at Labakha. 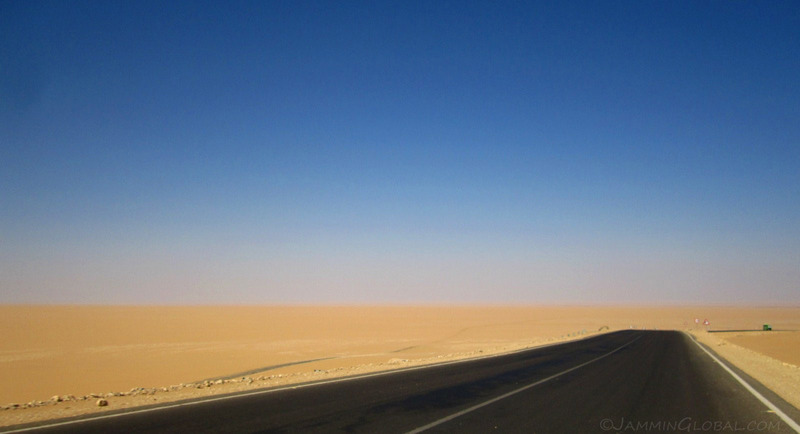 Heading south from the White Desert, I had a 530 km (330 mi) day ahead of me to get to the last oasis of Kharga. 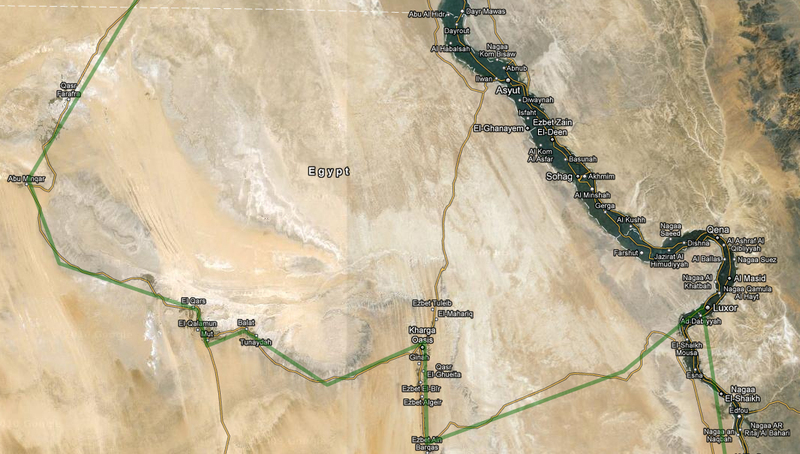 My route thru the southern part of the Oasis Route in Egypt’s Libyan Desert heading from Farafra, thru Dakhla into Kharga and onwards to Luxor in the Nile Valley. Click on it to go to the interactive version in Google Maps. 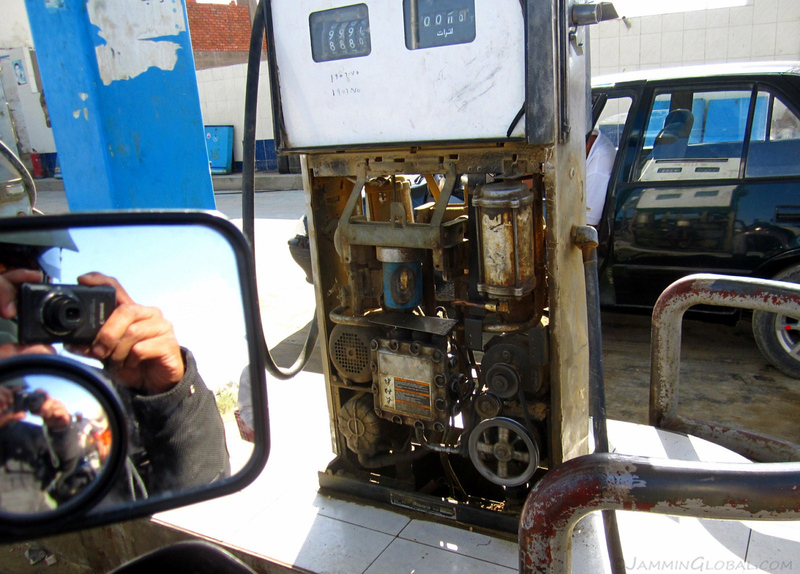 I always wondered what the insides of a petrol pump looked like… I fueled up in Farafra and was enjoying Egypt’s cheap petrol: EGP 1.75/L = $1.20/gal = € 0.22/L. 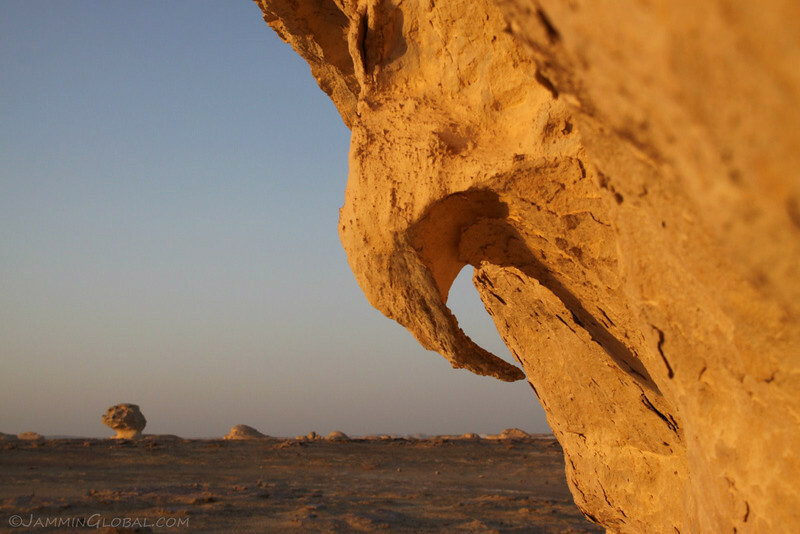 An area of surrealistic limestone sculptures in the Sahara that’s safe to camp at night. I’m there. On par with the remote magnificence of Bolivia’s Salar de Uyuni salt flats, Egypt’s White Desert was a destination I was highly looking forward to. Especially to experience once again camping out in the vast openness with not a soul around and surrounded by a beauty that Nature has carved up for us to enjoy. 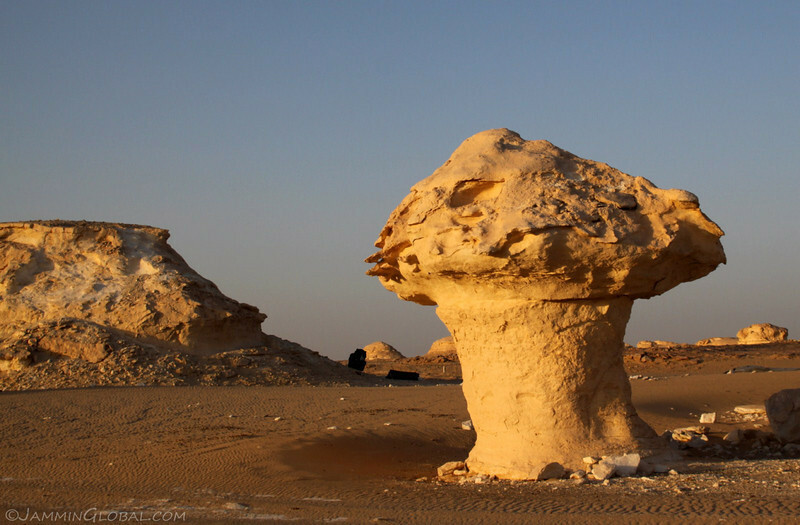 The White Desert is so called due to the numerous limestone-chalk pillars that have been sculpted by erosion into natural works of art. 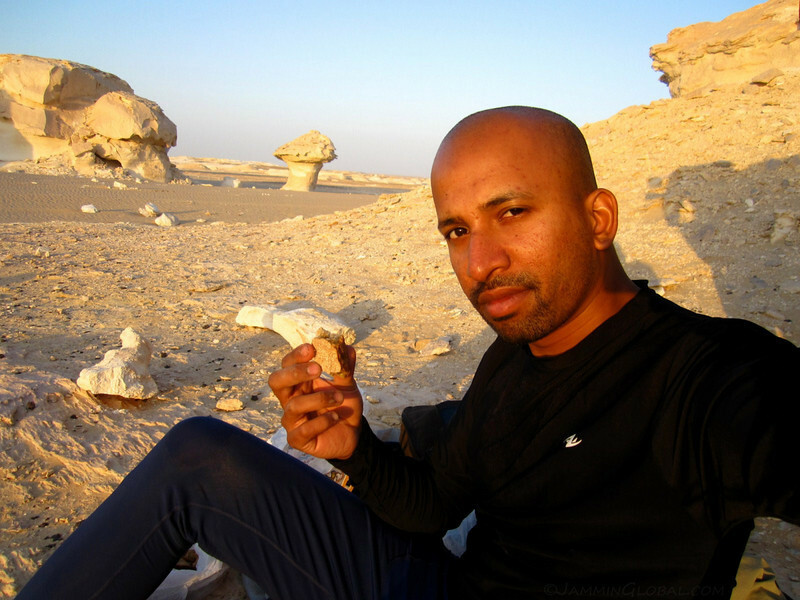 I spent a wonderful night in the desert, camping under the stars, among the great formations in the White Desert. 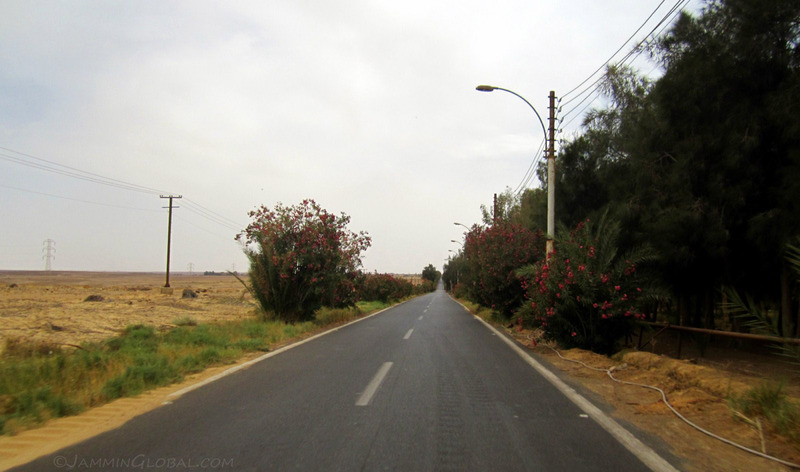 A fork in the road as I left the oasis of Bahariya. 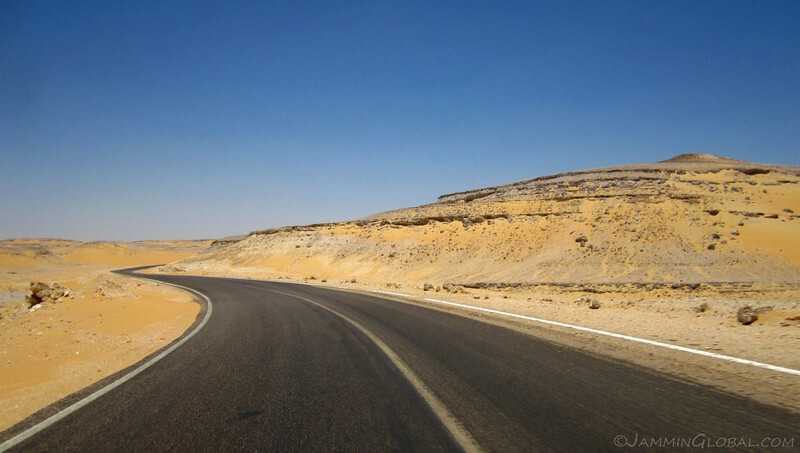 Going right would take me west to the oasis of Siwa, near the Libyan border and going left would continue my journey south towards the oasis of Farafra. 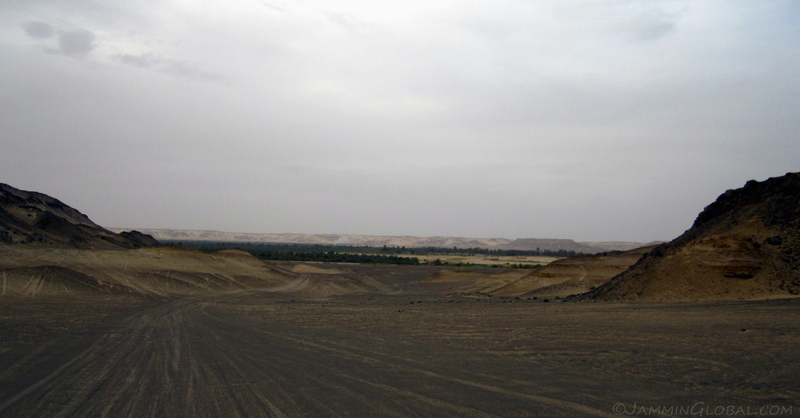 The southern reaches of the Black Desert just outside Bahariya. 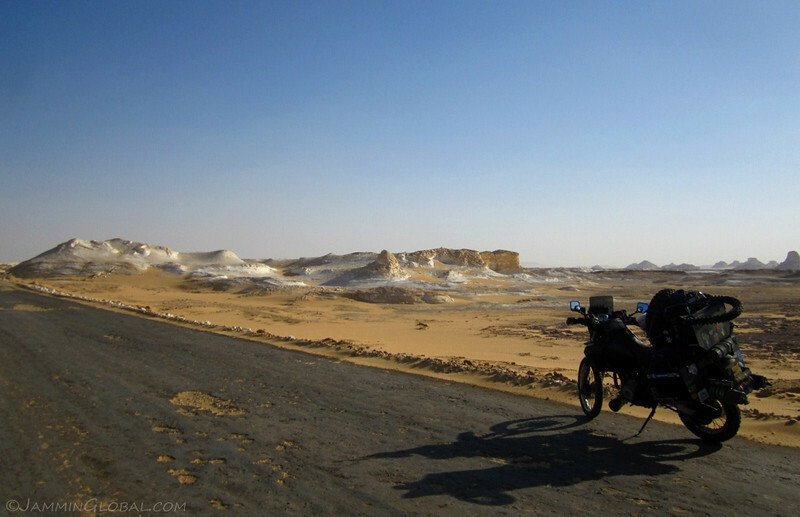 My destination for the night, the White Desert, lay about 140 kms (87 mi) south of Bahariya. I left in the mid-afternoon so that I would arrive there before sunset and was pleased at how much cooler it felt while I was moving than I expected. 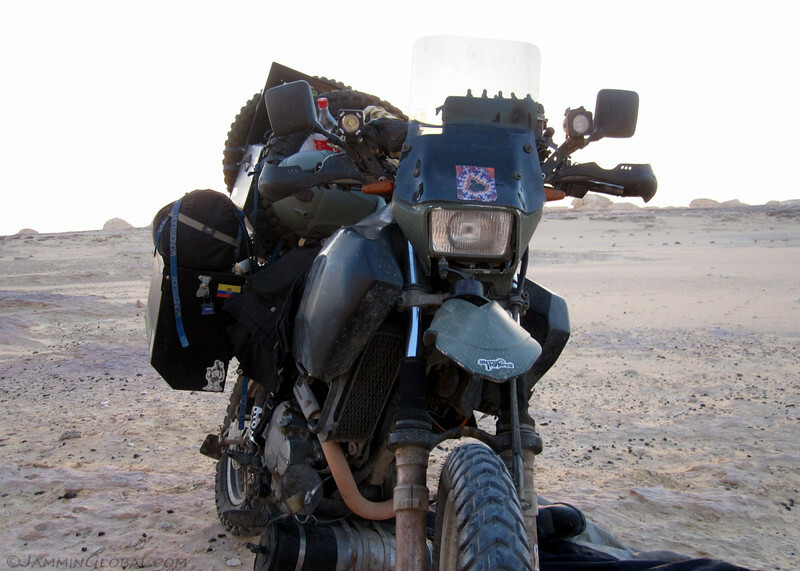 Taking a water break and happy to have a healthy motorcycle as I headed across the desert. 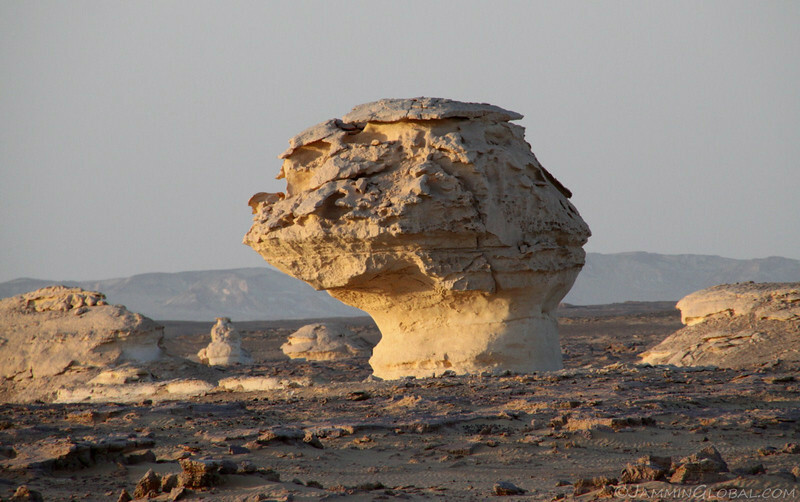 Volcanic rock formations in the Western Desert, adding texture to the sands of the Sahara. 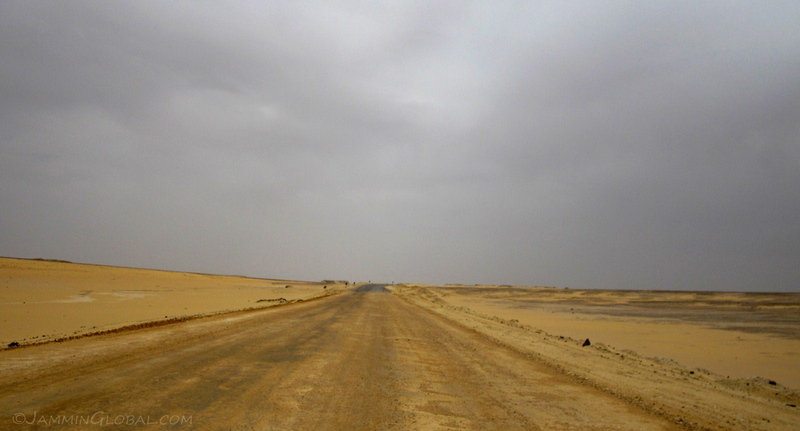 Knowing that I was riding through the Great Sahara Desert, which previously invoked images of bleakness and desolation, I was surprised at the amount of color on display. 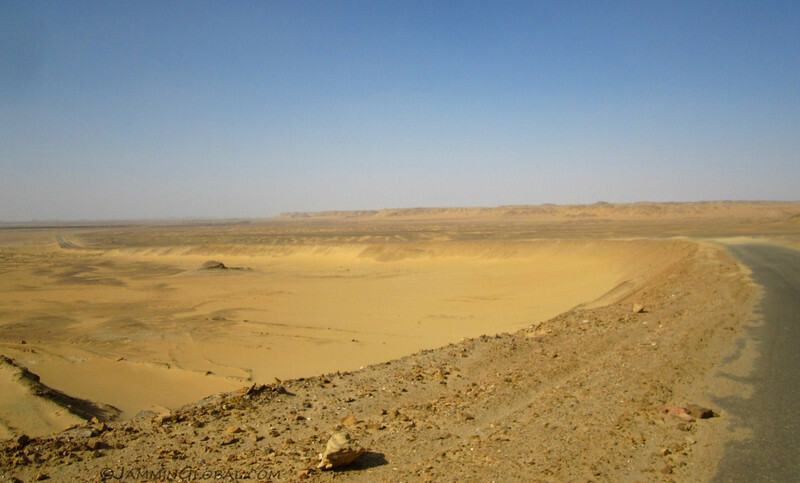 Looking back at a slow climb up this ridge, highlighting the range of geologic relief in the Sahara. 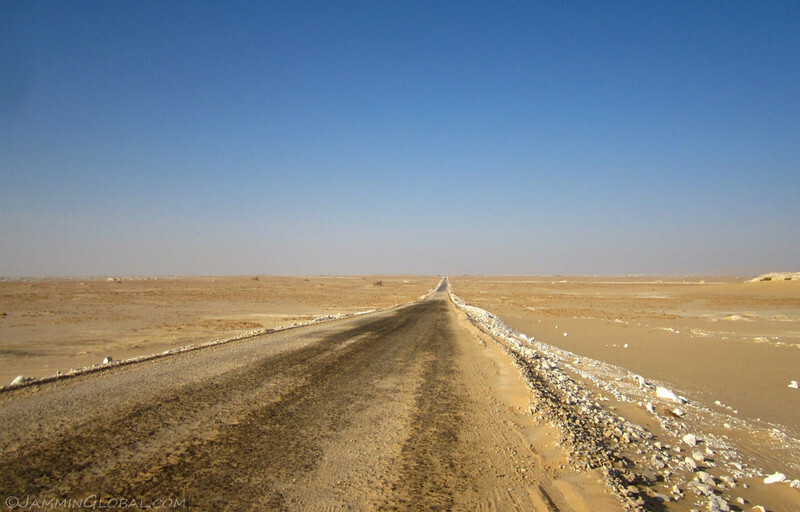 While the road was entirely paved, the blowing sands managed to reclaim some parts of it, covering my path in meters of soft sand at times that required cautious driving with a heavily-laden motorcycle in windy conditions. With our shadows growing longer, sanDRina and I were delighted to note the change from black tops to white tops of the formations in the distance. 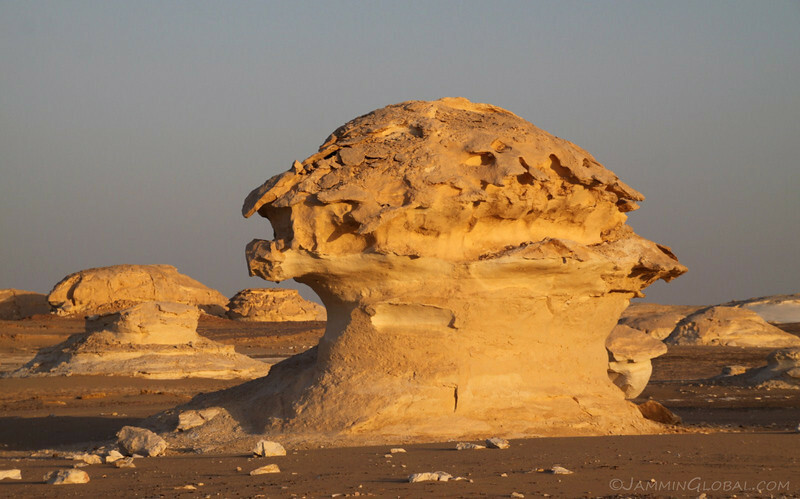 I had arrived at the White Desert National Park, an area of Egypt’s Western Desert covered in bright chalk pillars, carved into spectacular sculptures by the wind and rain. A little ways into the park, I found a nice spot to camp for the night. The winds were coming from the west, so I parked up behind this mound but still had to secure my tent down with some large rocks as I couldn’t use my tent pegs on the hard rock surface. 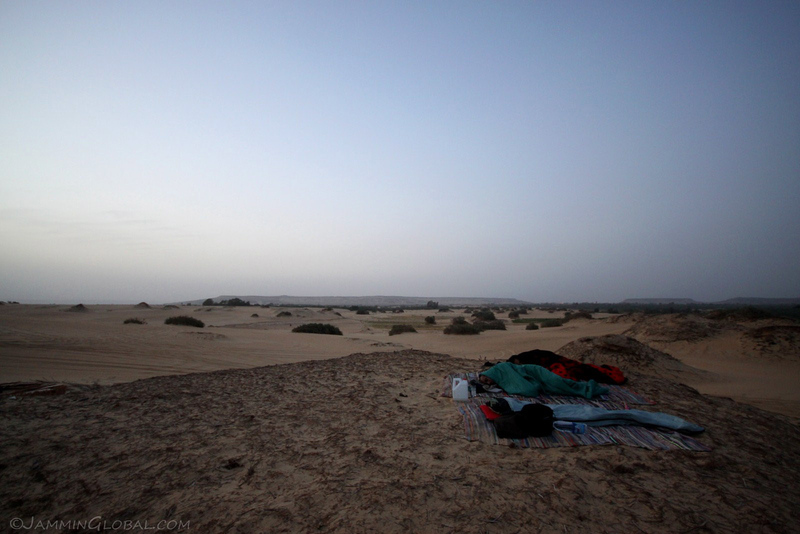 With shelter setup for the night, I walked around in the open-air gallery that the sand-borne winds of the Sahara have produced for our minds to enjoy. The shapes in the chalk pillars were mesmerizing and I was smiling from ear to ear knowing that if Nature is left to its ways, it has the ability to stun us. In our current paradigm, where we believe humans extol great control over Nature, it is humbling to be among giant pieces of rock shaped by invisible forces, slowly at work over millennia. 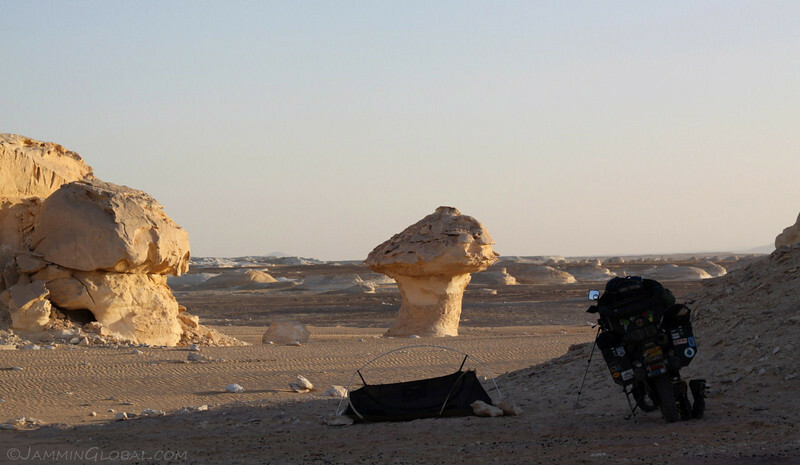 A mushroom-shaped chalk pillar in the White Desert, with sanDRina and my tent in the background. 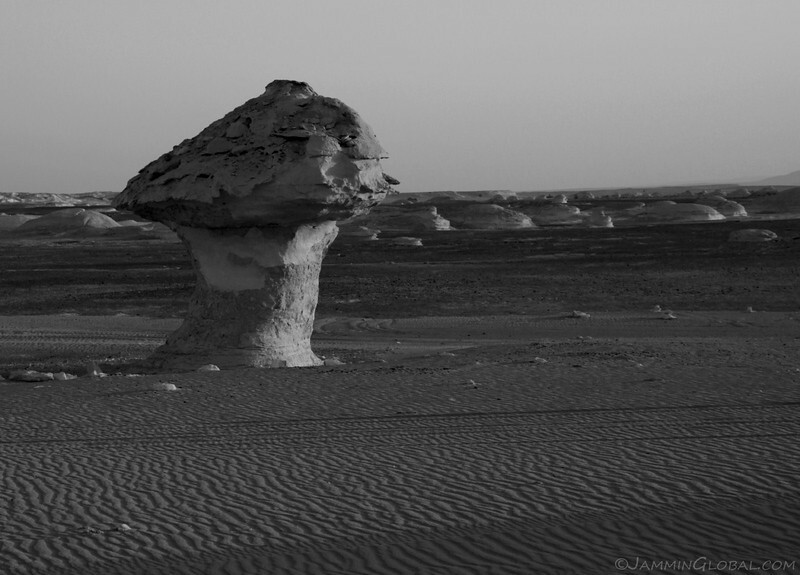 The direction of the prevailing wind coming from the left (west) can be discerned from the shape of the mushroom head. To me it resembles the shape of Earth’s magnetic field in space, with the side facing the Sun (left) having compressed fields from the solar wind and the side away from the Sun (right) having expanded fields in Earth’s wake. 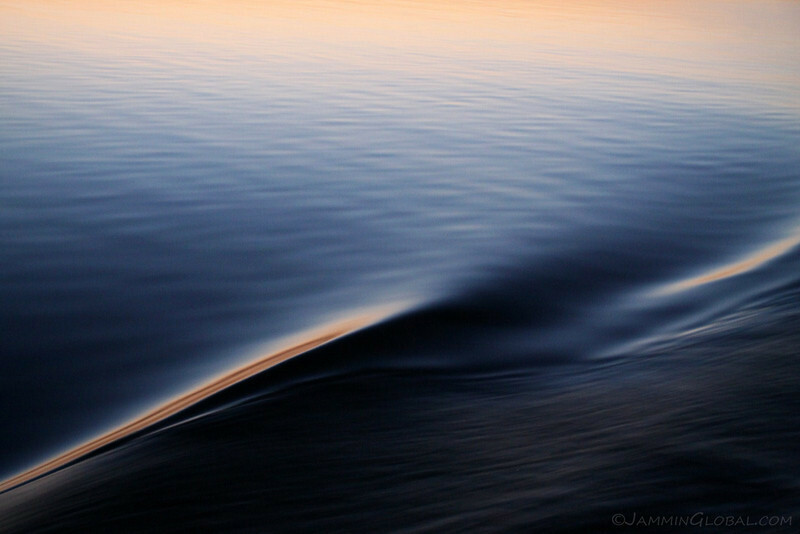 There is a beauty to appreciate in recognizing the connection between forces that are visible on the human scale and those on much larger scales as it all lies on a spectrum. 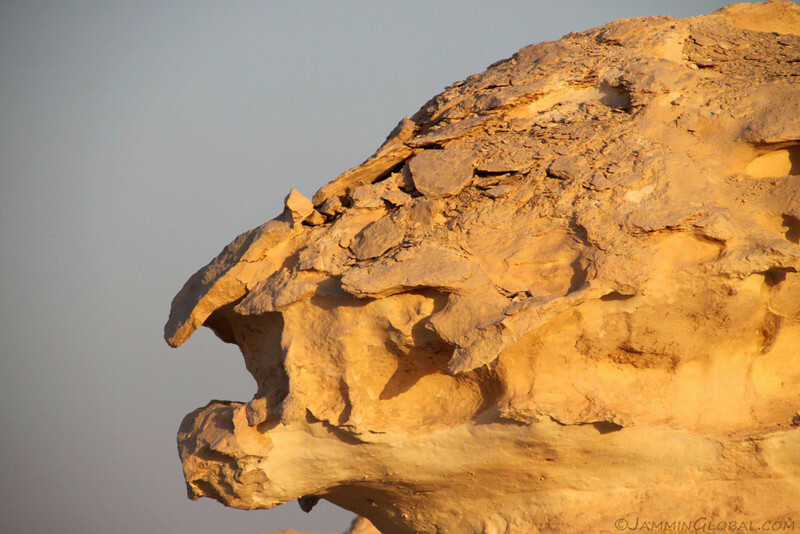 A face in the rock brought to life by the shadows of the setting sun. 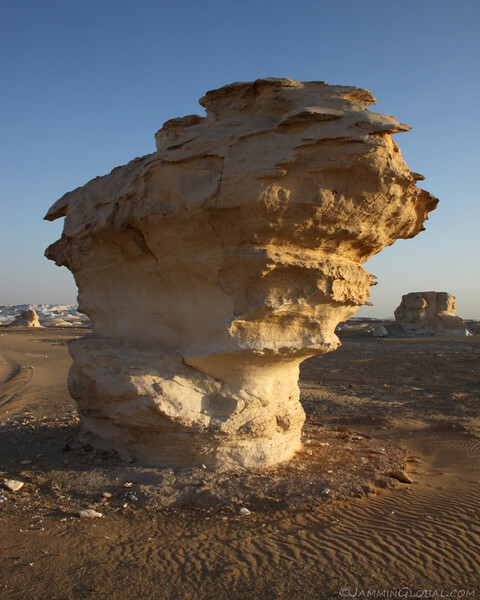 The details of the deep sculpting of Aeolian forces; sand-borne wind loosening one grain at a time to result today in a shape that human minds automatically recognize as familiar. 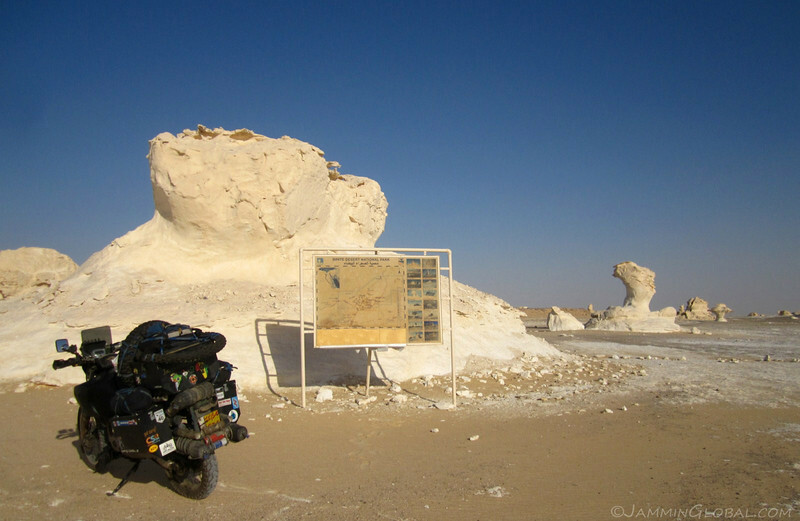 Wonderful sculptures of chalk in every direction in the White Desert. Over-hanging structures in the chalk pillars resembling a ferocious alien creature with its jaws open. A clean fracture down the center of this large chalk pillar glowing in the fading sunlight. Chalk is a type of limestone that is formed by the shells of marine organisms. These organisms, such as mollusks, plankton and sponges, remove carbon dioxide from the ocean and use it to build their external body structures (like shells), turning it into calcium carbonate. Then when these organisms die, they drift down to the sea floor and slowly, over eons, as the carbonate builds up, it gets pushed deeper into the Earth’s crust where it is compressed into chalk. This is a process of natural carbon sequestration (removing CO2 from the atmosphere and storing it). An interesting profile of a chalk pillar, sculpted by erosive forces. The presence of chalk implies that all this area was once under water, a strange idea considering it’s currently a hot desert. 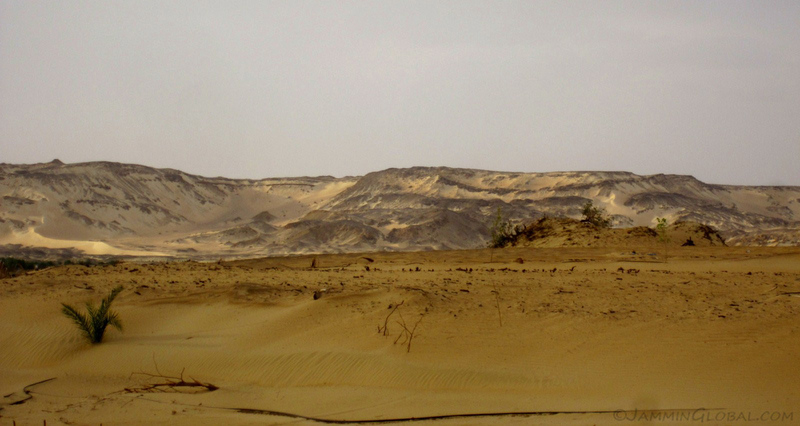 60 million years ago, after the dinosaurs vanished, this area of the African continent was under a shallow sea. It was closer to the tropics than it is today and that’s where marine organisms with calcium carbonate shells thrive. As the African plate collided with the European plate, it lifted this part of the continent out of the sea and exposed this formation of chalk to the weathering forces of wind and rain resulting in the sculptures that we see today. 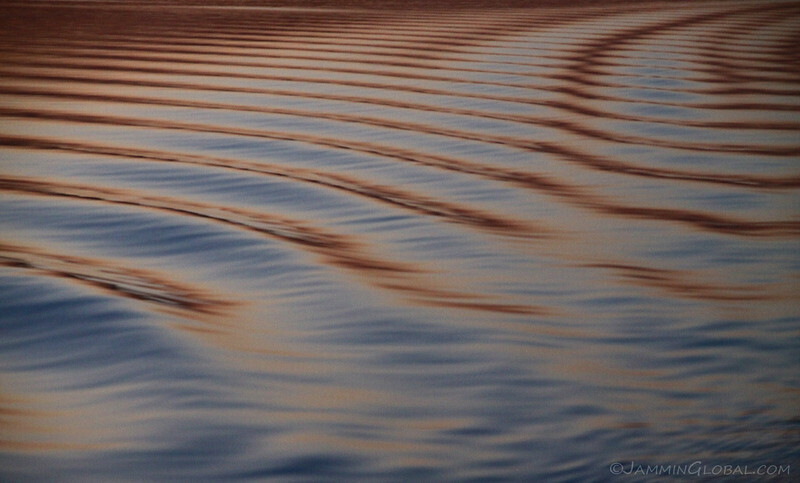 A timeless instance of chalk formations and ripples in the sand. 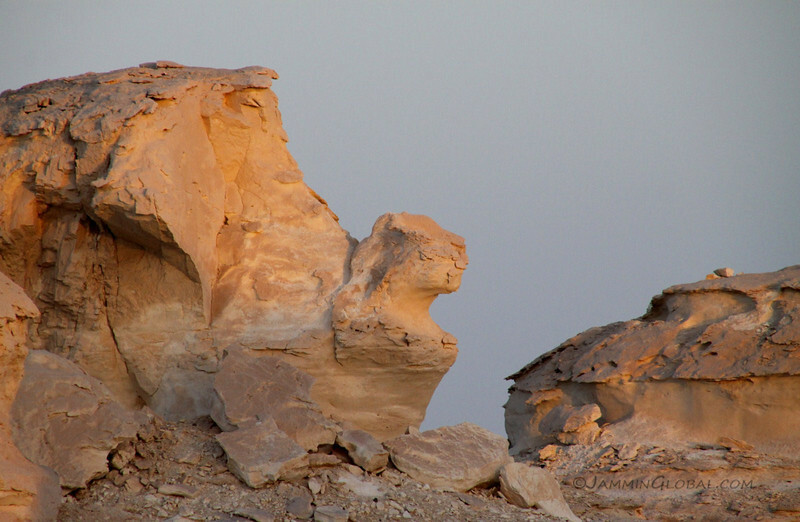 I wonder what ancient man must have thought when he first came upon these shapes in the desert. A hook in the rock, carved by the sculptor known as Wind. Shadows in the desert growing long as the sun tucked in below the horizon. 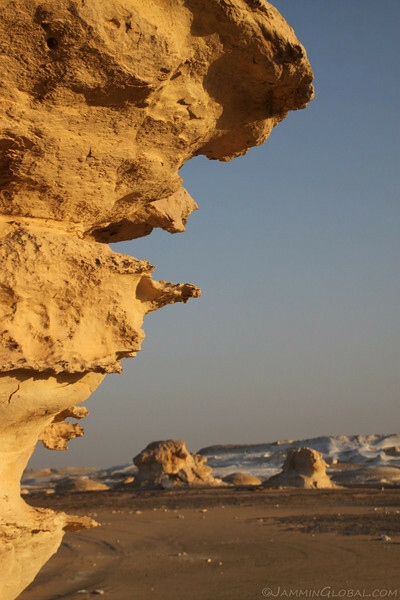 I was only at the edge of the White Desert and looked out at the vast sea of chalk sculptures deeper inside. Others who have gone in with tour guides have told me about a whale fossil and numerous stunning landscapes. However, I was content with my location and its grand views. 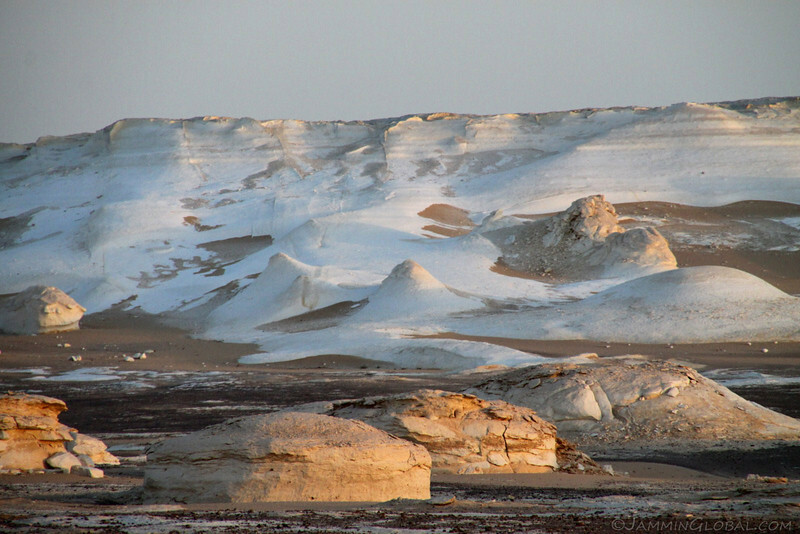 The White Desert is actually white in many parts, looking like mounds of salt or ice. Perhaps these are areas of chalk that haven’t been imbedded with sand grains by the fierce winds. 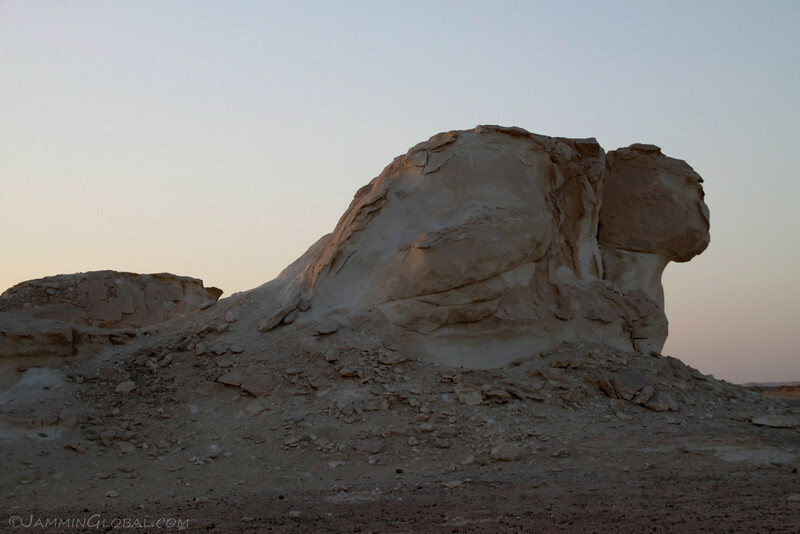 A Sphinx-looking sculpture appearing at the end of this chalk pillar in the White Desert. 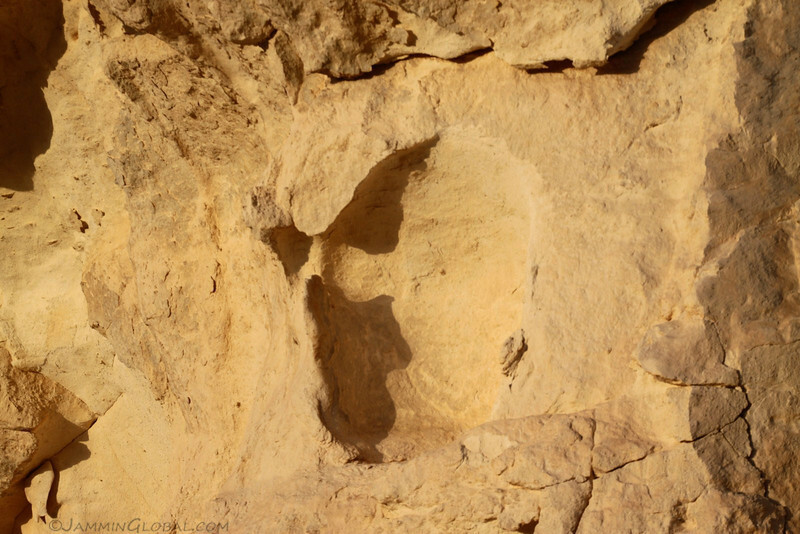 This supports the theory behind the mystery of the origins of the Sphinx that says it was either a natural chalk sculpture itself, finished off by humans or at least its human sculptors took inspiration from the shapes in the desert. Another Sphinx-like figure appearing in a chalk pillar. 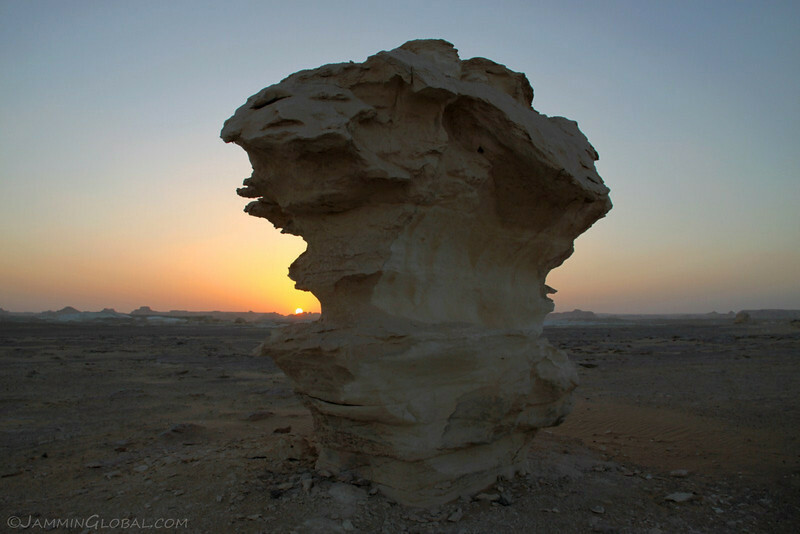 The setting sun in the White Desert, framed by a sculpted cut in a chalk pillar. As the sun fell before the horizon, it cast an aural glow back into the sky above the chalk formations of the White Desert. With daylight fading, I allowed my eyes to adjust to twilight and set about eating dinner. 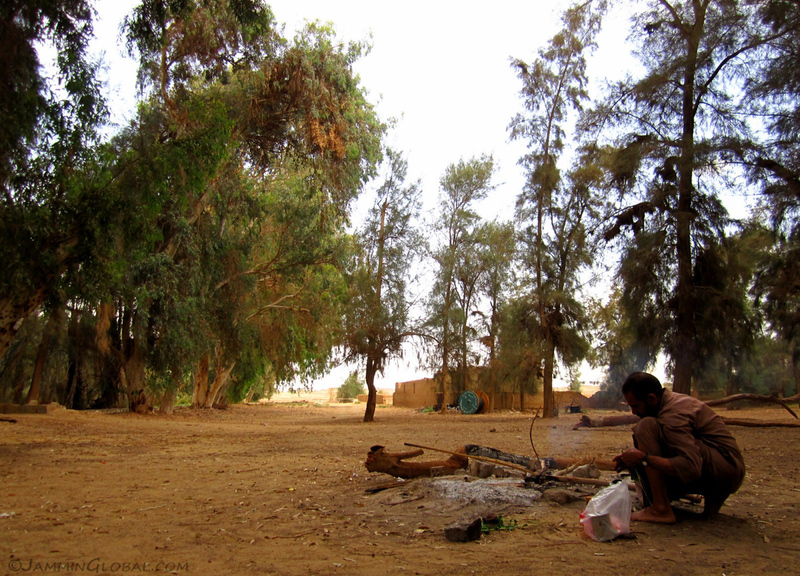 As I left Bahariya, Hamada gave me some of his dehydrated Bedouin bread that I had with a can of fuul medammes (fava beans). 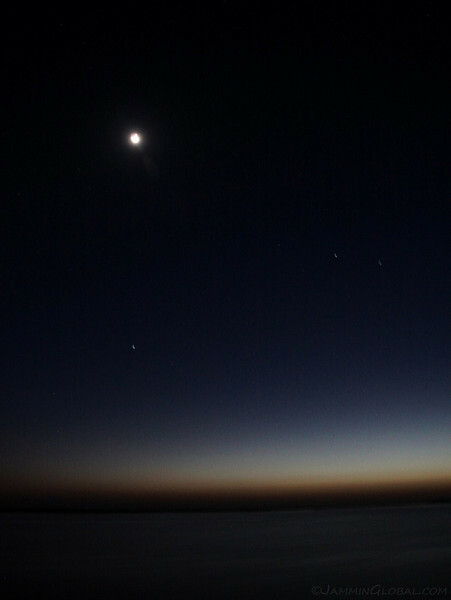 I leaned against sanDRina and looked up as the stars took their place in the sky. With the stars fully out in the grand night sky of the desert, I captured this long exposure shot of my view through my mesh tent. It got chilly but I was comfortable enough in my light summer sleeping bag and silk liner. 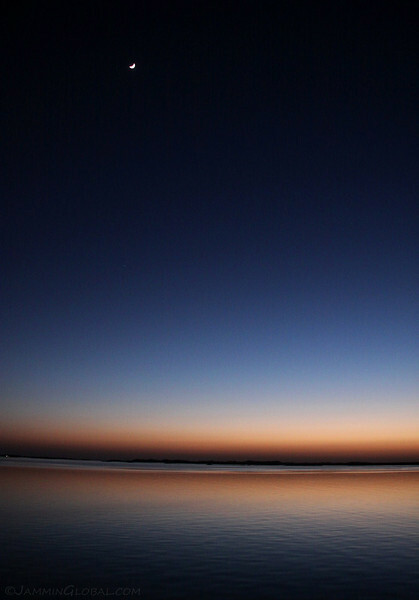 The light on the horizon is from the nearby oasis of Farafra, about 45 km (28 mi) away. 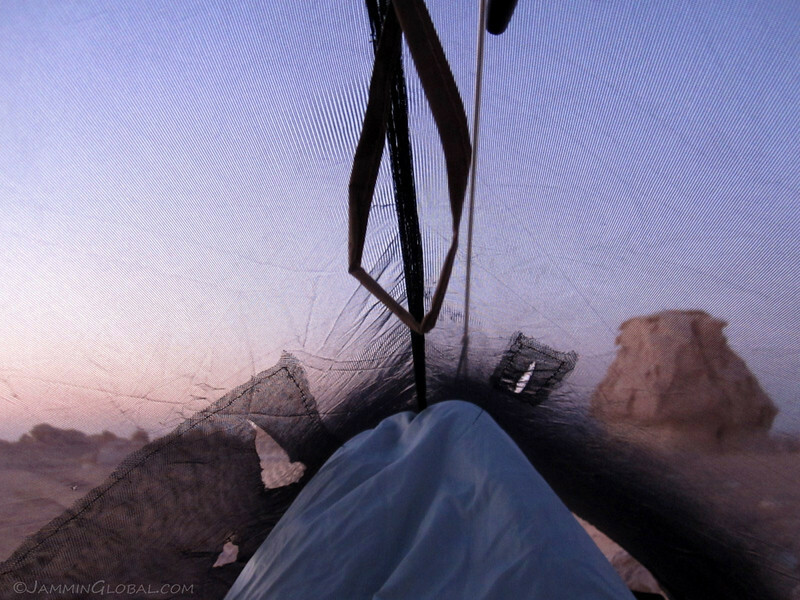 The view from inside my mesh tent the next morning as I awoke with first light at 5 am. The first thing I always do in the morning is check to see how sanDRina is doing. 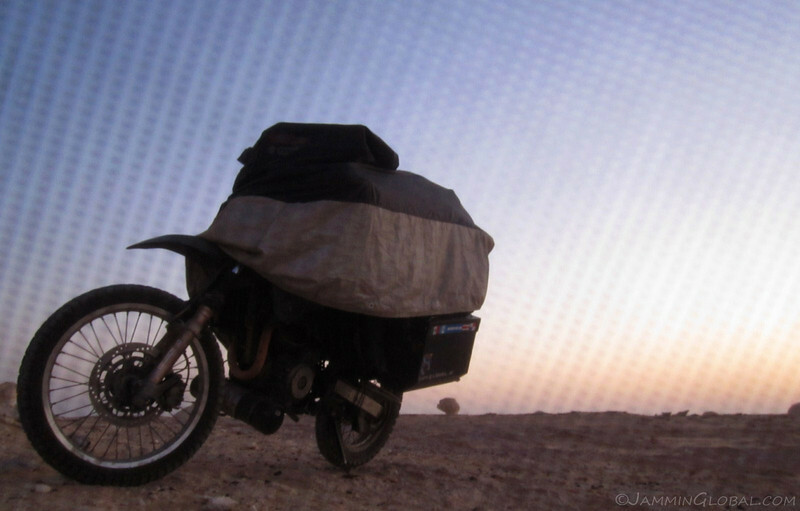 The winds in the night caused her bike cover to ride up, but luckily it didn’t blow away. Welcoming back Ra, El Sol, in the east, after his passage through the underworld that he entered in the west. 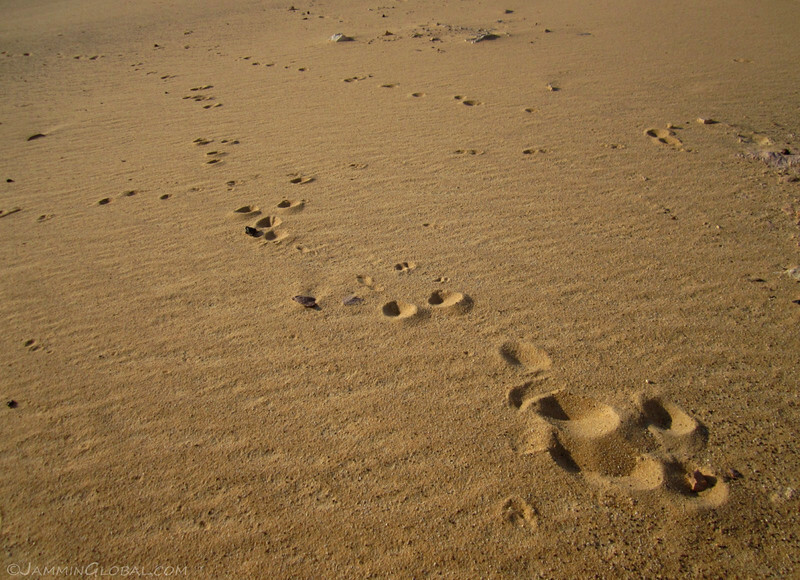 Desert Fox tracks around my tent and bike. Last night, while I was having dinner, a desert fox approached me, drawn in by the smell of food in this desolate area. They’re not dangerous but I shooed her away as I don’t agree with feeding wild animals as it breeds a sense of dependency. She came back again after I got in my tent and I heard scratching noises around the bike but no harm done. The thing that I continue to love about this bike, even after all the time we’ve been together, is her chirpy look. sanDRina has that, ‘hey, get up, let’s go!’ look. Hang on there you composition of nuts and bolts, your rider needs some breakfast and time to pack up house before hitting the road. Enjoying breakfast with a view, soaking in the first rays of light in the White Desert. 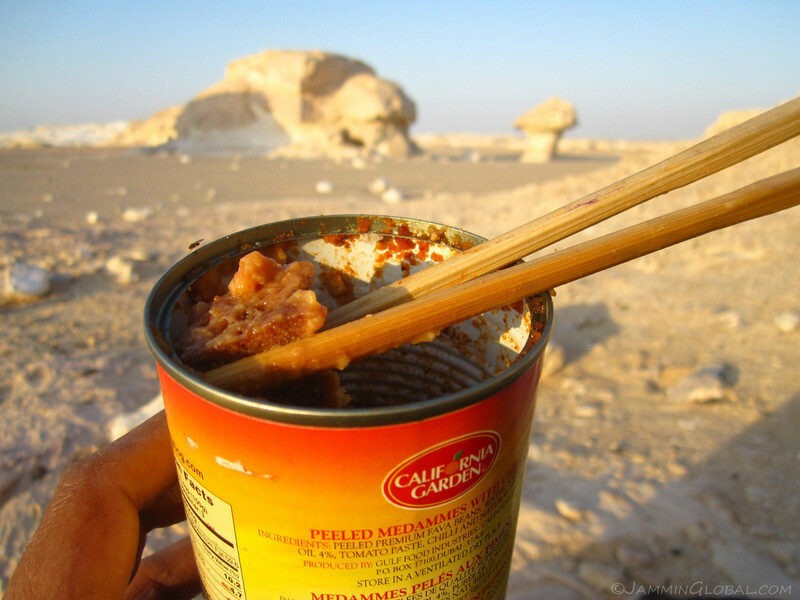 Finishing off the Bedouin bread and my can of fuul medammes from dinner last night for breakfast. I usually prepare oatmeal in the morning when camping but appreciated the chance of not having to setup my stove, boil water, cook and clean, which usually adds another 30 minutes to my morning camping routine. 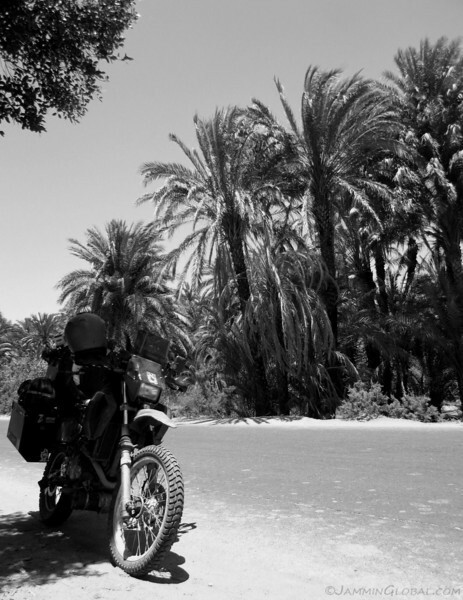 I was looking to get moving before the Sun got too hot so that I could enjoy the desert riding. 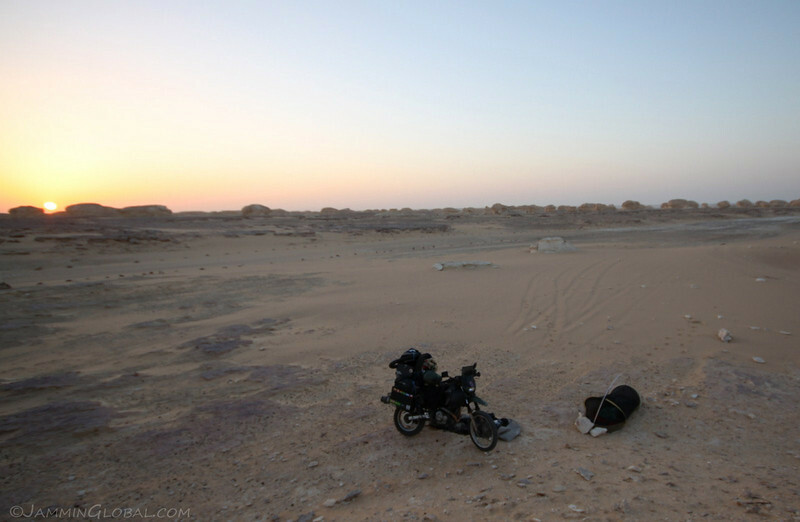 Rolling out of the White Desert by 7 am and continuing south to the oasis of Farafra and Dhakla. I thoroughly enjoyed my night camping out in the White Desert. The chalk sculptures are stunning and left me wanting to come back again to go deeper inside into this mausoleum that millions of ancient marine creatures left for us to enjoy today. 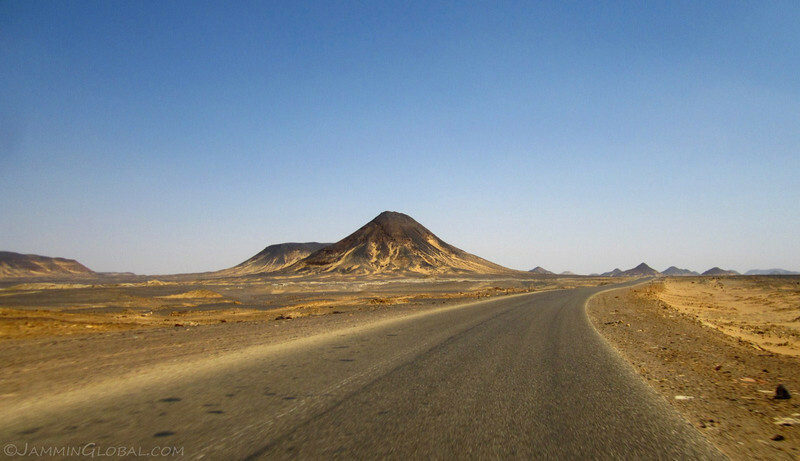 I still had a lot more of the Sahara to cross before reaching Ethiopia and I wondered what surprises the desert would have for me ahead. 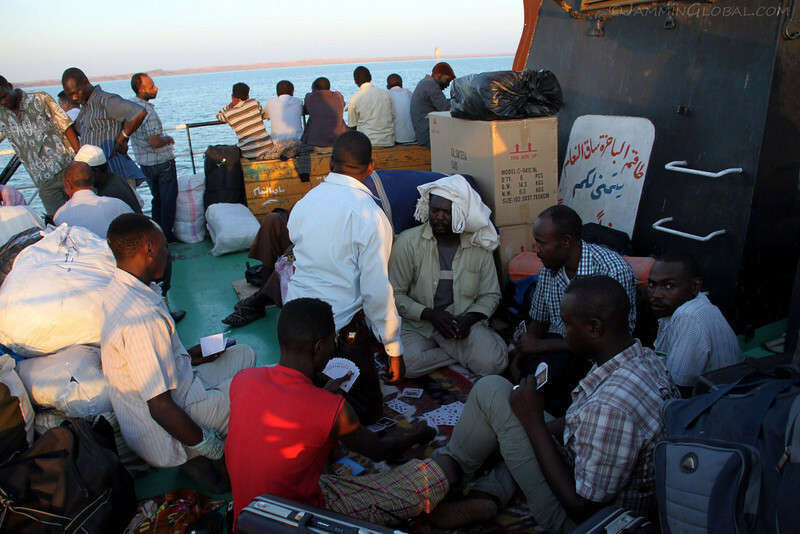 After more than two weeks in Cairo, I was looking forward to getting back on sanDRina and heading south. 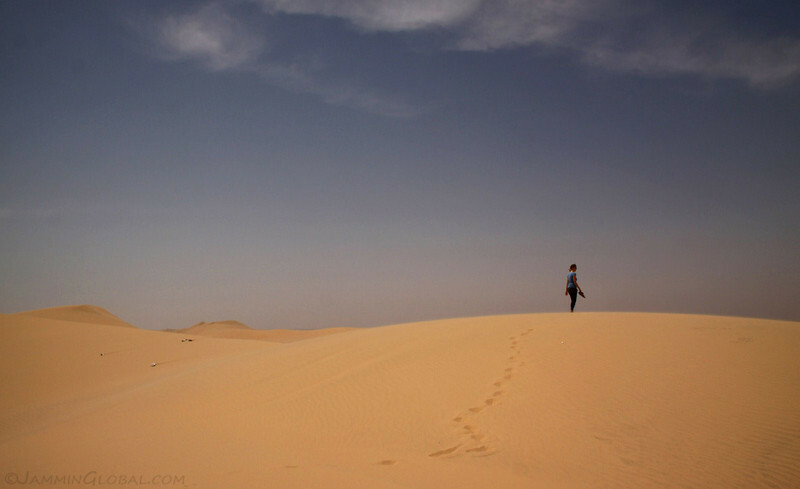 I enjoyed my time in the hectic city, but the open space of the desert was calling. 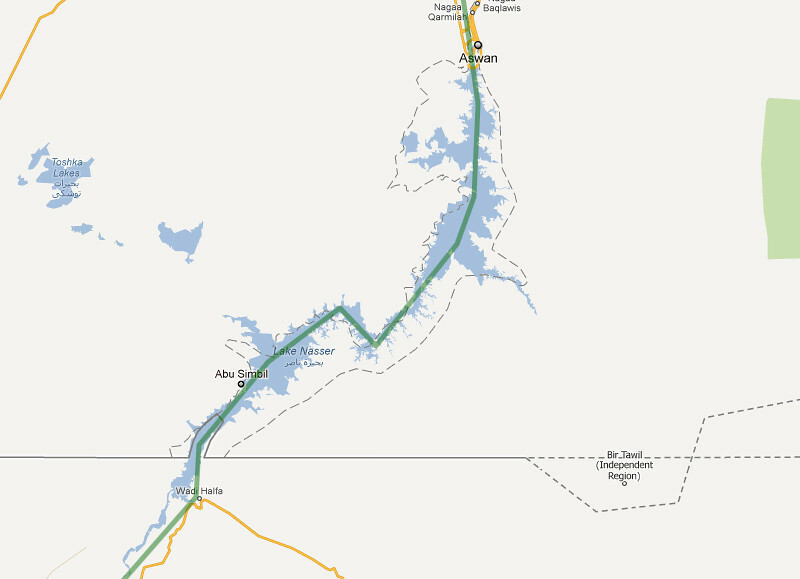 There are multiple routes heading south from Cairo: one follows the Red Sea coast, another follows the Nile going through every little town along the way, then there’s a brand new highway through the desert along the Nile and lastly the path I took, The Oasis Route through the Western Desert. 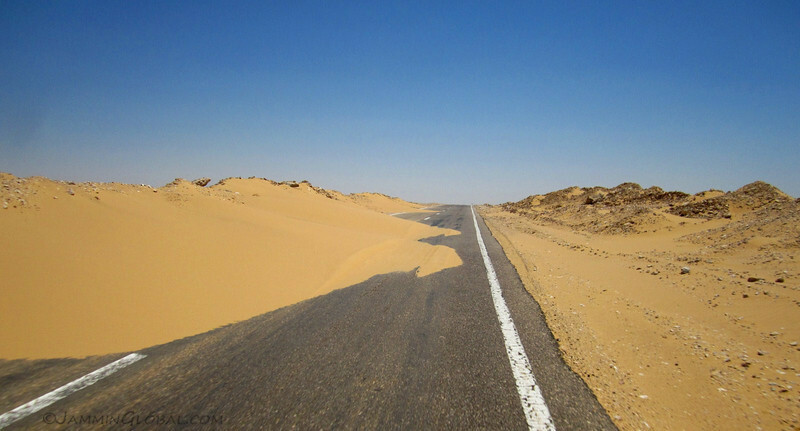 As its name implies, the route goes through several oases that are scattered in Egypt’s vast Western Desert, which is on the eastern end of the grand Sahara desert. 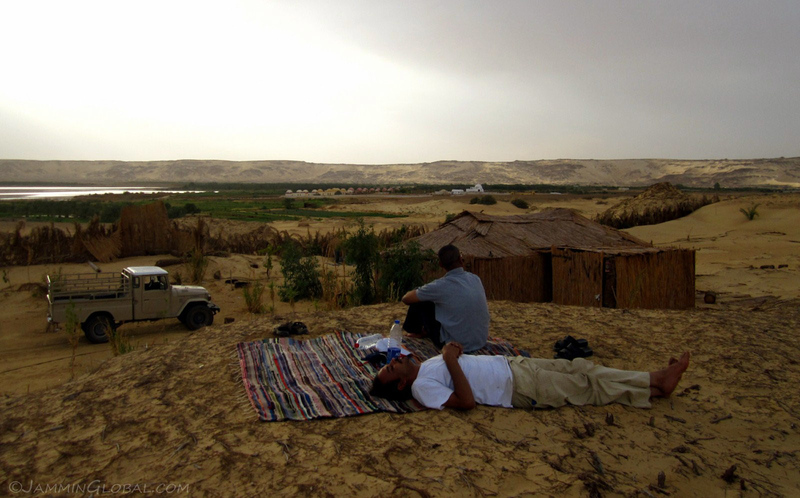 My destination was the first oasis of Bahariya, where I connected with Hamada through CouchSurfing and had a wonderful experience of water in the desert and sleeping under the stars. 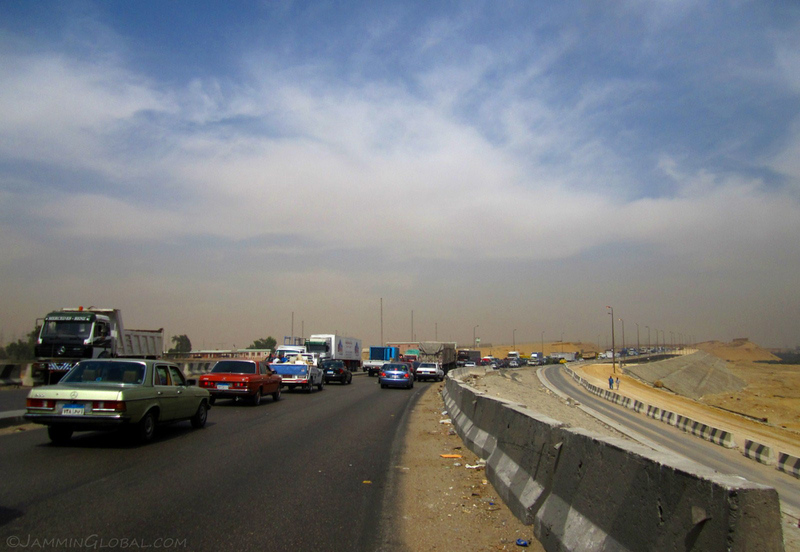 Getting out of Cairo after more than two weeks there and I was eager to leave the cacophony of traffic behind. 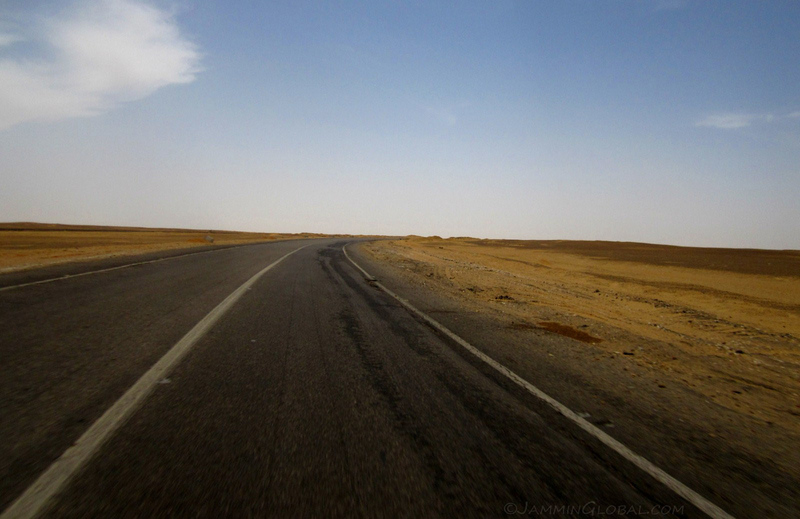 Aah, finally out on the open road and heading southwest to the oasis of Bahariya. 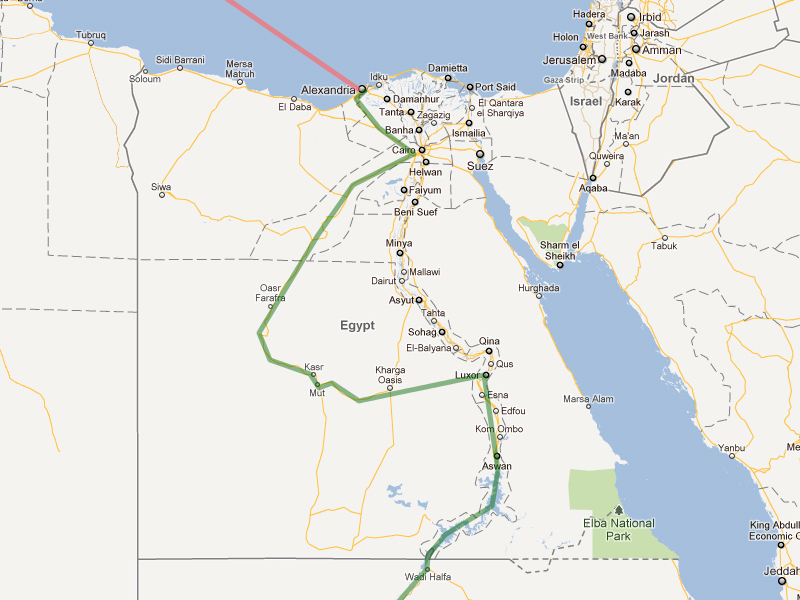 My route through Egypt. 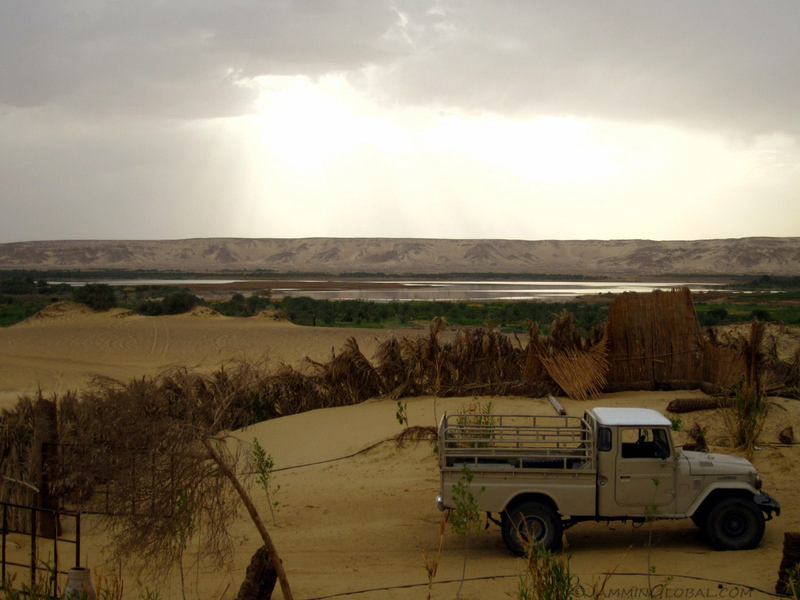 Bahariya is at the intersection of where the road from Siwa joins the Oasis Route. Click on it to go to the interactive version in Google Maps. 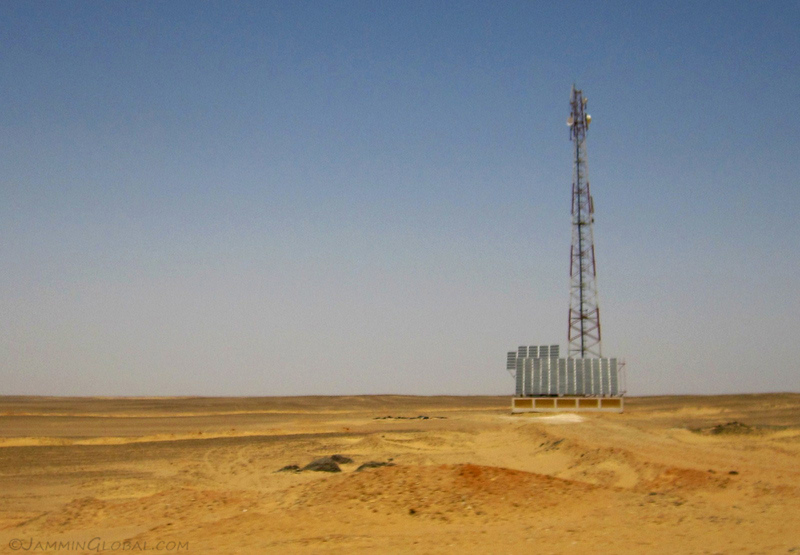 Solar-powered cell phone towers in the desert. Mobile technology is spreading fast throughout the world and there are not many places where you can’t get a cell signal these days. Comforting for some, annoying for others who want to get away from it all. I bought a local Mobinil Sim card so that I could connect with my hosts along the way. 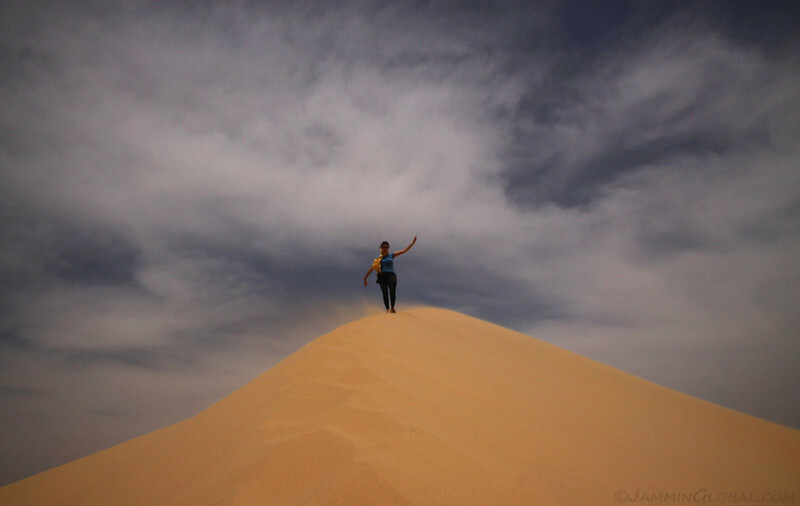 sanDRina out on the Oasis Route in Egypt’s Western Desert. It was about 12:30 and the dry heat was intense. 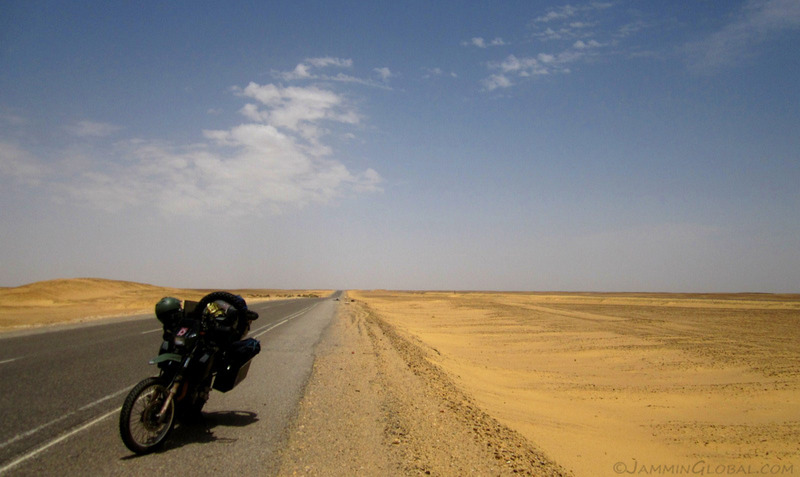 The 400 kms (248 mi) from Cairo to Bahariya was easy riding but I stopped frequently to drink water. It wasn’t just plain water as I had made my own rehydration solution, which my sister recommended. In a liter of water, I put 1 tablespoon of sugar, half a teaspoon of salt and squirted some concentrated lime juice in it. Passing through some construction that looked like the desert had taken back the tarmac. 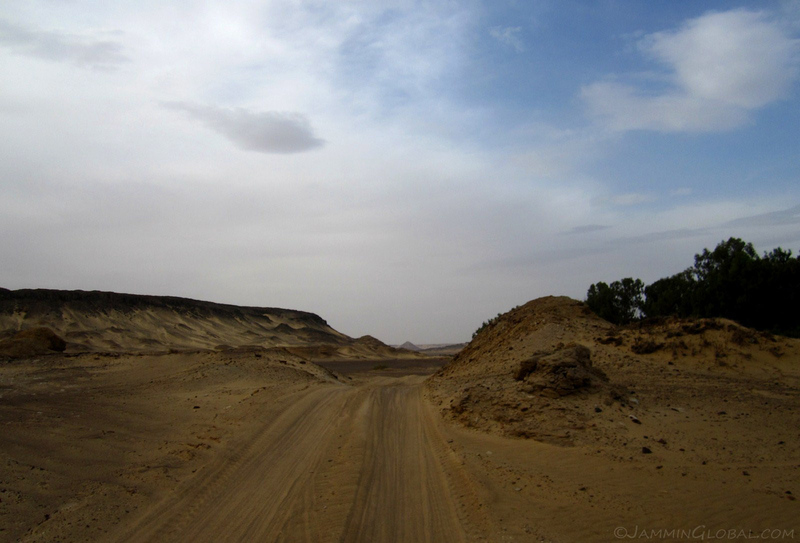 This whole route was off-road until just a few years back when it got paved all the way to Luxor. The sky also changed along the way, looking like it might rain at times. Climbing up and down big reliefs through the Western Desert. It’s not all sand dunes in the Sahara. There are definitely vast seas of sand from here to Morocco, but there are also huge rocky mountains and plateaus, as well. 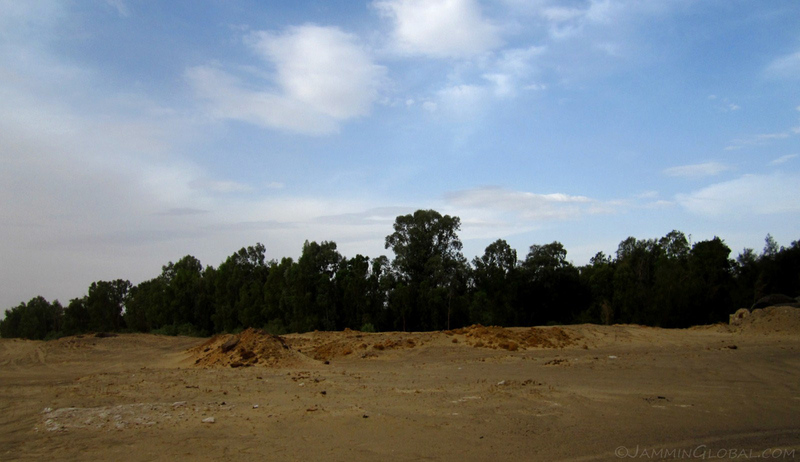 After not seeing any vegetation for hundreds of kilometers, this first sighting of green was a welcome relief. 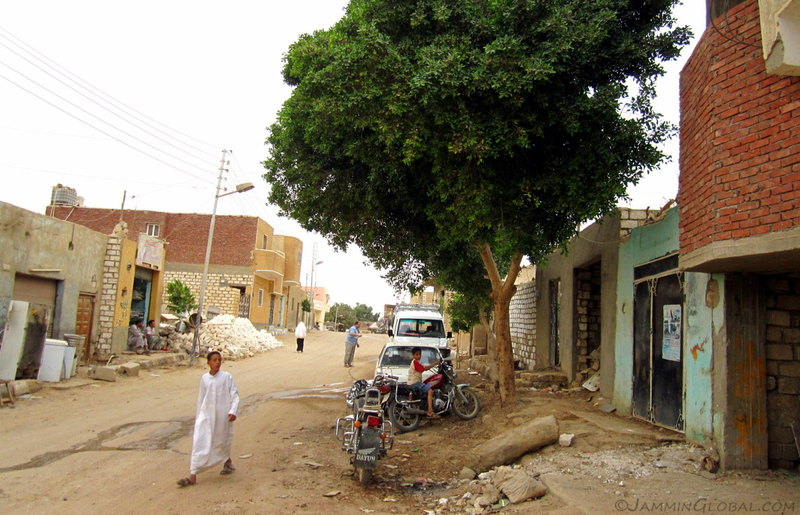 I had arrived in the oasis town of Bahariya. 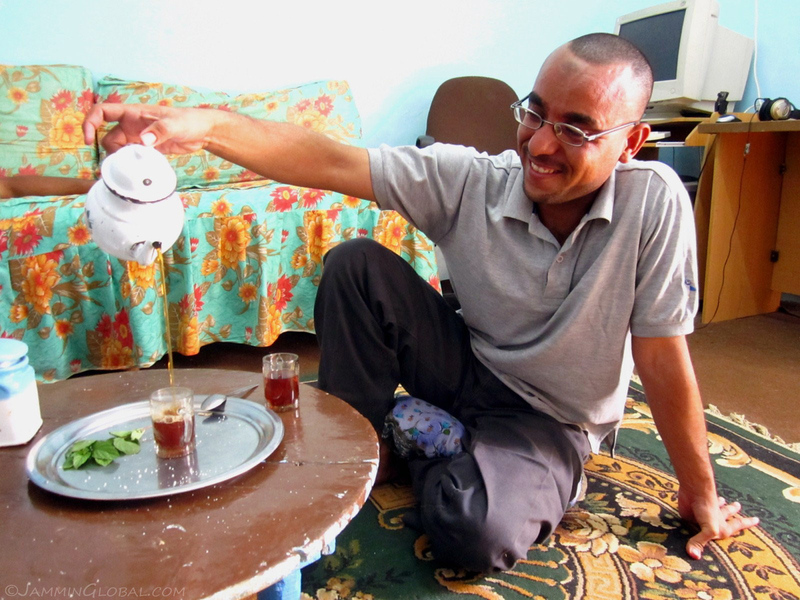 Hamada preparing some Bedouin Mint Tea. 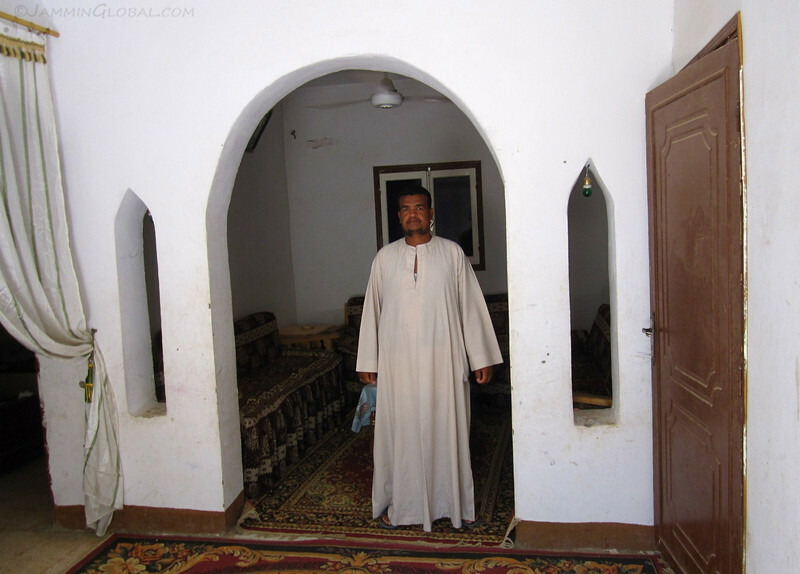 I contacted Hamada through CouchSurfing and he welcomed me into his home. I was quite lucky as he had just activated his account and I was his first guest through this network. 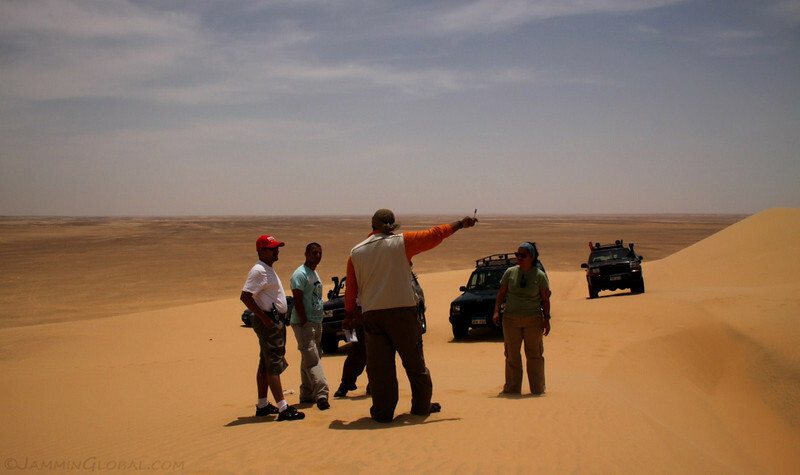 He’s a professional tour guide leading tourists on desert safaris. 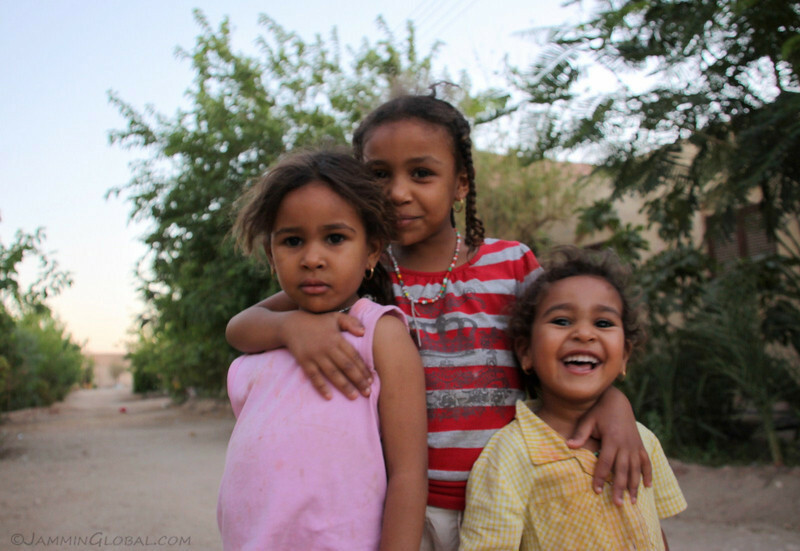 He comes from a Bedouin family, but they’ve now settled in the town of Bahariya, a common trend among many nomadic peoples in the Middle East. 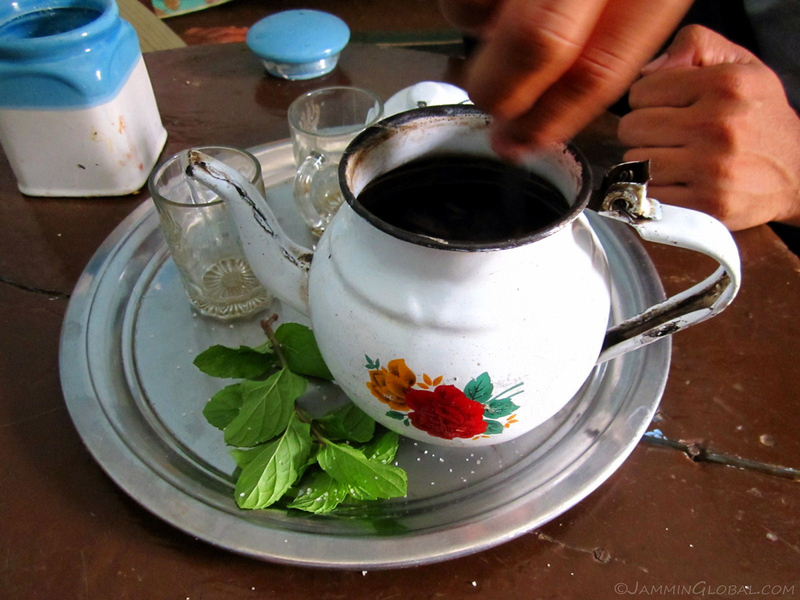 The Juice of the Desert: Bedouin Mint Tea. This drink flows freely all through the desert and is prepared with regular tea leaves, fresh mint leaves and copious amounts of sugar. My Indian heritage has blessed me with a sweet tooth to enjoy the two heaped spoons of sugar that go with every small cup of tea here. I soon realized that this is how the locals stay hydrated as the tea helps your body absorb more water than just drinking it plain. Before the tea, Hamada’s mother prepared a fantastic lunch. 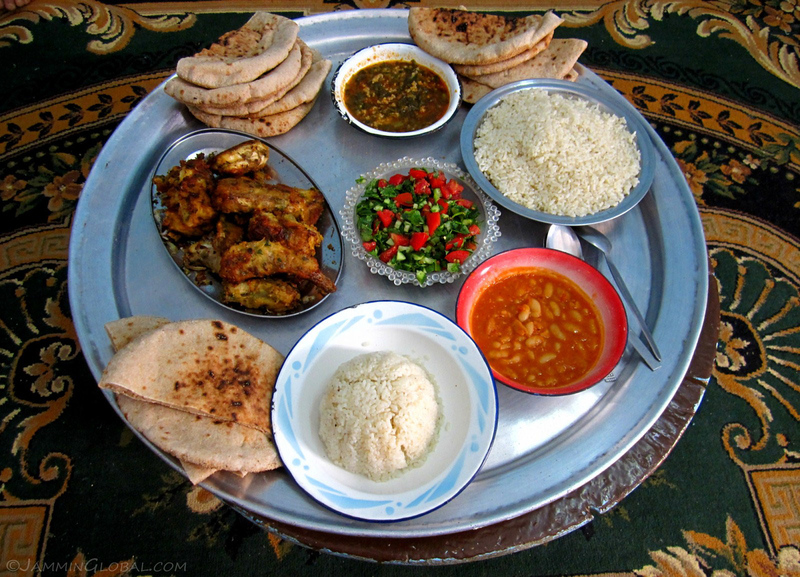 There was fried fish, beans, a veggie dish and fresh tomato and pepper salad with lots of rice and lafa, Egyptian flat bread. 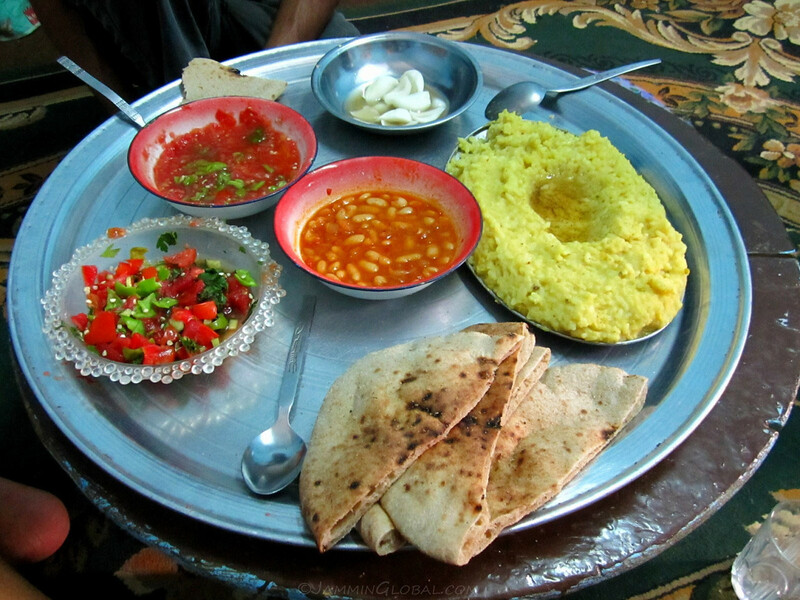 There are no individual plates as the Bedouin habit of communal eating is still strong, which I really enjoyed. It breeds a sense of trust and creates strong bonds. 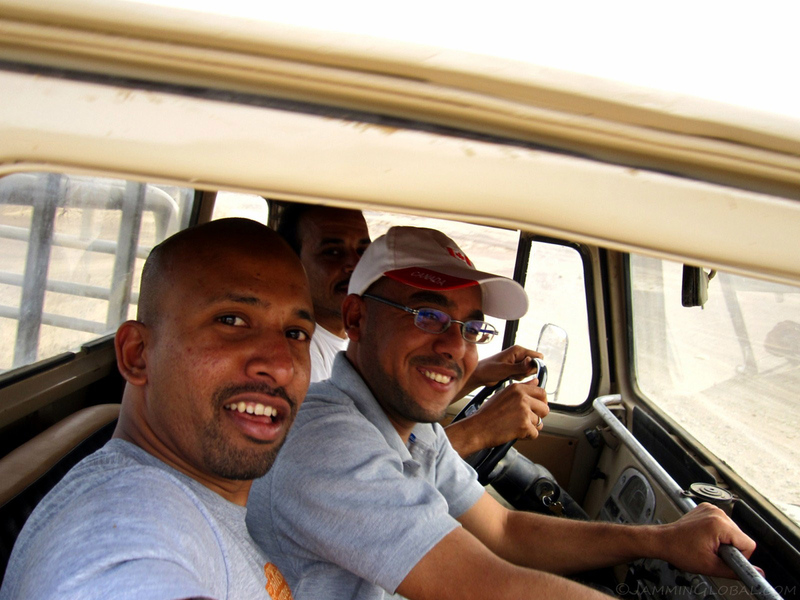 After a short nap through the hottest part of the day, Hamada and his friend, Taheer, took me for a tour around the oasis. We stopped at this spring where tall pines trees were growing. 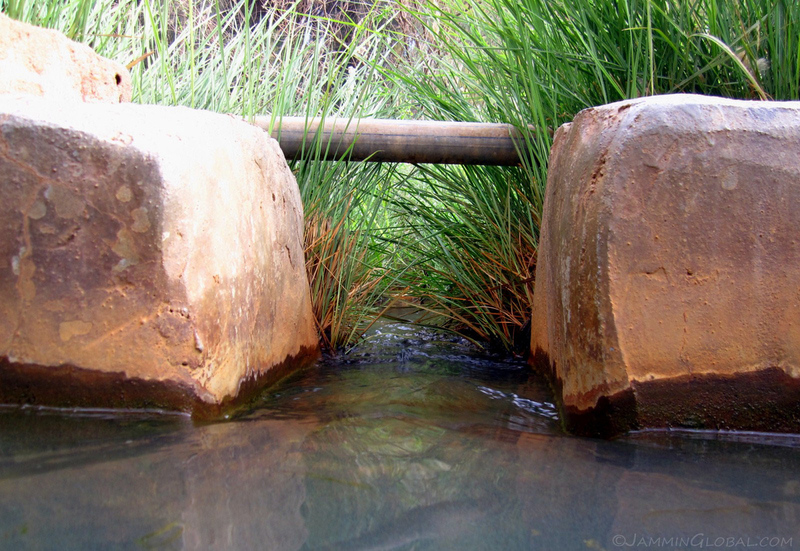 There was a tank built around the spring, which was feeding water to the nearby area. 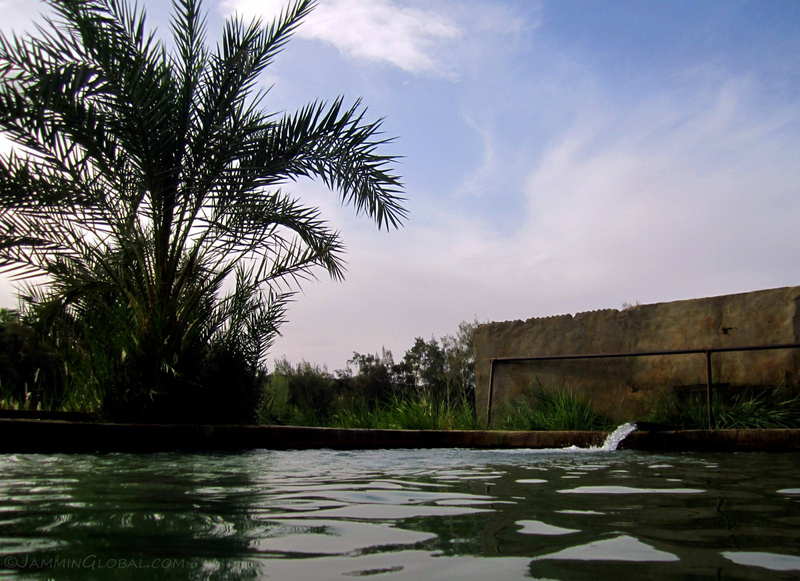 …and we jumped in to cool off with the fresh water flowing from aquifers deep underground. 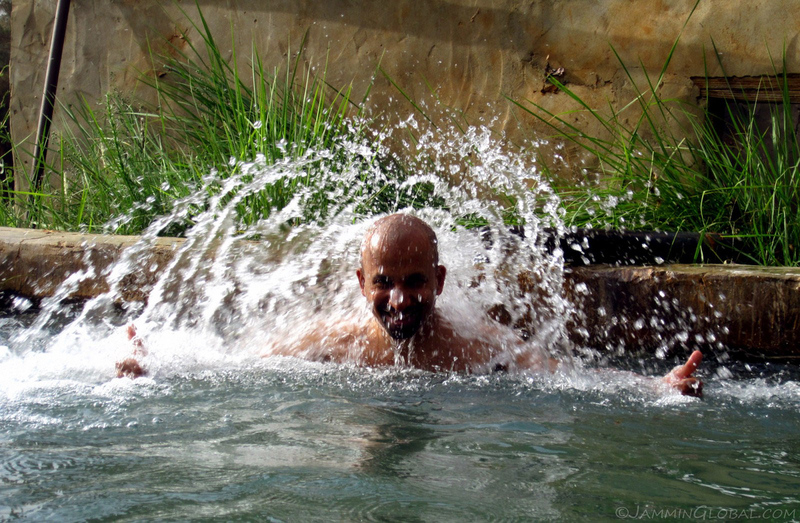 The force of the water gave me an excellent massage. 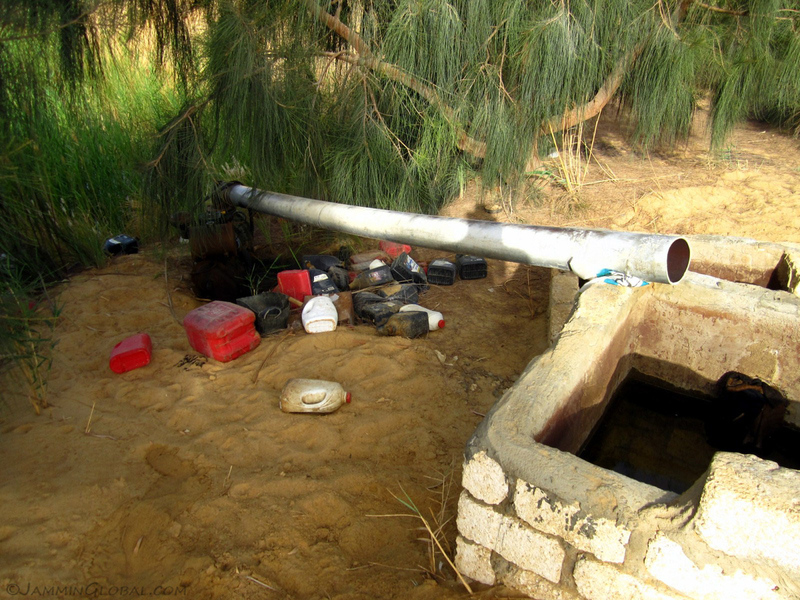 The exit from the tank flowing out to irrigate the land. Where does all this fresh water come from? 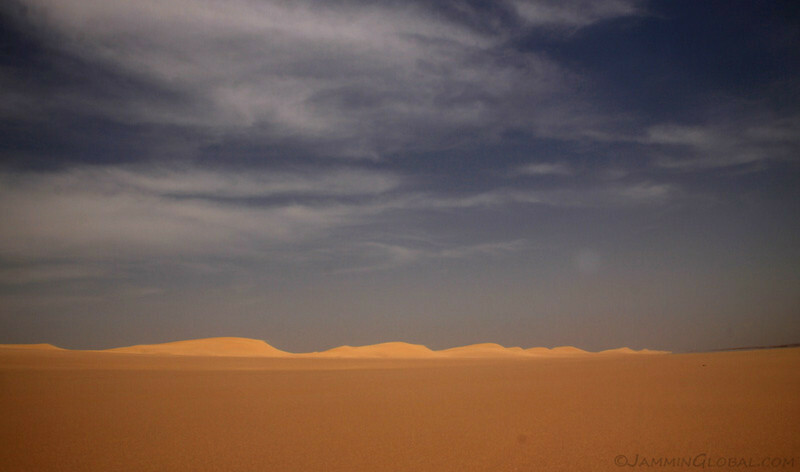 Surprisingly, deep under the parched surface of the Sahara lies a vast quantity of ground water in aquifers. Most of this is fossil water, meaning that it got there millions of years ago and is not being recharged by rain water, so it is a non-renewable resource, like oil. 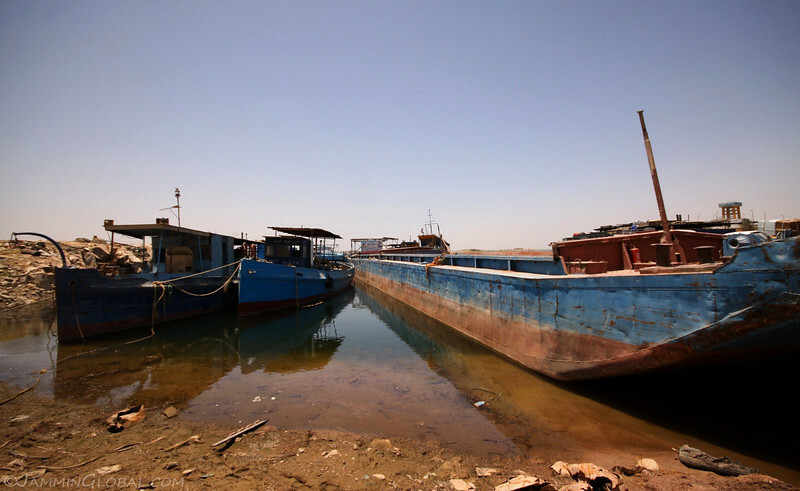 At Bahariya, some of its water is recharged by rains but the rate of extraction is exceeding the rate of replenishment making for an unsustainable future. 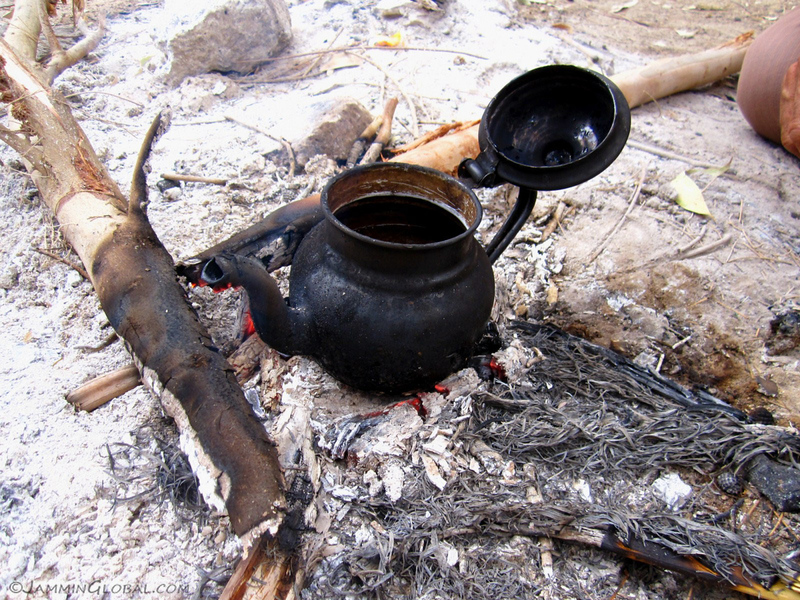 …a pot of tea that looked well used on open fires. 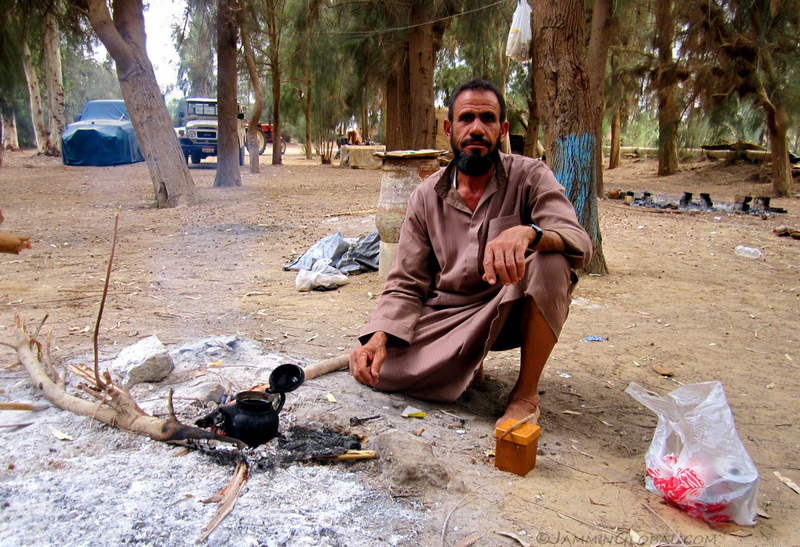 Hamada’s friend who was running this spring looked like a proper Bedouin just settled after years of roaming the desert. 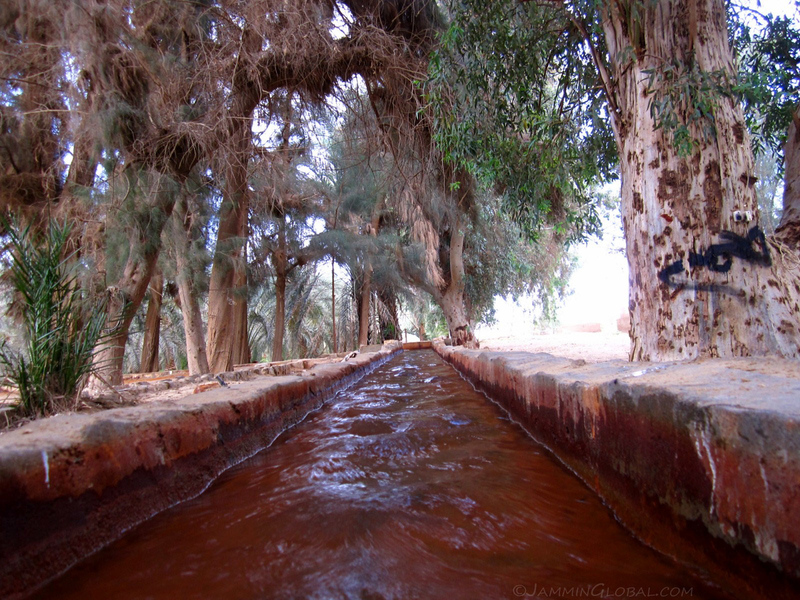 A moss and sediment-lined canal flowing through the spring, nourishing the giant trees. Right outside the spring was the desert, where the greenery stopped. Out of reach from water and life quickly becomes constrained. 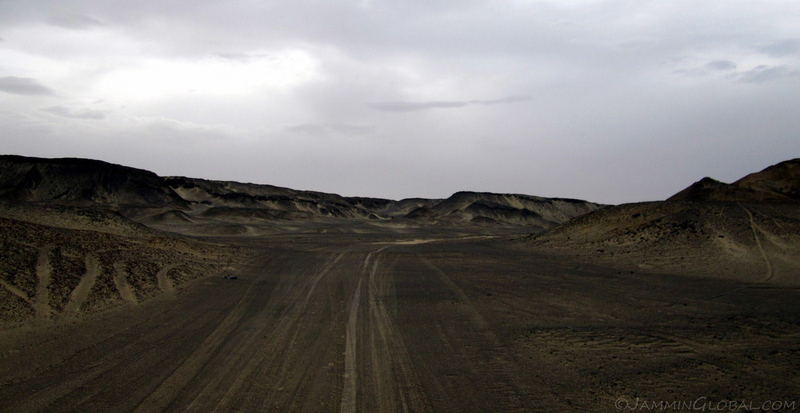 We headed out on a route through a sandy valley. 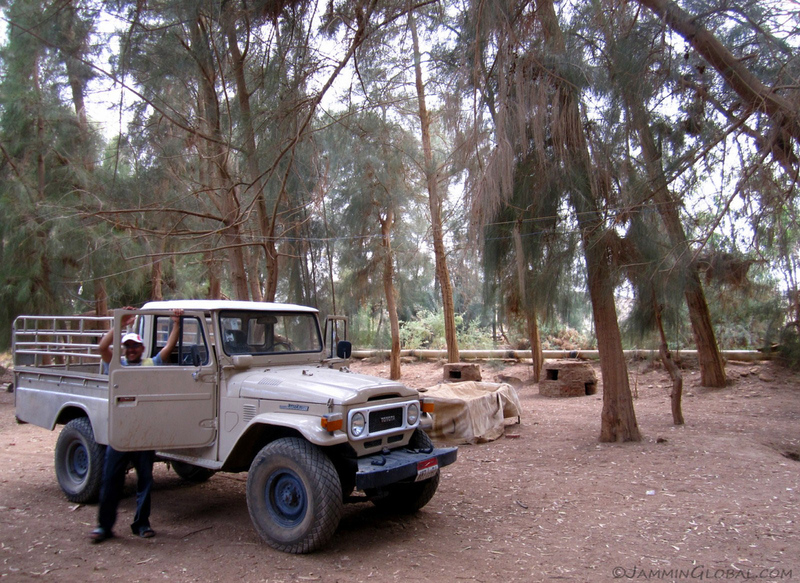 Taheer driving us in a trusty old Toyota Land Cruiser. Passing by the English Mountains, which were capped in black rock. They got their name as this is where the British were perched looking for invaders from Libya during World War I.
Taheer was a warm and friendly soul with heaps of experience of desert driving. 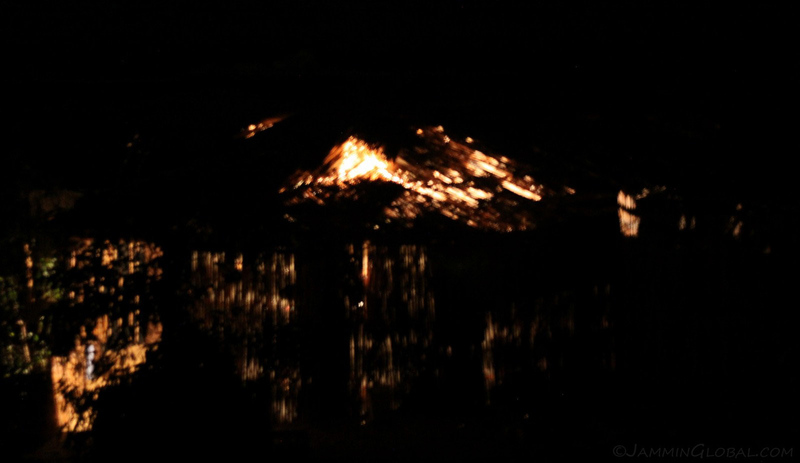 The landscape looked quite alien, even moon-like. 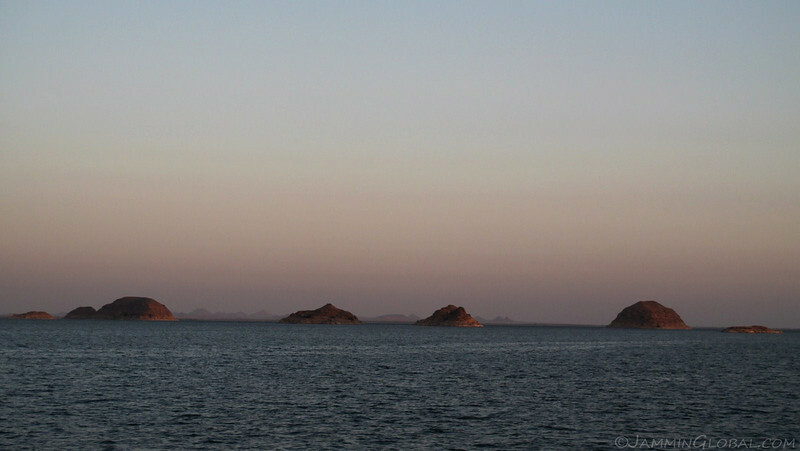 This area is the southern end of the Black Desert, which a few kilometers to the north of here is dotted with volcanoes covered in the same black rocks. We stopped at a well that exposed the geologic past of this area. 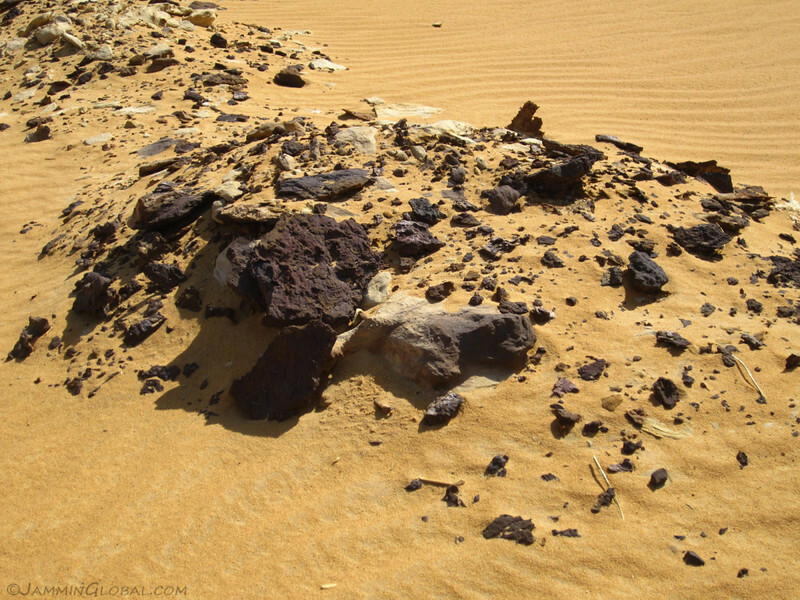 The distinctive sedimentary layers reveal the changing conditions of this basin as it shifted from wet to dry periods with the most recent drying out of the Sahara beginning only about 6,000 years ago, which coincides with Egyptians concentrating around the Nile and the growth of their famous civilization. 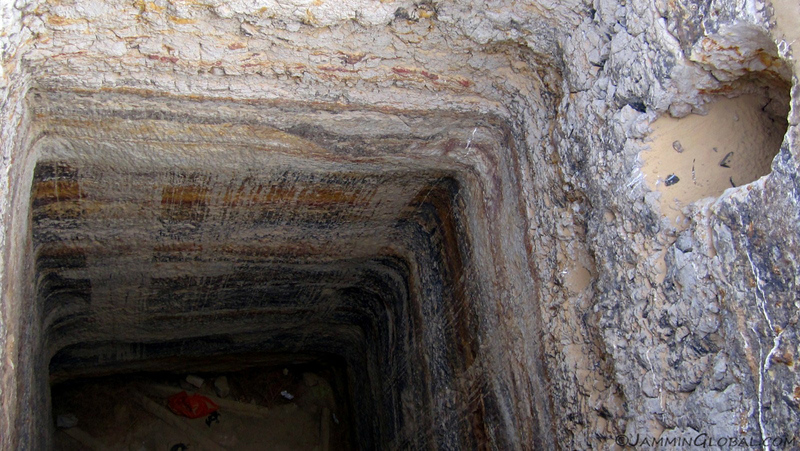 Dinosaur fossils have also been found in these sediments, indicating the past richness of fauna and flora. 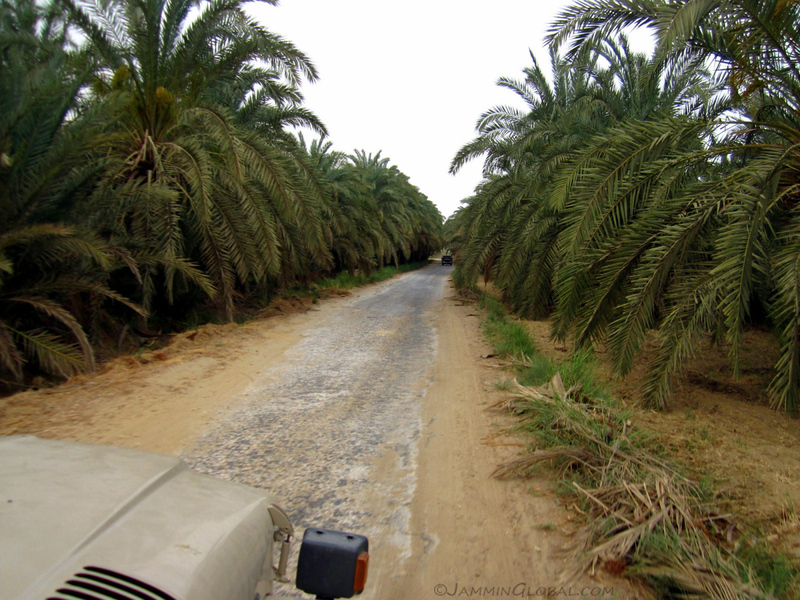 We exited the Black Desert and headed for another oasis. 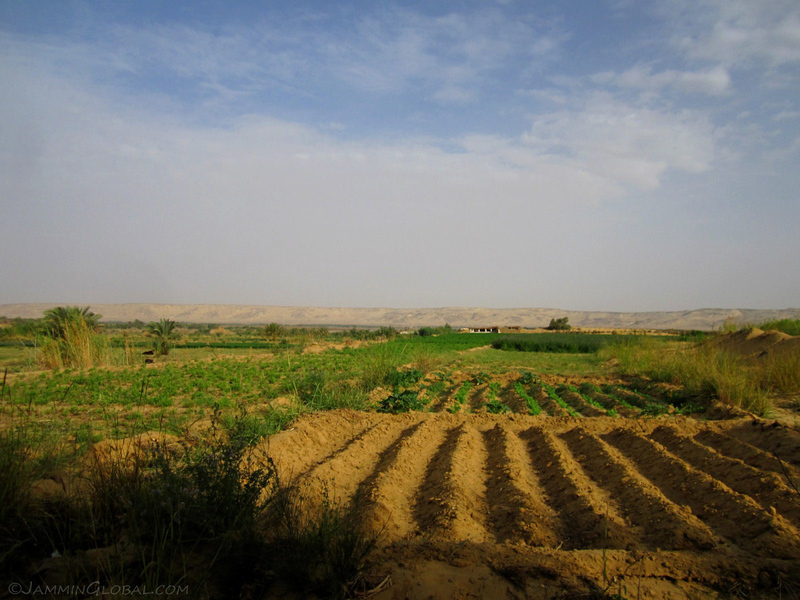 This was just north of Bahariya where most of the region’s agriculture takes place. Besides dates and olives, guavas are a cash crop here. 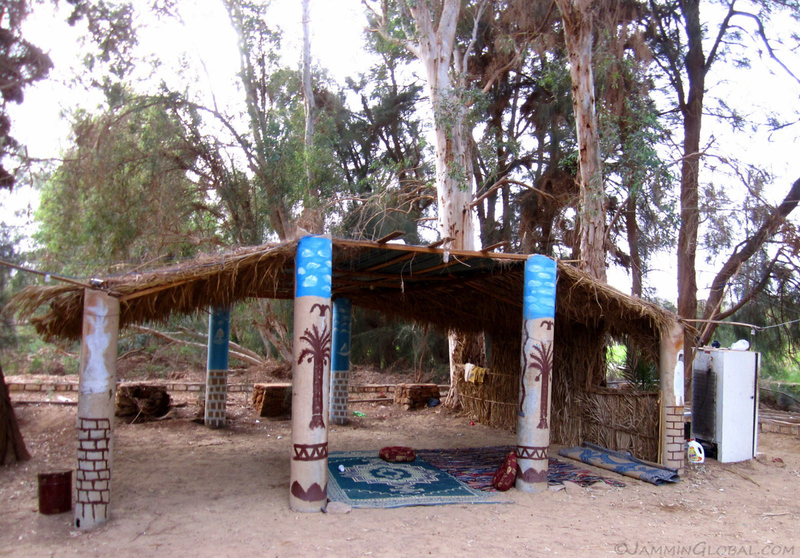 …that Hamada and Taheer had recently acquired and were looking to develop into an eco-tourist lodge. The location was fantastic with sweeping views from a small hill on the property, where they laid down a mat and we just relaxed and chatted about all things. They said when they acquired it, this place was all sand, so they put up the fence, built a rough shelter and were slowing developing it. 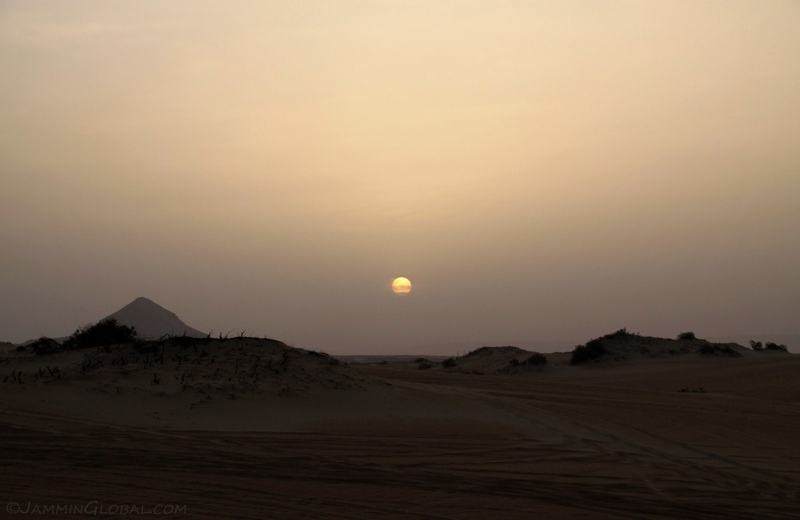 The hidden sun was throwing beautiful light on the nearby hills and the surrounding sand dunes. A panoramic view from atop the hill of this large oasis sustained by free flowing underground water, that even collected into a small lake. Click here to see the high resolution version. 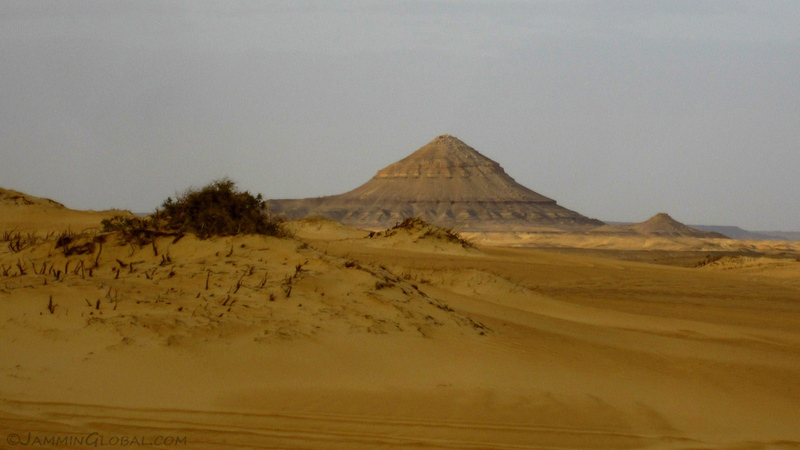 The aptly named Pyramid Mountain, shaped by the weathering of its stone by the fierce desert winds. 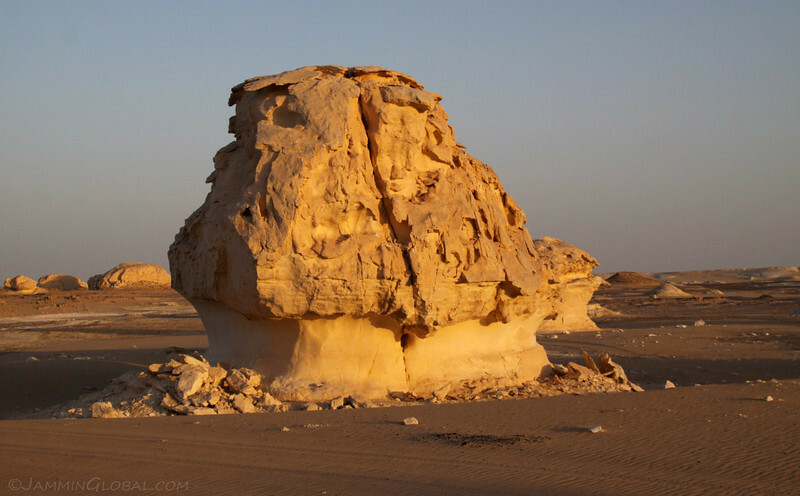 I thought the Pharaohs might have gotten the idea of building their pyramids from natural shapes such as this, but it was most likely just an evolution of flat tombs with stones piled on top. 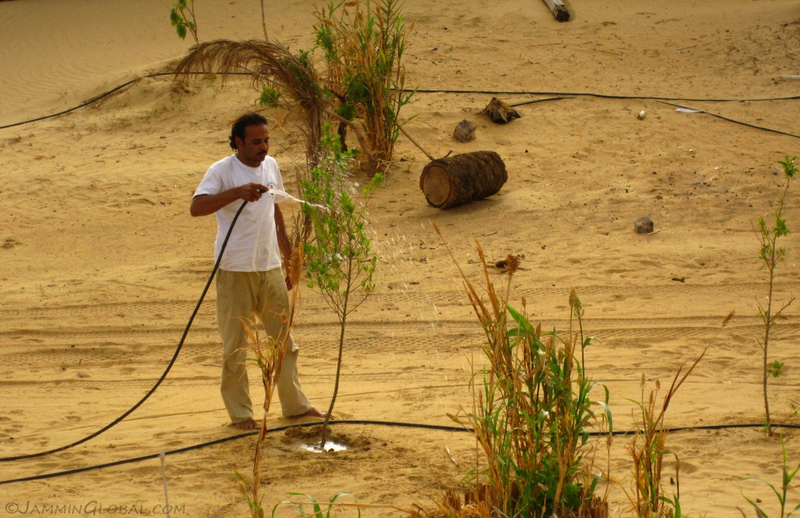 Taheer watering the future trees of his property. 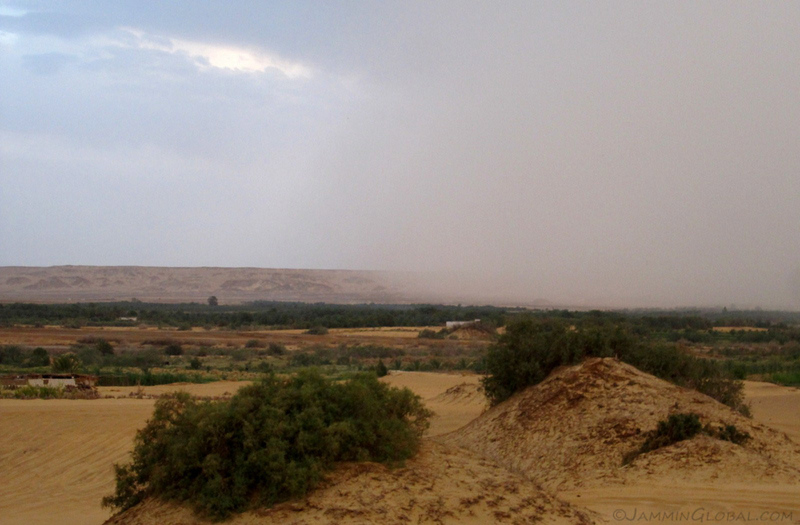 While we sat and relaxed on the hillock, I saw what looked like a sandstorm blowing in, but the others didn’t flinch and it blew over without much effect. 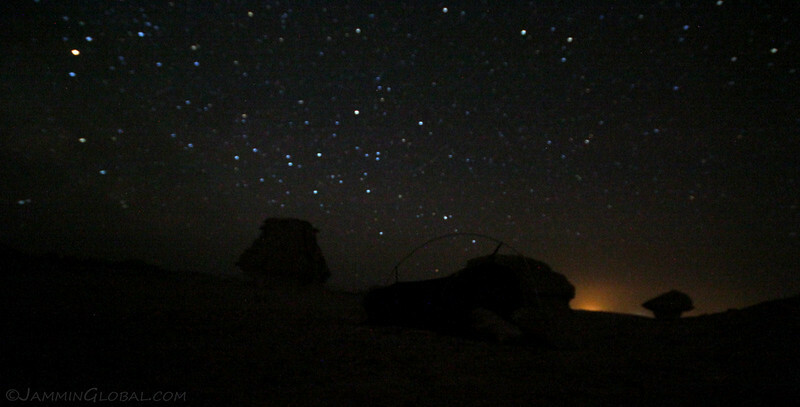 I was enjoying being out in the desert and asked Hamada if we could sleep outside, under the stars, which they said they regularly do. 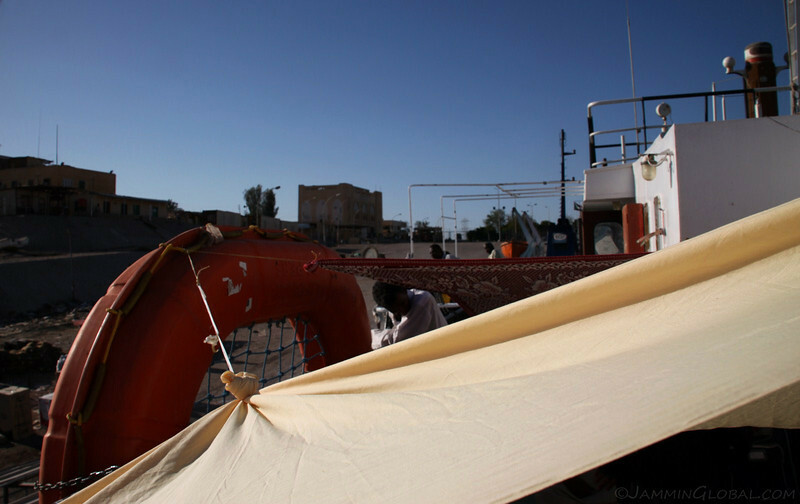 So, we went back into town, got some supplies: food, water and sleeping bags and spent the night out in the desert. 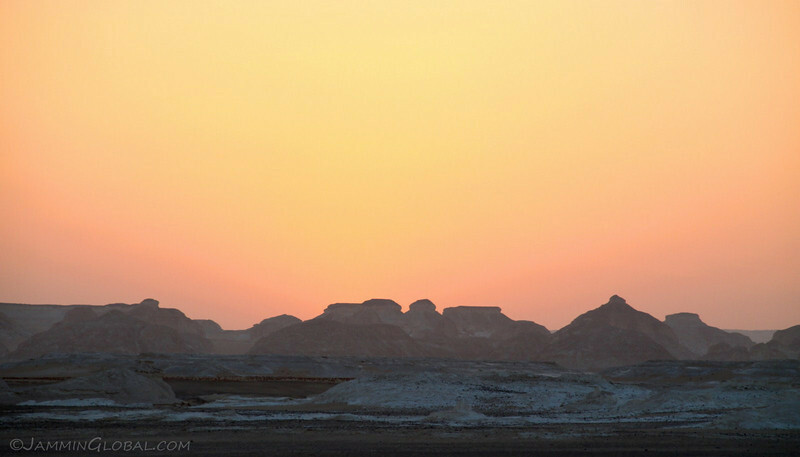 I easily awoke at 5 am to see the desert changing from night to day. 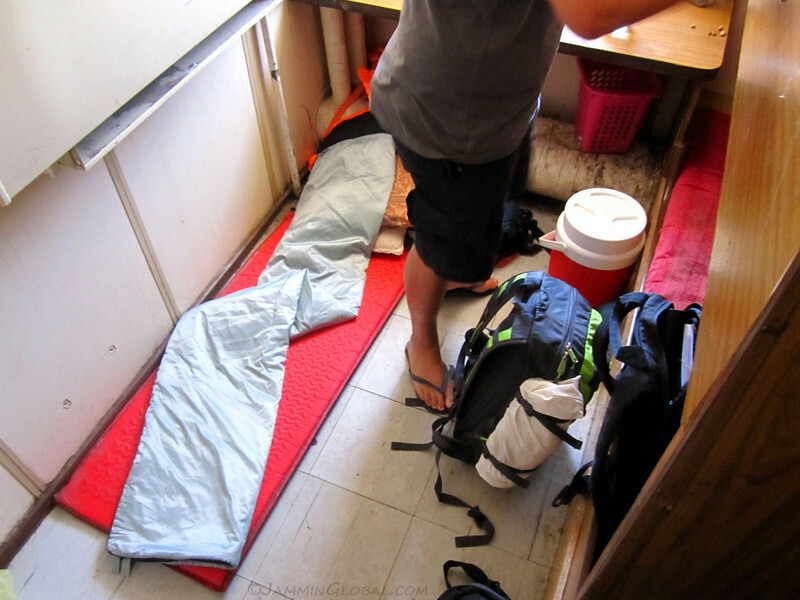 It wasn’t as cold as I expected but I put my silk liner inside my summer sleeping bag and that was sufficient. 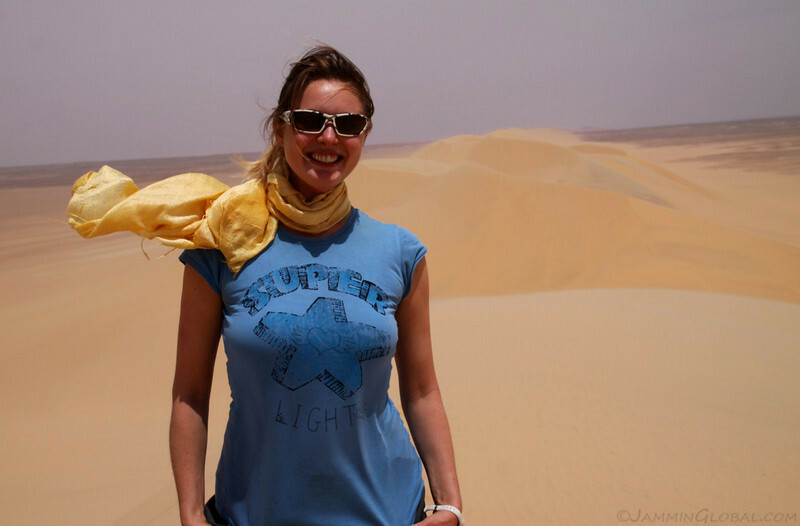 It did get a bit sandy, so I covered my head with a t-shirt. Our star, the Sun, rising above the haze by the horizon, next to Pyramid Mountain. 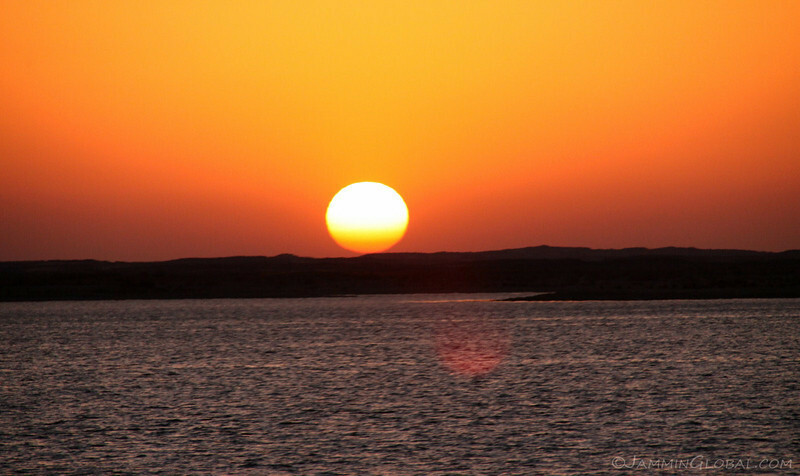 You can imagine such a sight inspiring the ancients into deifying this experience and creating Ra, the Sun god. 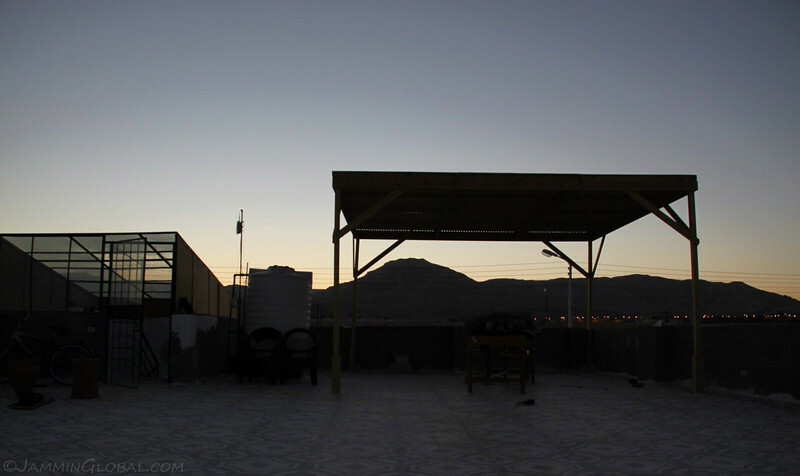 The first rays cast a beautiful light across Hamada and Taheer’s desert lodge. I couldn’t go back to sleep once the Sun was up, so I explored around and came across this pump that had fuel containers scattered around it. 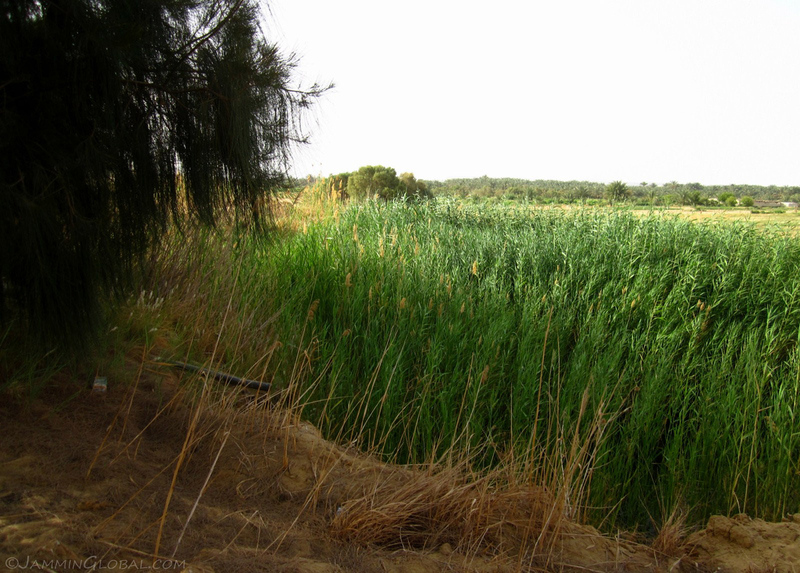 Densely-growing alfalfa near the water pump. 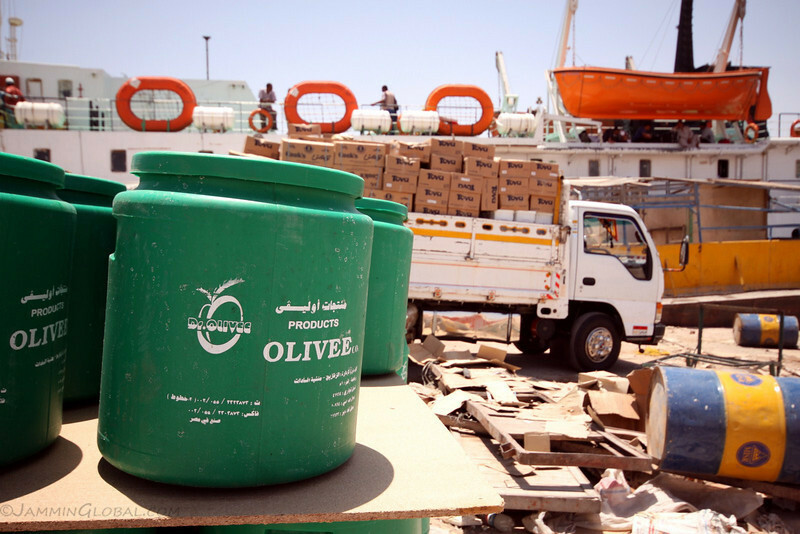 This is the main fodder for donkeys, a key transport if you can’t afford a vehicle here. Freshly sowed fields sustained by water from the pump. It was just past 7 am and the Sun was already pretty intense. 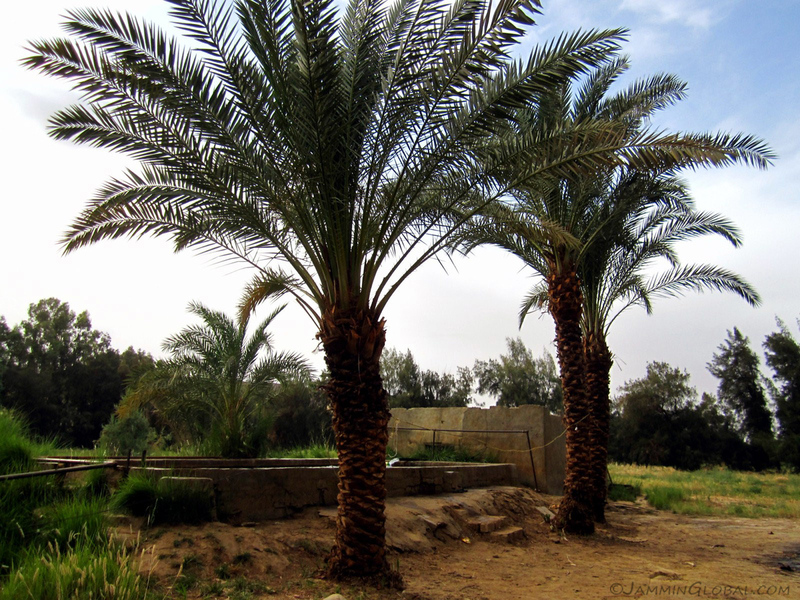 Back on the property that was fenced in with date palm leaves. 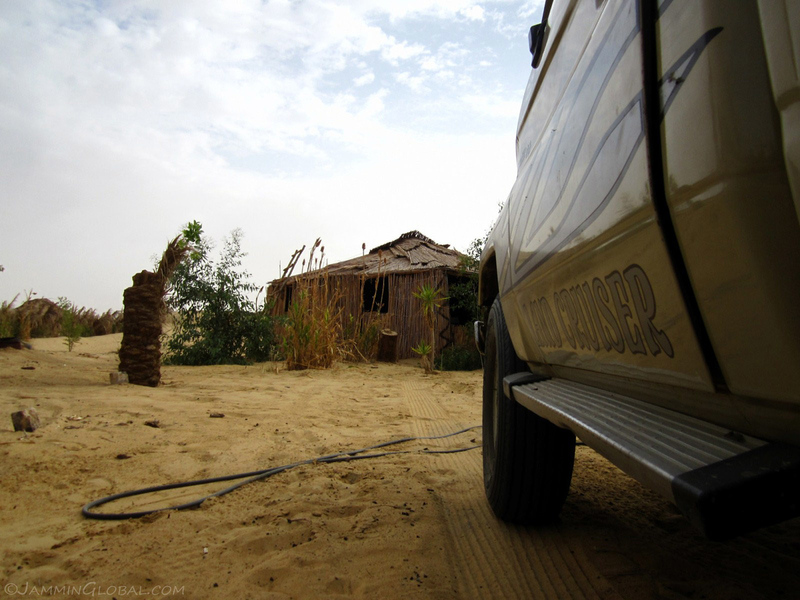 The Land Cruiser, at home in the desert. 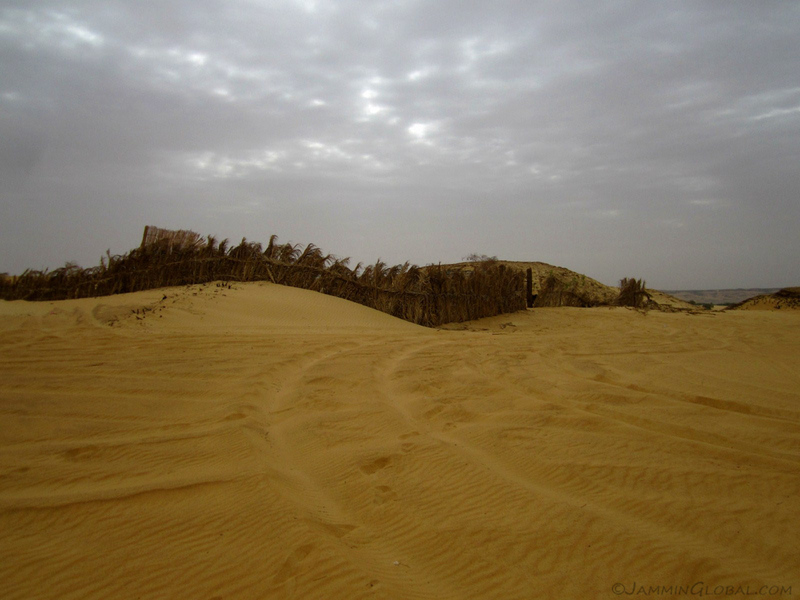 The date palm fence rising up from the sea of sand. 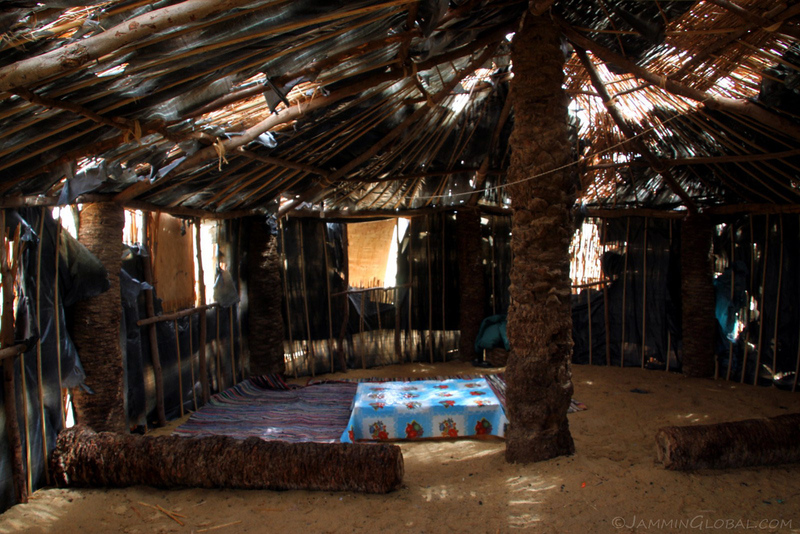 The inside of the hut on their property, made with date palm trunks and lined with plastic to keep the sand out. It’s still a work in progress. 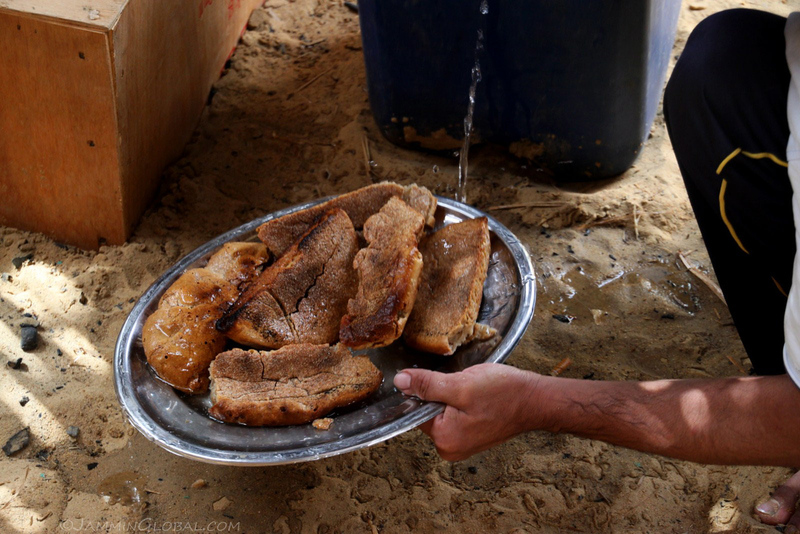 Hamada preparing some Bedouin bread. 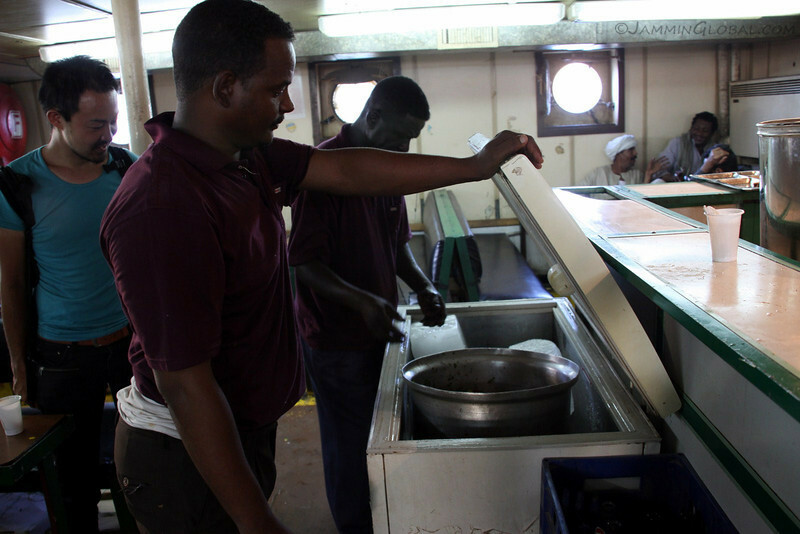 It’s prepared by initially baking it under the sand and then left to dry and become rock hard under the Sun. 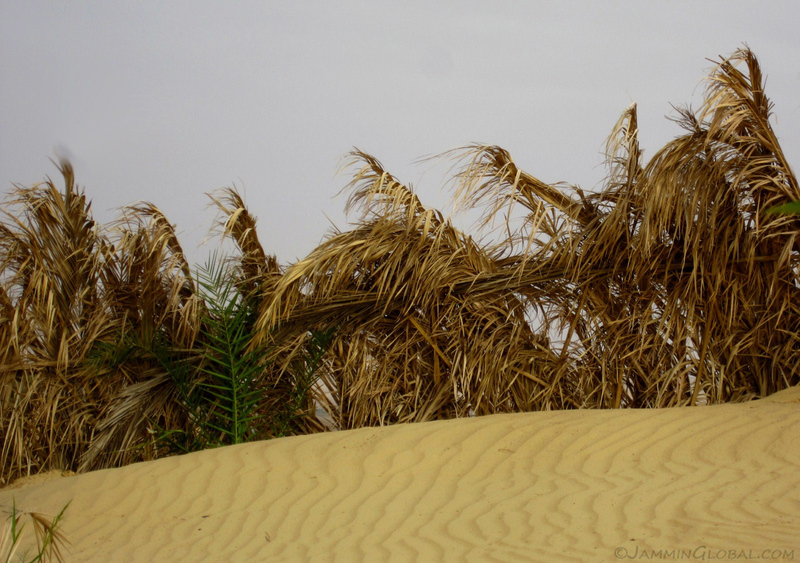 This way it can be taken on long journeys across the desert and simply needs to be rehydrated to become edible again. It might sound strange to put water on bread, but it was surprisingly very tasty and not soggy. 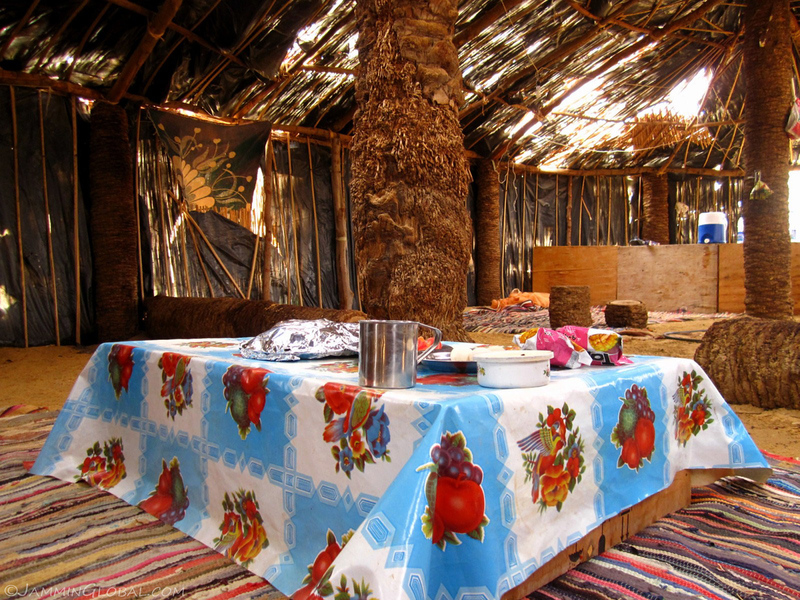 An inviting meal setting in a date palm hut in the desert. 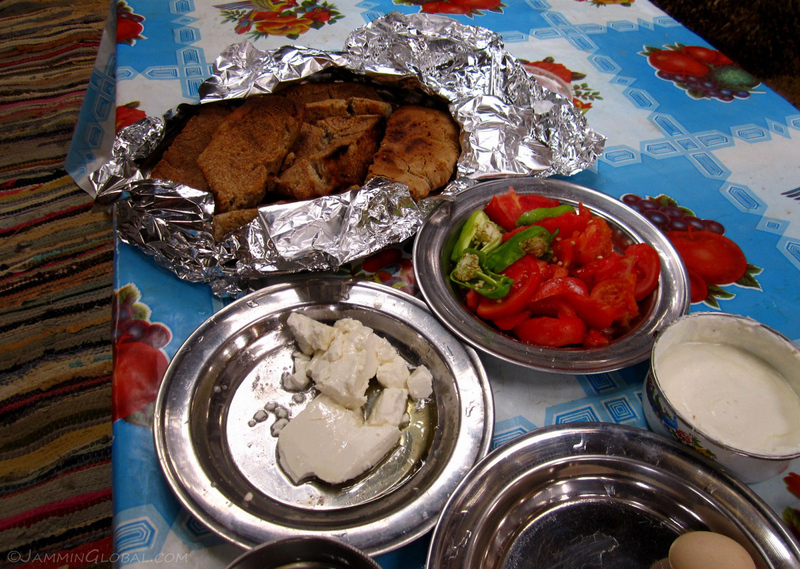 A tasty brunch of Bedouin bread, goat cheese, tomatoes and peppers, yoghurt and boiled eggs. Mmm, mmm, good. 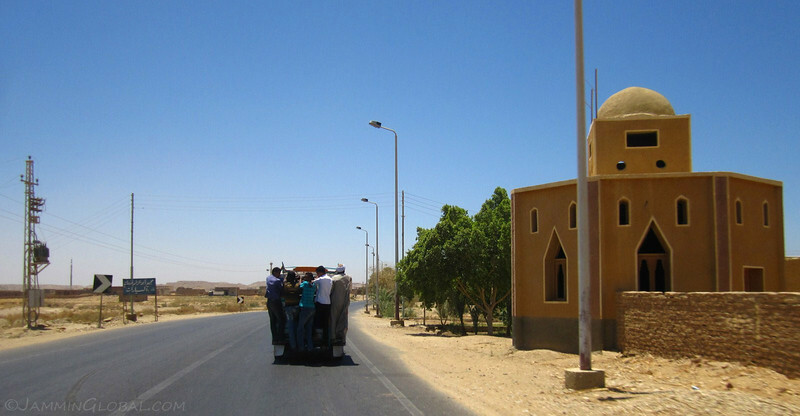 We got back in town and being a Friday, Hamada was heading for prayers at the local mosque. I asked if I could join him and he was happy to get me a jellabiya, the free-flowing dress of Arab men. His mother said I could pass as his brother. Since non-Muslims aren’t allowed into mosques, especially during prayers, Hamada told me not to speak to anyone (of course since I couldn’t speak more than a few words of Arabic) and to just follow him through the motions of prayer. He was quite impressed at how well I passed for a practicing Muslim. 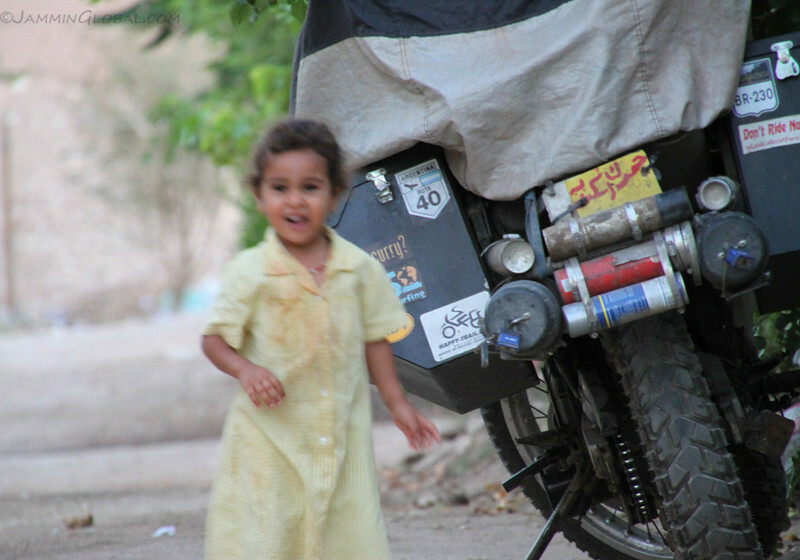 …the kids of Bahariya. 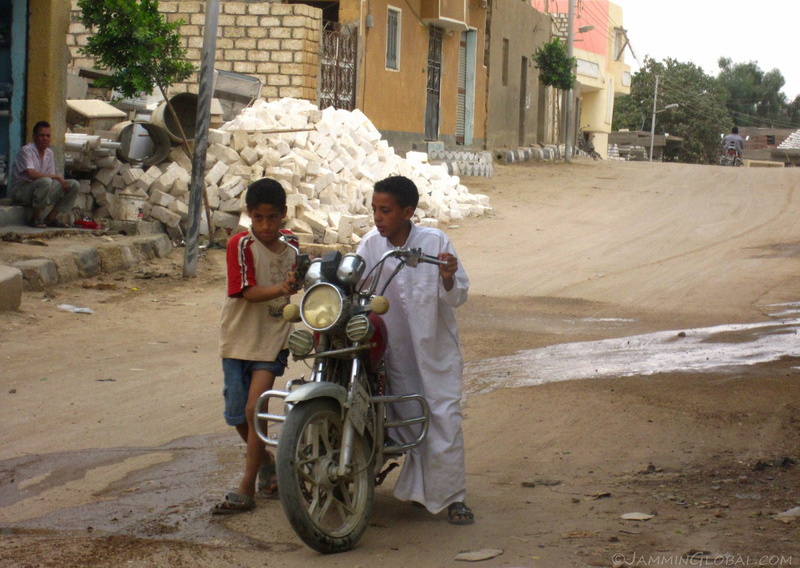 What were these two up to with this motorcycle? This reminds me of my cousins who said they used to push their dad’s scooter up a hill in our village outside Madras to learn how to ride without using any petrol. We spent some time meeting some of their friends and of course, drinking lots of mint tea. 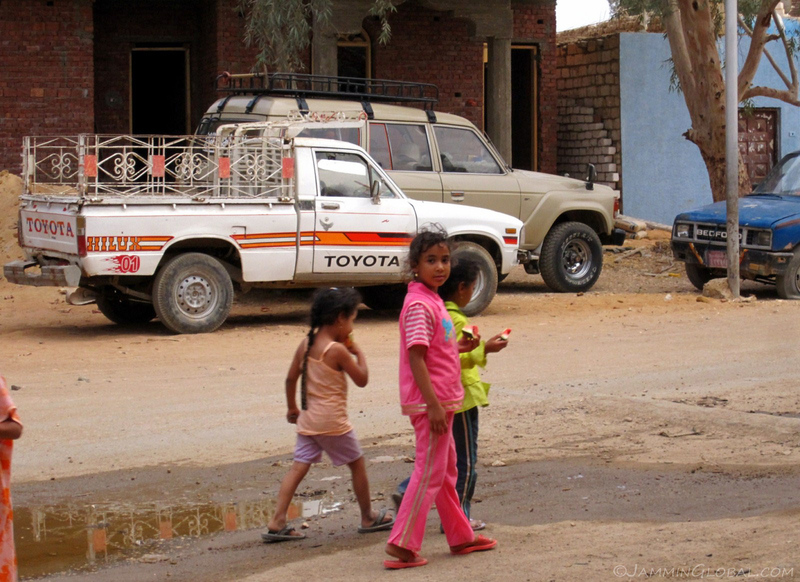 A strange thing about Bahariya is that almost 90% of the vehicles are Toyota Land Cruisers. This is an FJ40, the classic body style, built from 1960 to 1984. 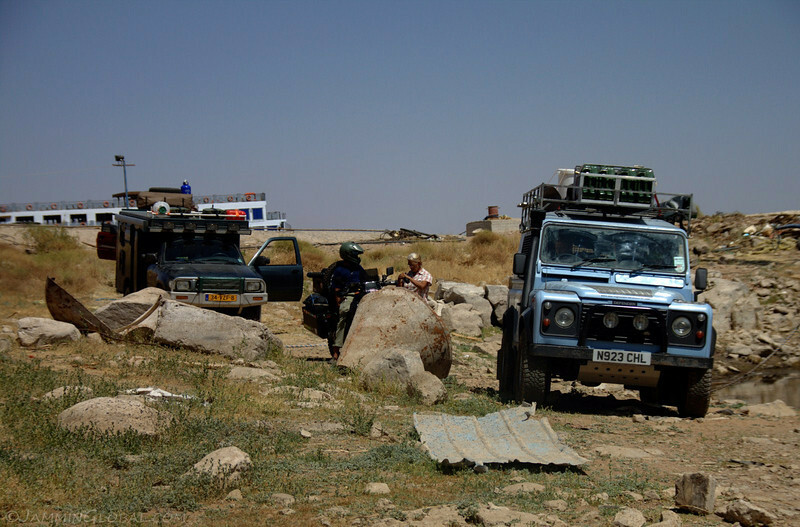 The world over, this particular vehicle has been relied on for rough and tough driving and is still considered the most dependable 4×4 by rebels, such as those just across the border in Libya. 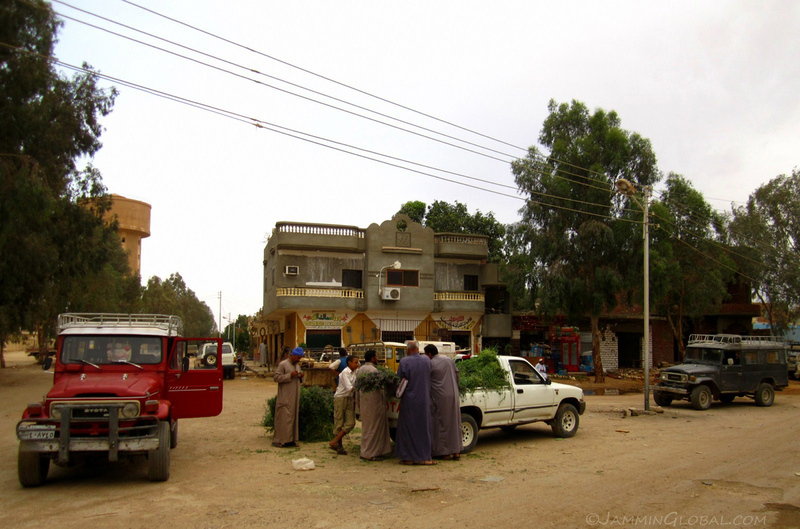 A white Toyota Hilux (another staple 4×4) stops in the square to sell some freshly harvested alfalfa and passersby stop to pick some up for their livestock. At one point, I counted 9 different Land Cruisers in my field of view. 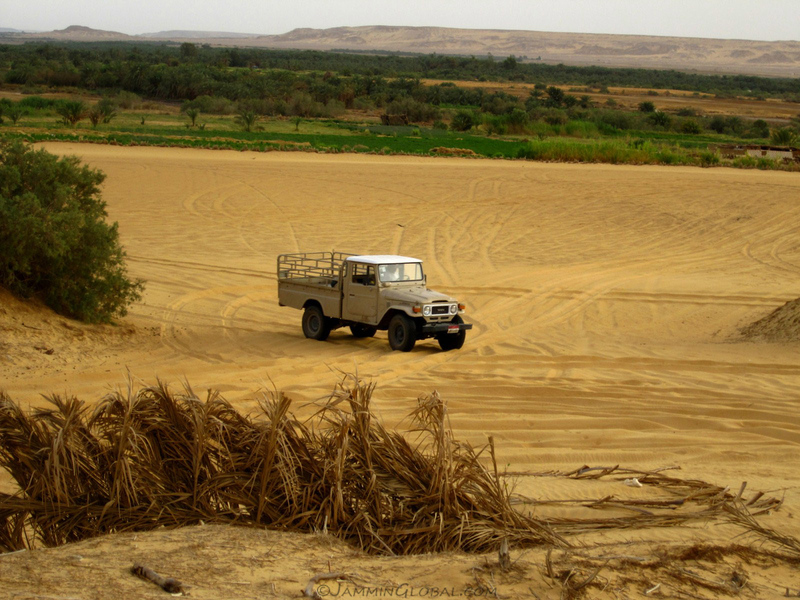 Hamada explained that as the Egyptian Army upgrades it Land Cruisers, they sell off the older models cheaply to the public, who grab them up as dependable desert cruisers. This gang of young girls strutted by, oozing confidence in their stride and maybe collecting protection fees from the shopkeepers. 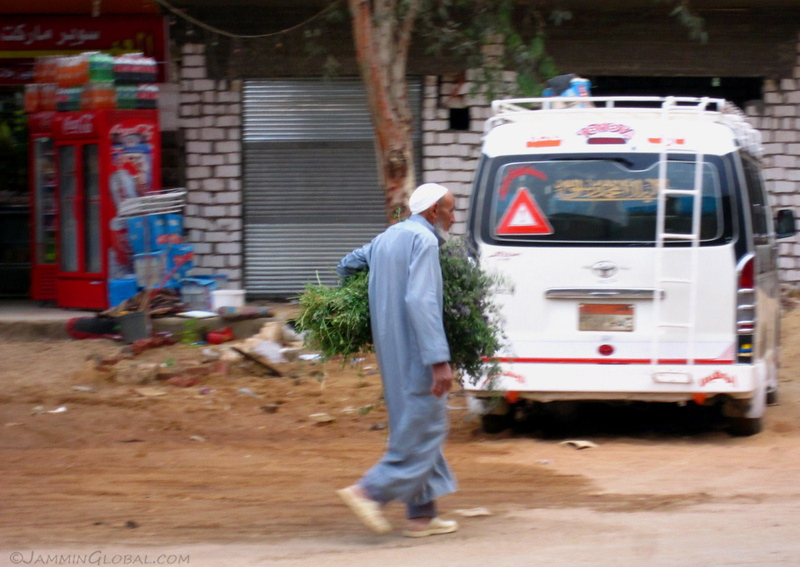 An elderly man walking away with some fresh alfalfa. 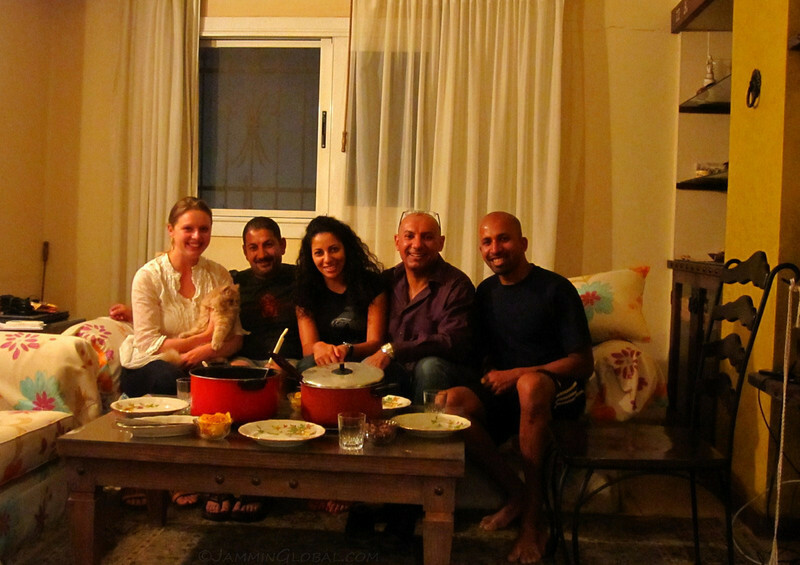 Back at Hamada’s house for a tasty dinner of rice with lentils, lafa, beans, pickled onions and tomato salad. The rice with lentils looked like and tasted very much like a comfort food that my mother makes. 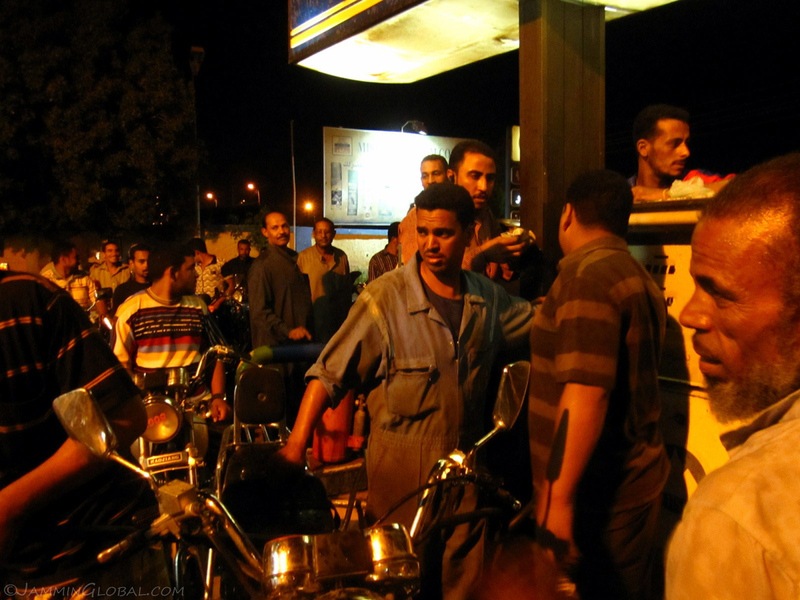 That evening, I managed to fill up with petrol as there wasn’t any the previous day and the fresh delivery caused a rush but Hamada told me to go to the front of the line, which no one seemed to mind. With 40 liters (10.6 gal) in my tank from Cairo, I was good to go to the next oasis of Dhakla, but it’s always safe to top up, especially as I wasn’t sure of fuel availability further south. 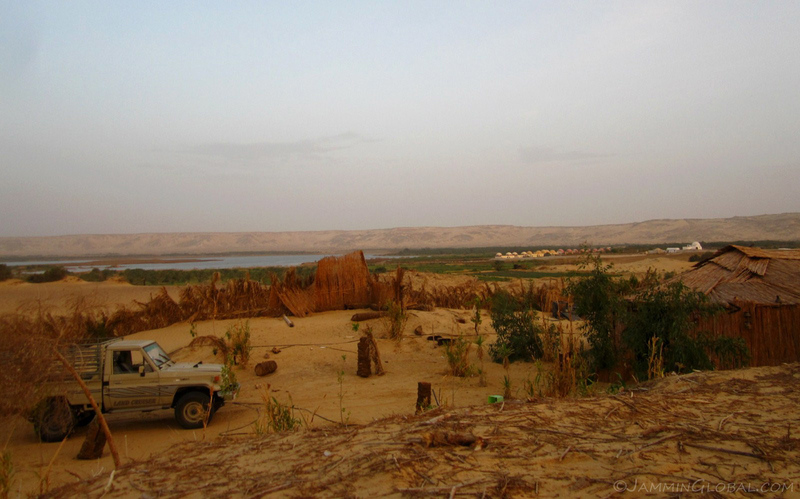 Hamada was a great host for my two days in the oasis of Bahariya and I was thankful to experience a bit of Bedouin culture, especially as most of it is eroding with influence from Cairo. 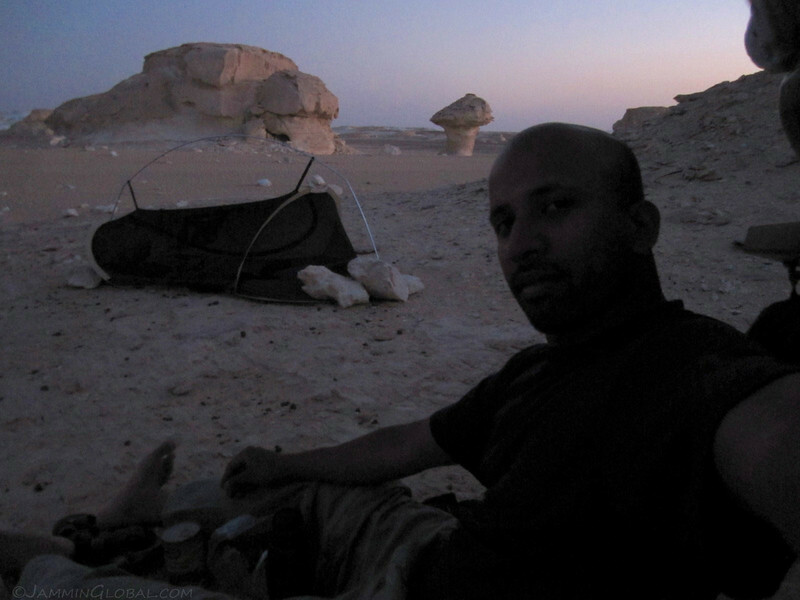 The night out in the desert with Taheer and Hamada was a sublime experience and got me geared up for some more desert camping coming up in the White Desert. At the end of my two weeks in Cairo, it was finally time to see Egypt’s grandest attraction, the Pyramids of Giza. I spent a couple hours at the Giza Necropolis (the Pyramid Complex) and besides the ancient wonders on display, I took in all the geometrical shapes that my mechanical side enjoys. I also splurged and entered the Great Pyramid, having it all to myself for about 20 minutes, which was an immense moment. The Great Pyramid of Giza, also known as the Pyramid of Khufu (or Cheops). 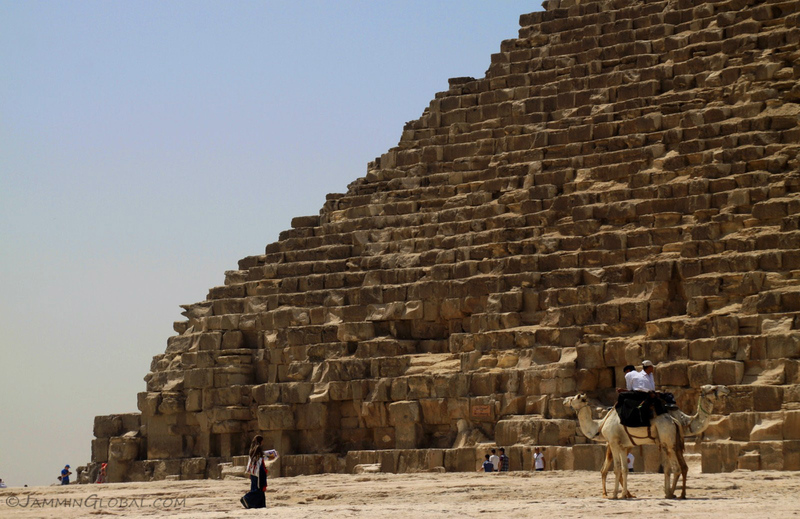 It’s the largest pyramid in the world and was completed in 2,560 BC. It is a massive structure with its base running 230 m (755 ft) and with a height of 146.5 m (481 ft). What’s most impressive to me is that it’s been standing here for the past 4,571 years! And is likely to still be standing for eons to come. 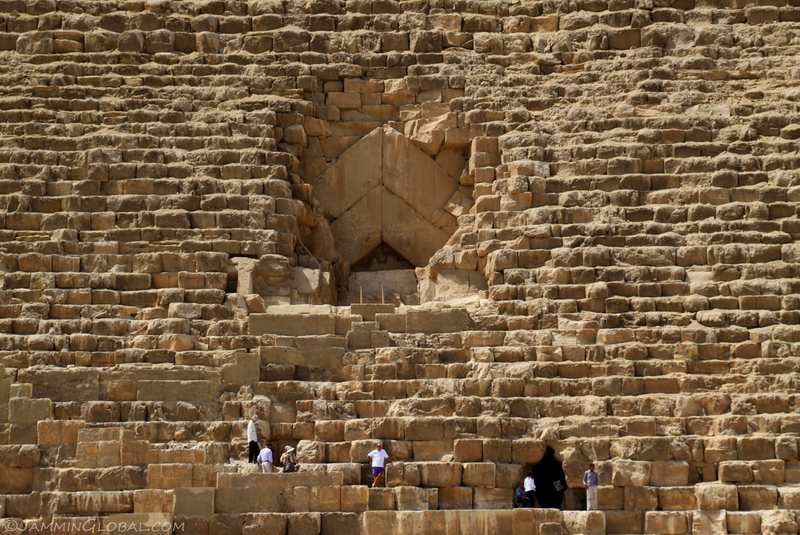 The northeast corner of Khufu’s Pyramid with camel touts yearning for all the tourists to come back. They’ve probably been here too through the ages and this shot could be from any century in the past. 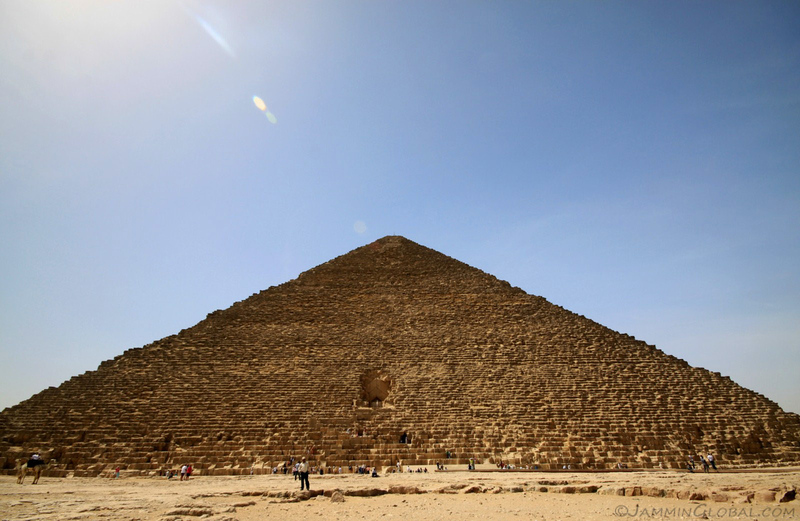 The pyramid is made of limestone blocks of varying sizes and a total of 2.3 million huge blocks are used in its construction. Along the north face of Khufu’s Pyramid, there’s a section of removed stones, which exposes the top of the King’s burial chamber. Huge granite slabs were placed at angles to deflect the weight of the stones on top from collapsing the void of the chamber below. 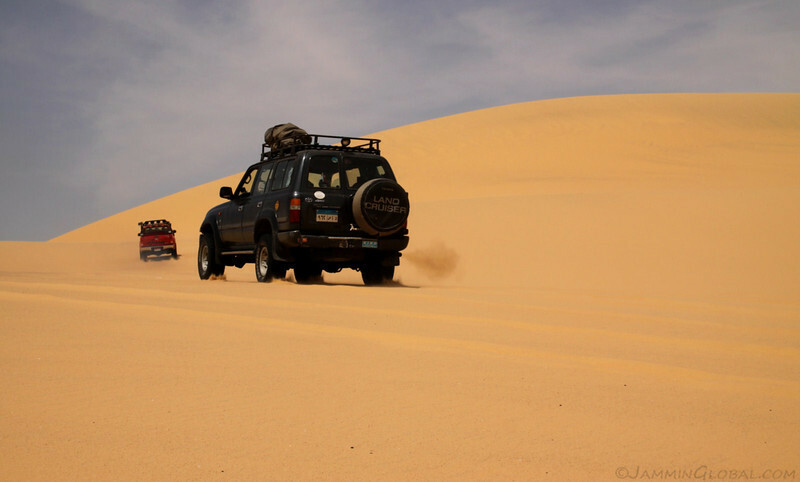 During my stay in Cairo, I had a wonderful chance encounter with a traveler I met in Argentina, Ava, and her CouchSurfing host, Bisso, who has a passion for desert rallies. He was heading out into the Qattaniya Dunes outside the city for the last part in a rally driving course on how to tackle dunes and he invited Ava and me along. It was a fun day playing out in the desert with 4x4s. 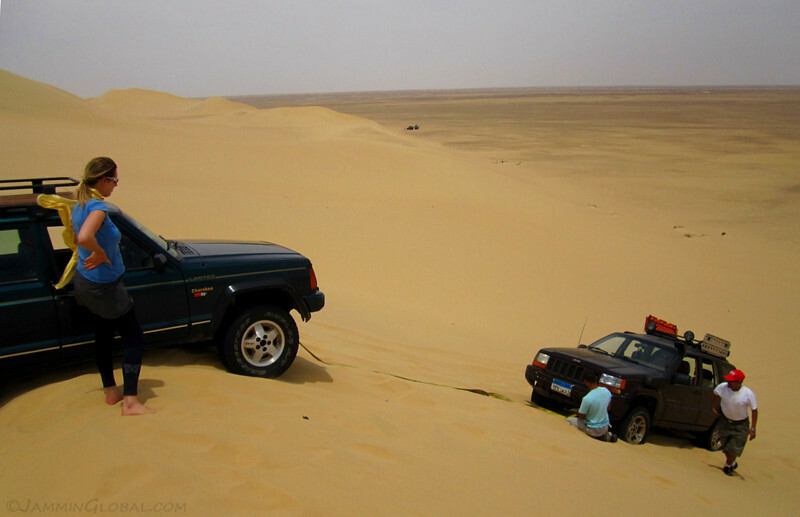 Heading out into the Sahara and Egypt’s Western Desert to the Qattaniya dunes, about 80 kms (50 mi) from Cairo, for a day of dune-bashing – climbing up and over steep sand dunes. Bisso, standing next to his green Jeep Cherokee and Sharif with the Grand Cherokee. They were out here today for the last part of their driver training in desert rallying. 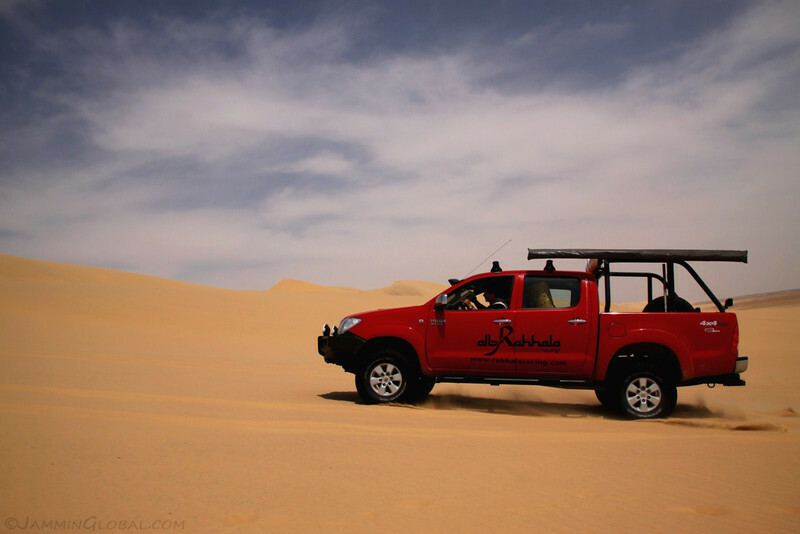 The instructor for the dune-bashing course in the much-coveted Toyota Hilux D-4D pickup truck and the wavy texture of the dunes. A group shot of all the vehicles out for the day while their owners attended the drivers meeting. Besides the Hilux and two Jeeps, there were two LandCruisers and an oddball Daihatsu Terios. 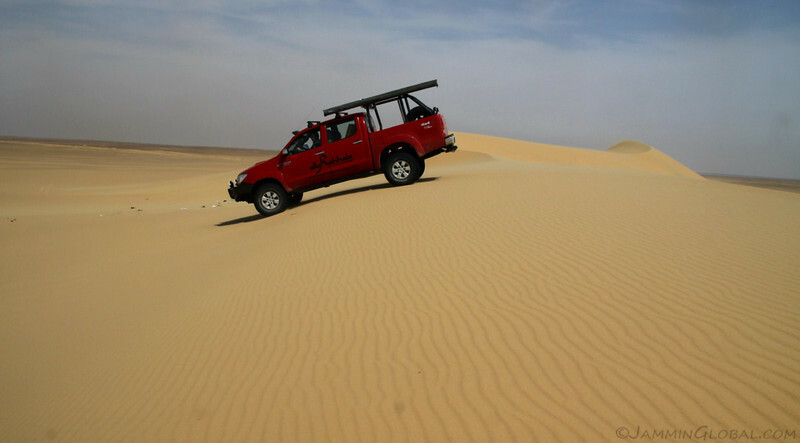 The Hilux took off from the flats up to the crest of the dunes. 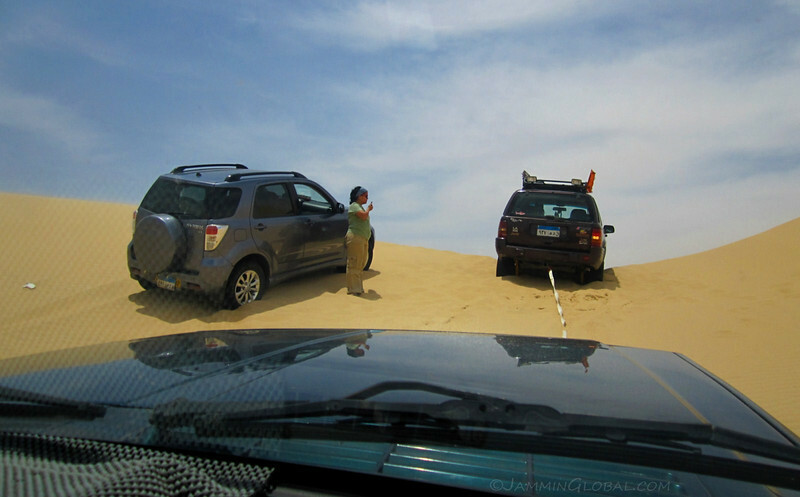 A LandCruiser followed under full power to crest the dune. 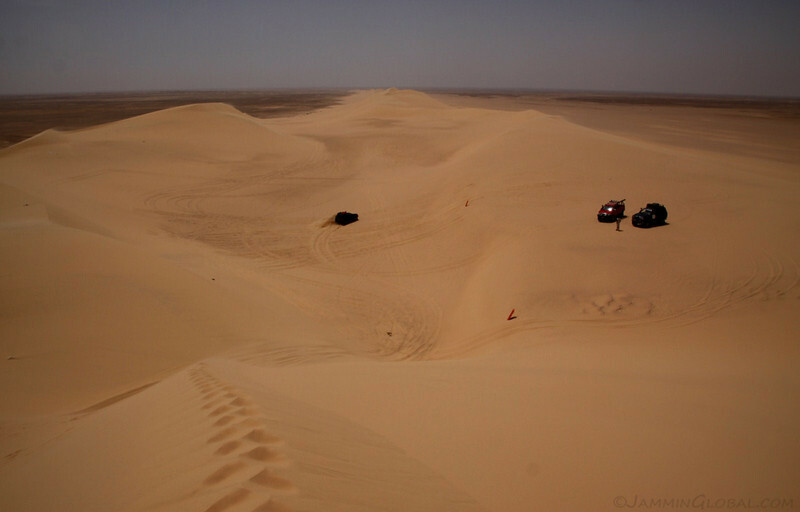 After a few practice runs over smaller crests, the instructor found a set of dunes that the drivers would be tested on. Bisso hanging out on the crest of a dune, picking his line through the course ahead. 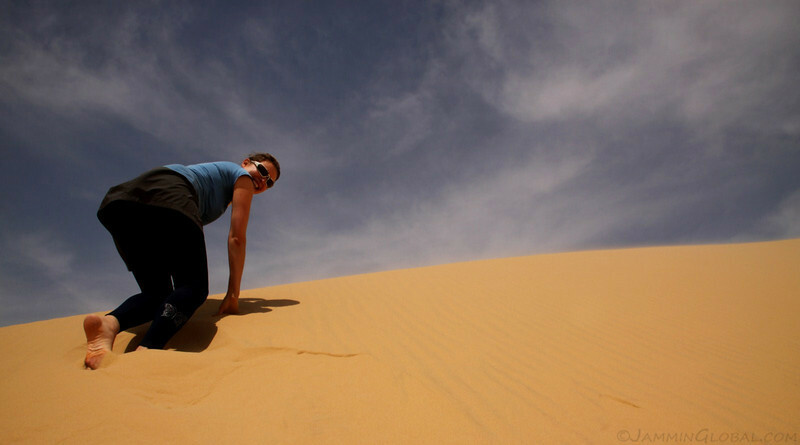 The tricky thing about crossing a huge sandy dune is that you need full power to climb the dune but then you have to throttle back as you reach the crest without losing too much momentum that you get stuck. If you don’t throttle back, the jeep will fly over the crest and best case, you’ll have a hard landing, hurting your suspension and worst case, the jeep will flip over. Bisso was all smiles on this day out playing in the dunes. He was doing the best of the group as he honed in the controls of his Jeep Cherokee, a durable 4×4 respected for its simple and rugged build. 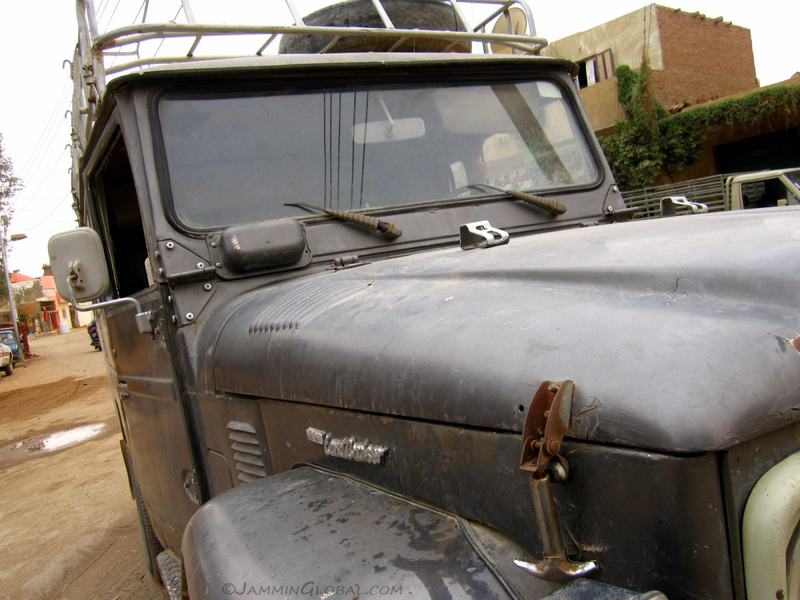 The Cherokee was assembled in Egypt by Arab American Vehicles, a joint venture setup in the 1970s who also assemble other Chryslers and Kias. The domestic Egyptian automobile market is fiercely protected by the government as is evident by their super high import duty on foreign cars and their ridiculously high carnet costs for travelers. 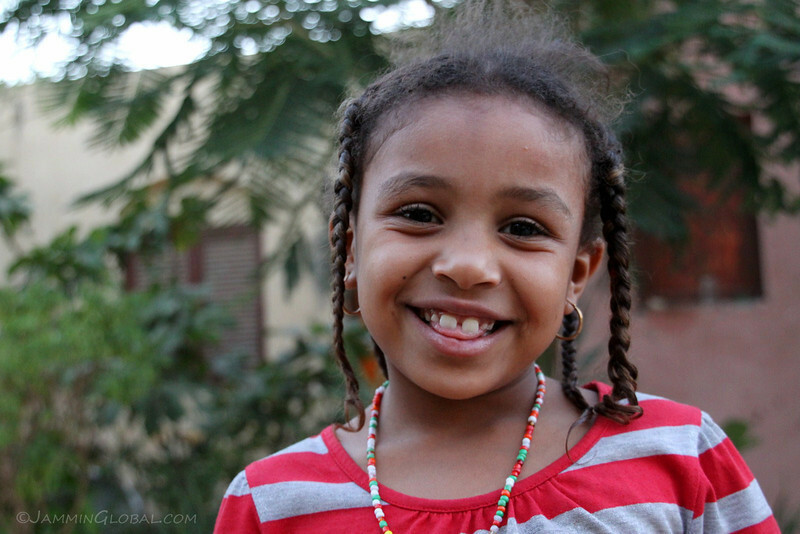 It cost me an extra $600 (in carnet fees) just to temporarily import sanDRina into Egypt, but it was worth it. While the drivers carried on with their course, Ava and I walked the dunes. She’s from San Francisco and we met in Mendoza, Argentina last year as we were both staying with the same CouchSurfing host there. Our paths only crossed for a few hours then, but we made a connection as she had a passion for India and was well-versed in philosophical discourses on the mind and the Universe. I lean a bit towards the utilitarian side in the debate about the meaning of life, while she leans more towards the spiritual and agnostic side. As luck would have it, she contacted me a few weeks back to see where I was and we realized we would both be in Cairo at the same time, so we met up. 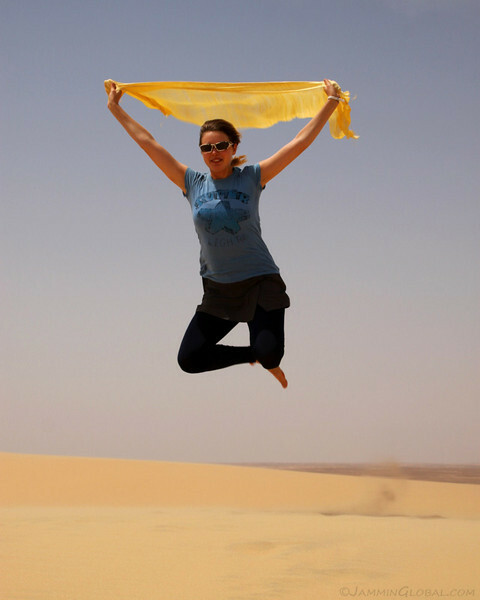 …and then leaping off the desert! 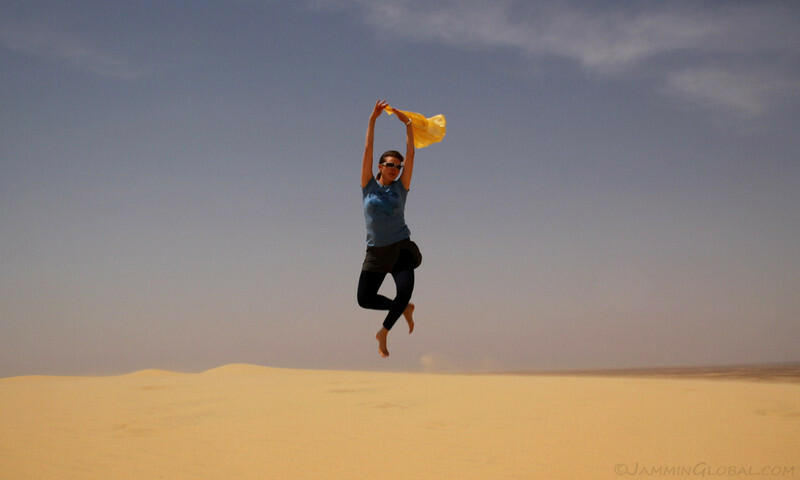 Ava is a free spirit and her positive energy sprung off the desert wanting to be carried away by the wind. 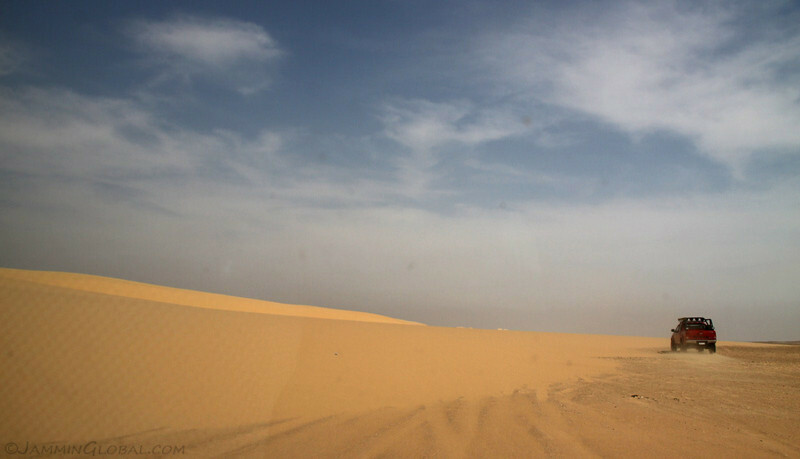 There’s something peaceful about being out in such a grand, open space with nothing but sand and sky in view. Climbing up the steep dunes. Looking back at our footprints on the ridge with the 4x4s going about their rally course. 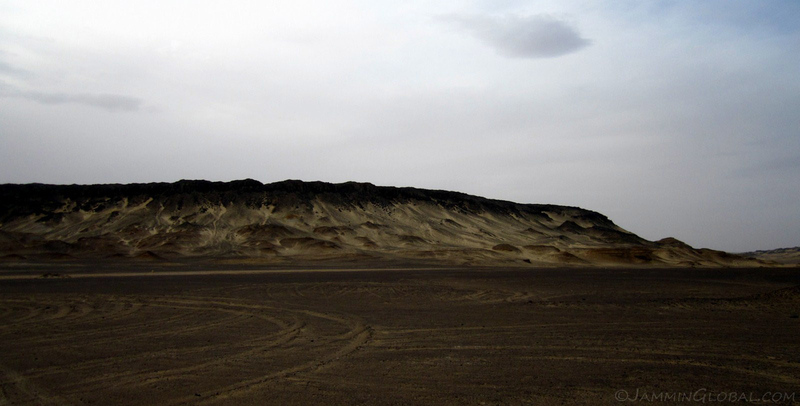 The area was actually a huge flat expanse except for this thin, long sand dune, which probably moved over time with the desert winds. 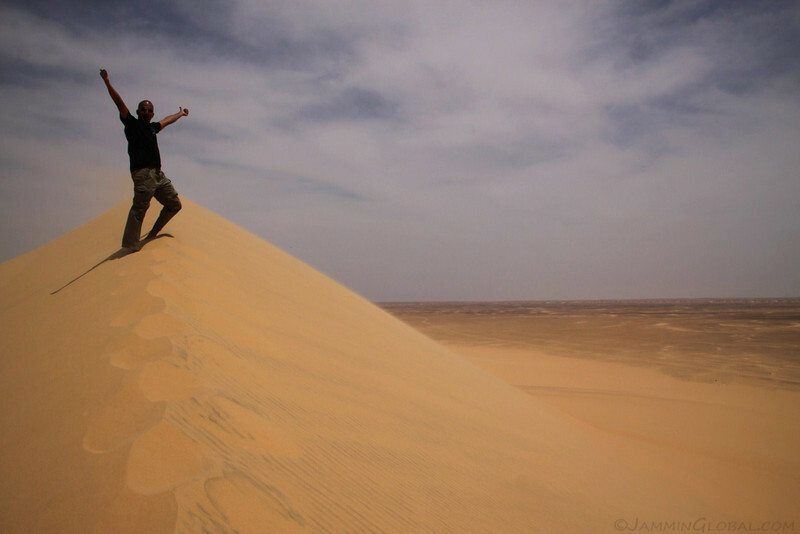 Thrilled to be out in the dunes of the Sahara. Coming down from the dunes. Every once in a while, one of the drivers would get stuck and then the others would come to the rescue. Everyone had sand ladders and tow ropes. A slight yank with the tow rope was all it took to free the stricken vehicle. 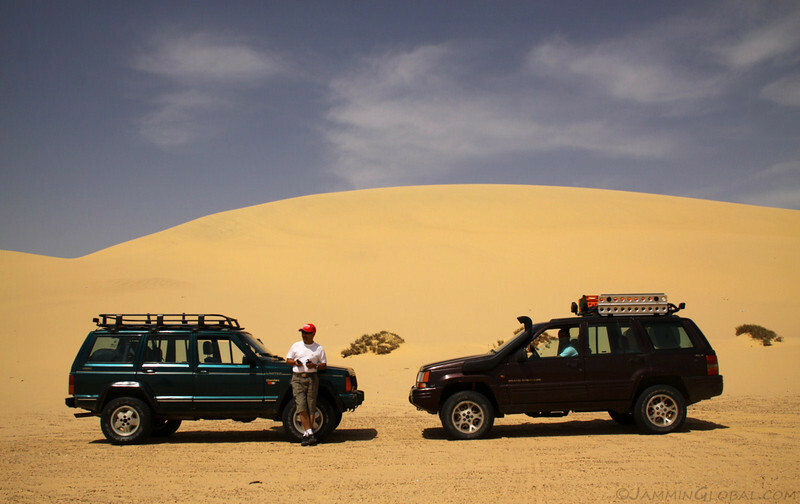 I was skeptical of that Daihatsu at first but then became impressed as she tackled all the same dunes as the other regular 4x4s. It didn’t have as much ground clearance, but its 4×4 was effective enough. Also, most of the vehicles, including Bisso’s, were automatics. We got there as early in the day as possible to avoid the intense heat of the afternoon. 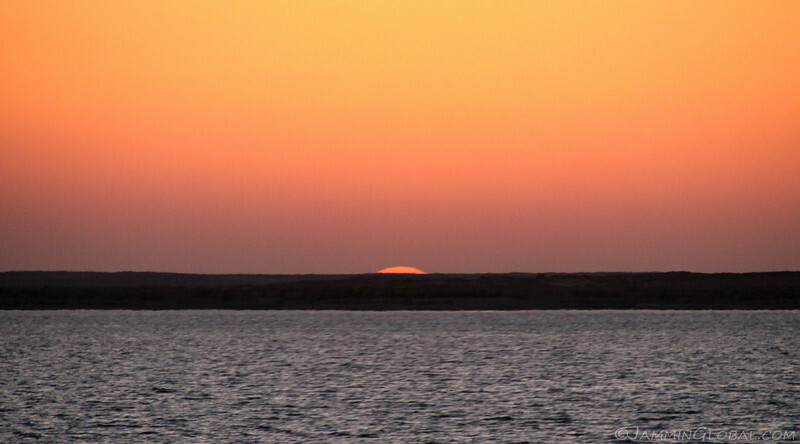 A mirage looking like a lake, which is just the heat haze from the desert tricking the eyes. Nothin’ but sand and sky. The colors look a little strange as I was trying out a Neutral Density filter on my Canon 50D. Towards the end of the course, as the drivers started getting a bit tired, more of them were getting stuck. 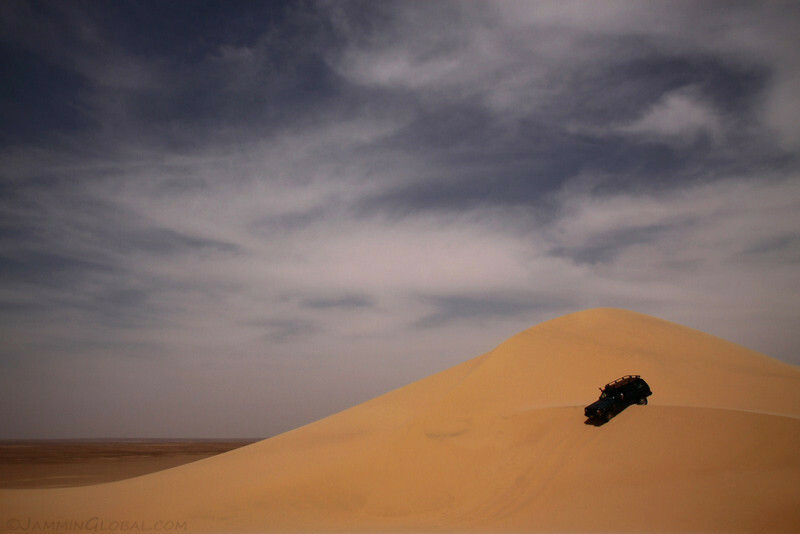 Here, Bisso gets a yank from Sharif over the crest of this dune. 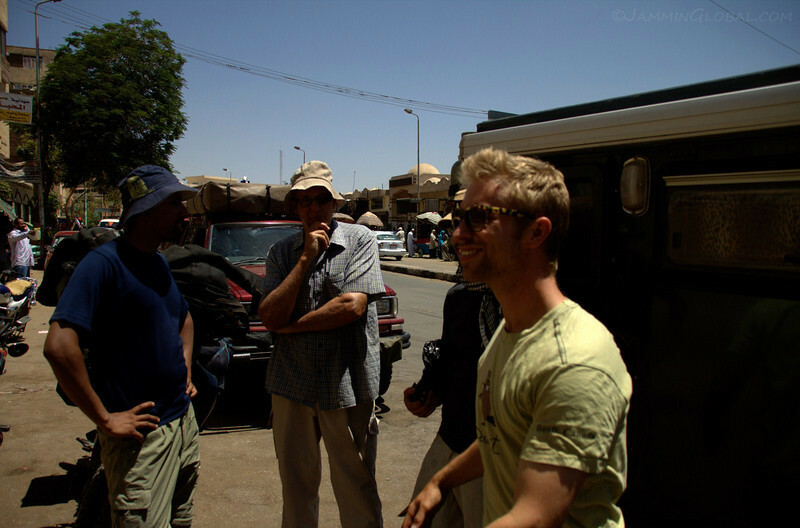 Our fun in the desert got over by about 1pm and we headed back into Cairo. Passing apartment blocks on the edge of the city. 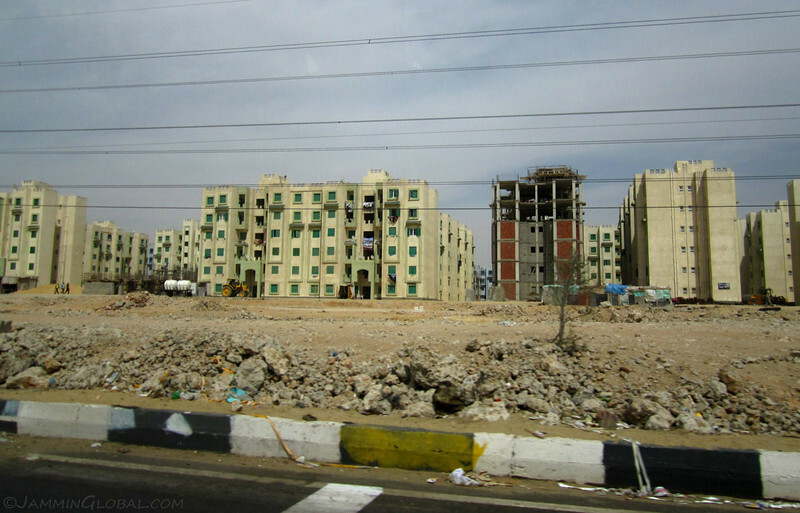 There was intense construction underway spurred by Egypt’s high growth in the last few years. More housing is also needed due to the increase in rural to urban migration, especially as the productivity of the Nile delta drops. However, unemployment is still very high, which was definitely a factor in the revolution and the growth of people power. A long line for diesel at a filling station. 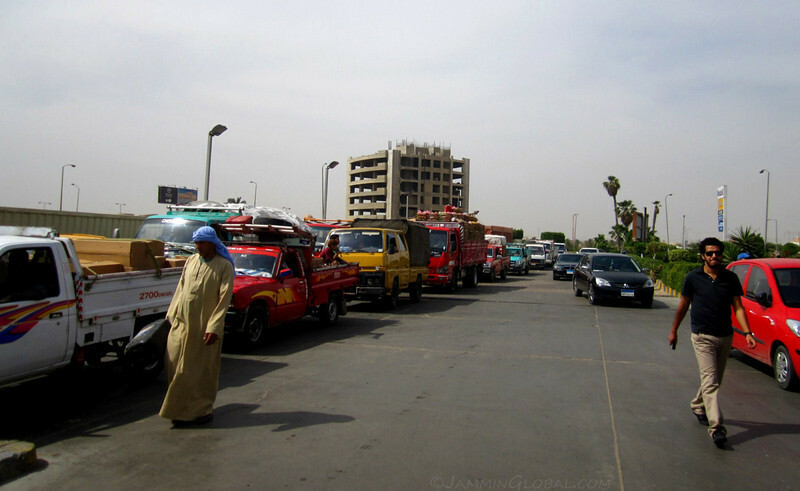 I was a bit worried as I was planning to leave Cairo and head out across the desert in the next few days and was trying to figure out if there was a fuel shortage or not. 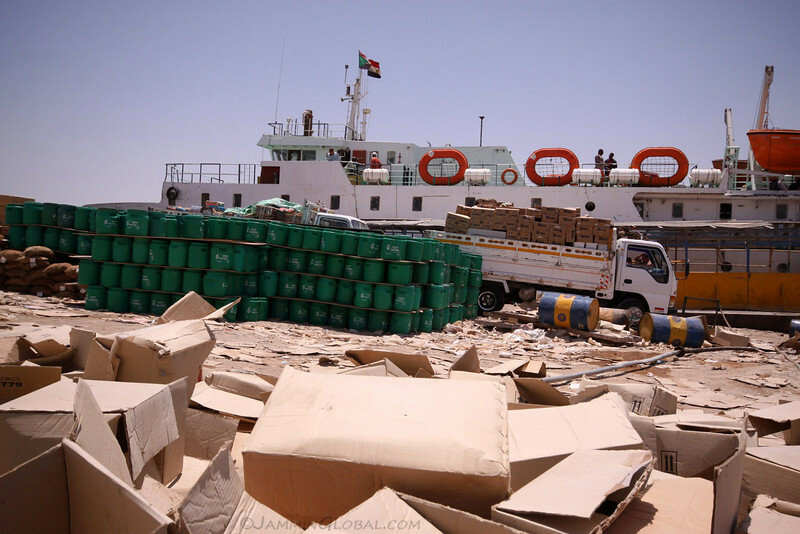 Rumors were abound that the transitional military council was artificially limiting fuel supplies to put pressure on the people, maybe to get them to see that things were better before the revolution. 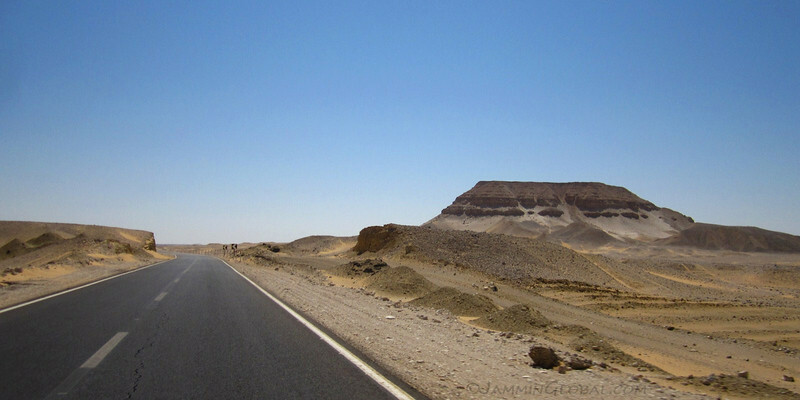 Driving through Giza and oh yeah, something about some pyramids there… (coming up in the next installment). 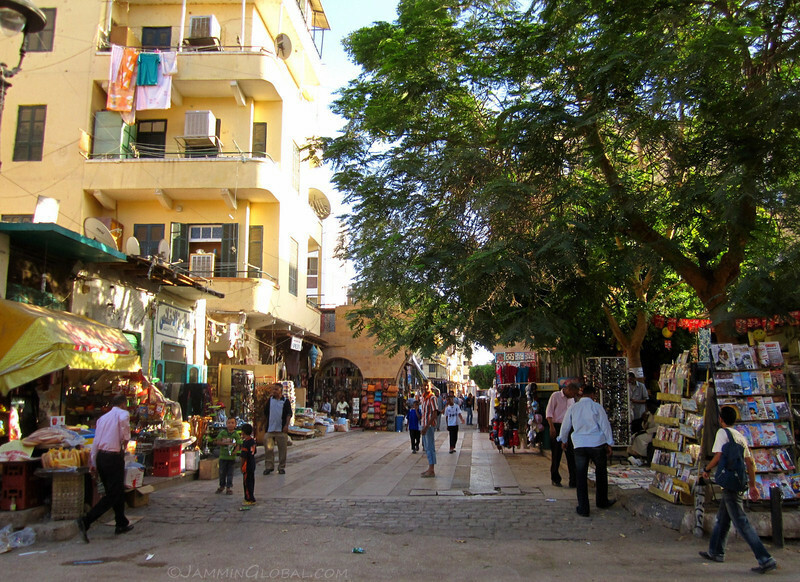 I spent the evening with Bisso and Ava and after a nap through the afternoon heat, we walked around Bisso’s neighborhood in Heliopolis, an affluent suburb initially catering to wealthy residents in the early part of the 20th century. 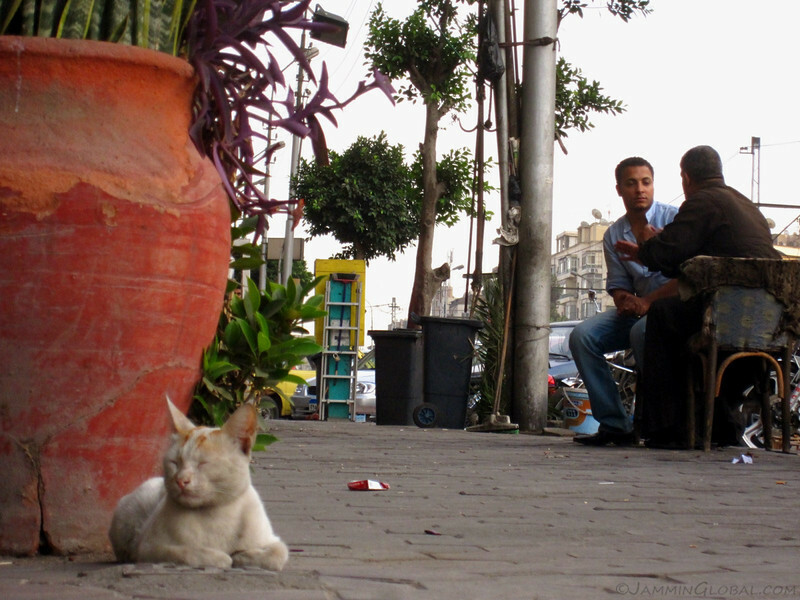 A Egyptian kitty catching some shut-eye on the street while men talk at an outdoor cafe. 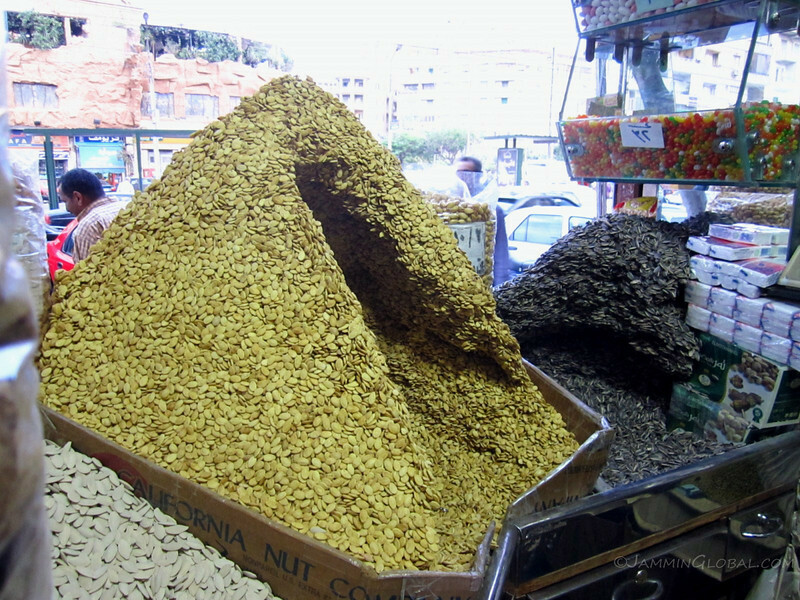 A dried snacks shop in Heliopolis. This is a mountain of seeds, not sure what kind with sunflower seeds behind it. 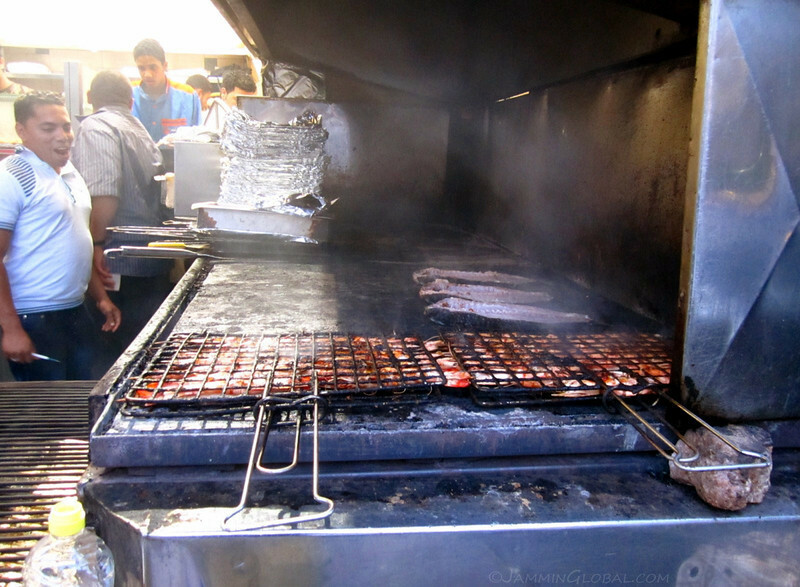 Fresh fish and shrimps being grilled such that their tempting smells brought in passersby from the street. 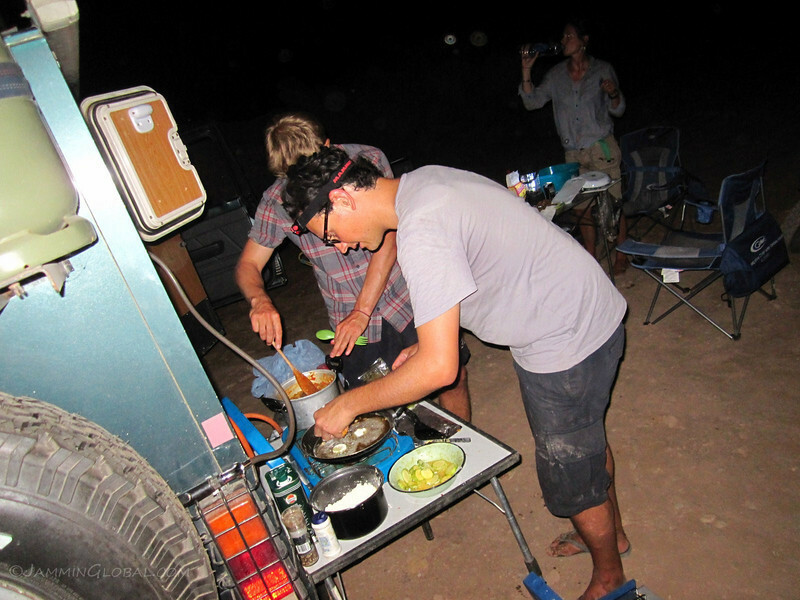 In the evening, I was requested to prepare my chicken curry as Ava missed it the last time we met and it was a nice way to say thanks to Bisso for the fun day bashing dunes. 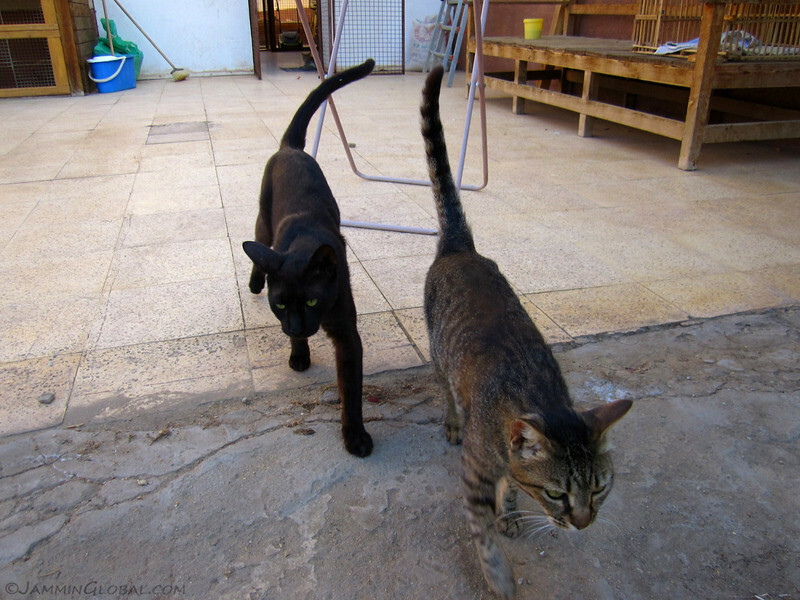 Also there were Bisso’s friend, Ihab and his friend, Joana. 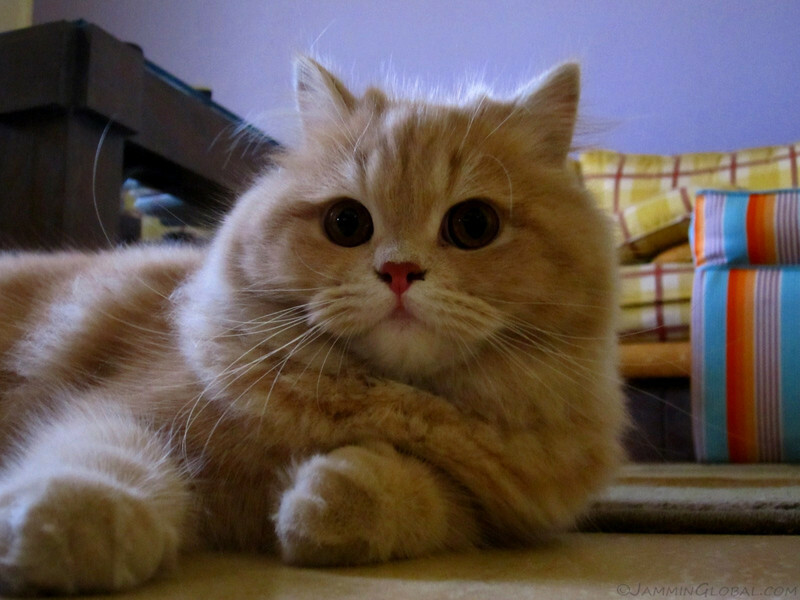 Bisso’s cat, Lili, who fit the description of ‘fur ball’ perfectly. 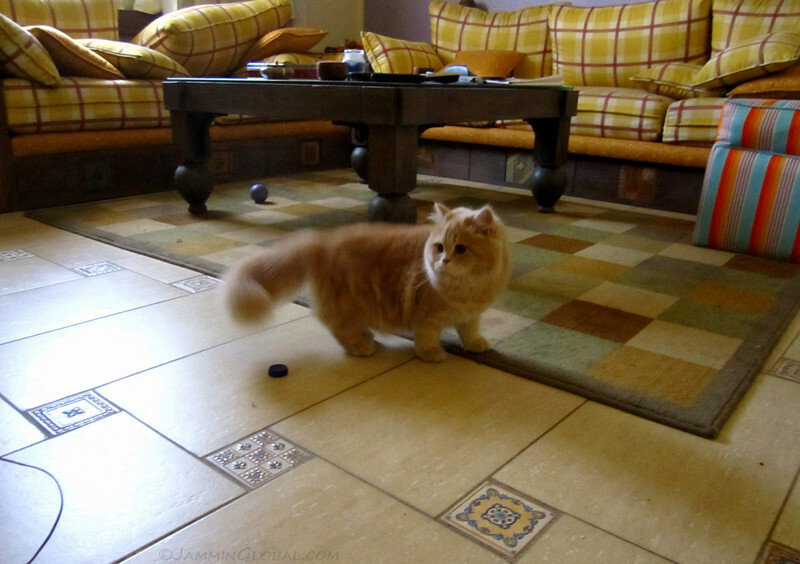 Compared to the street cats I had seen so far in Egypt, Lili was a pampered princess. 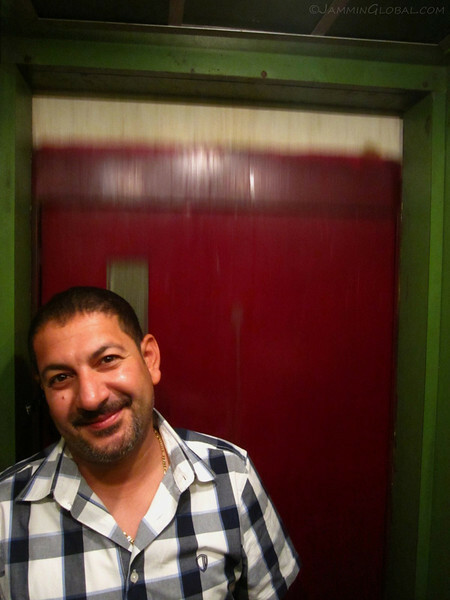 The kind and warm Bisso in the elevator of his apartment building. Note that there’s no door on the elevator carriage, so don’t lean on that side. I enjoyed the fun day out in the desert with Bisso and Ava and was happy to meet this wandering soul again. She’s on a similar kind of trip as mine, wherein she sold everything and is roaming the planet in search of the next phase of her life. I hope to meet her again, probably in India. 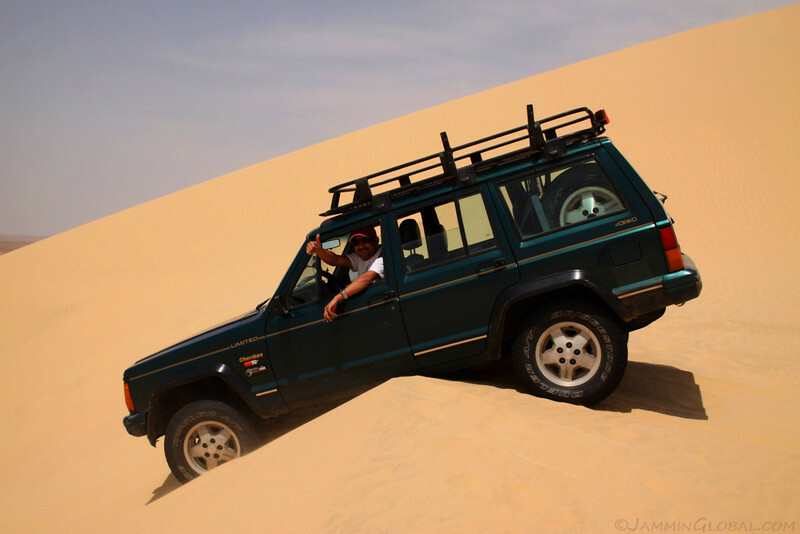 Having only read about dune bashing before, I was thrilled to finally take part in it and play in the desert. Being a driving enthusiast, I was impressed with the technique needed to power up, throttle down, crest and then power down the dunes. Good luck to Bisso in his future rallies.